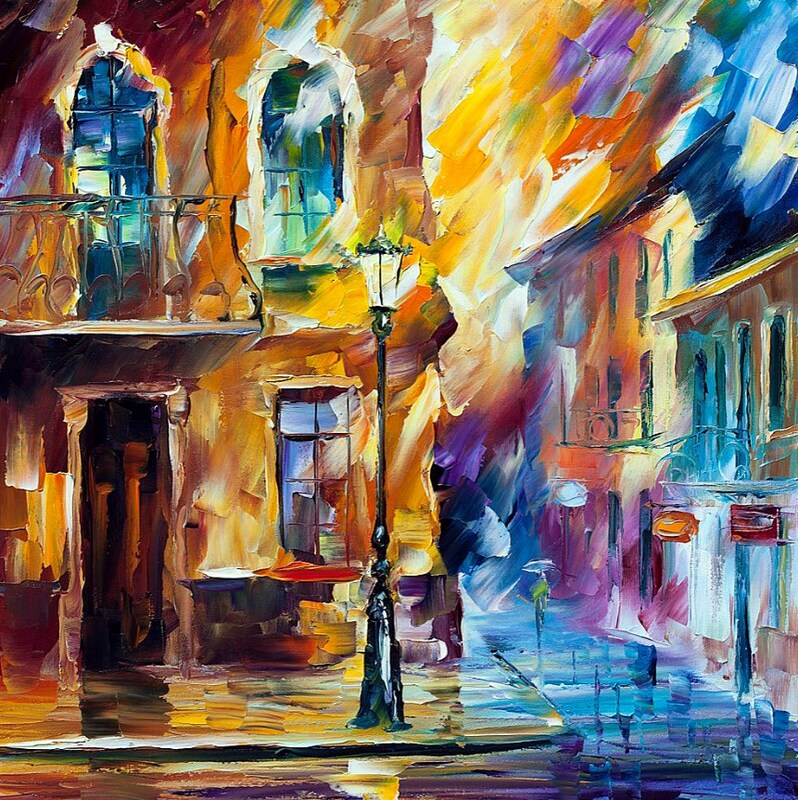 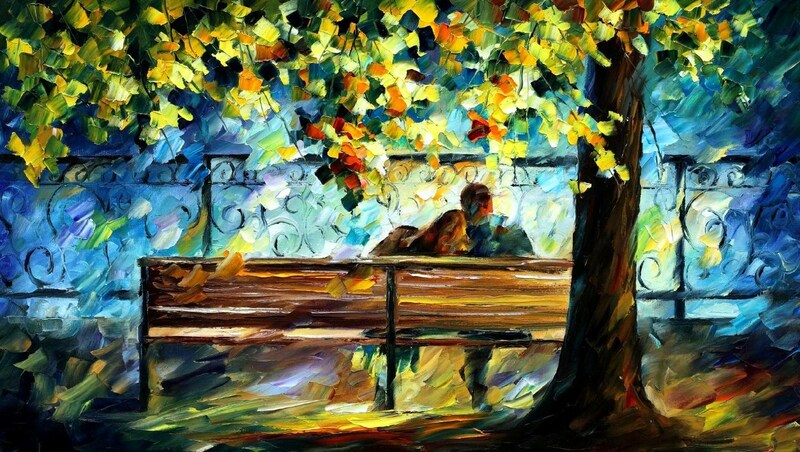 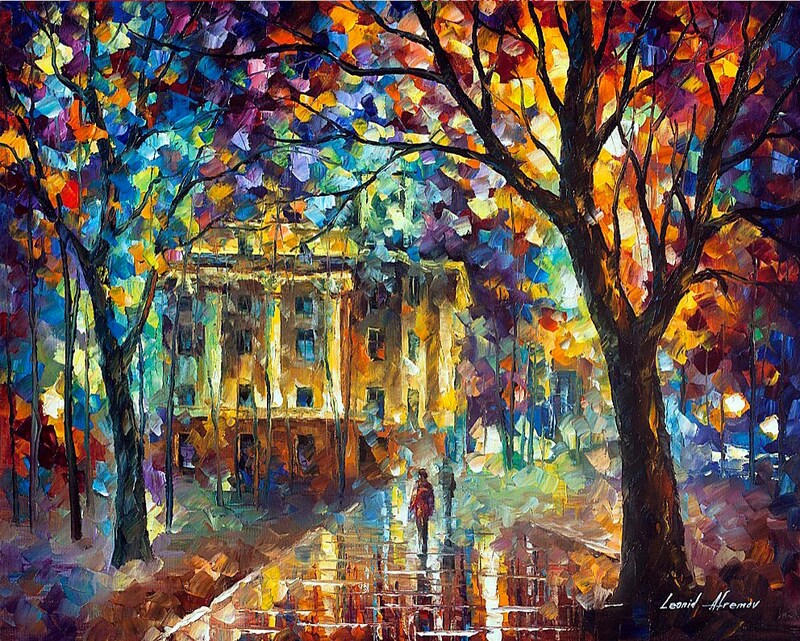 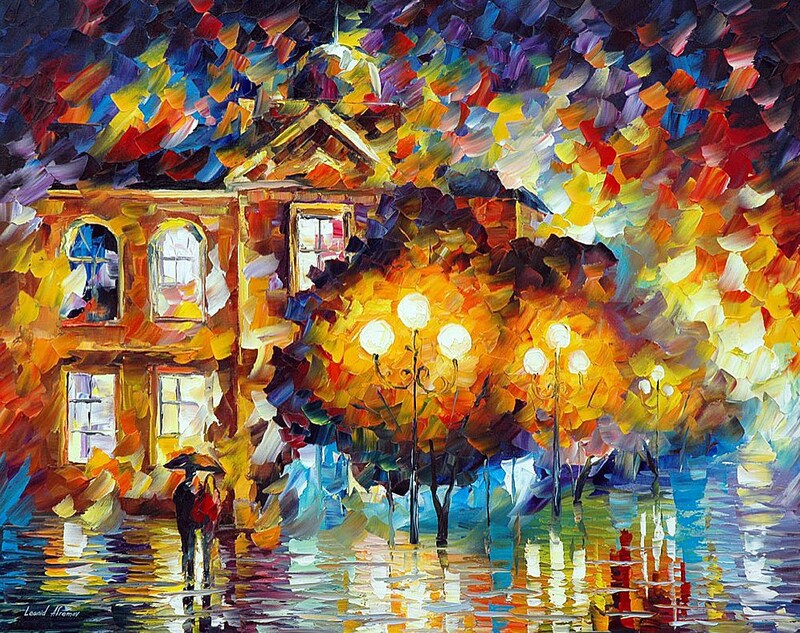 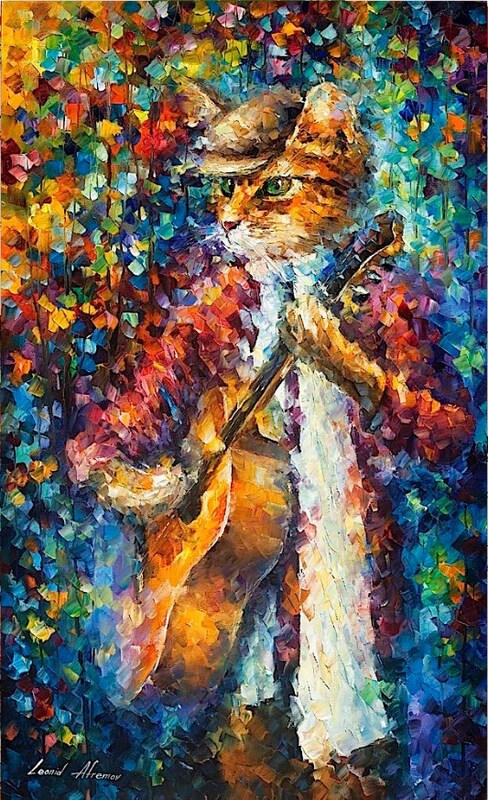 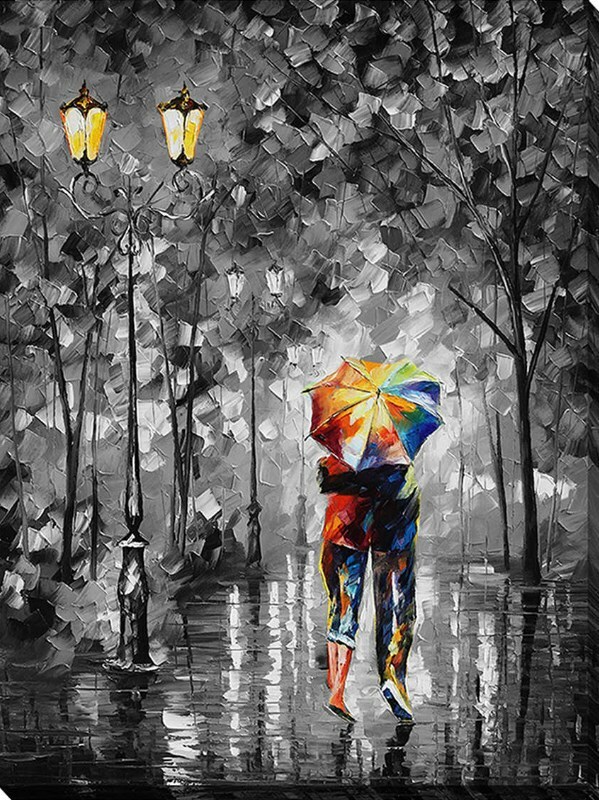 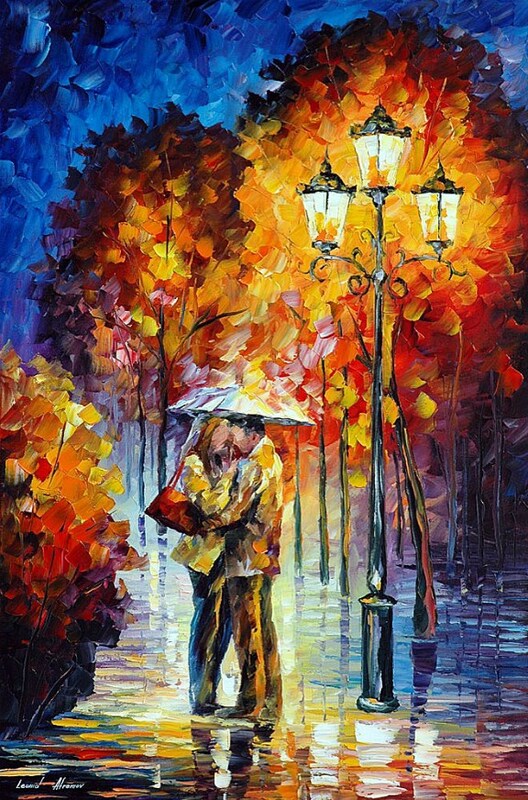 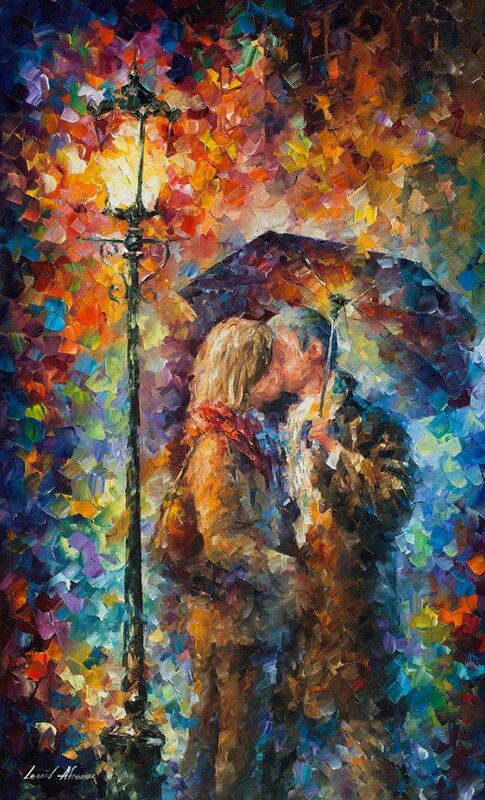 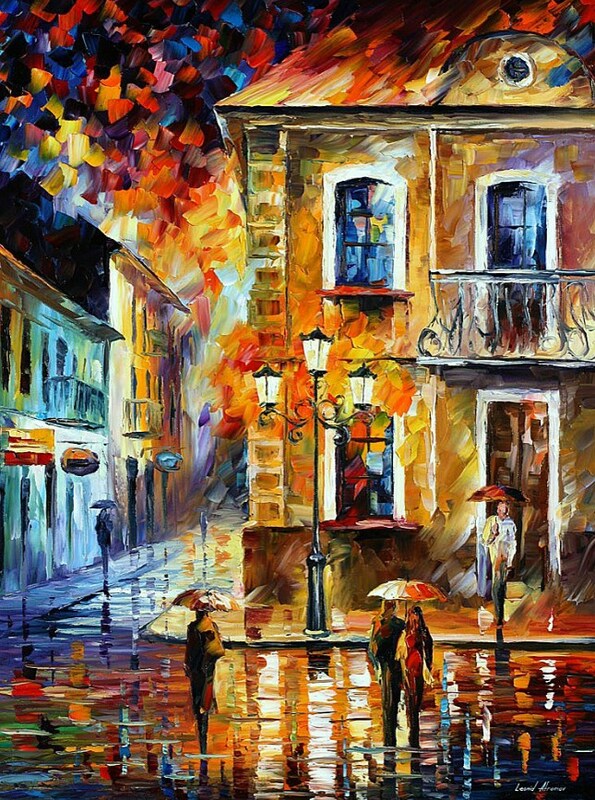 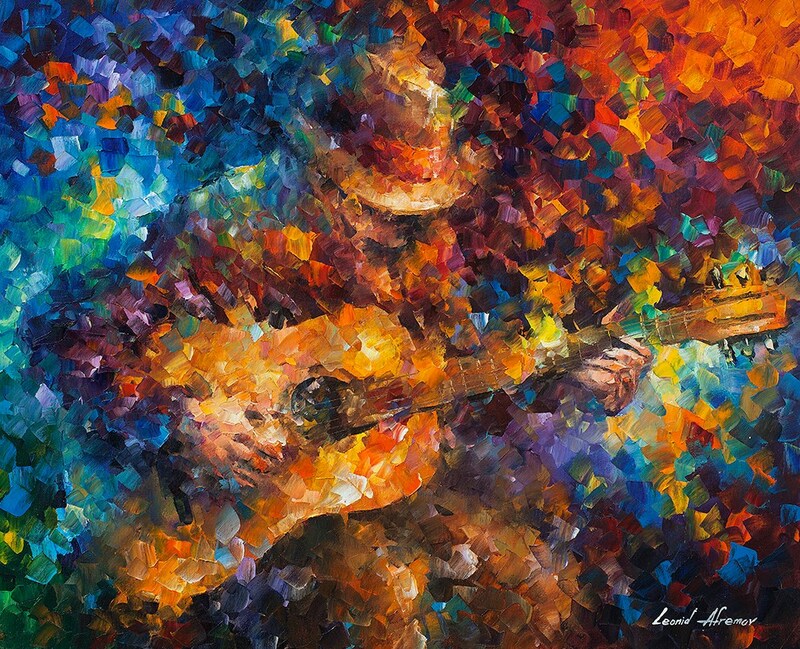 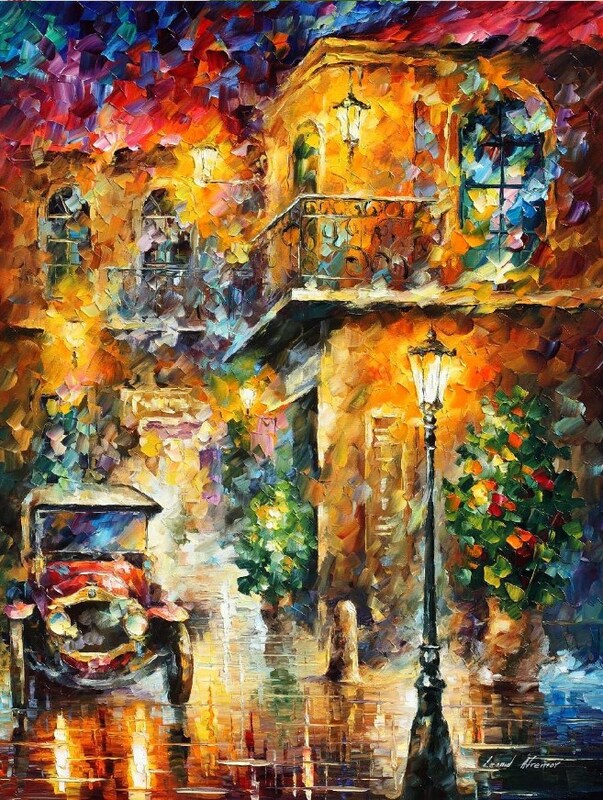 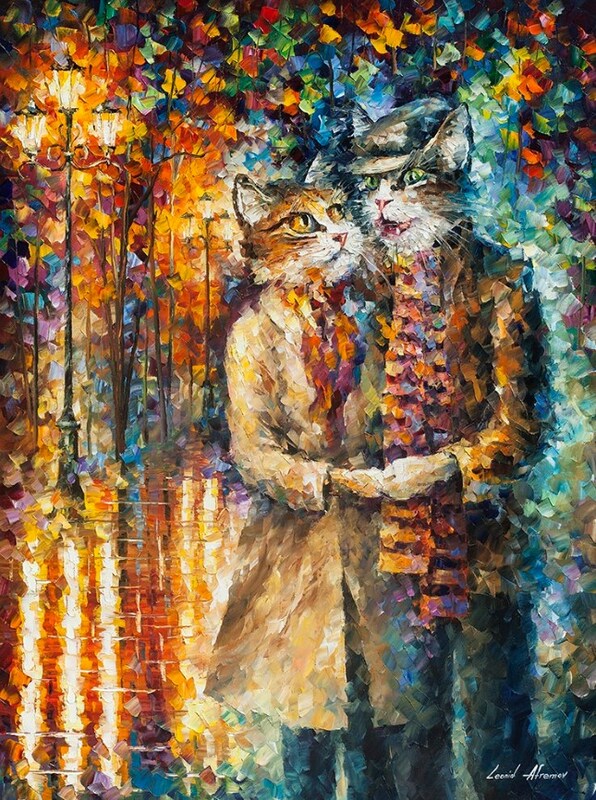 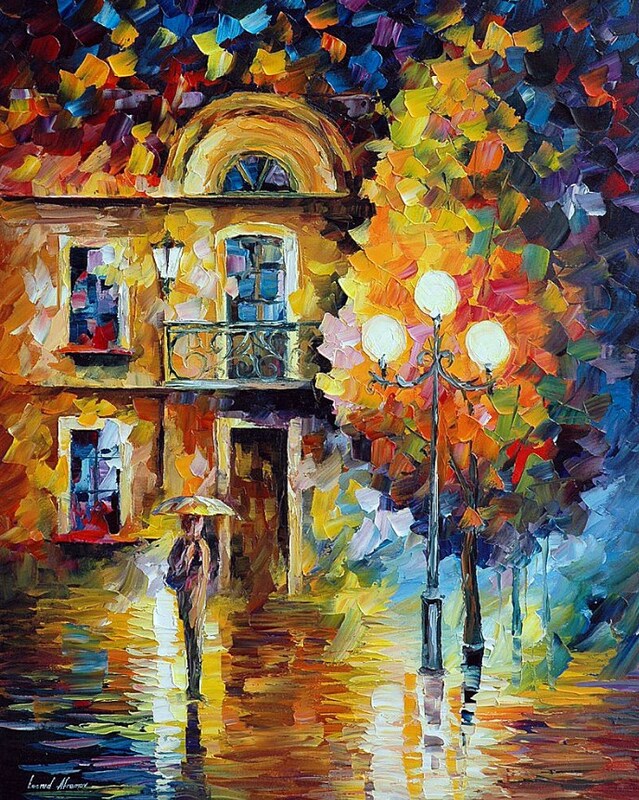 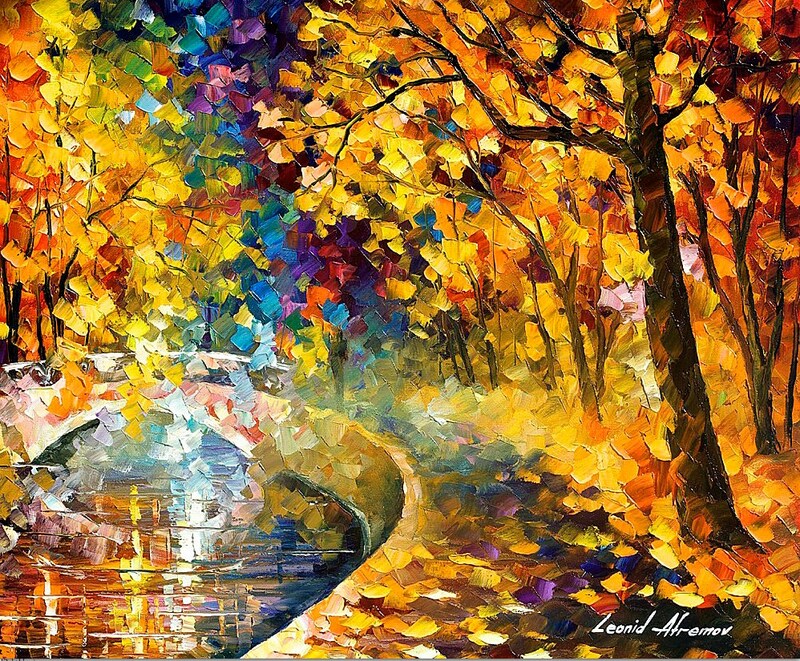 Leonid Afremov was born on 12 July 1955 in Vitebsk, Belarus, then former USSR, from Jewish parents Bella Afremova and Arkadiy Afremov. 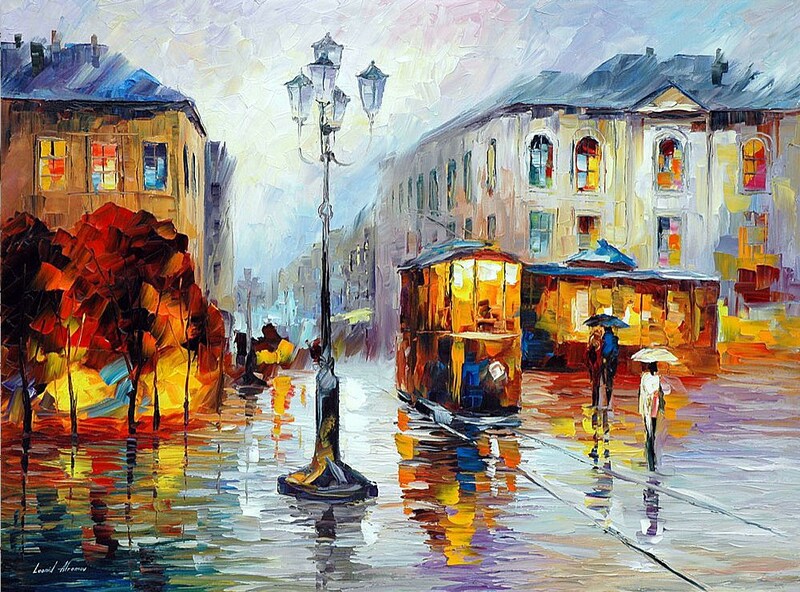 His father was a shoe designer and shoemaker. 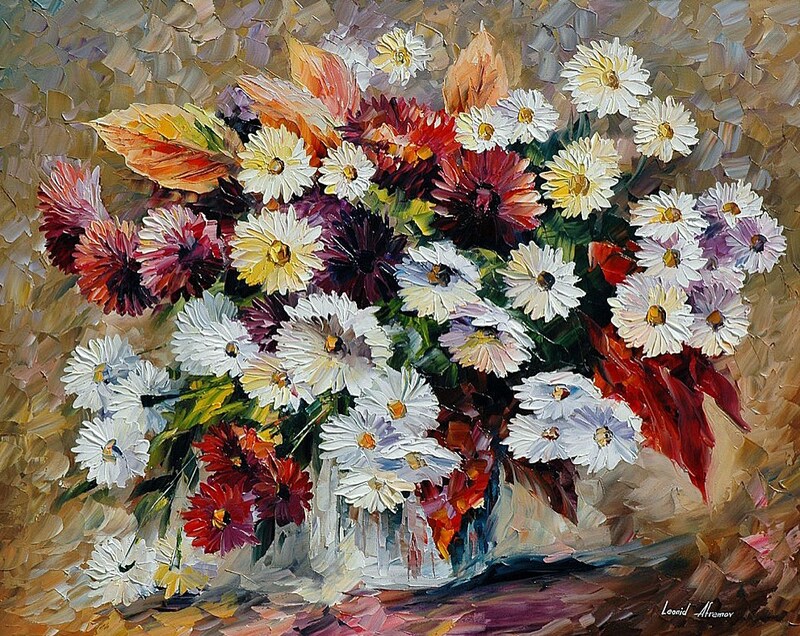 His mother worked in a metal factory in Vitebsk. 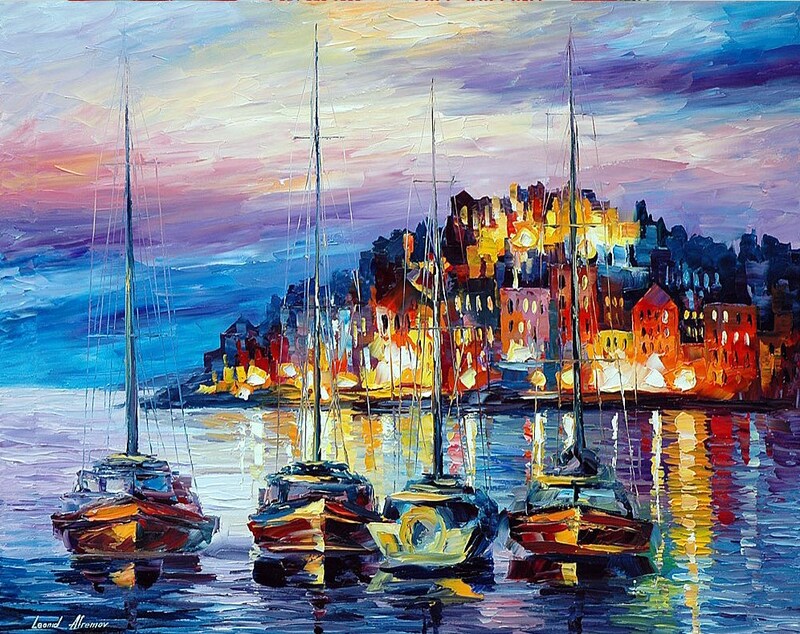 He was born in the same town as Marc Chagall, who later became a significant role model to Afremov. In 1986 the Chernobyl disaster happened. 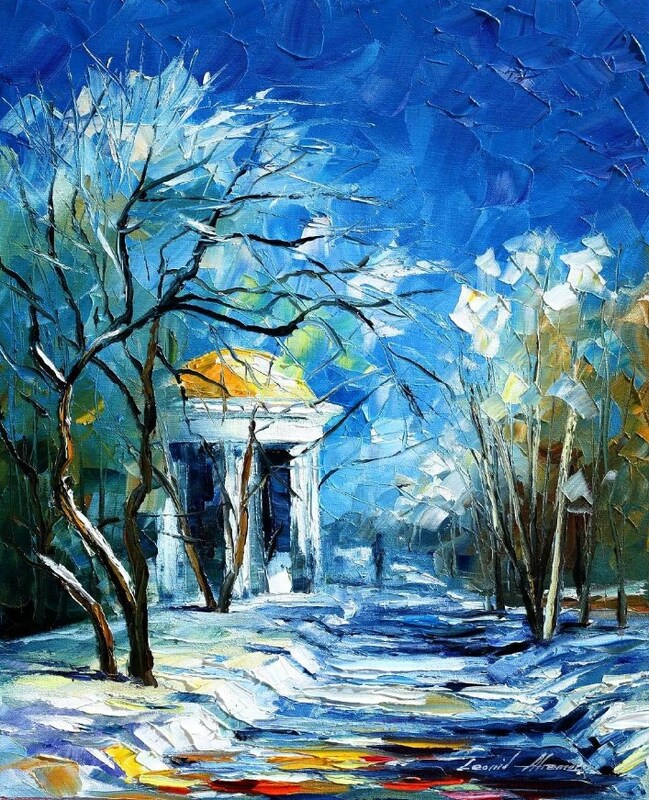 Vitebsk was only a few hundred kilometers from Chernobyl, close enough for radiation to travel with the wind and rain. 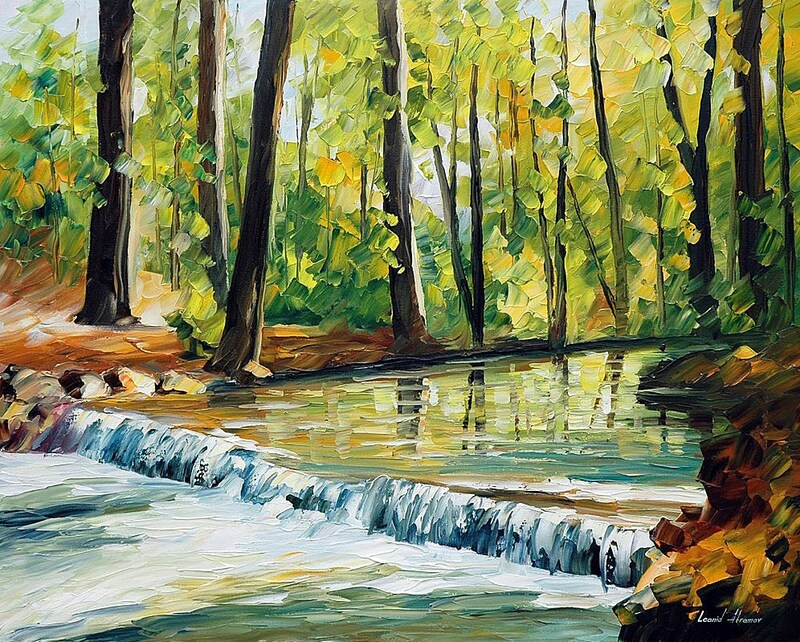 The ecological situation in the area worsened, local crops and water becoming contaminated with radioactive fallout. 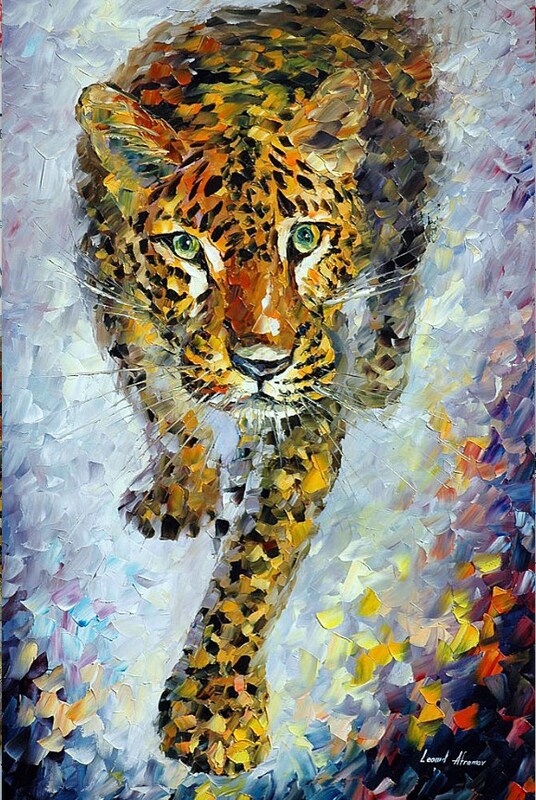 Small children were affected strongly, including Afremov’s two year old son. 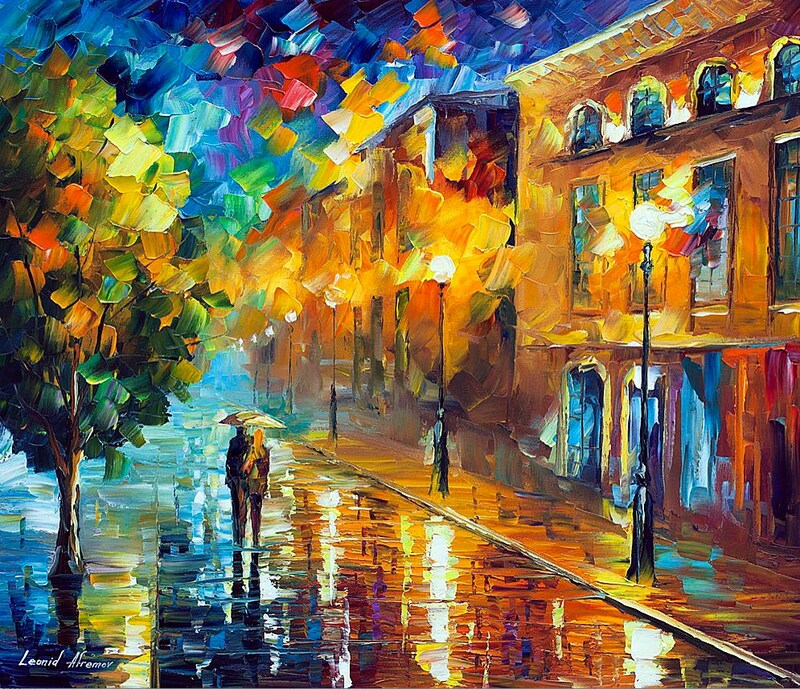 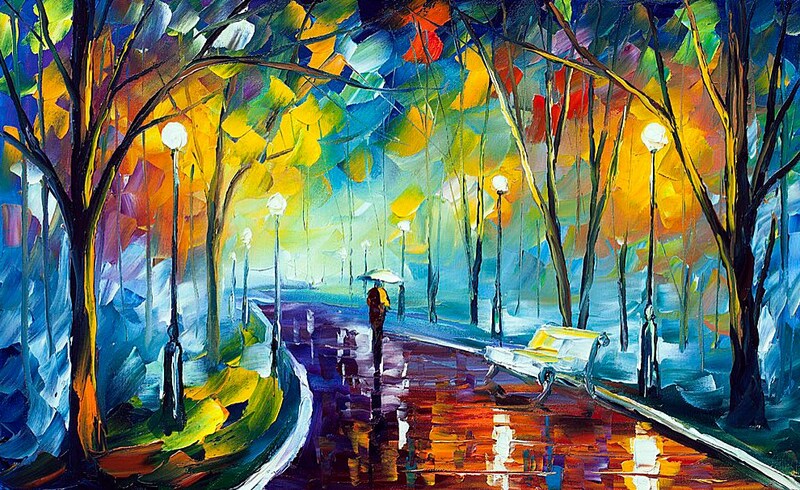 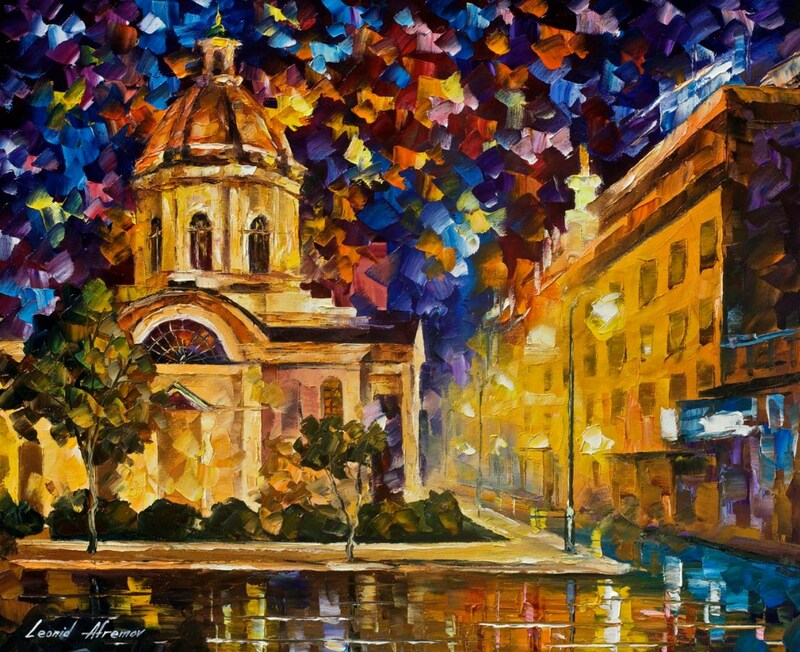 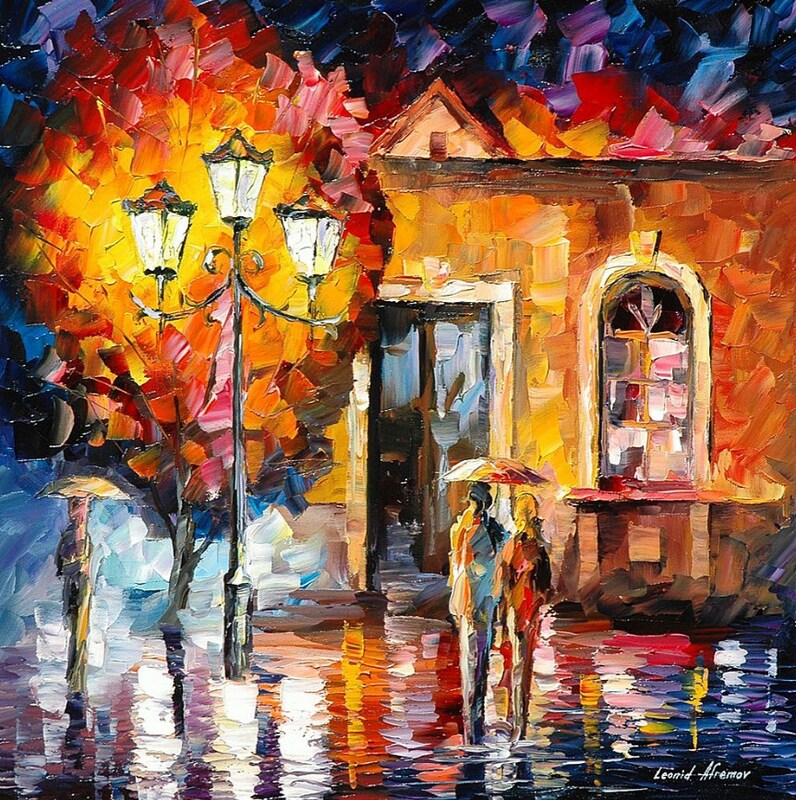 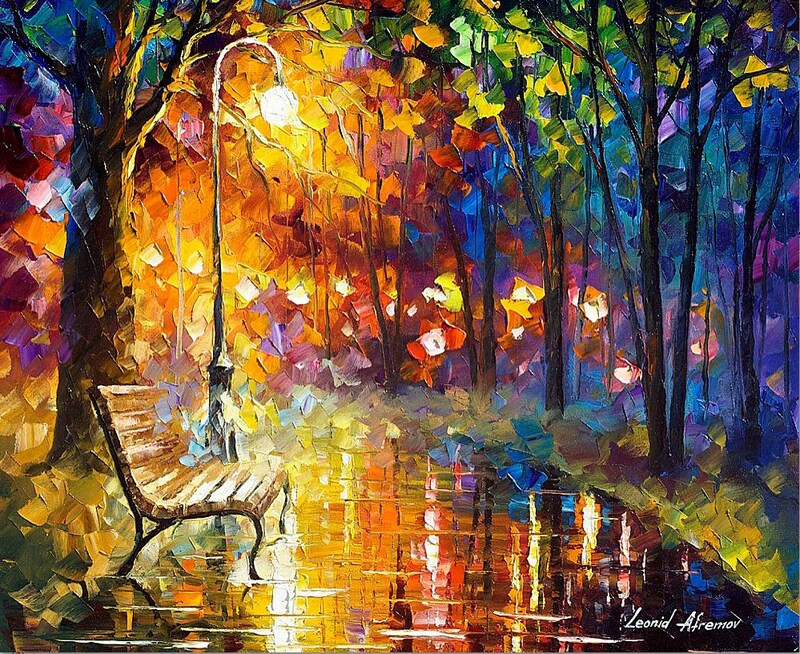 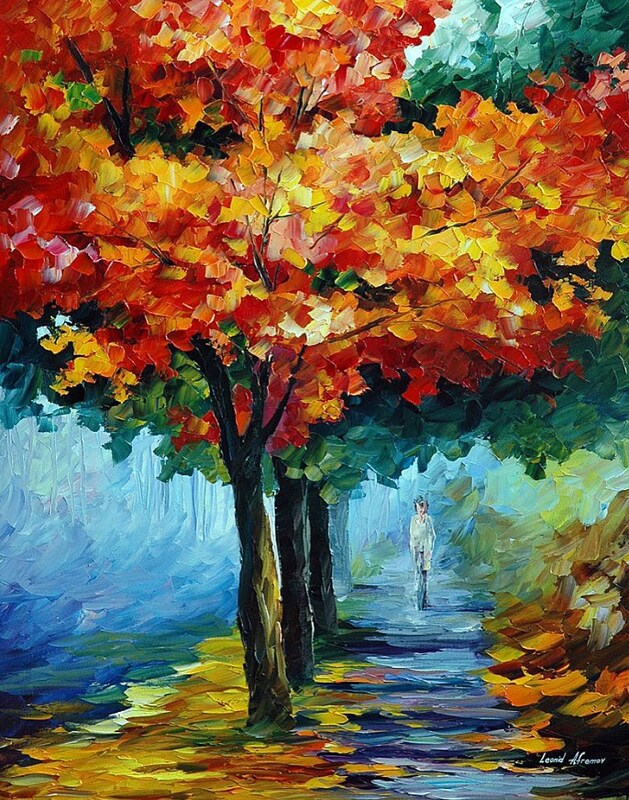 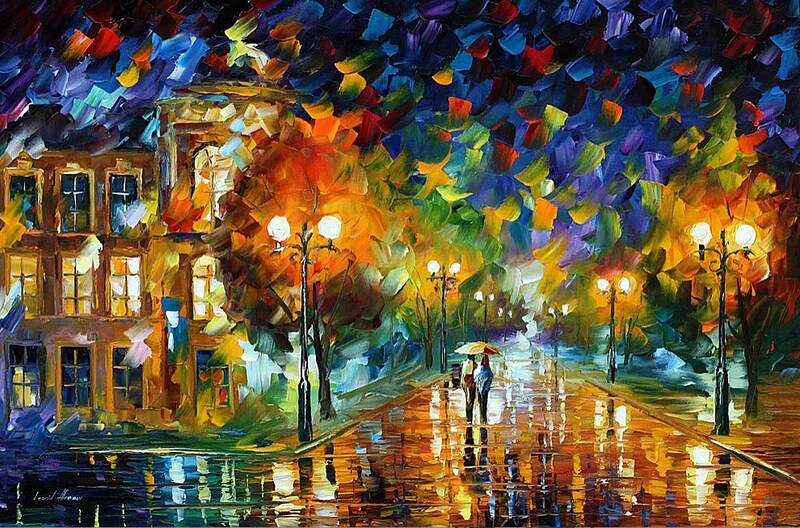 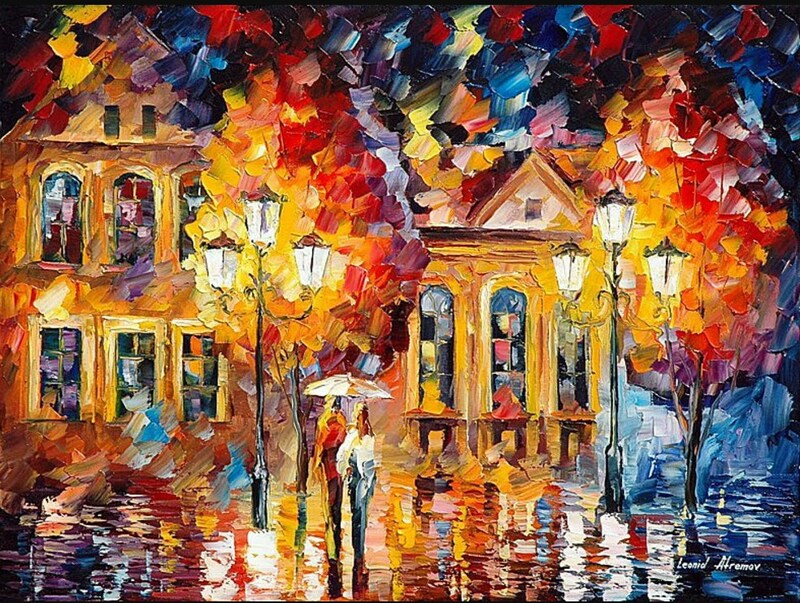 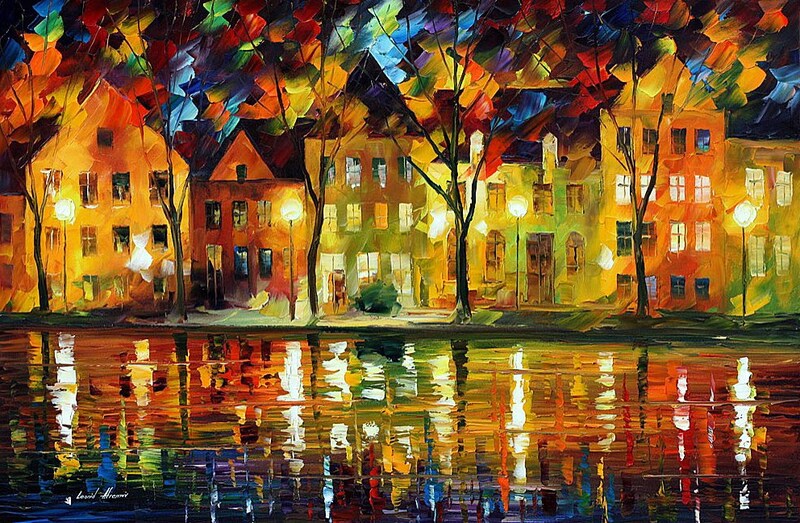 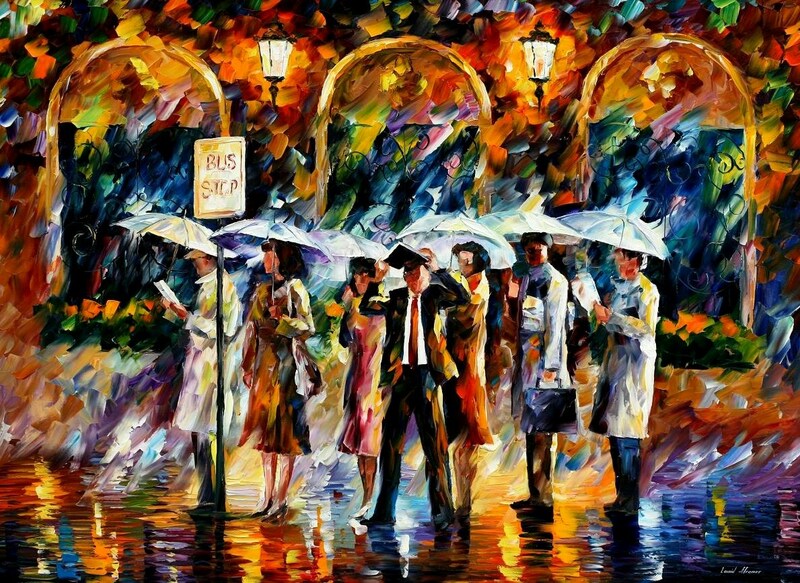 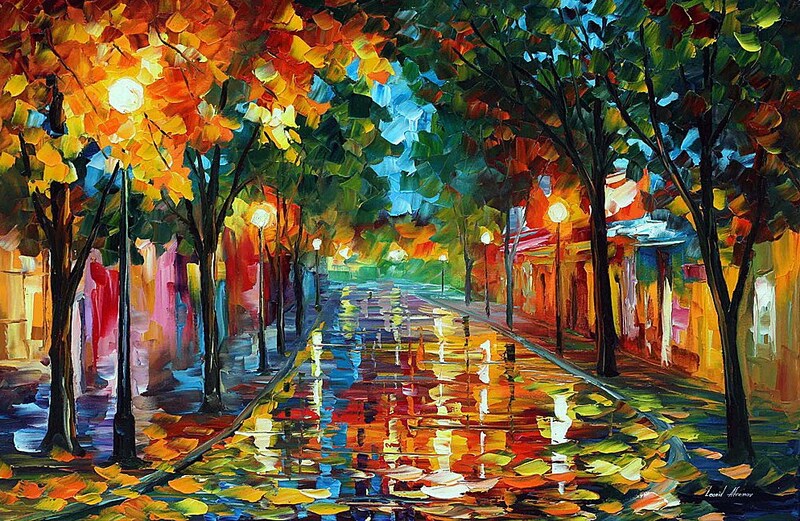 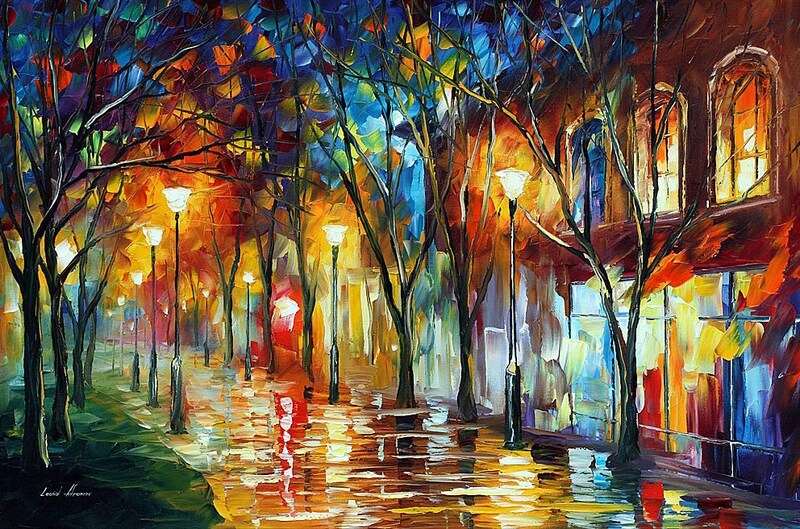 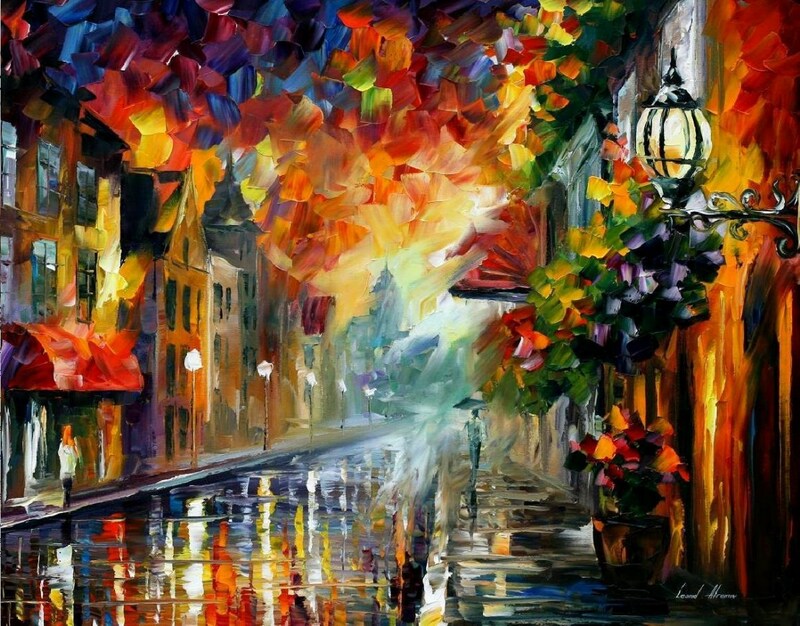 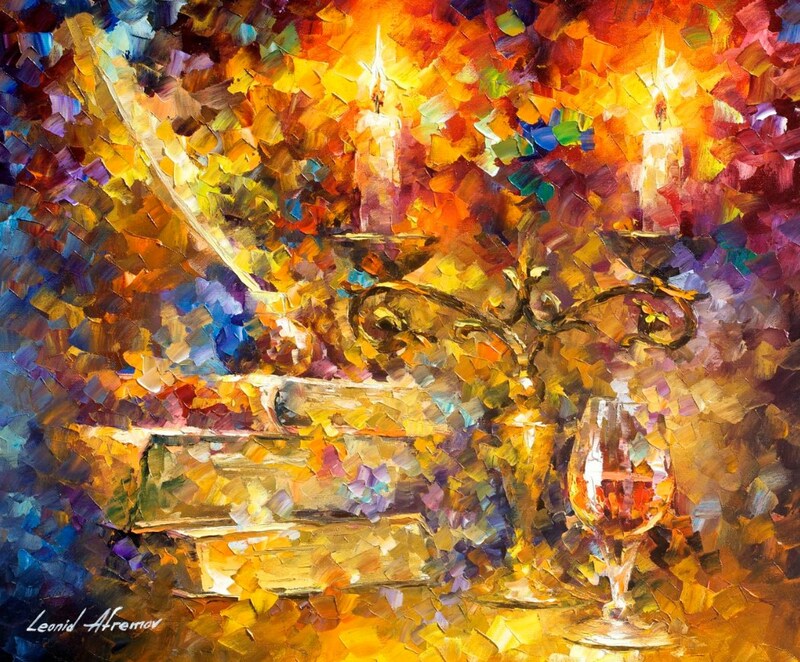 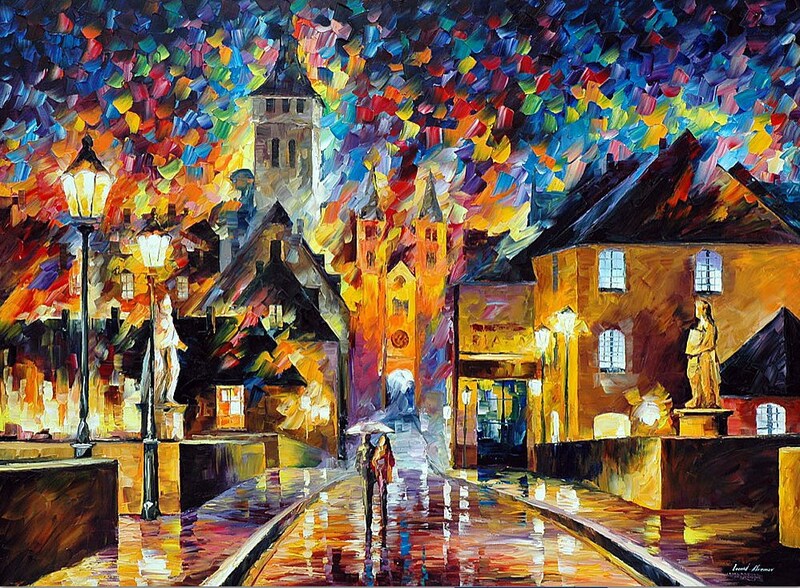 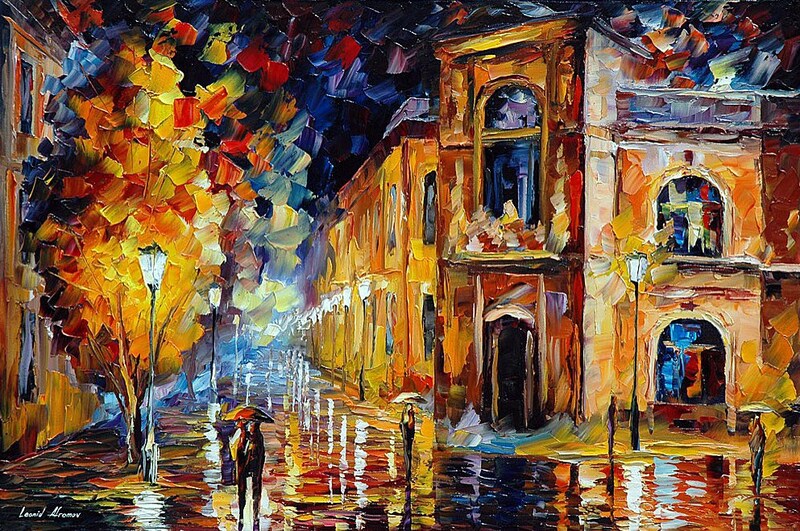 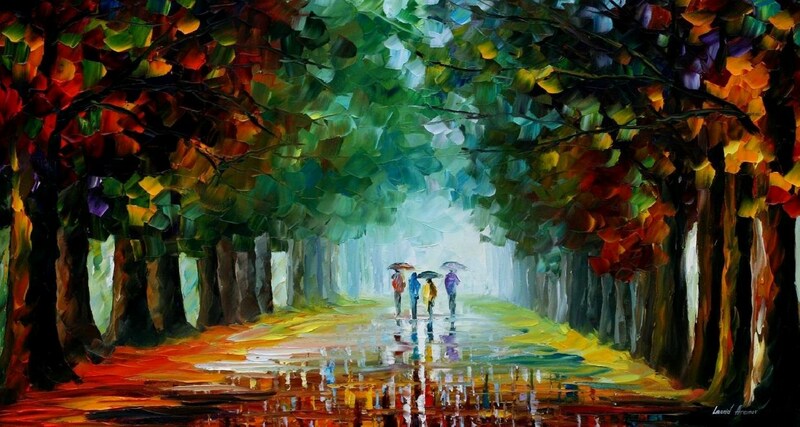 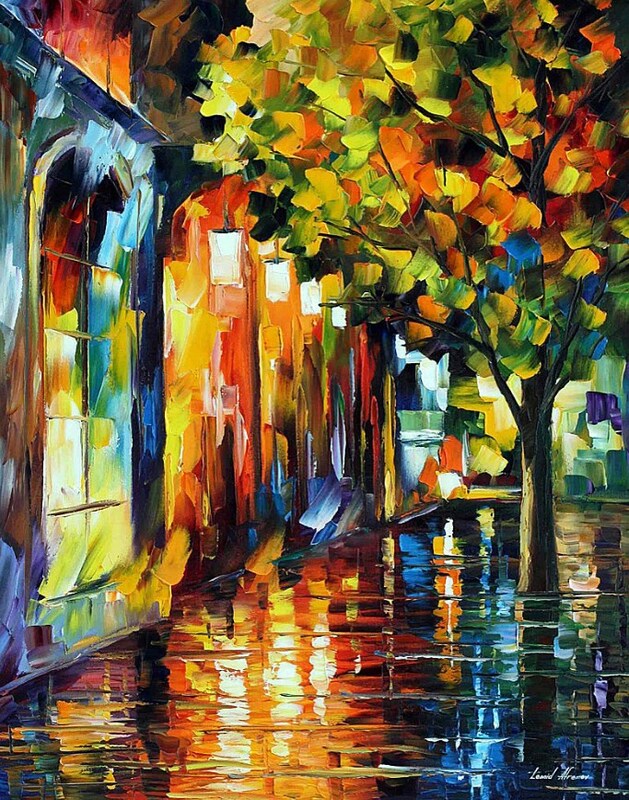 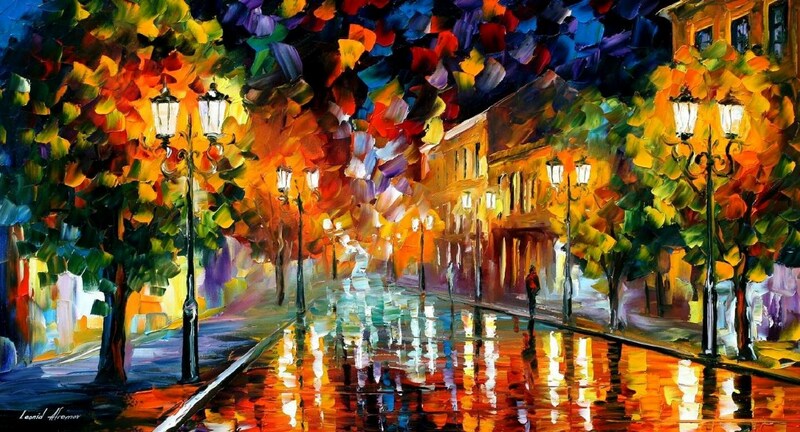 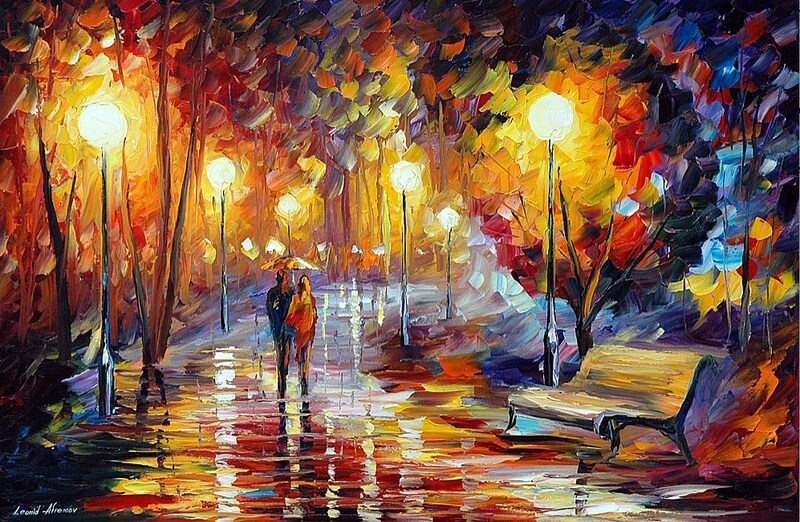 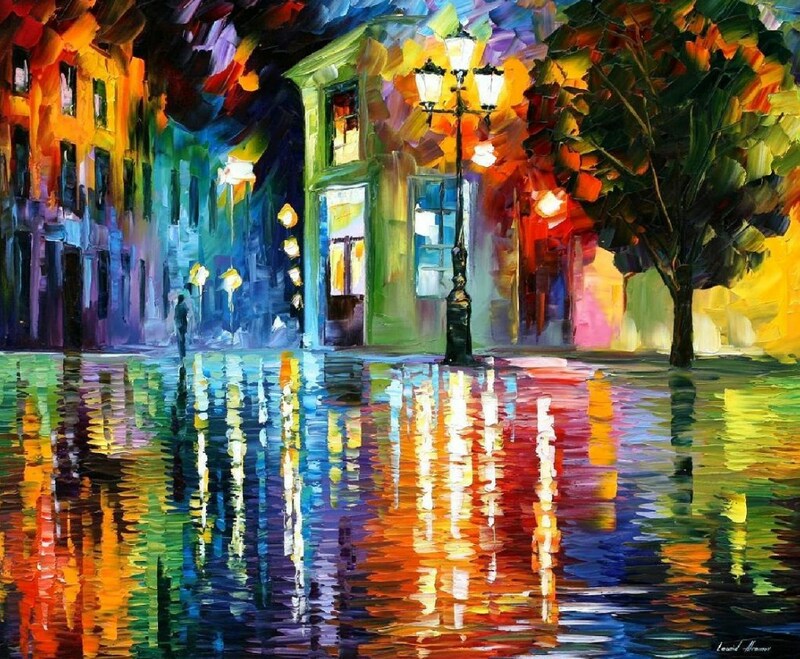 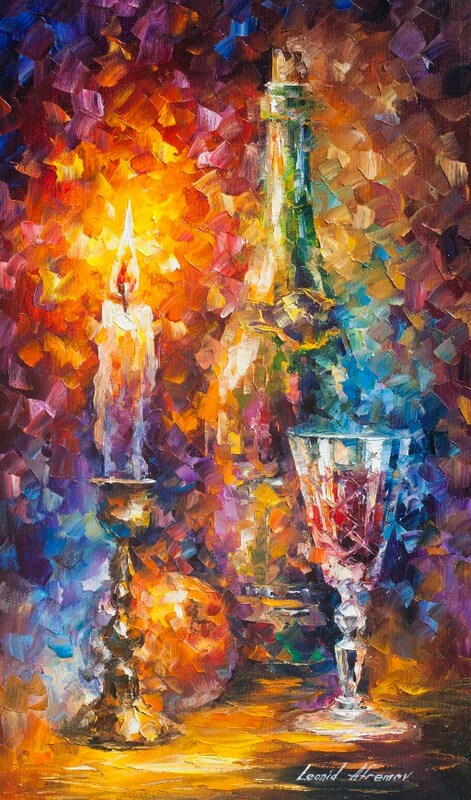 At the same time Leonid Afremov was experiencing serious discrimination and insults for his Jewish heritage. 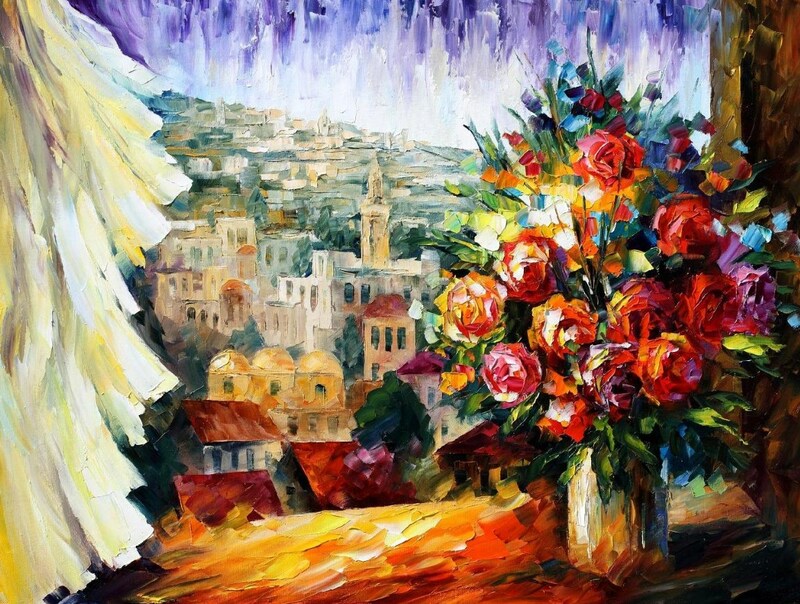 The liberal politics of Mikhail Gorbachev allowed Jewish soviet citizens to migrate to Israel in the late 1980s. 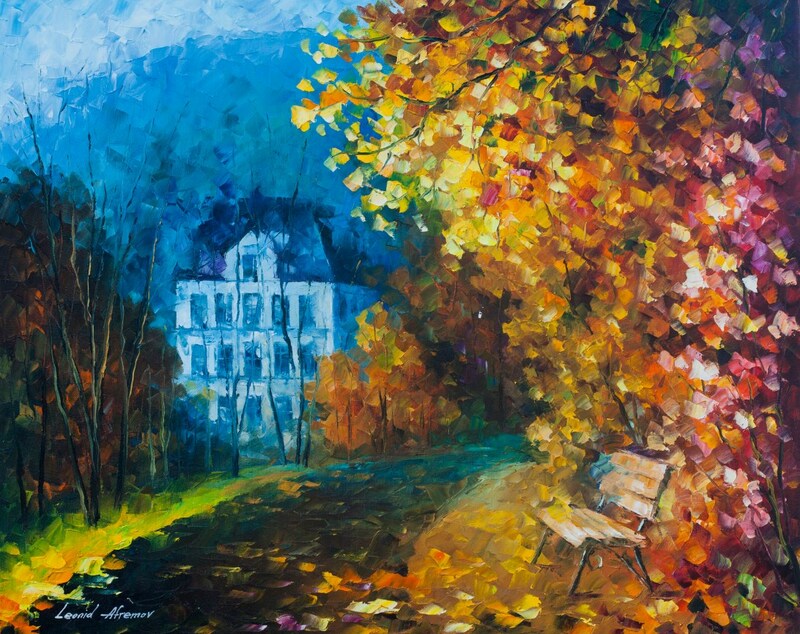 After being fed up with anti-semitism and problems caused by radiation, Leonid decided to move to Israel without hesitation as soon as the doors were opened. 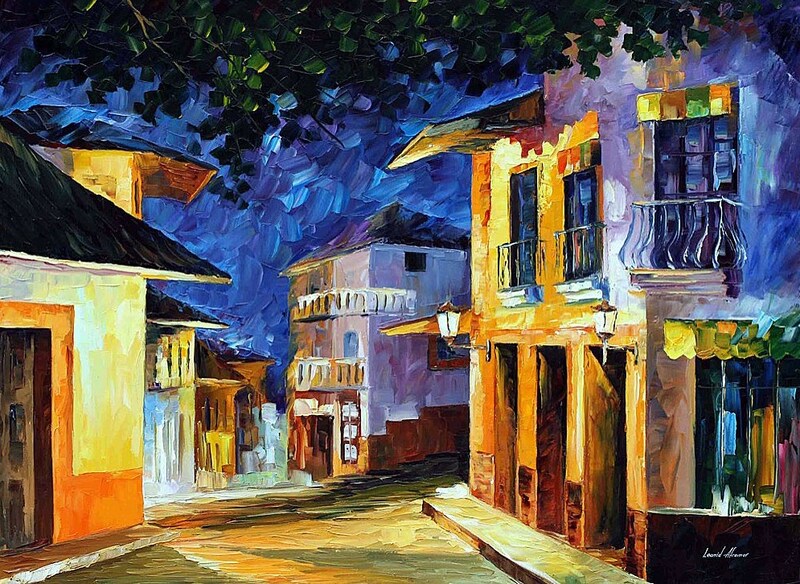 Because he was a recent Russian immigrant, the locals considered his work as having little value. 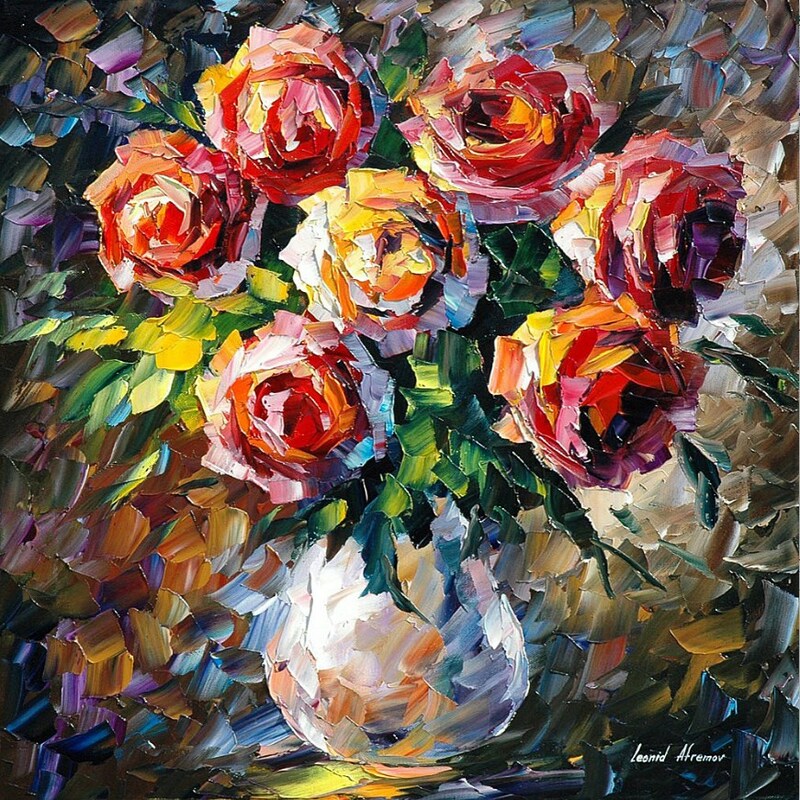 Galleries took paintings for 50 shekels (15USD) and were reselling them for 500 to 5000 shekels. 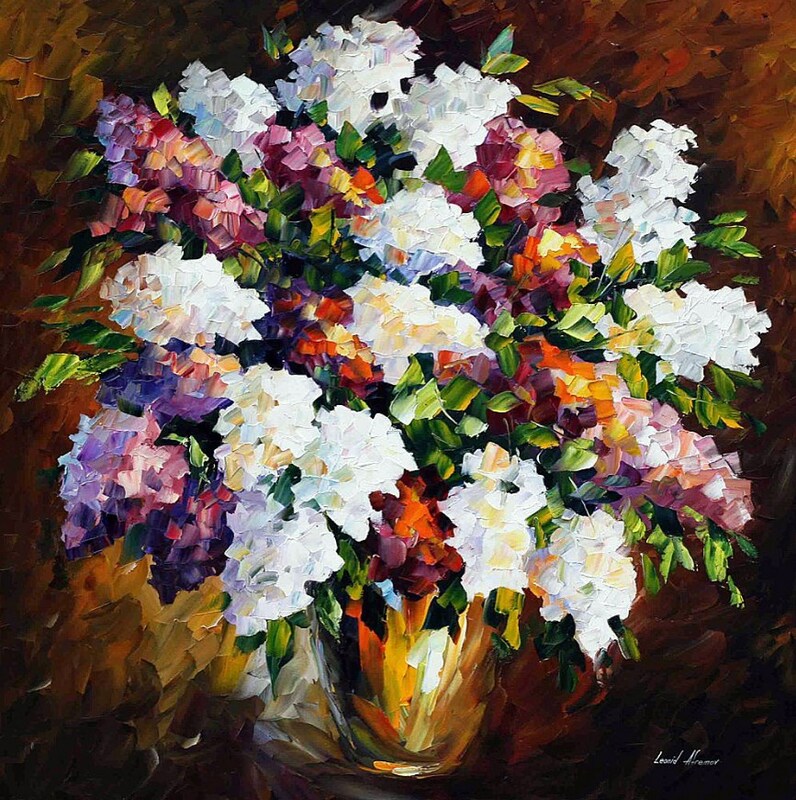 When Leonid confronted galleries about the extremely low prices, he always received the same answer: “you a Russian immigrant, you a new piece of junk, (sic) you have no choice.” The galleries refused to sell his work for percentage commissions just because he was a Russian immigrant. 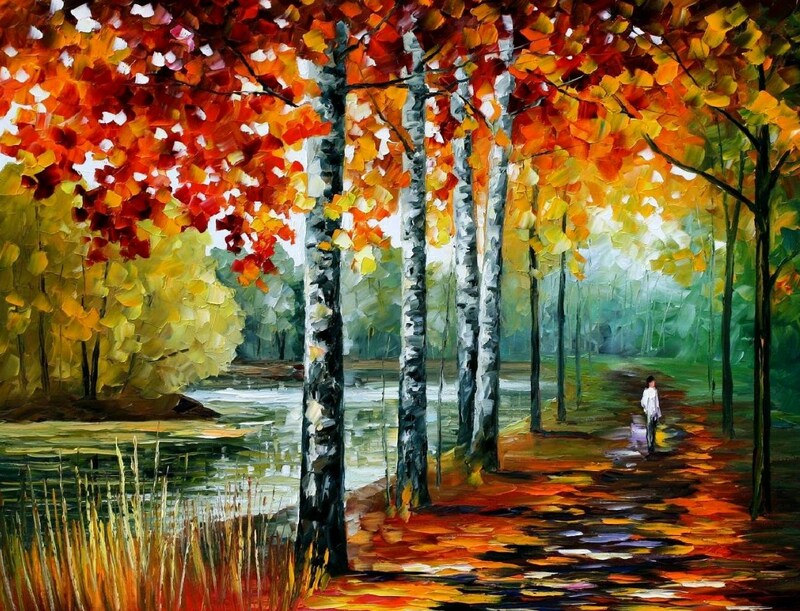 He was only given the option of a pittance for each painting which took a day to make. 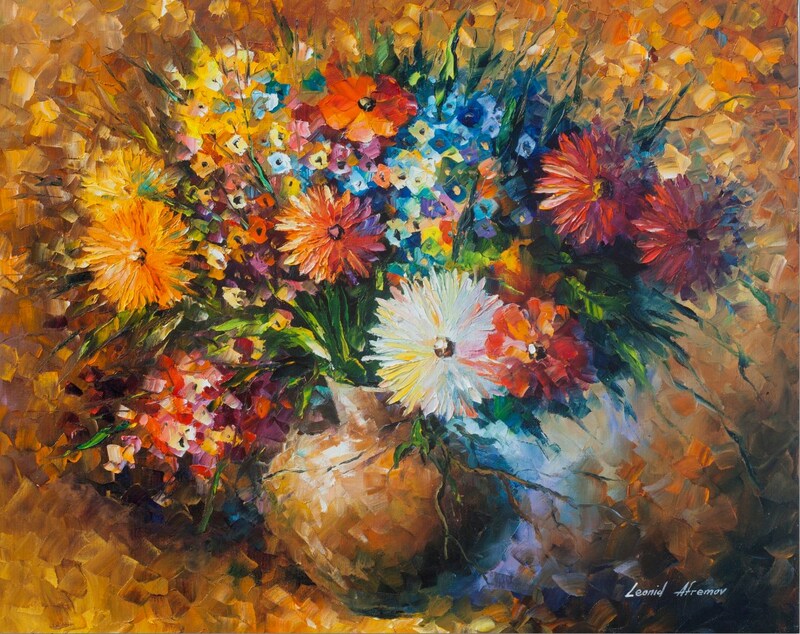 Afremov felt like he was exploited and discriminated by the galleries and the Israeli society just like he was by the Soviet Government. 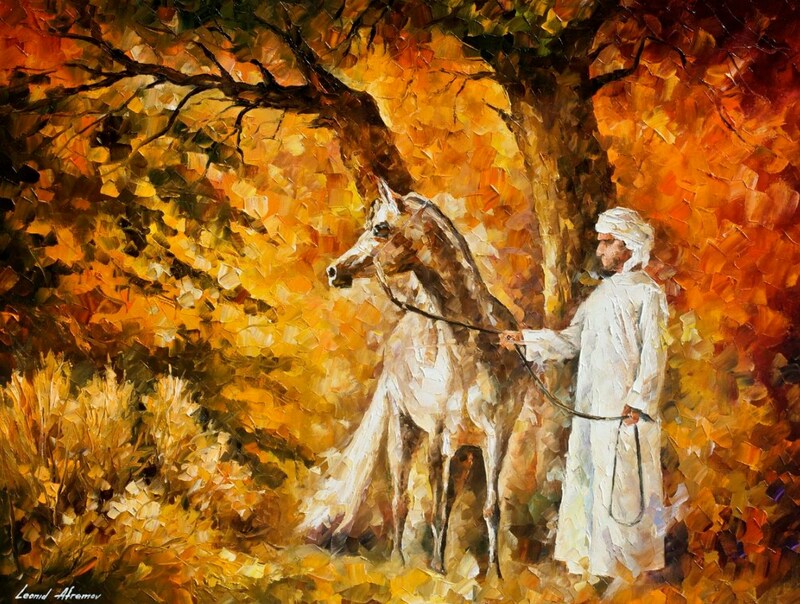 He attemped to sell at street fairs and exhibitions in local social clubs. 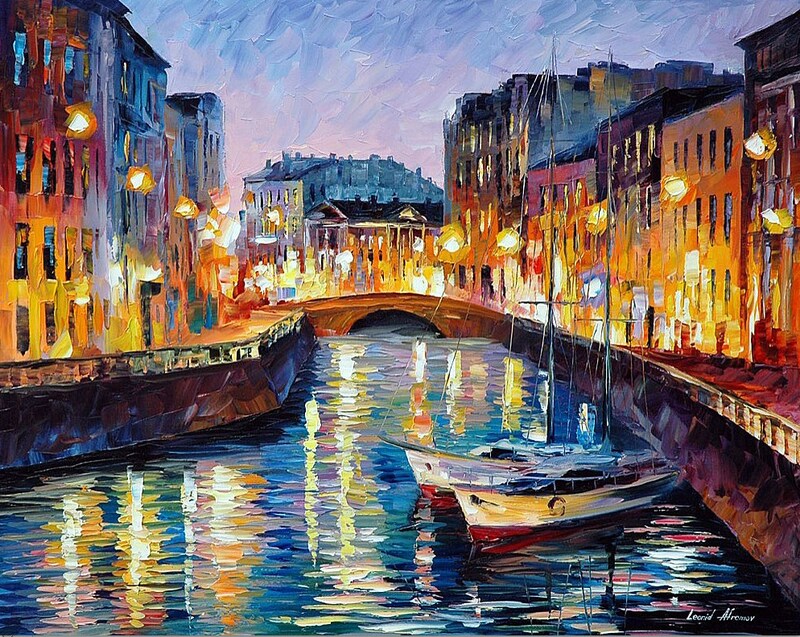 However, it was difficult because of the social stigma of Russian immigrants. 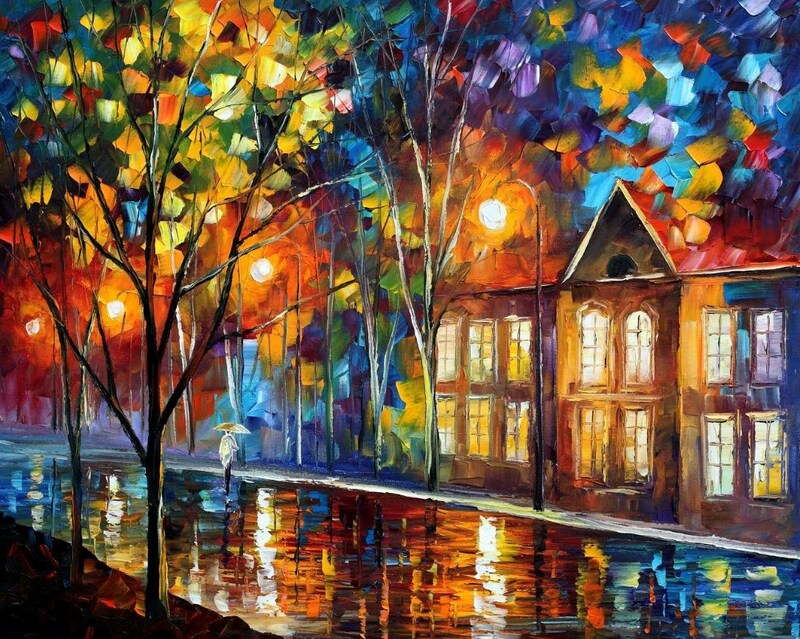 His wife was forced to take a low-paying job in a textile factory. 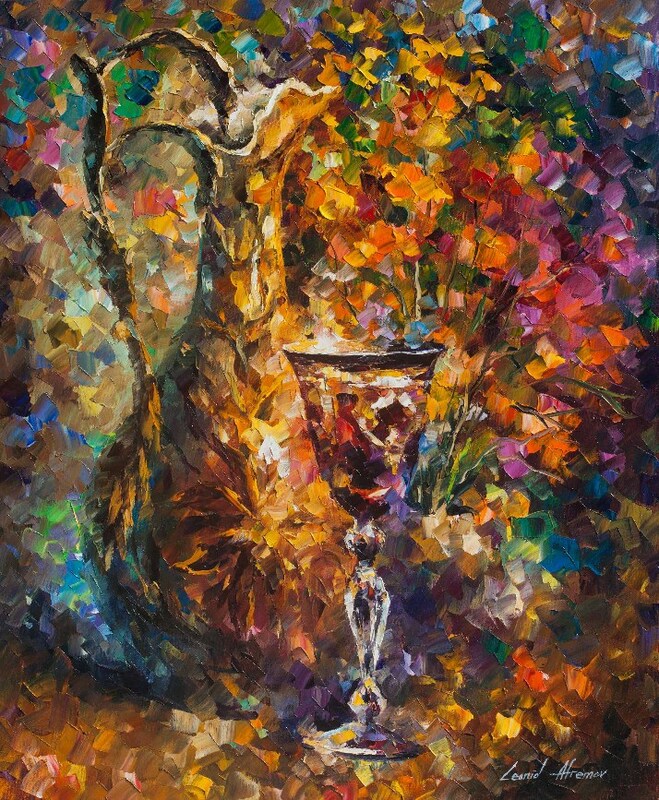 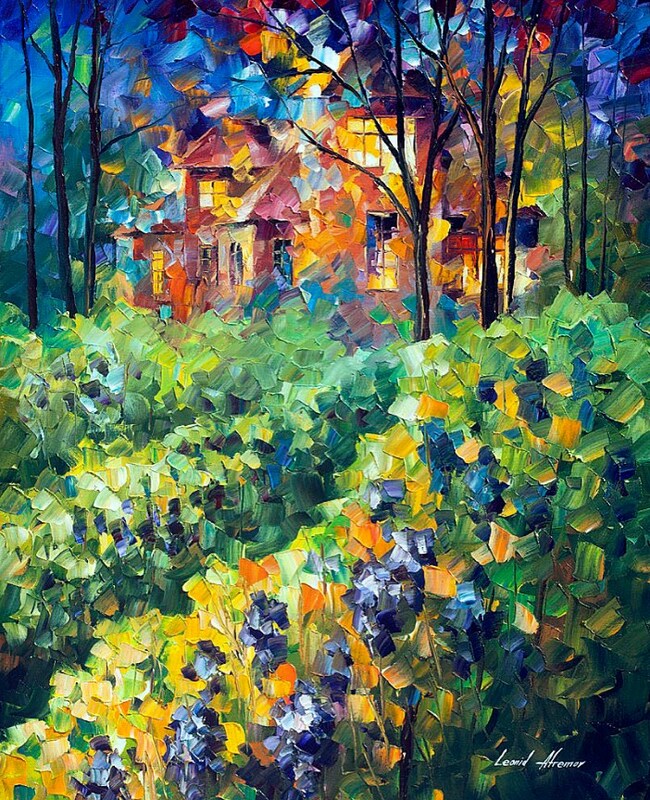 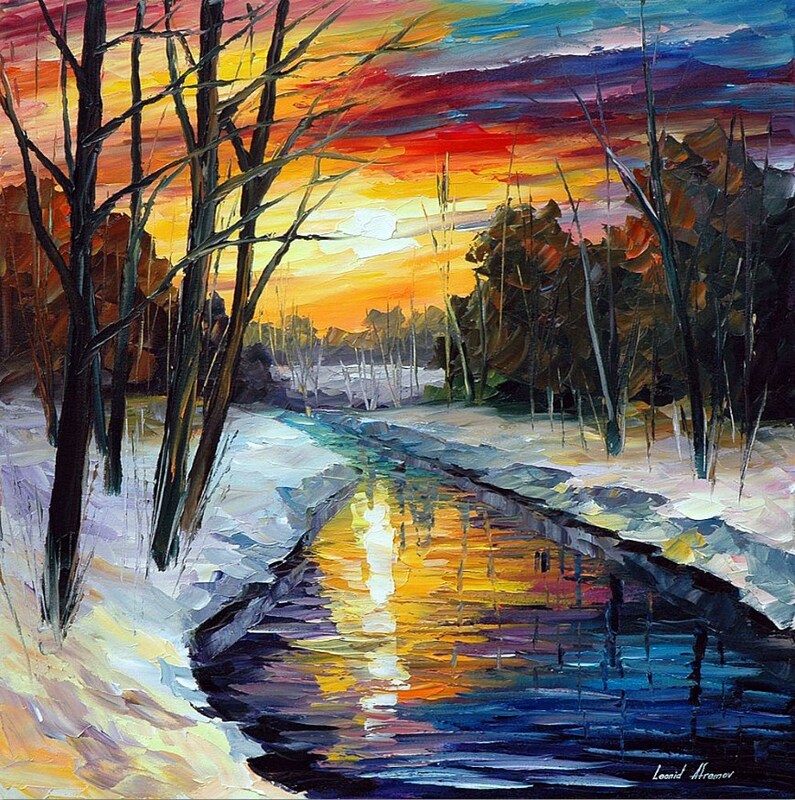 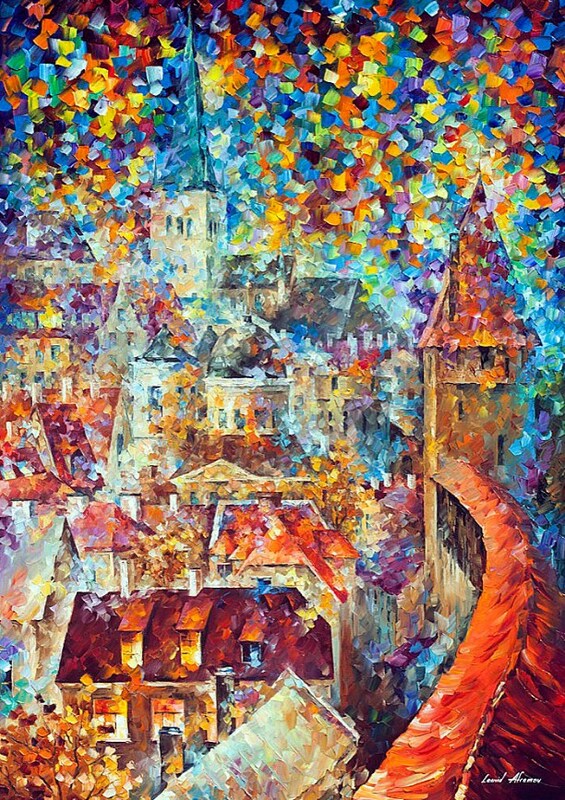 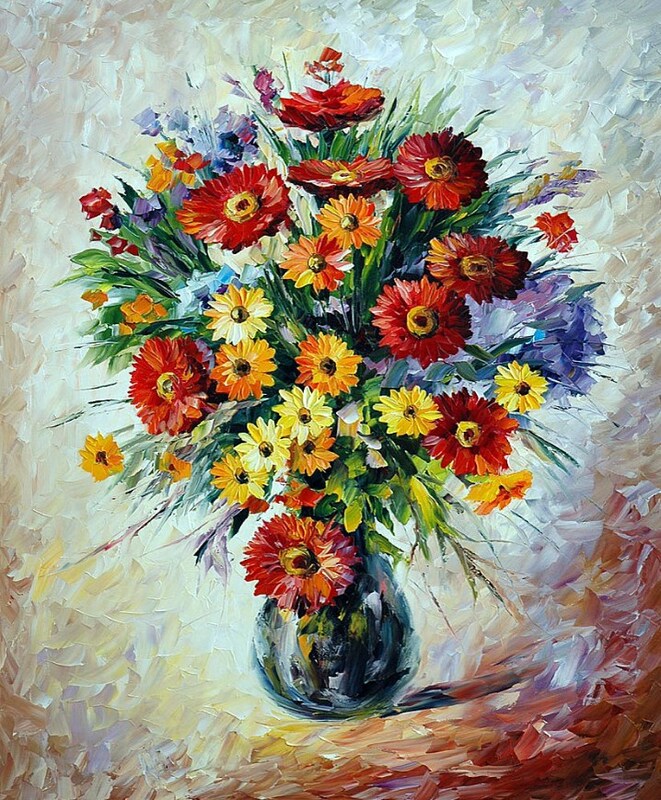 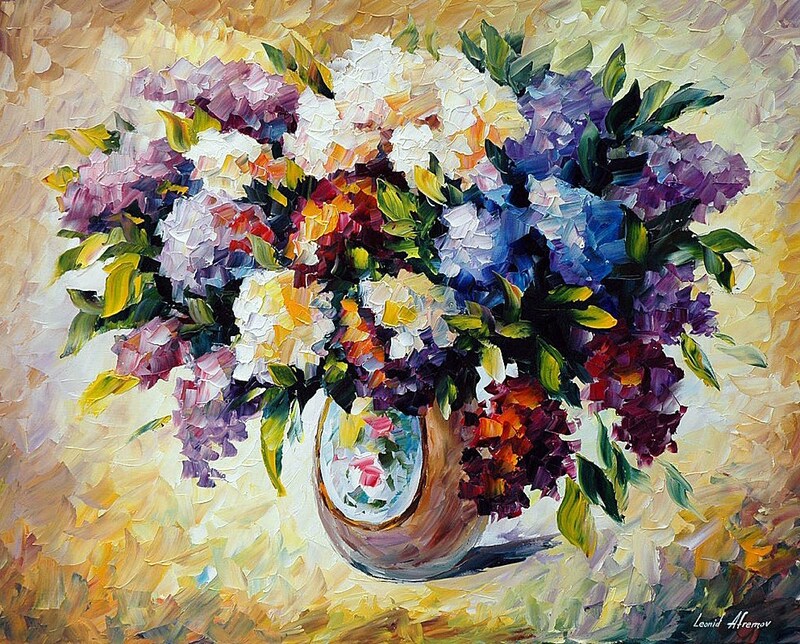 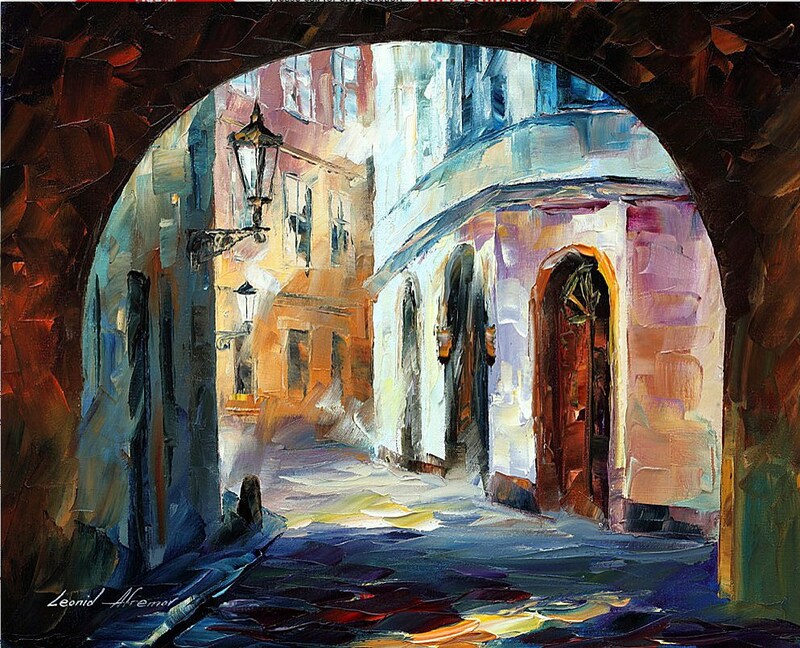 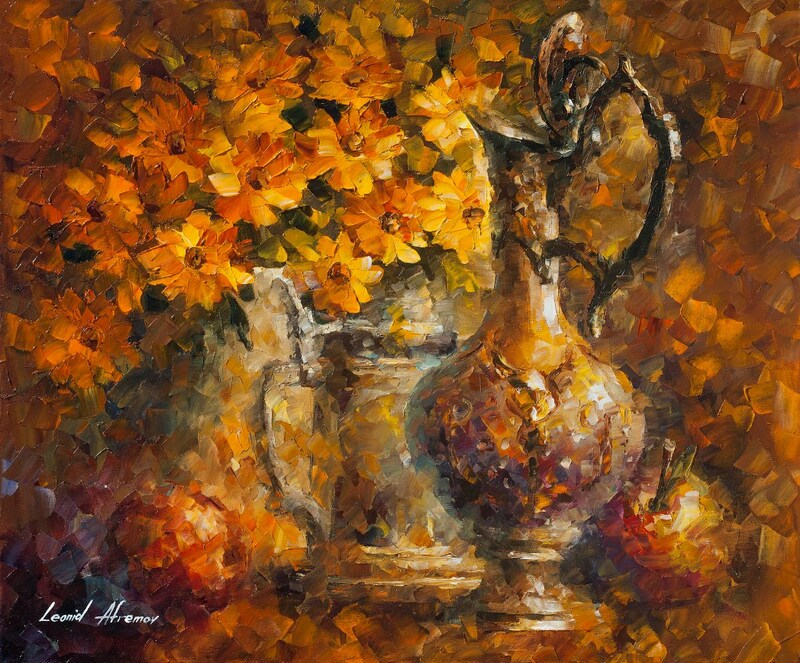 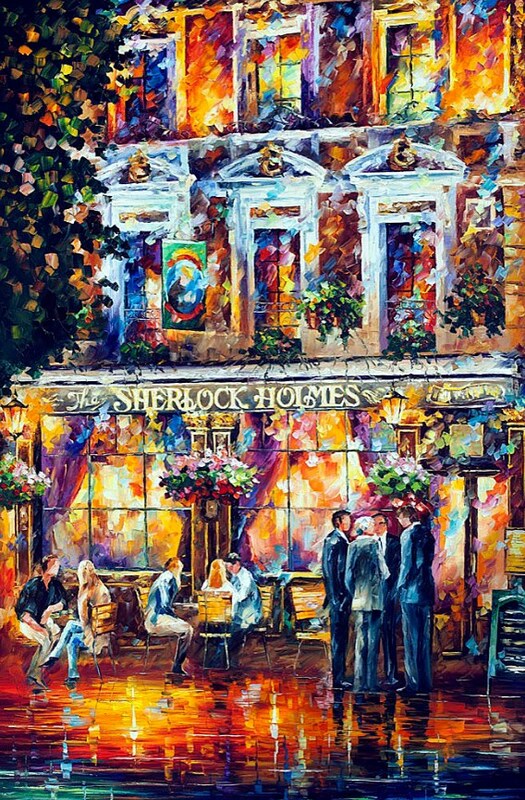 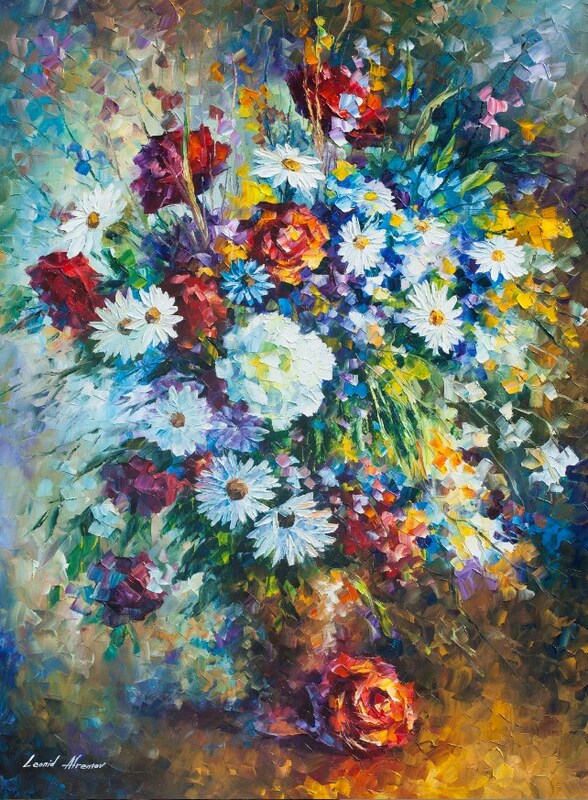 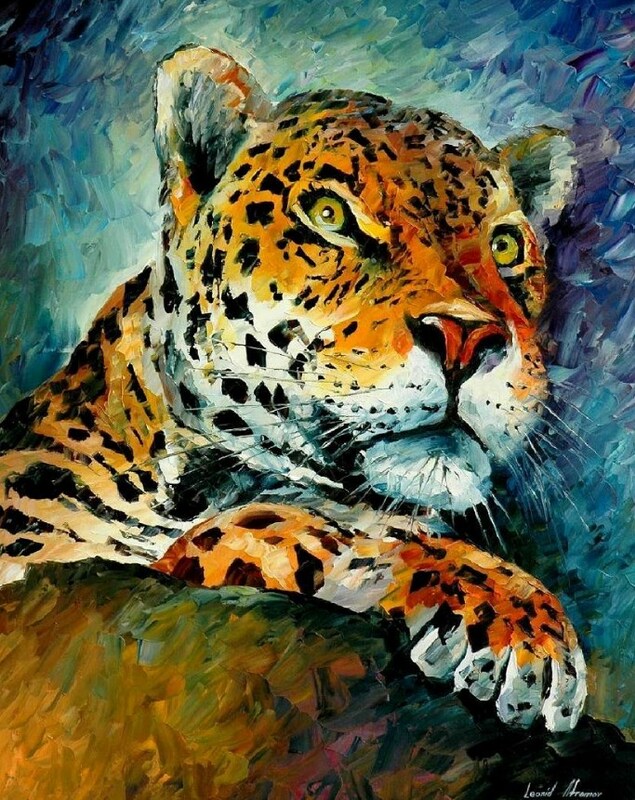 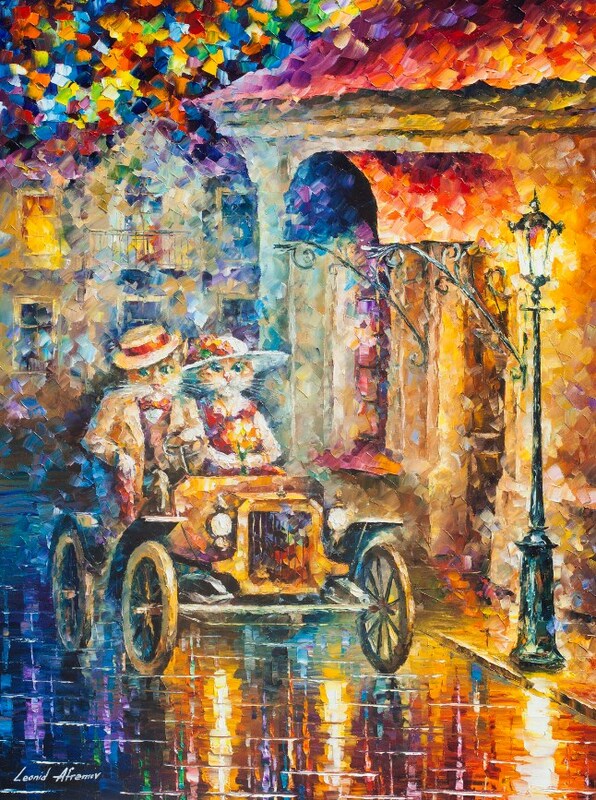 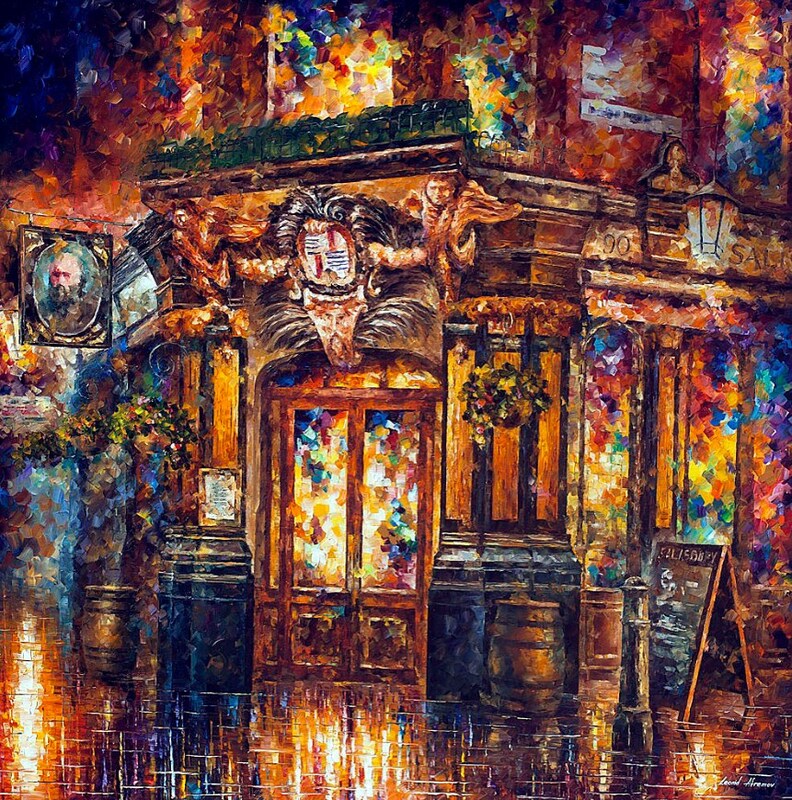 In 1994, out of extreme desperation, his 16-year-old son Dmitry tried to sell Leonid’s paintings door to door around the neighborhood, This practice proved itself very effective, and Afremov suddenly started selling many pieces he painted and was getting slightly better money than from selling directly to galleries. Dmitry proved himself to be a good door-to-door salesman. 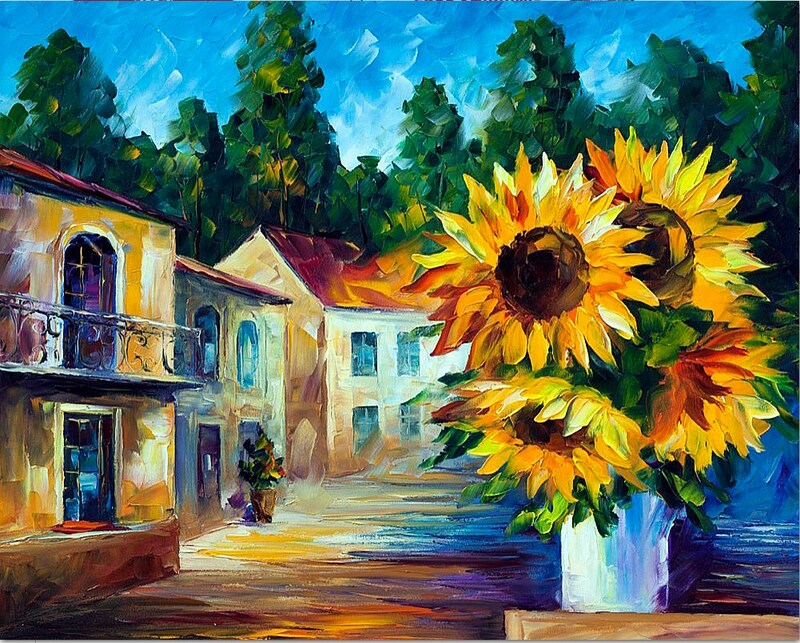 He was selling Leonid’s paintings in the new neighborhoods where recent Russian Immigrants were living. 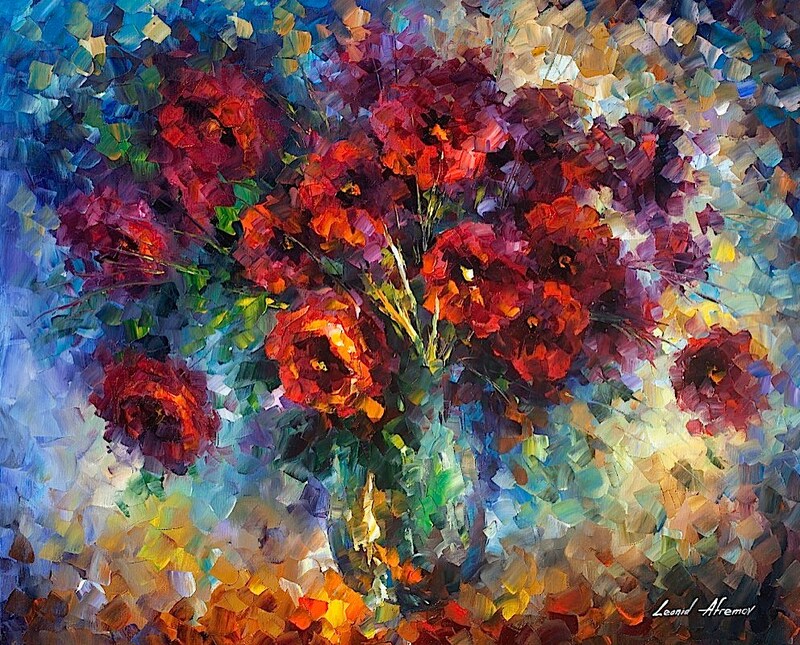 In 1995, Leonid acquired enough funds to open his own gallery and frame shop in Ashdod. 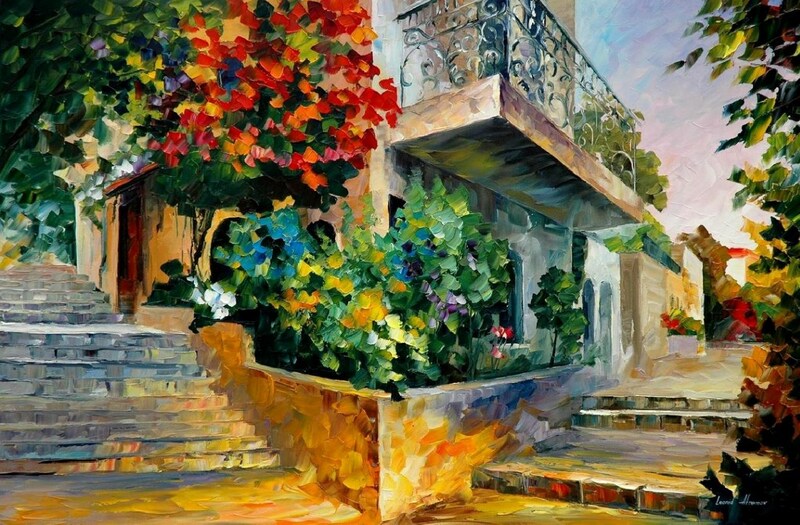 The gallery was not popular among local Israelis; it was mainly visited by fellow Russian immigrants. 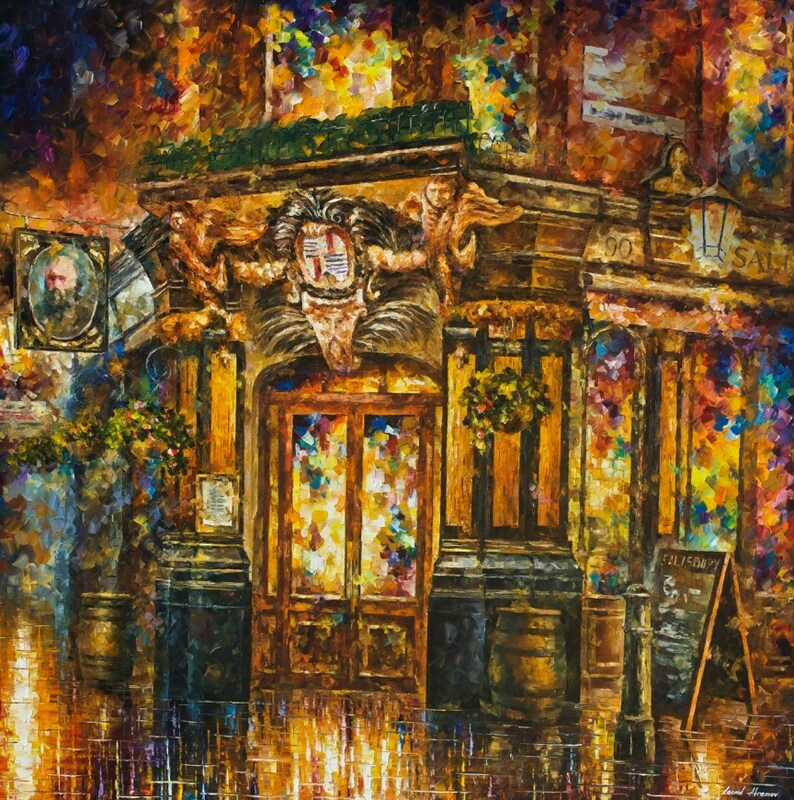 The gallery was vandalized and broken into on several occasions. 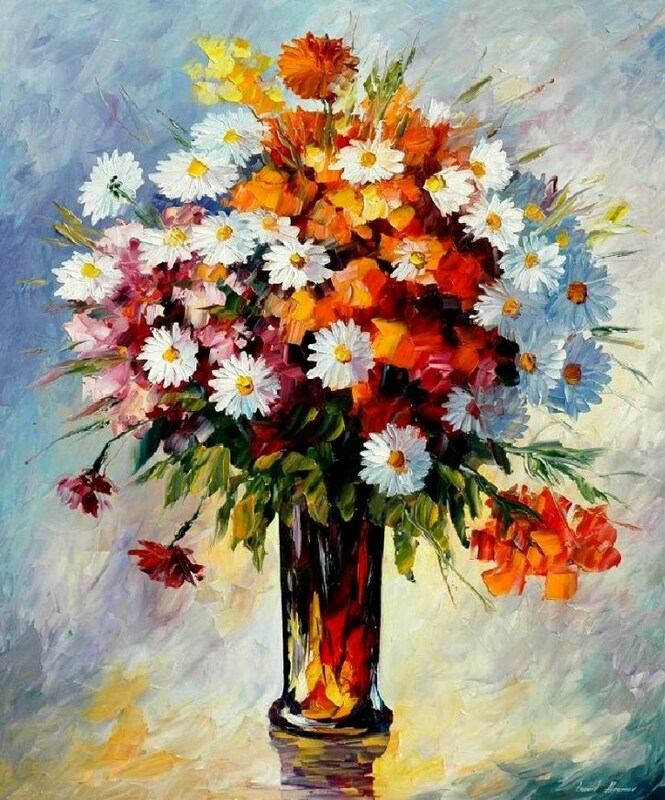 The local Israeli newspapers were refusing to publish advertisements for Afremov’s Gallery, and he was mainly advertising via Russian immigrant press and radio station. 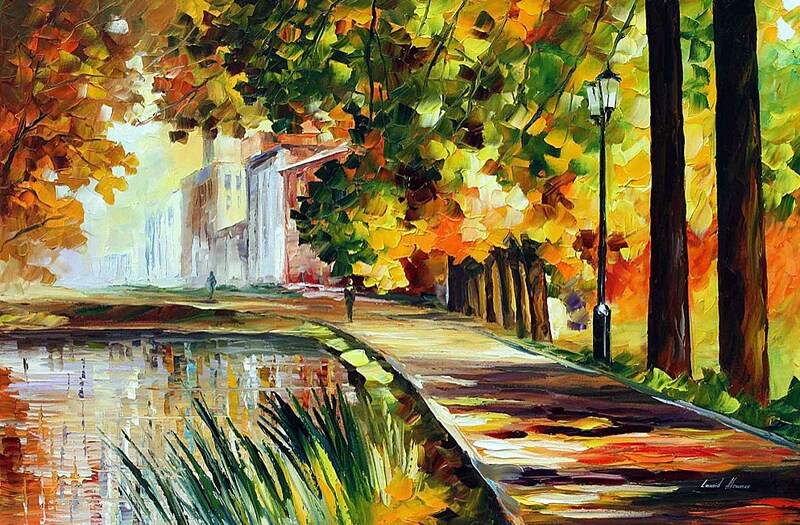 However, artistic freedom could not be achieved completely. 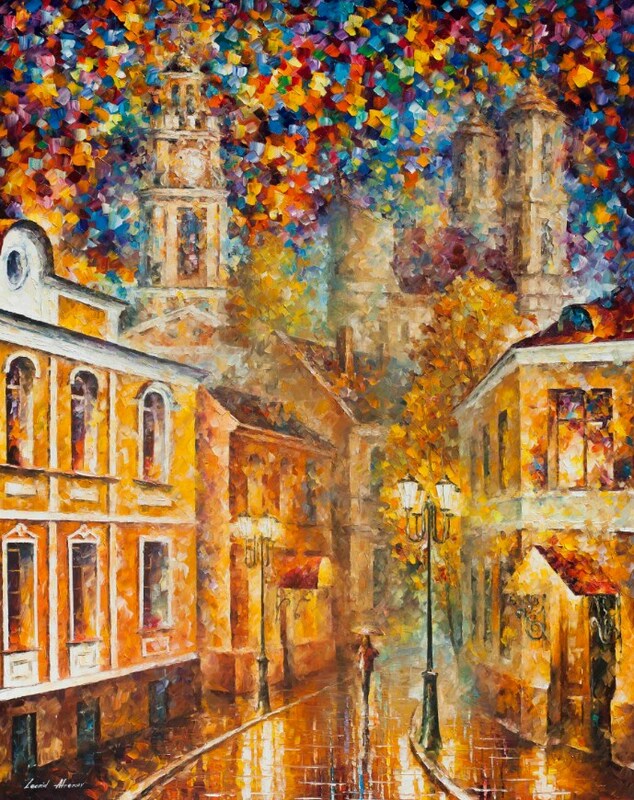 In March 2001, Afremov’s gallery was completely vandalized. 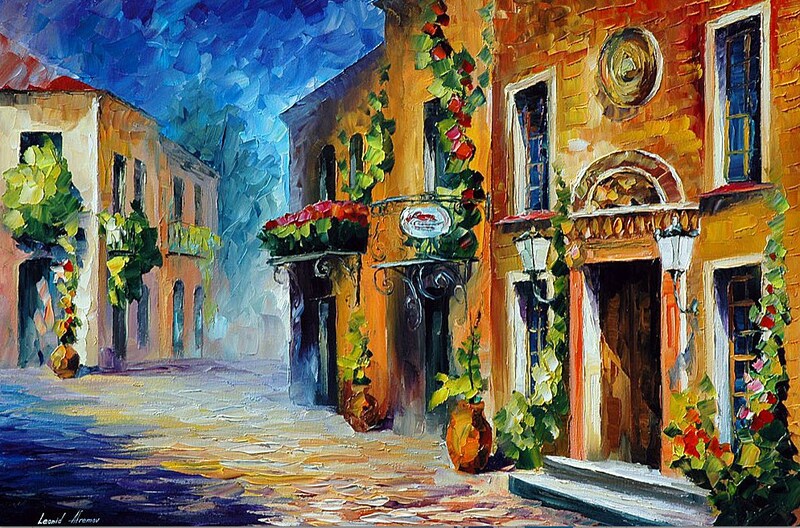 Dozens of paintings were destroyed, the artistic equipment stolen and the facility turned into rubble. 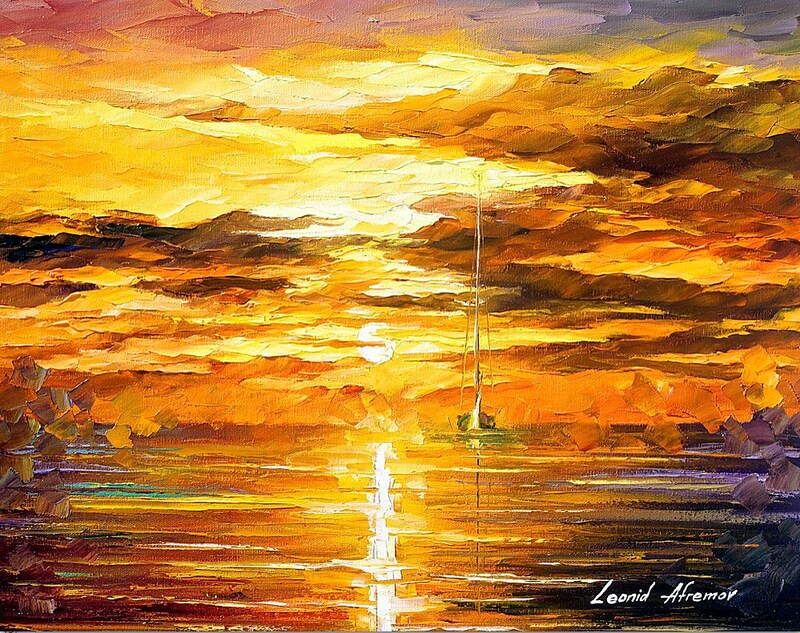 Then Leonid decided it was time to move somewhere else where he could be treated with deserved respect, eventually moving to the USA in January 2002. 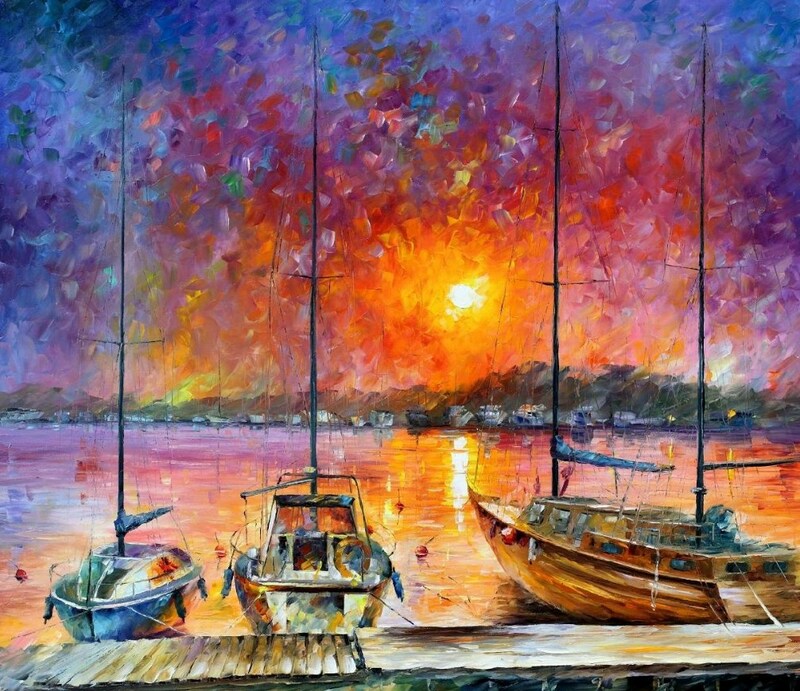 The exposure on eBay gave him opportunities for commission orders and access to different galleries. 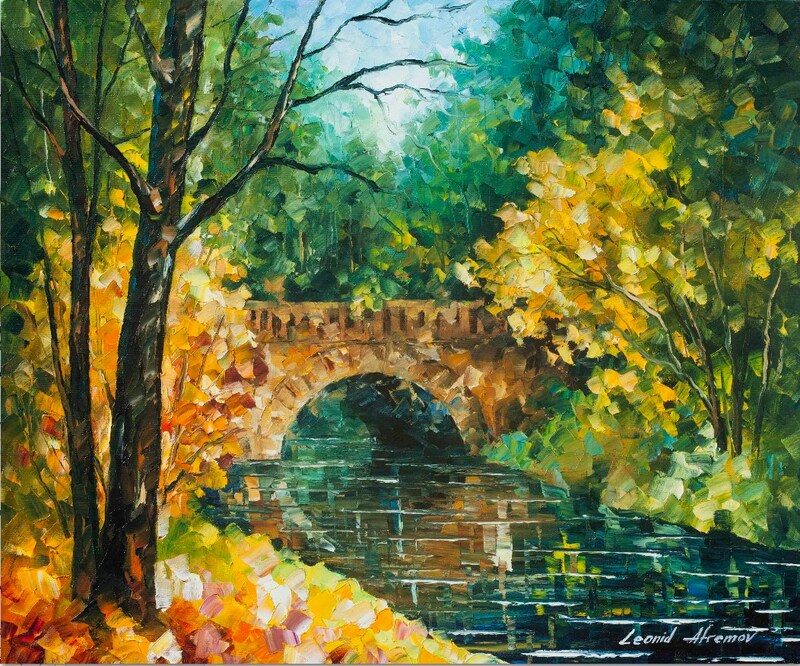 However, because of negative experiences with galleries, Leonid preferred to sell directly to the collector. 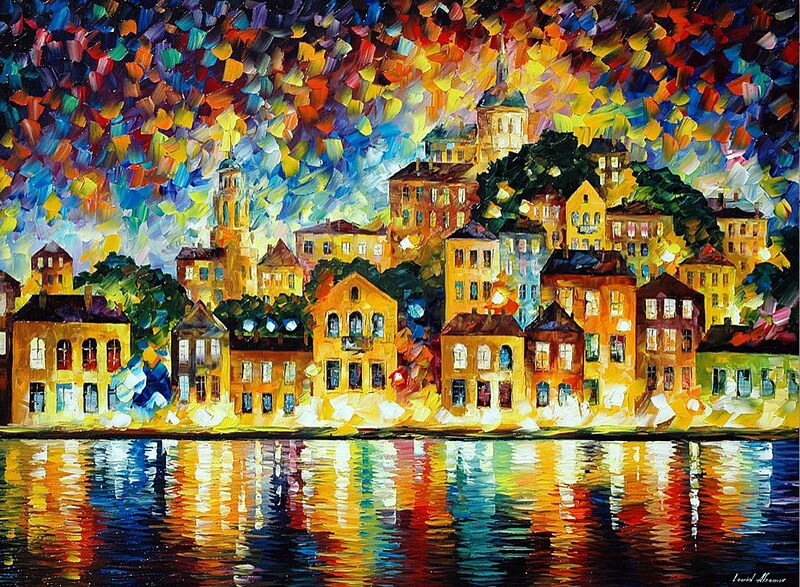 Thanks to the internet exposure, Afremov participated in various local TV shows around the USA. 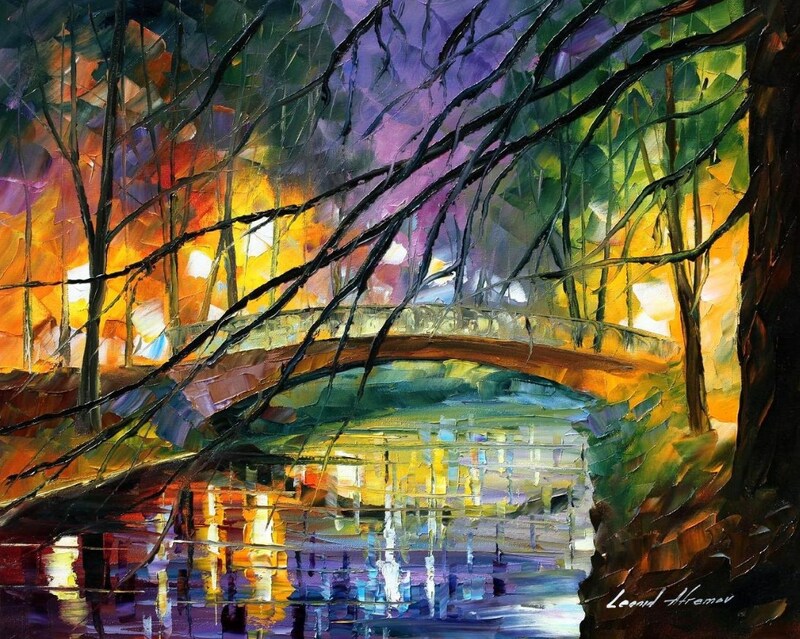 His art was declared very relaxing and calm by notable psychologists and psychiatrists who make use of his painting in various psychological and psychiatric therapy procedures. 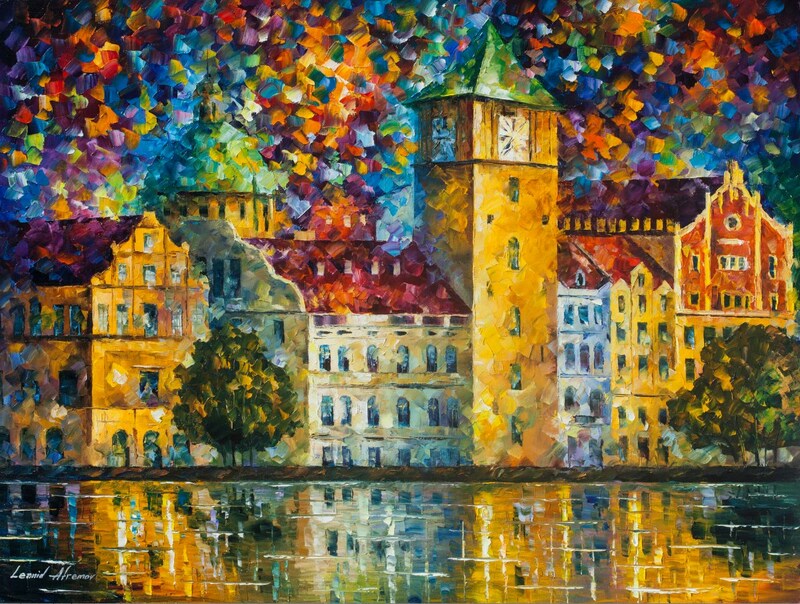 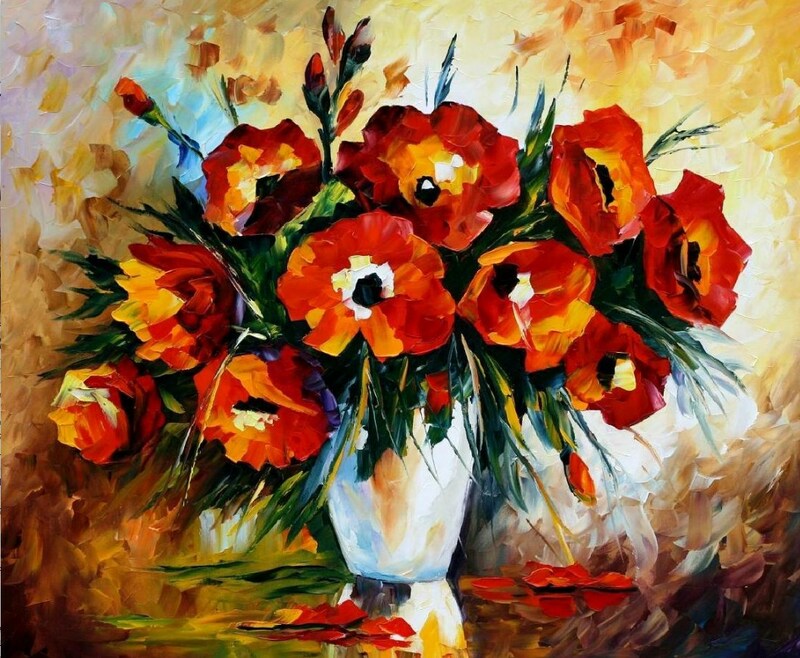 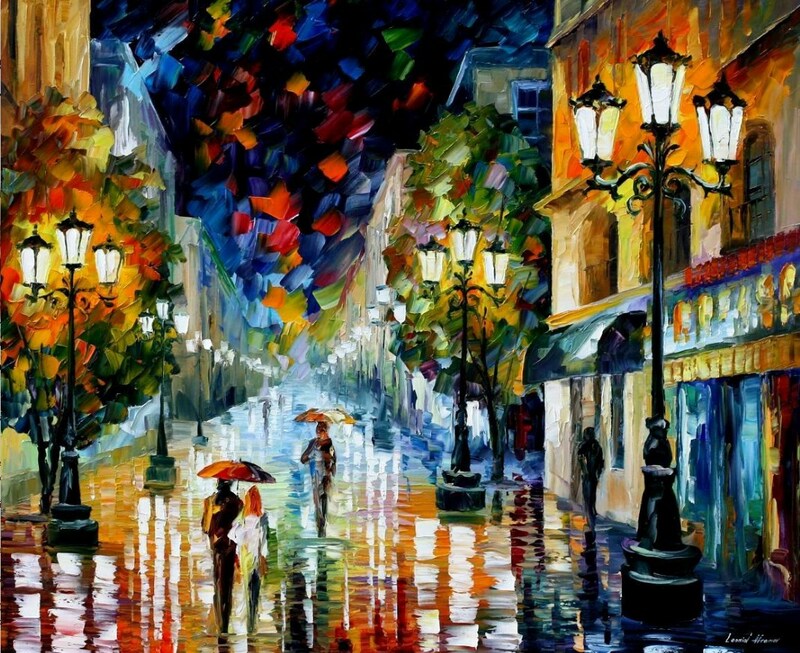 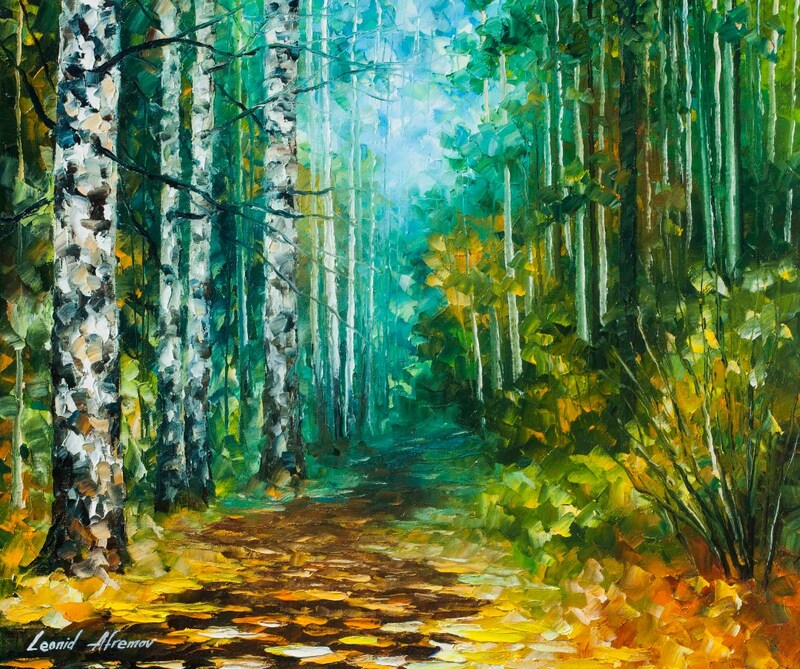 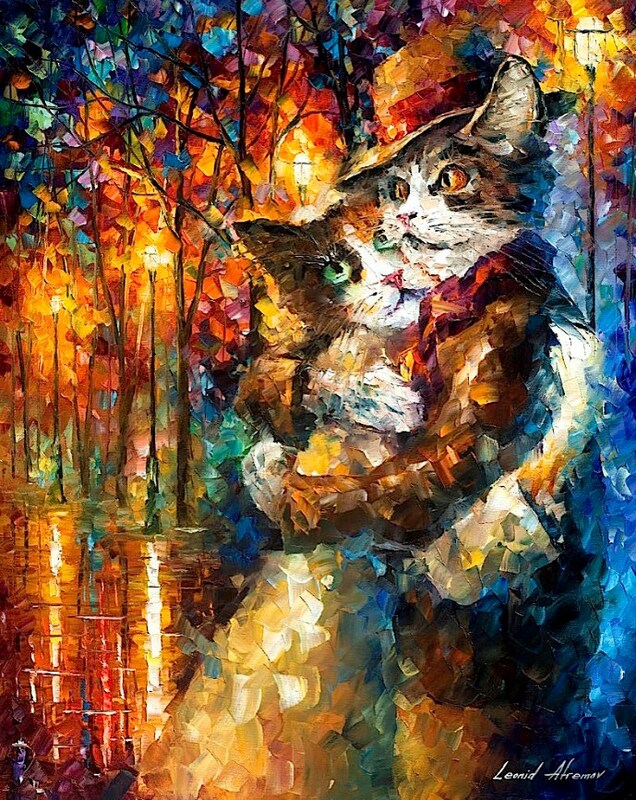 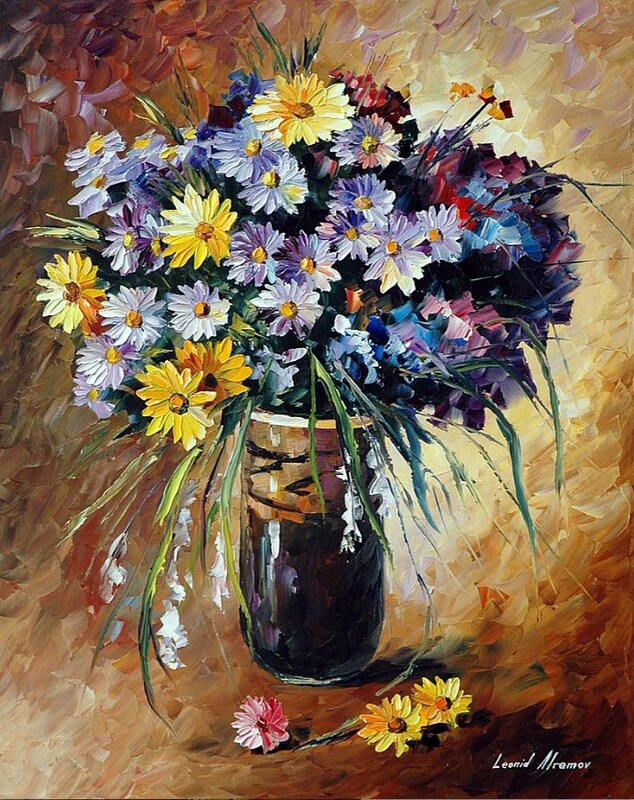 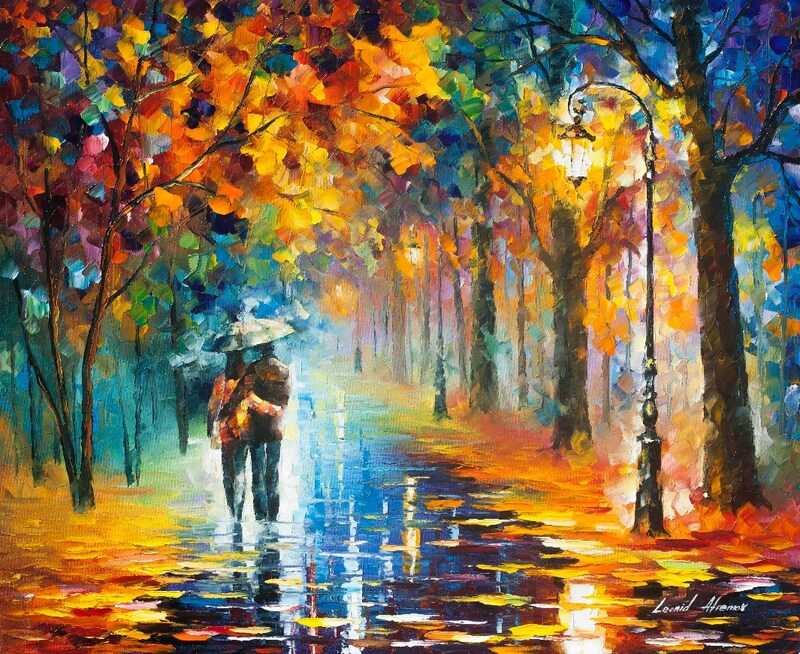 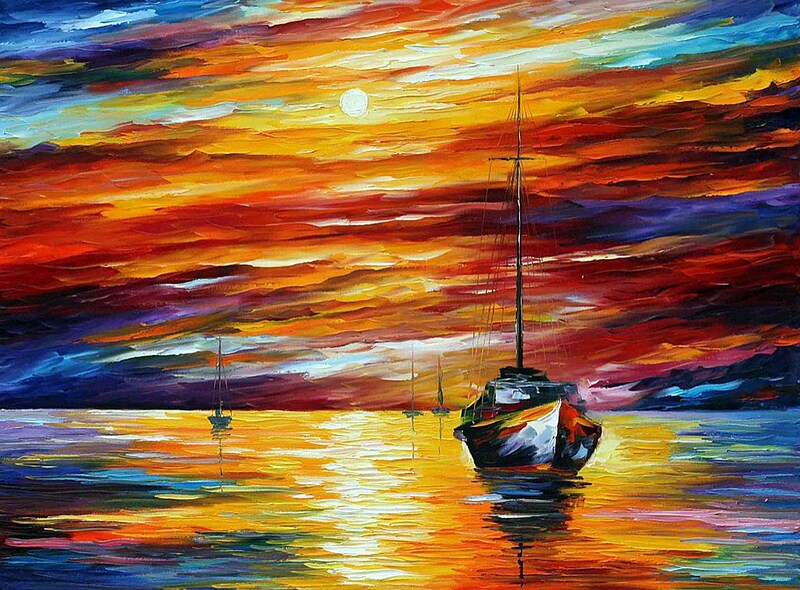 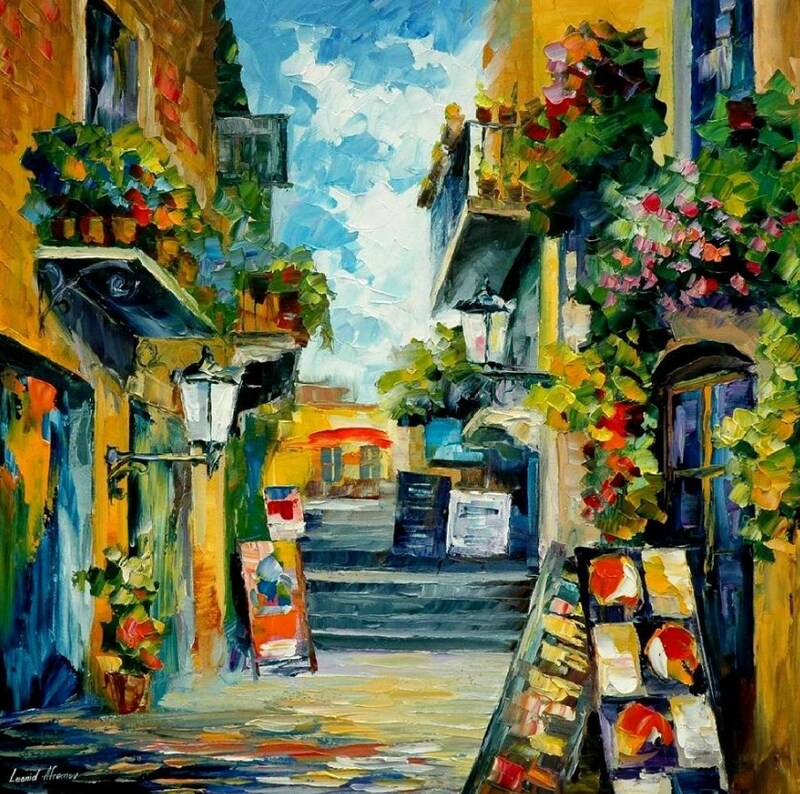 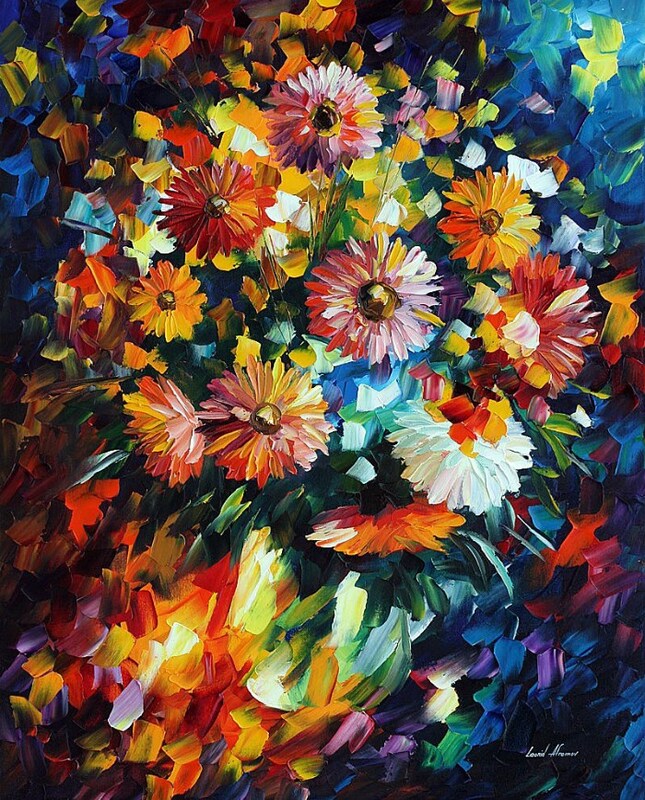 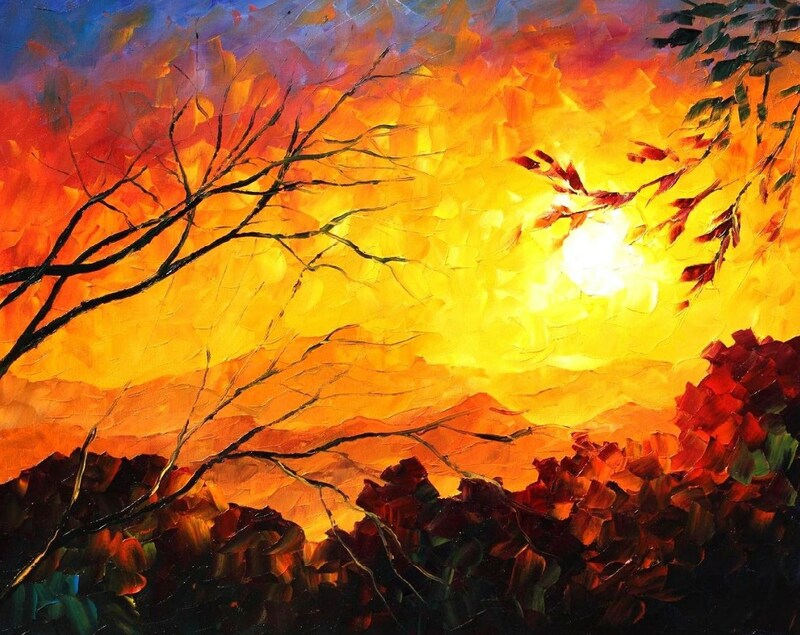 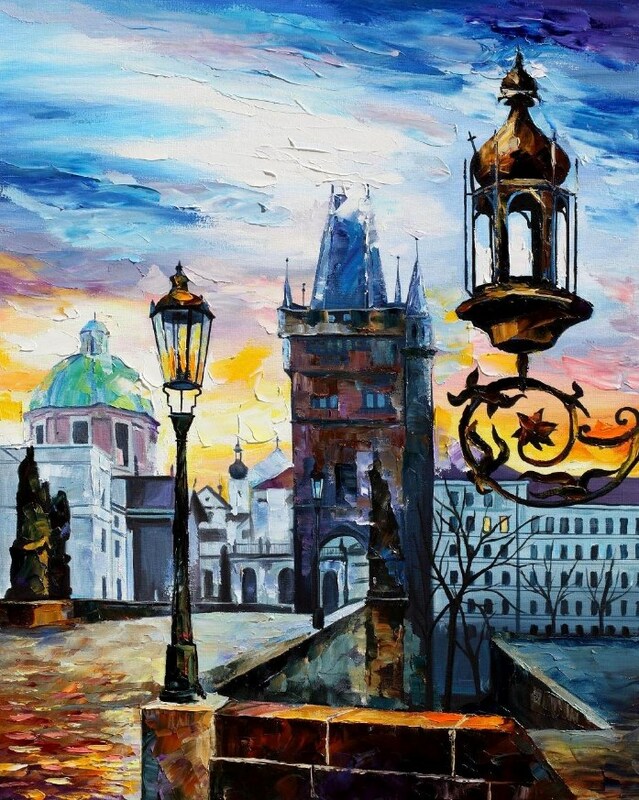 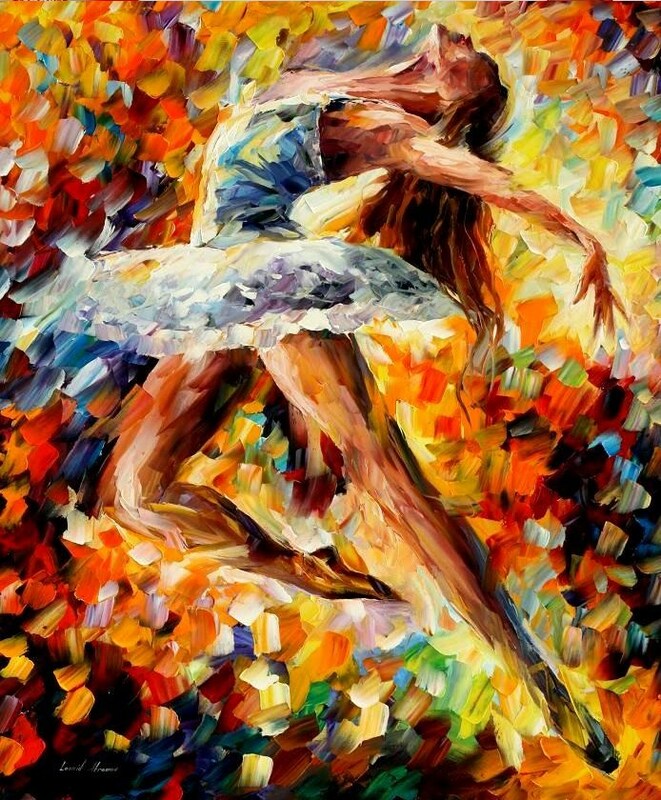 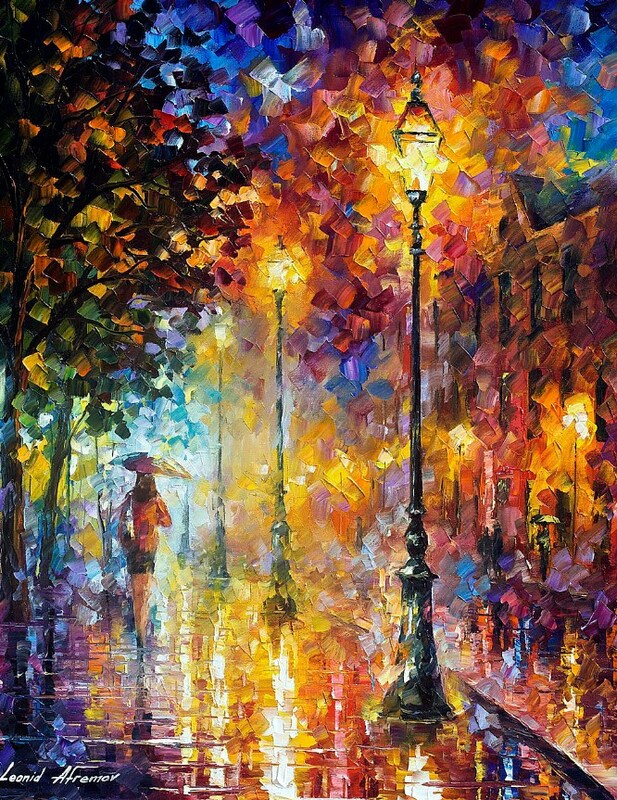 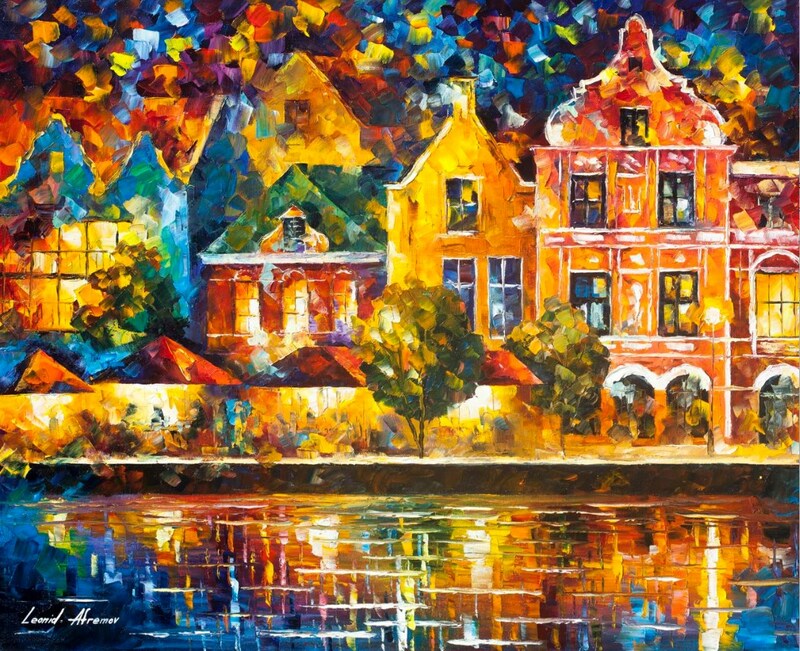 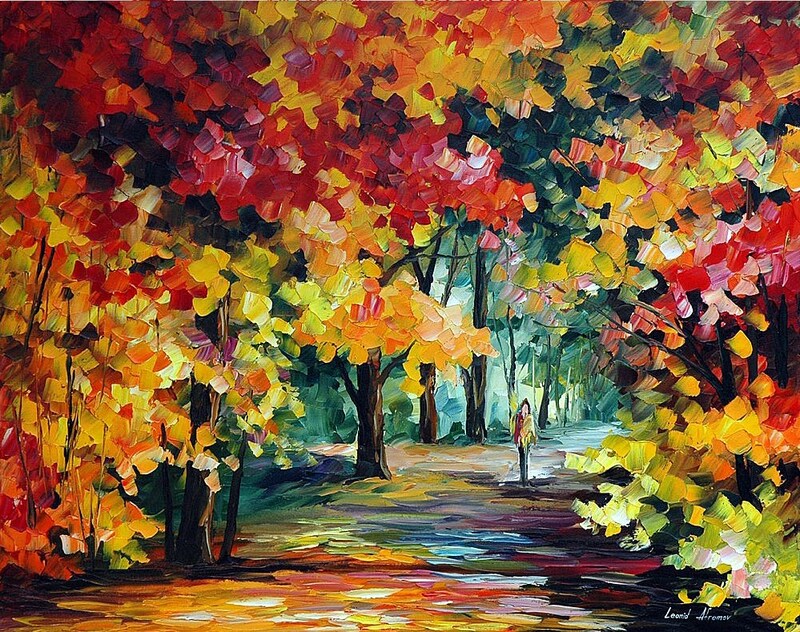 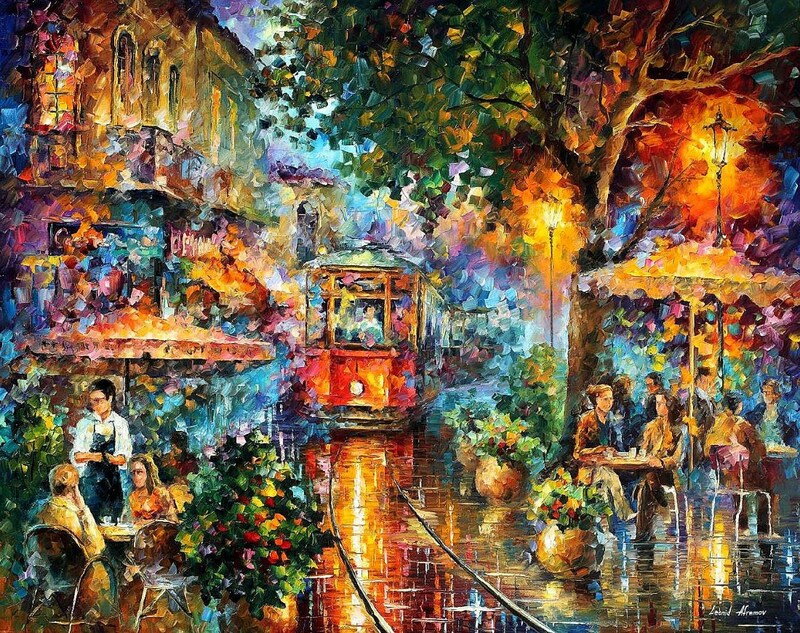 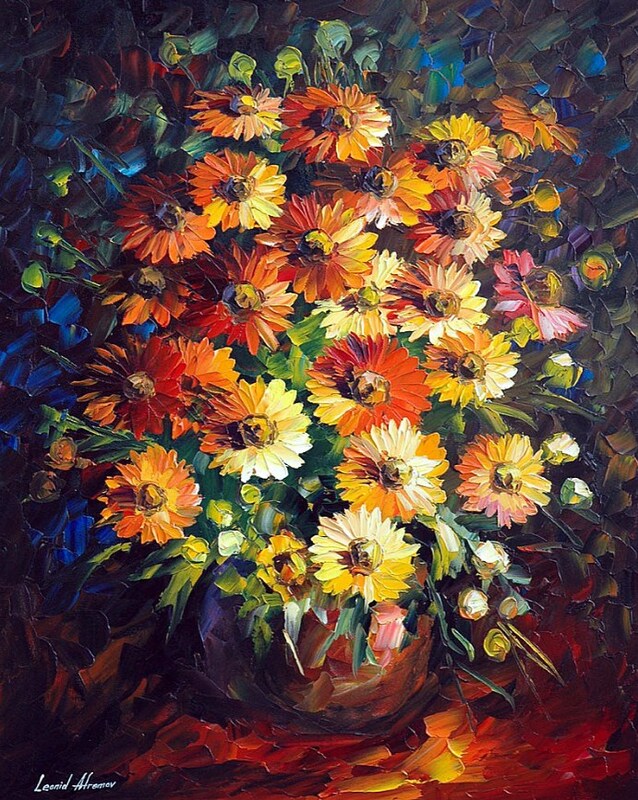 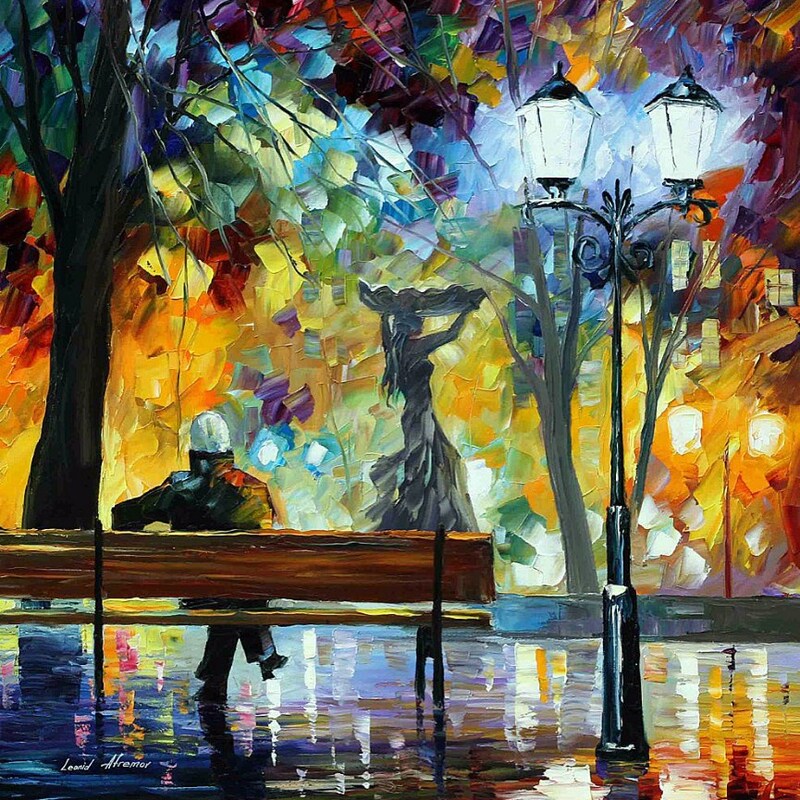 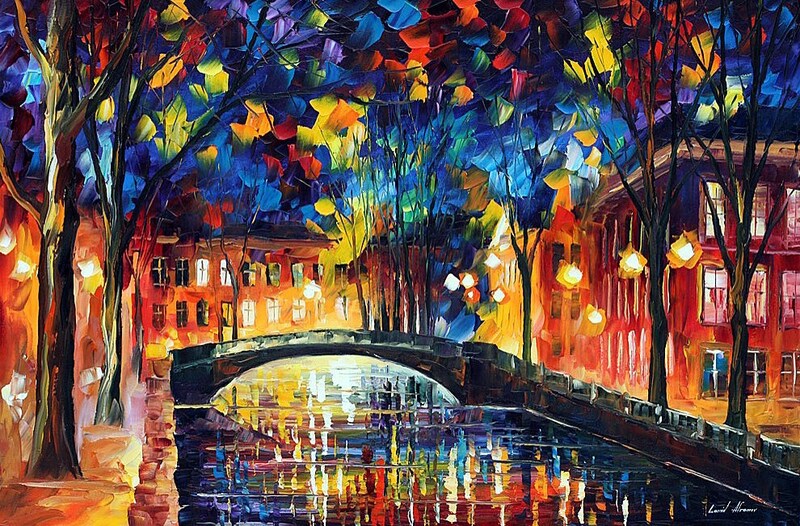 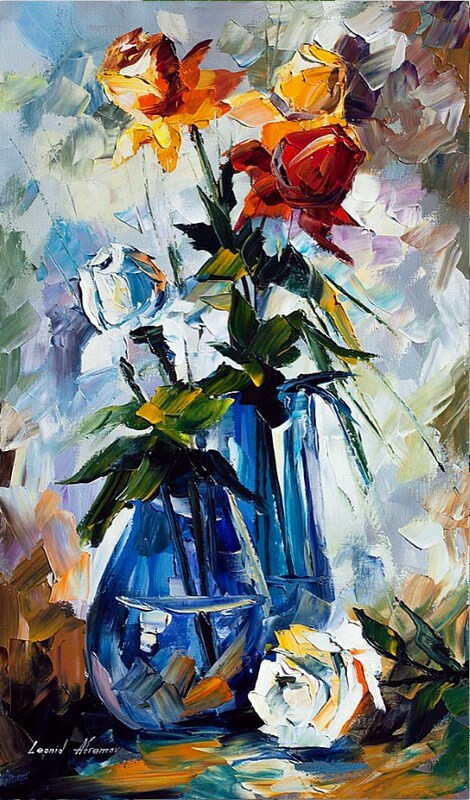 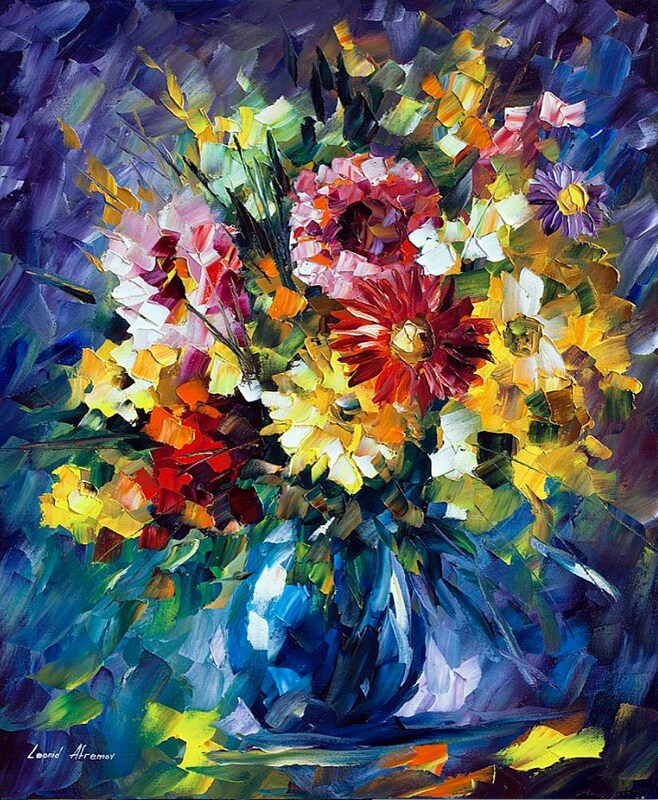 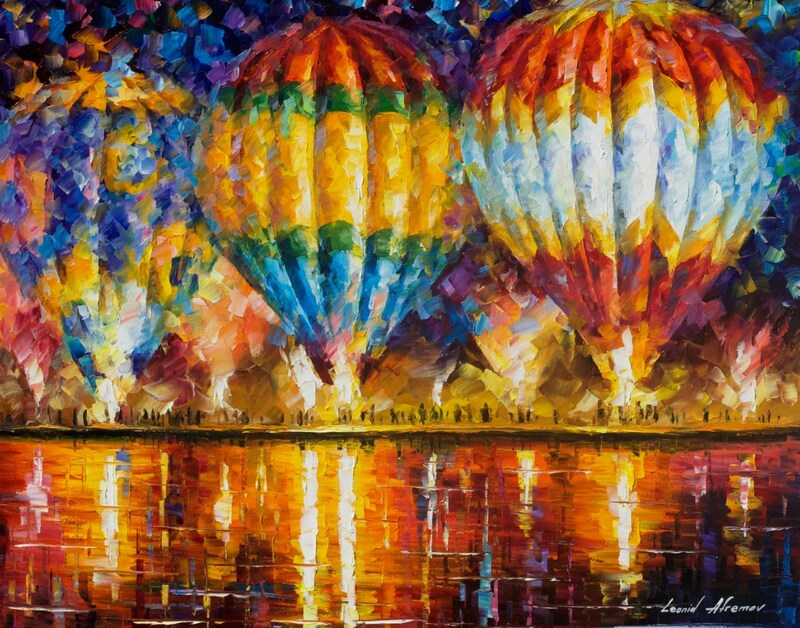 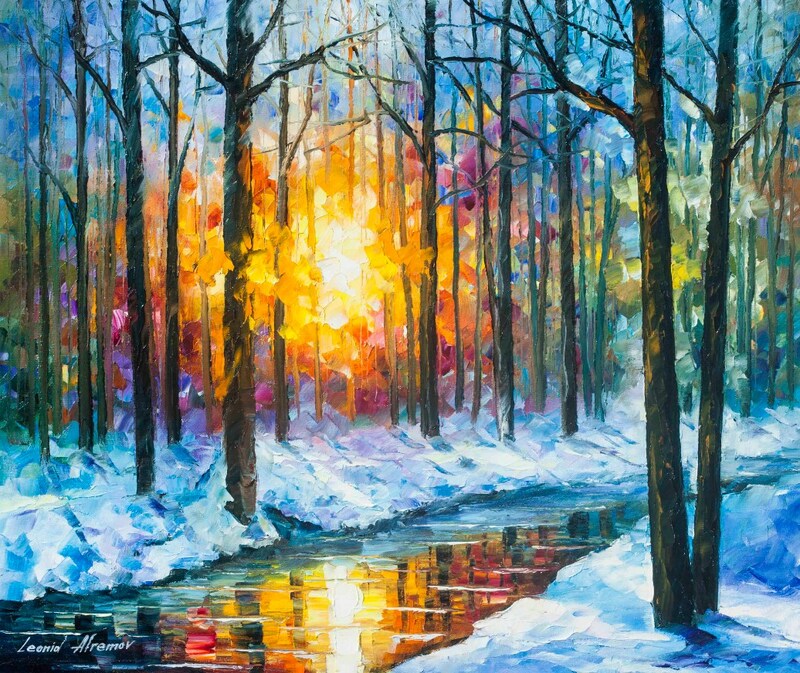 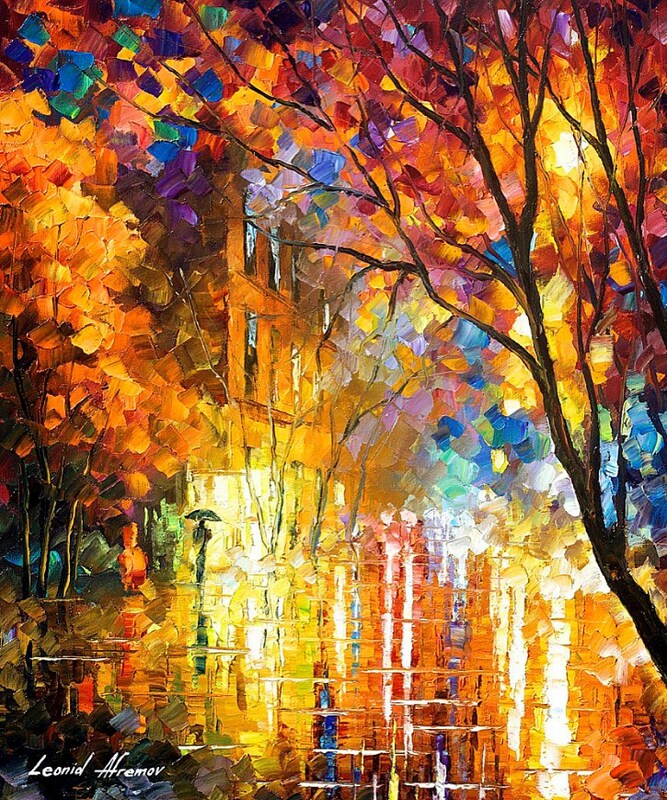 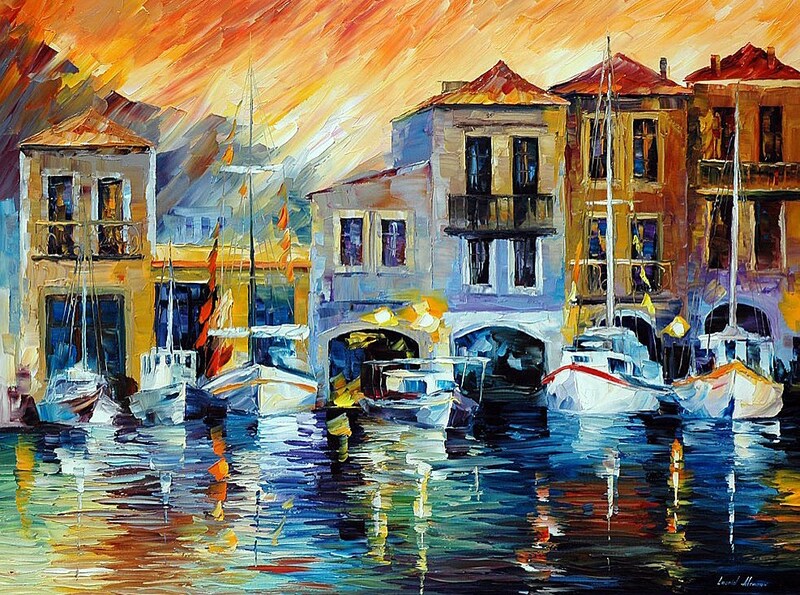 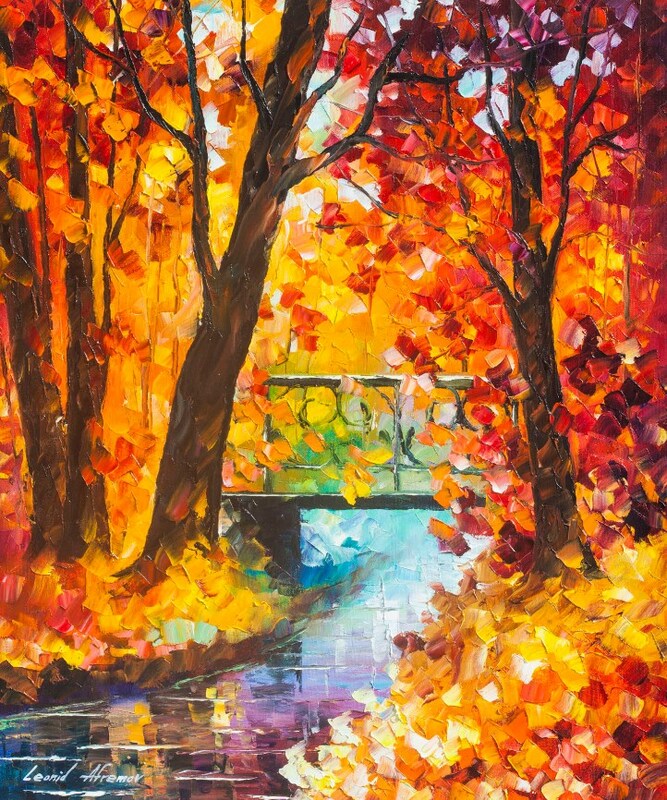 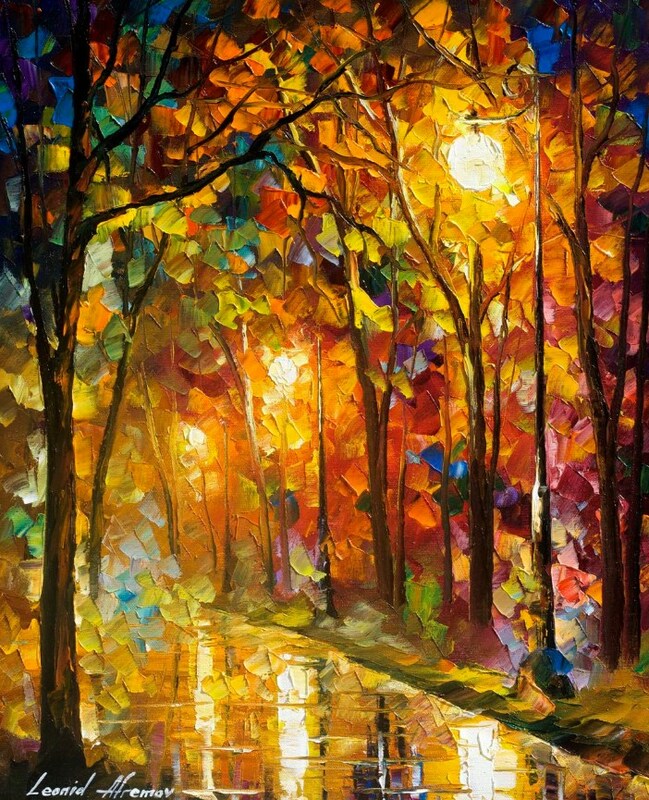 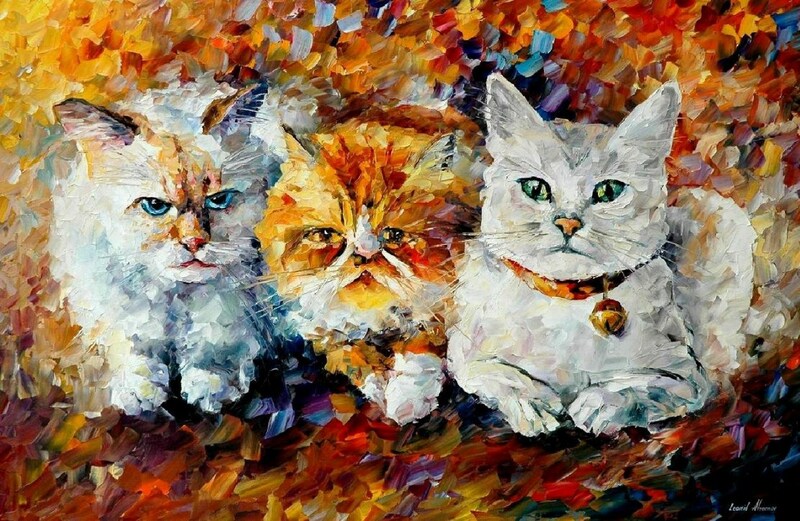 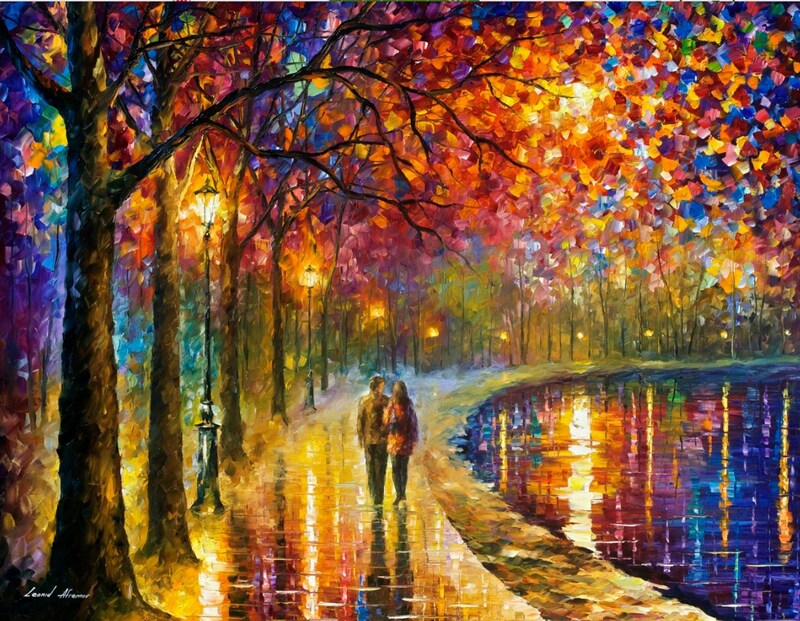 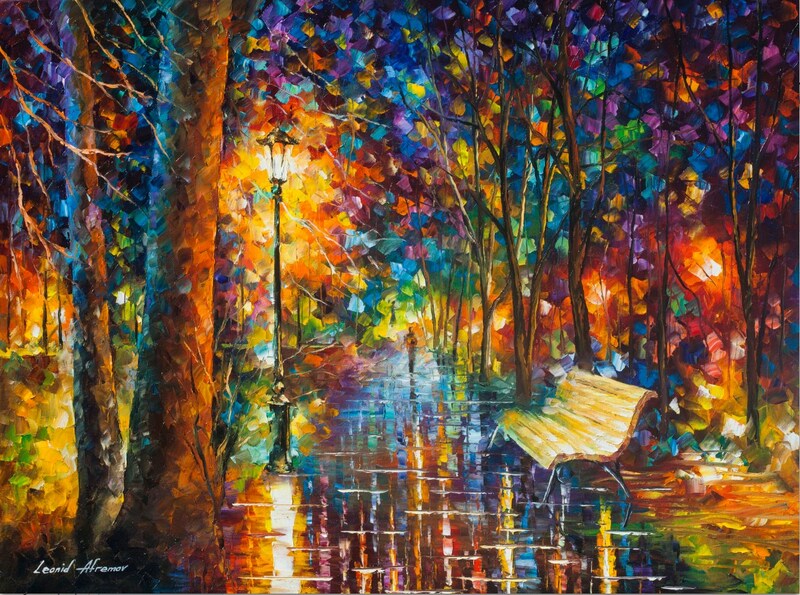 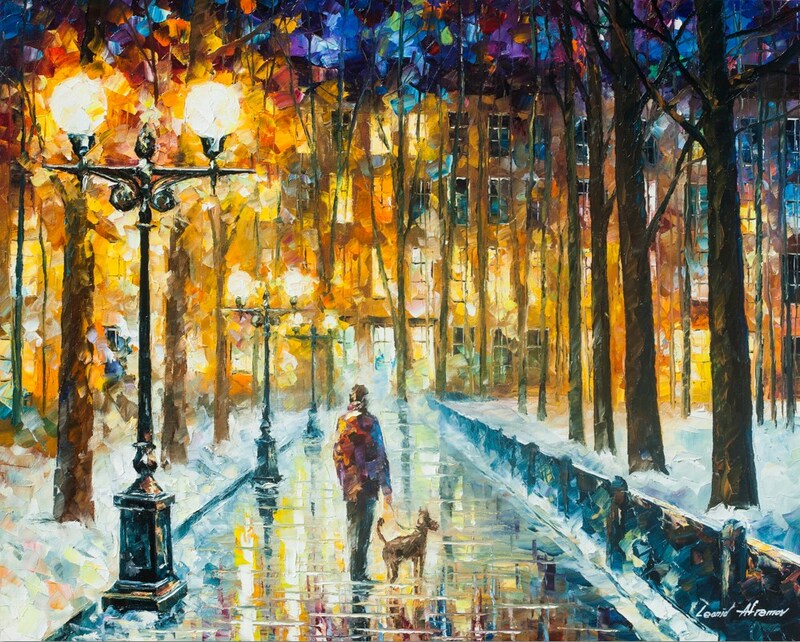 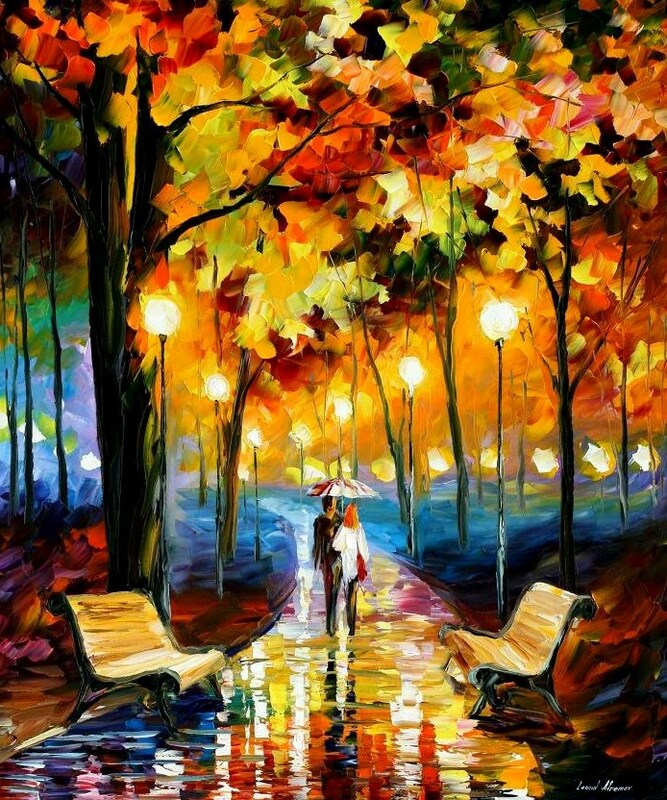 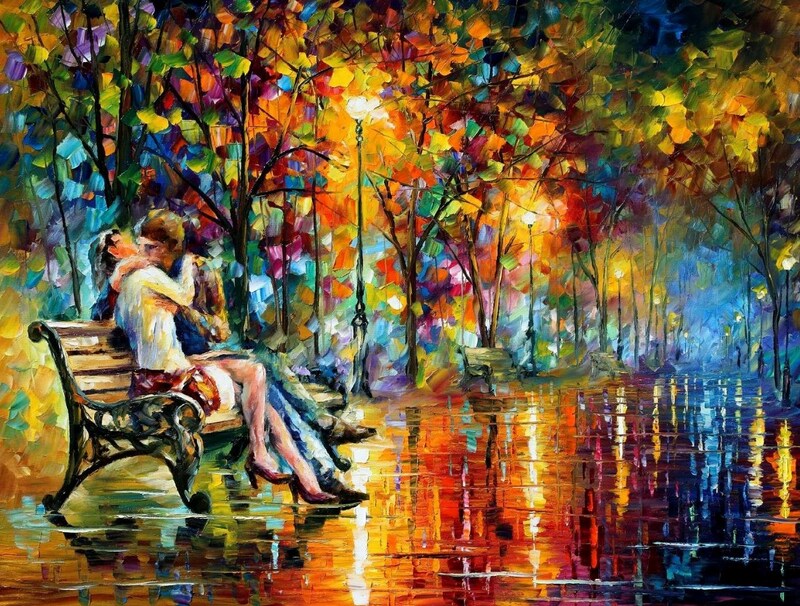 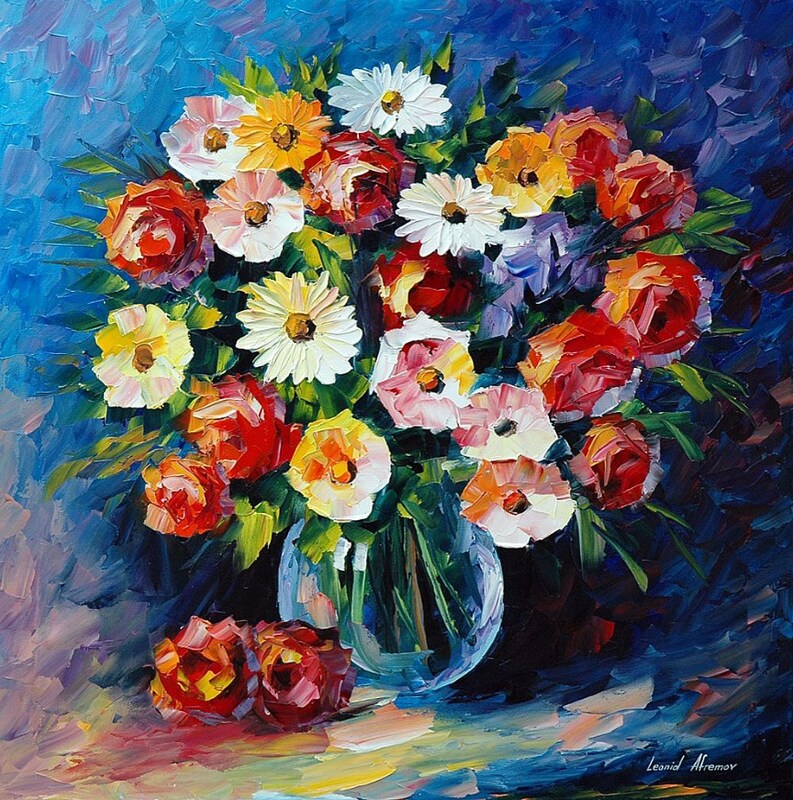 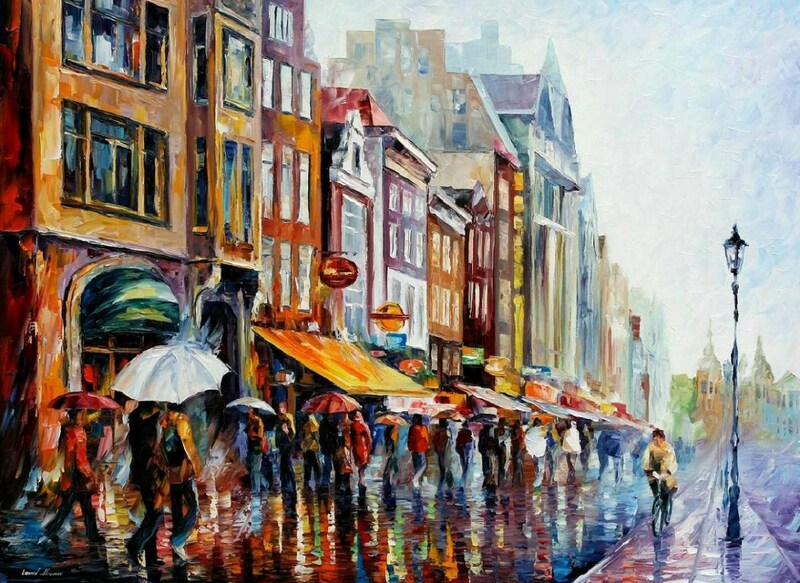 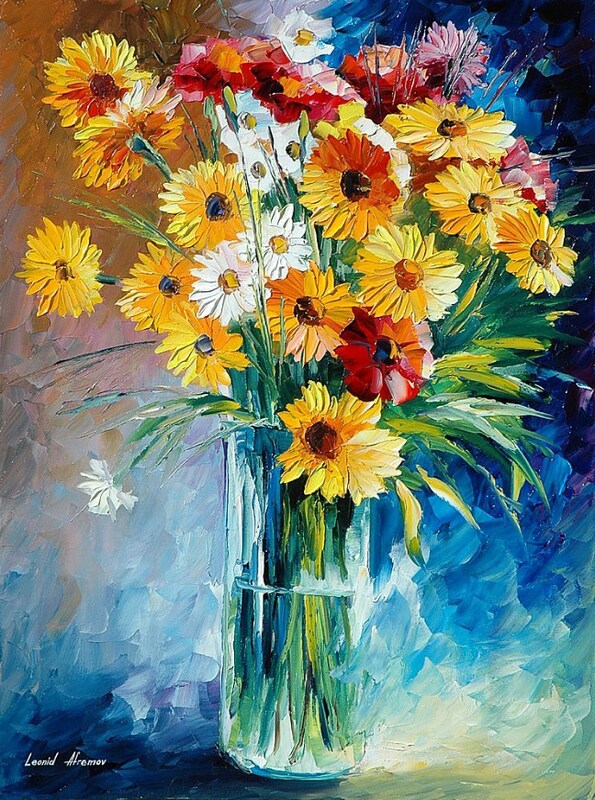 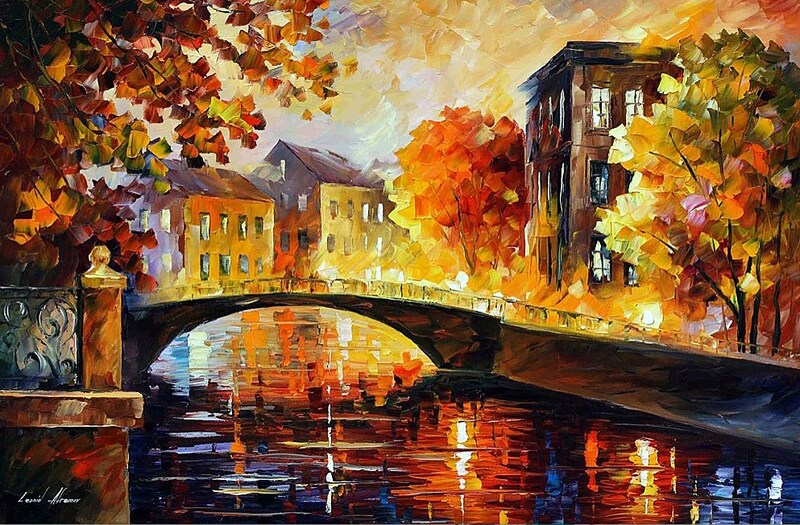 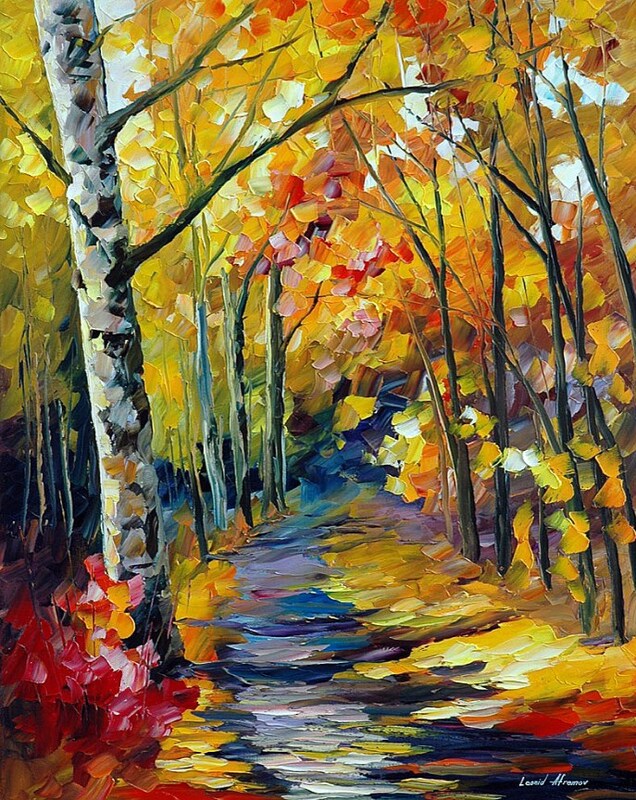 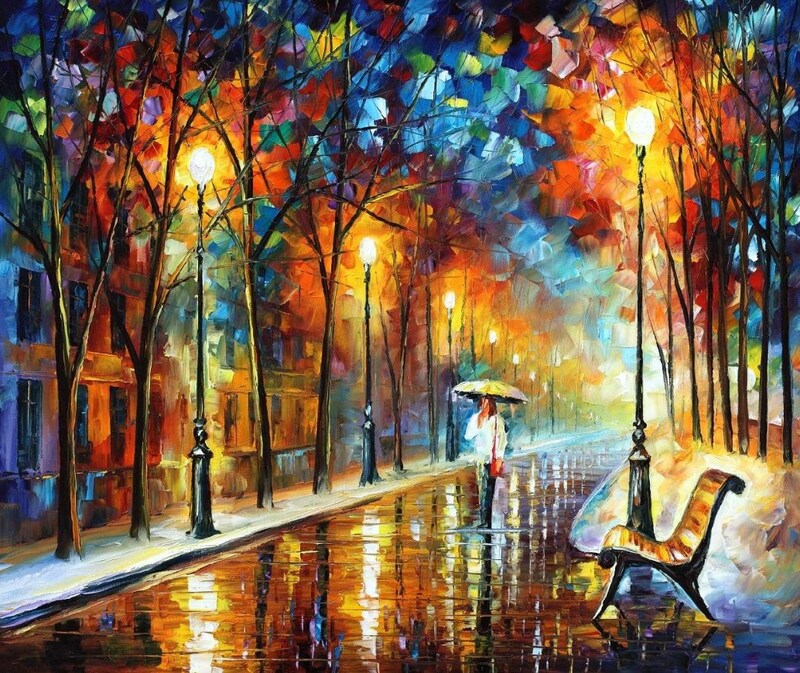 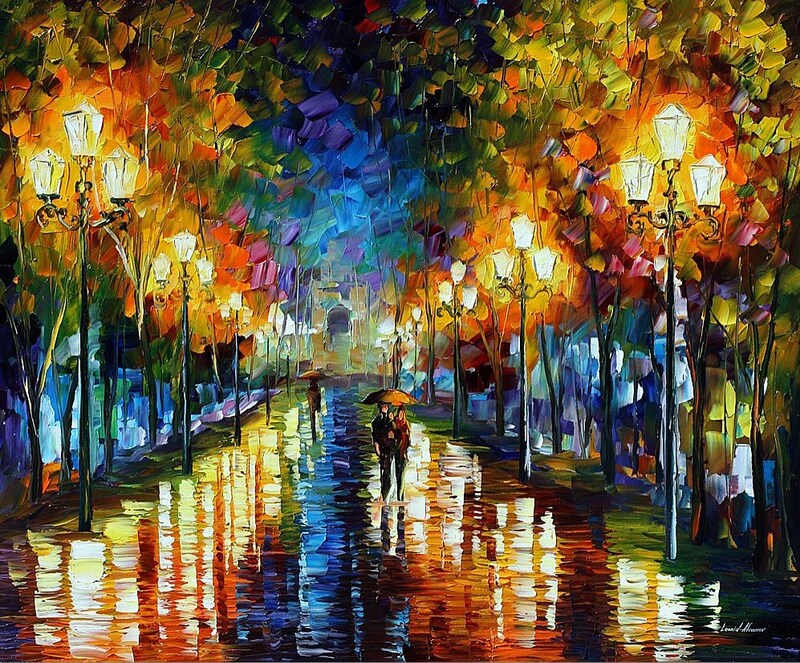 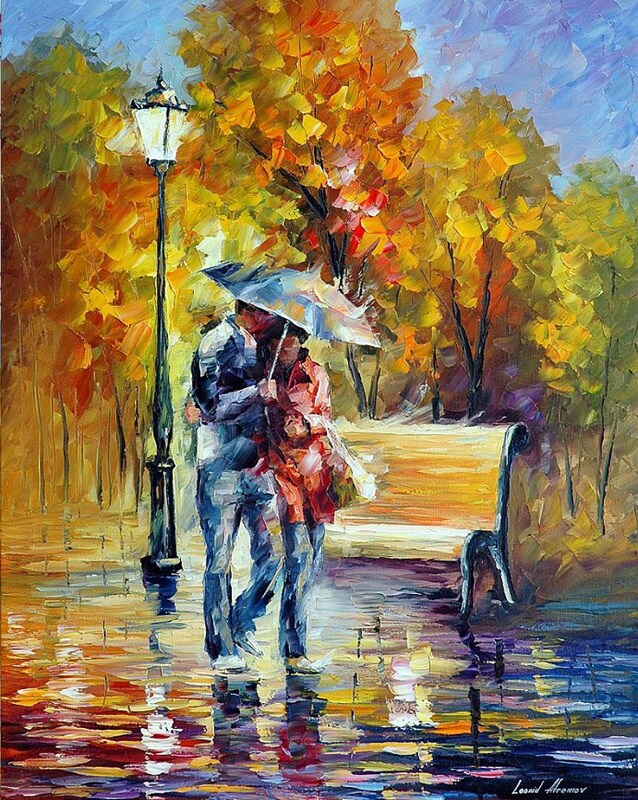 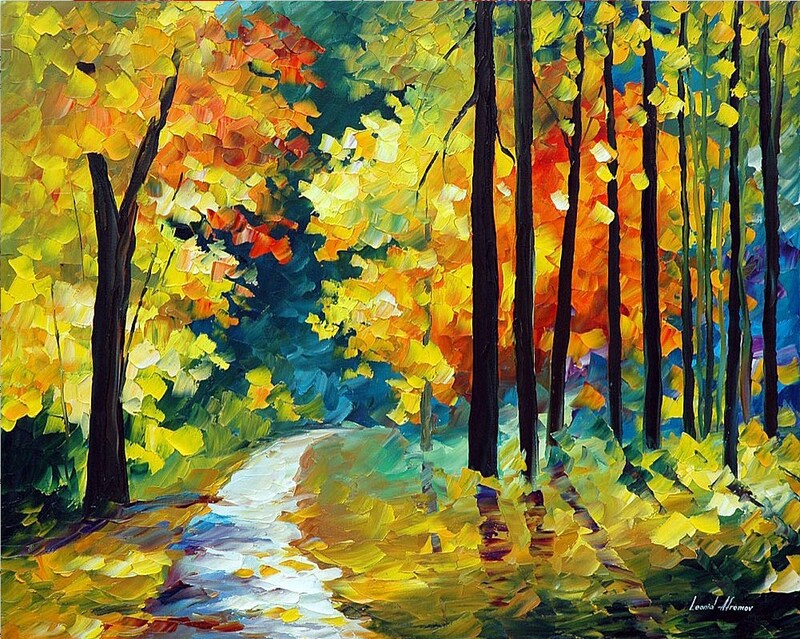 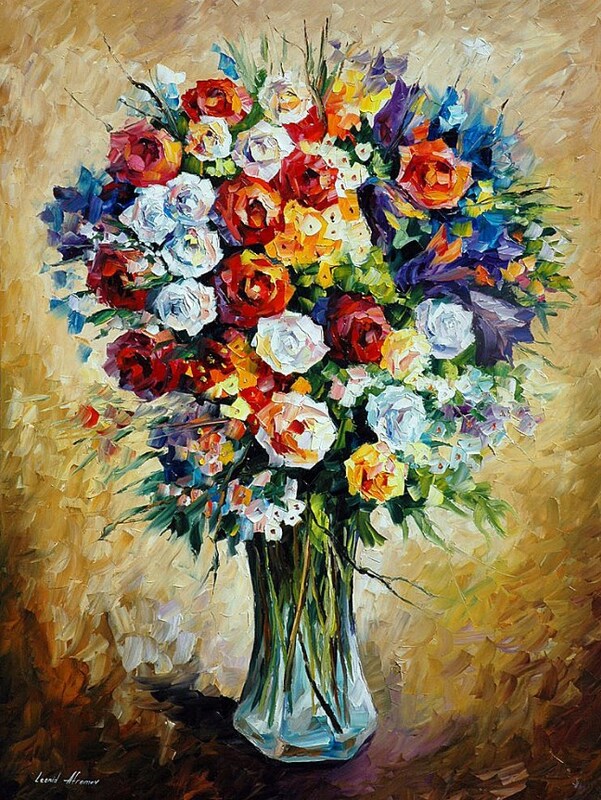 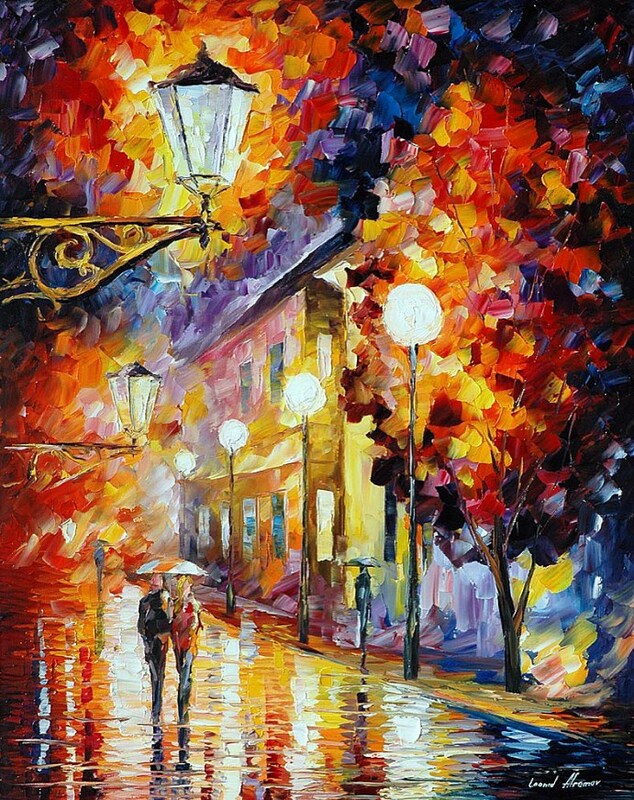 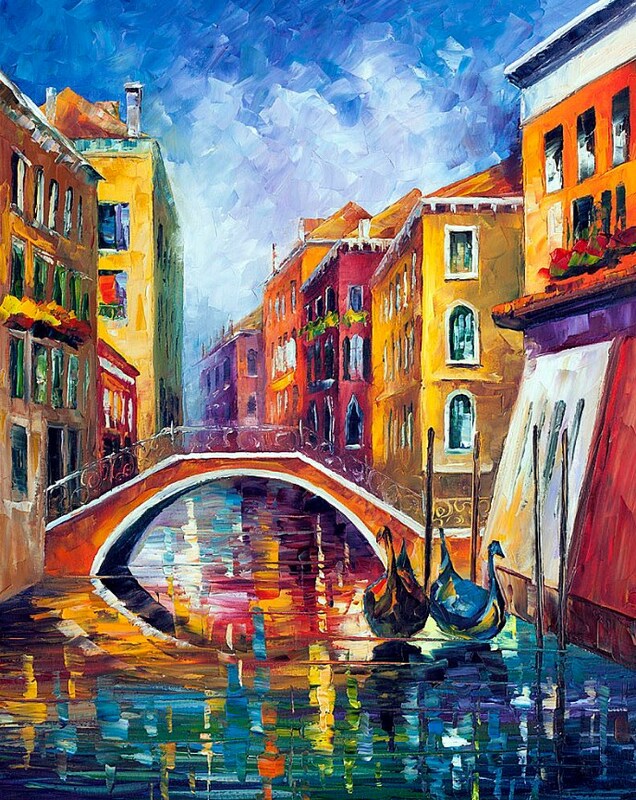 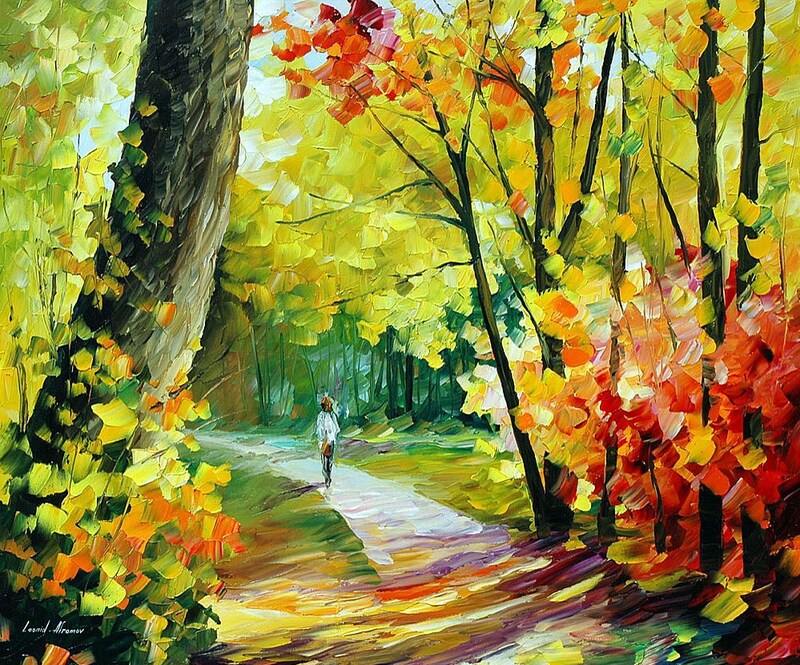 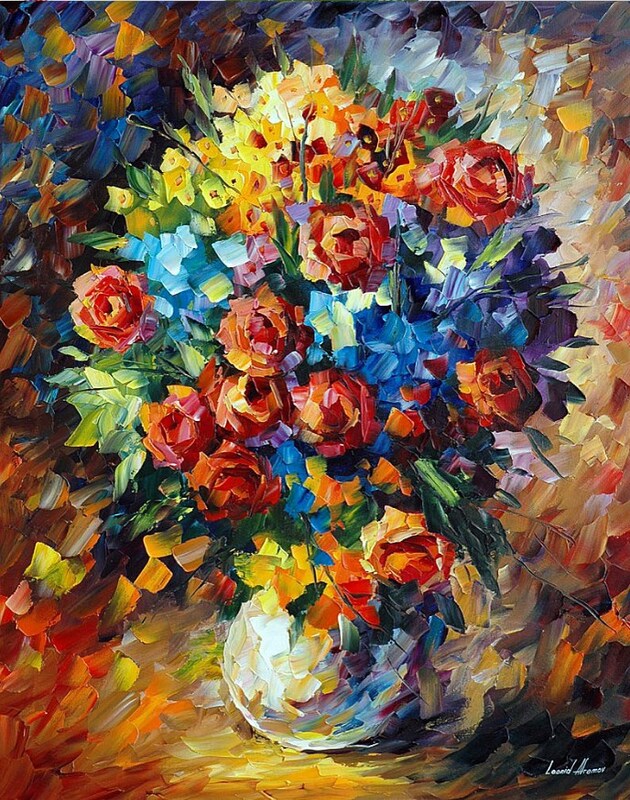 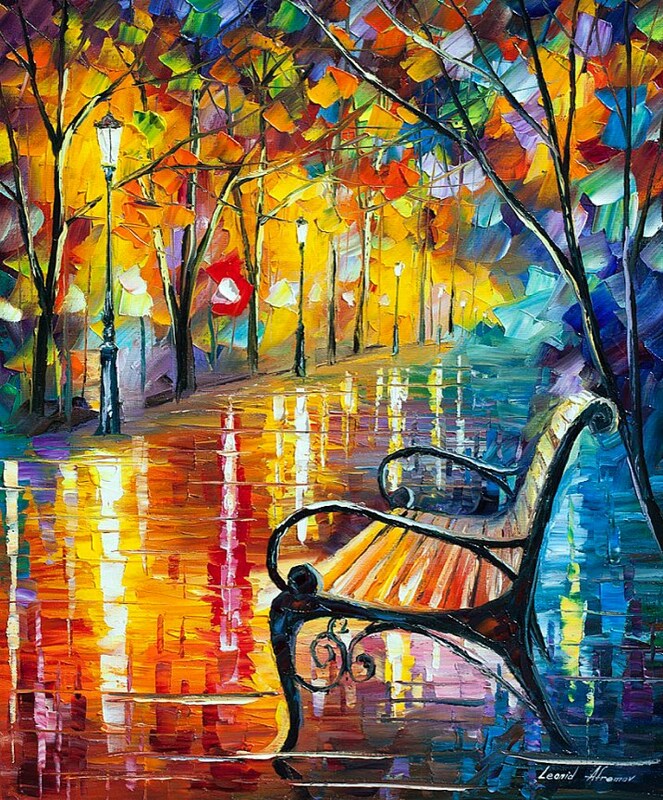 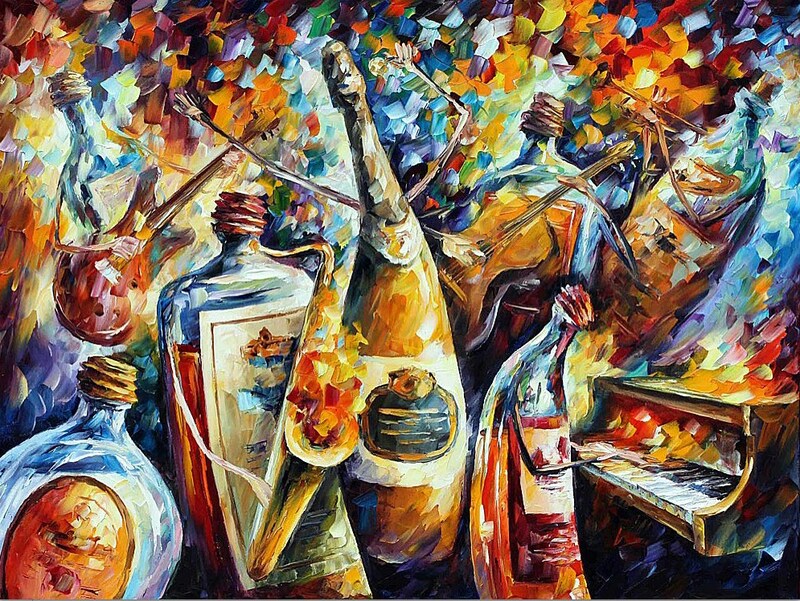 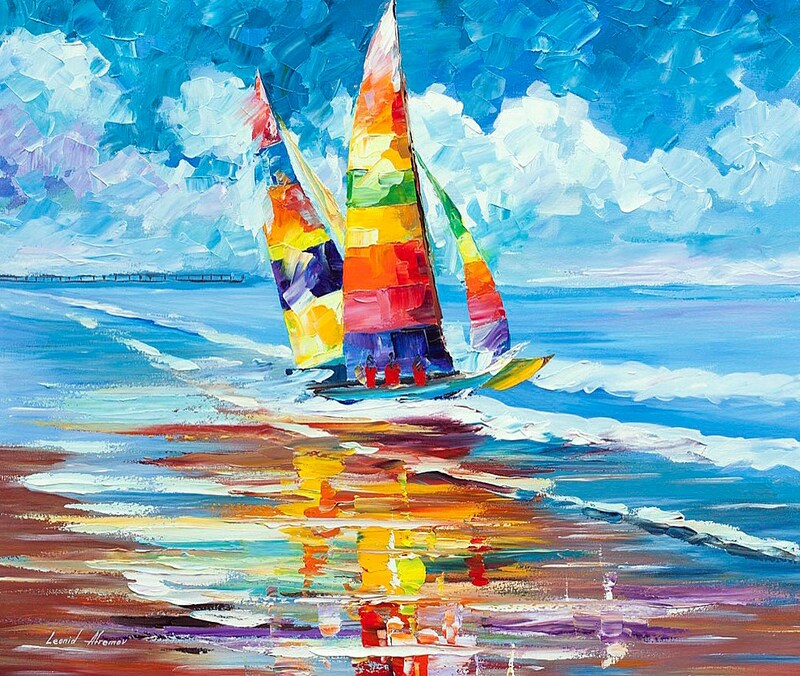 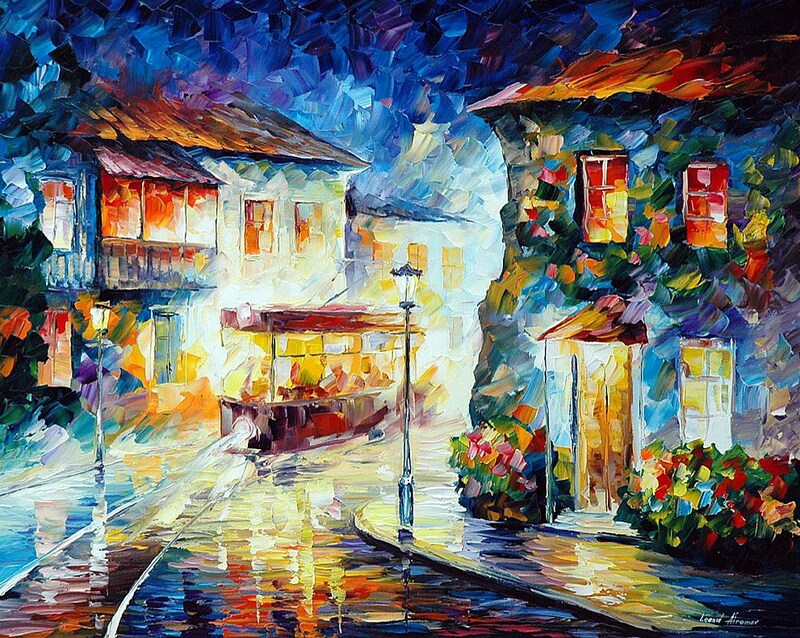 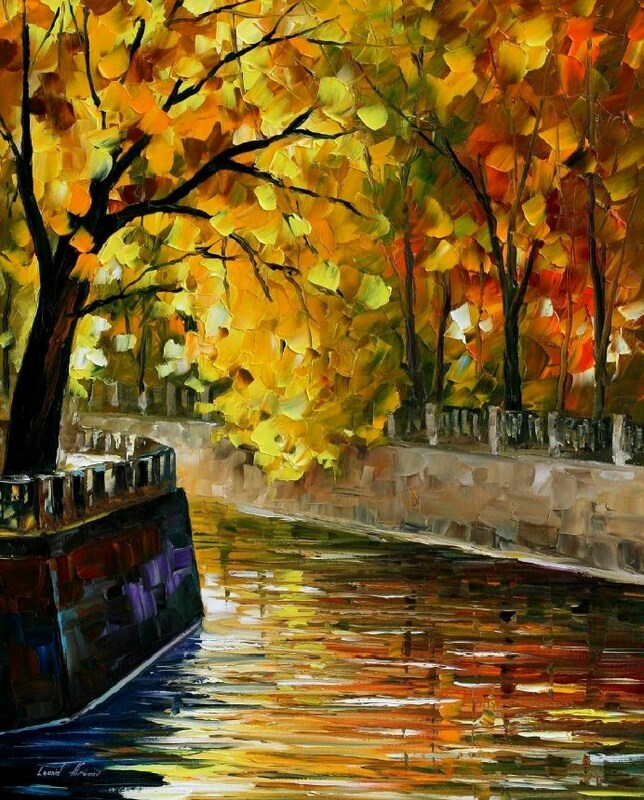 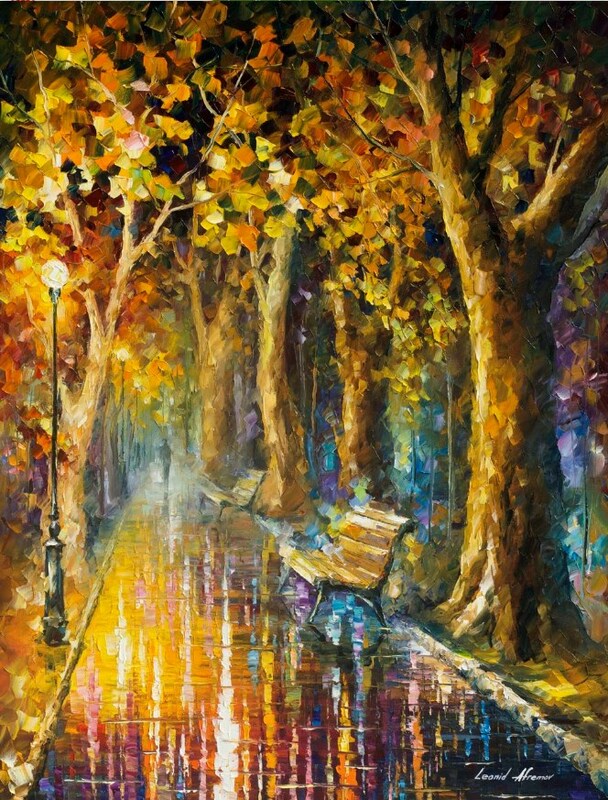 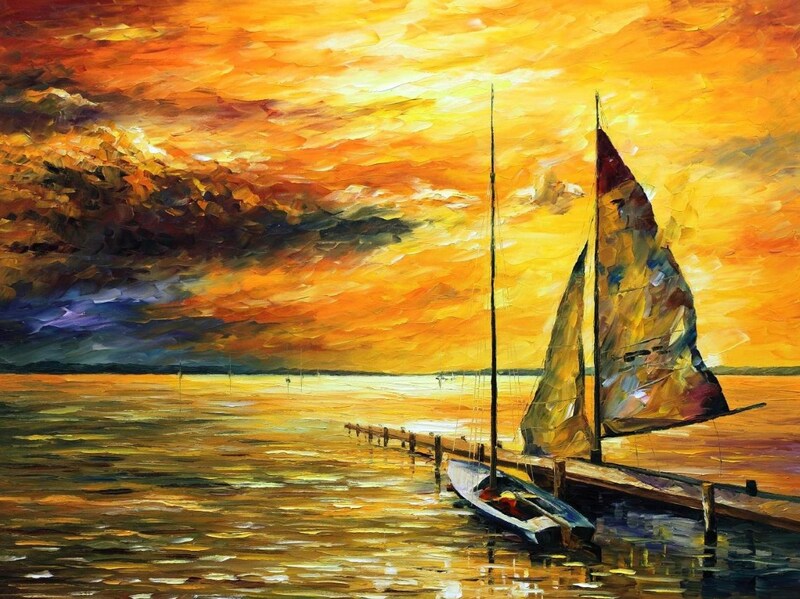 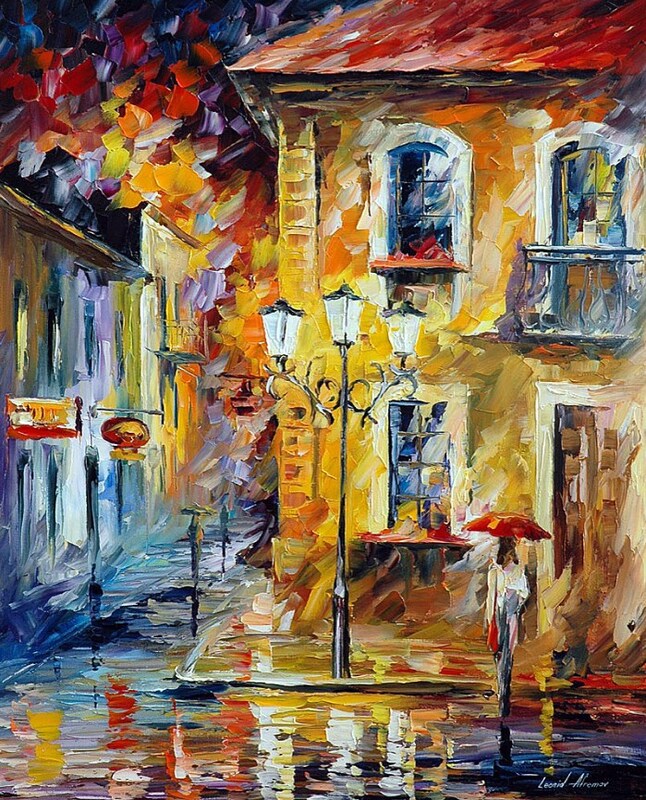 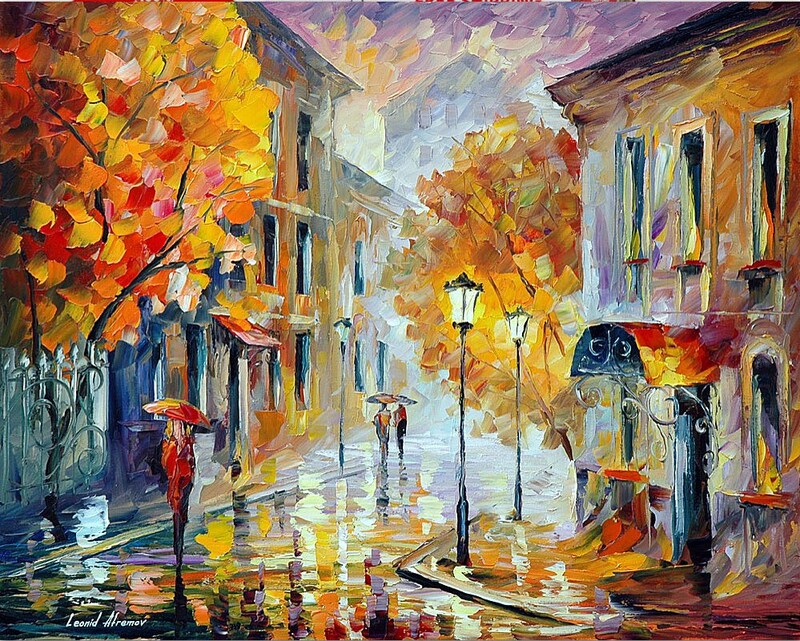 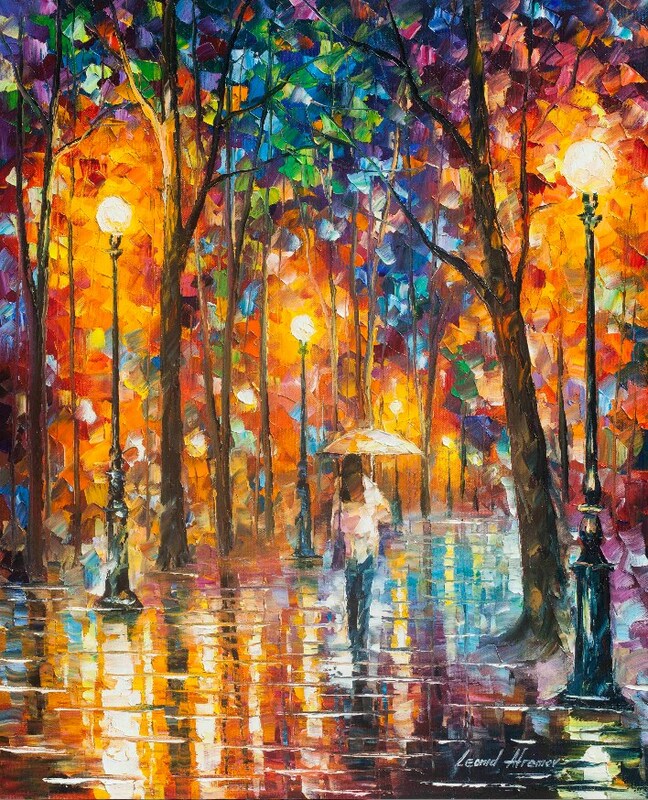 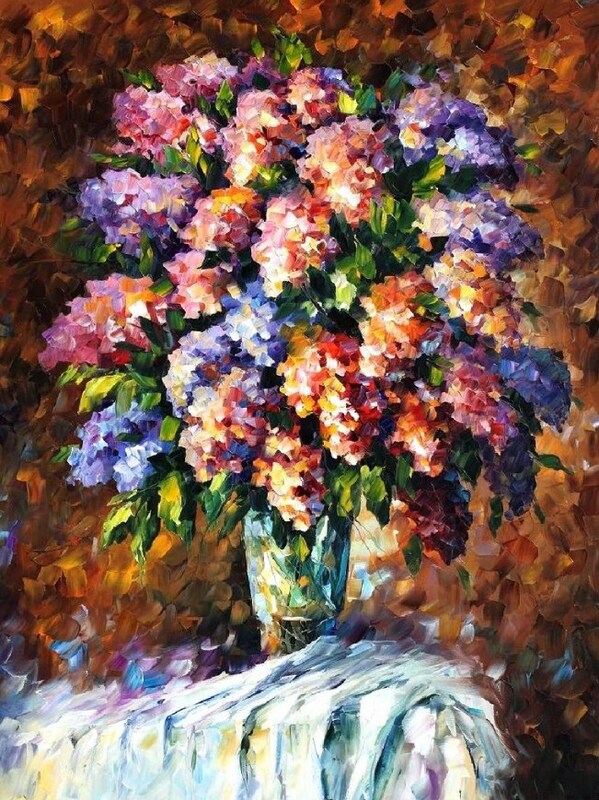 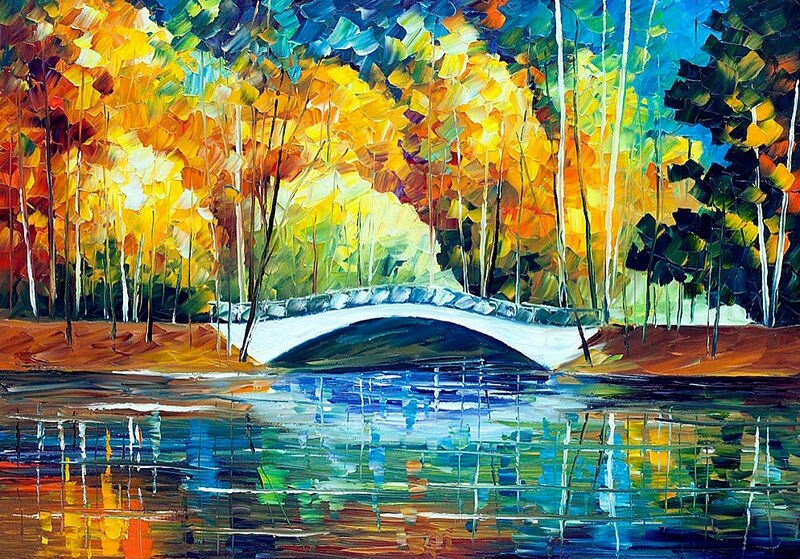 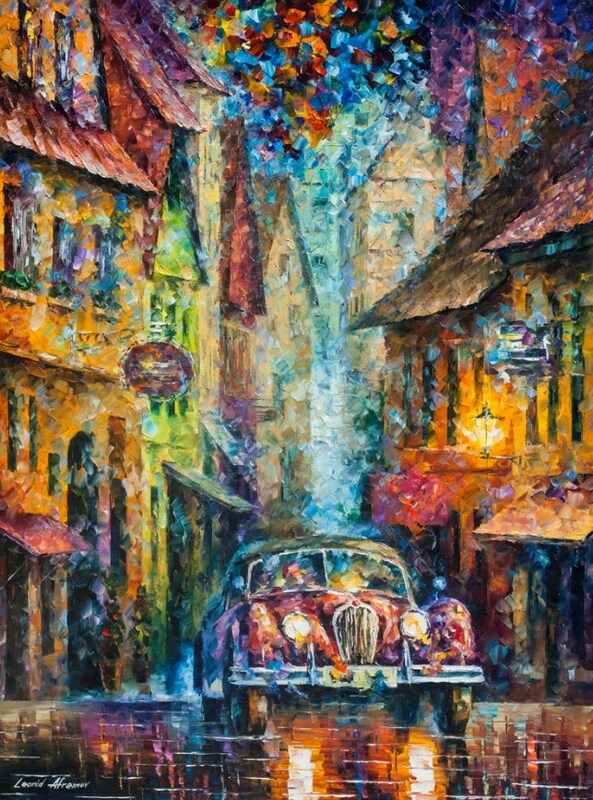 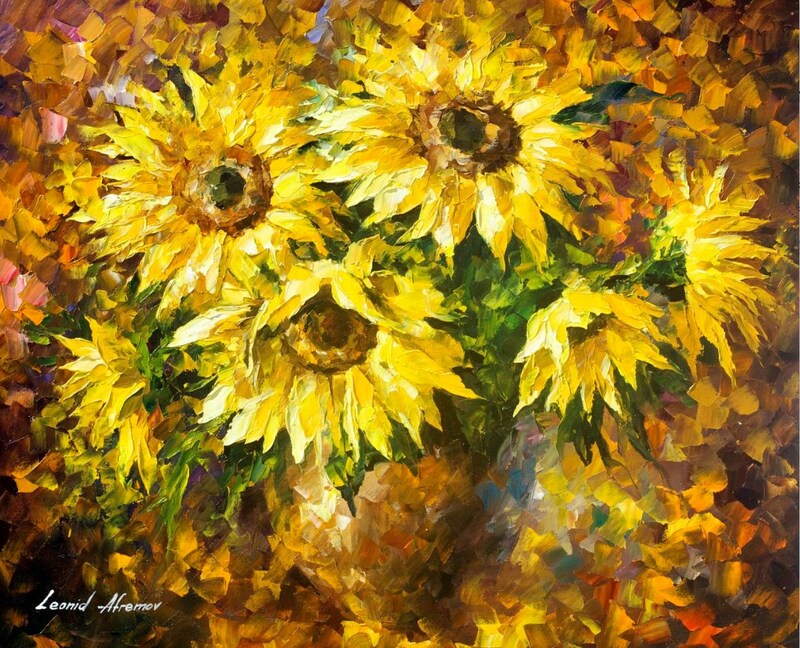 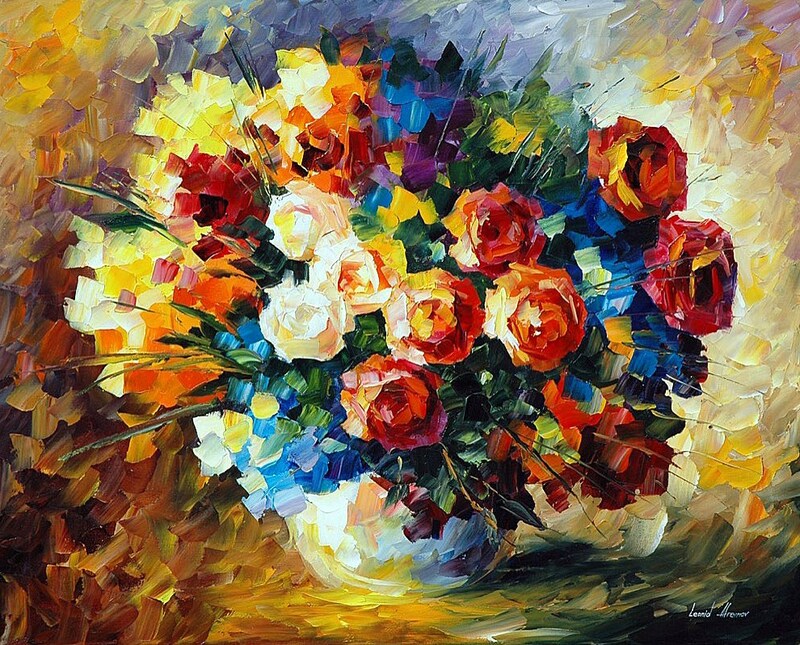 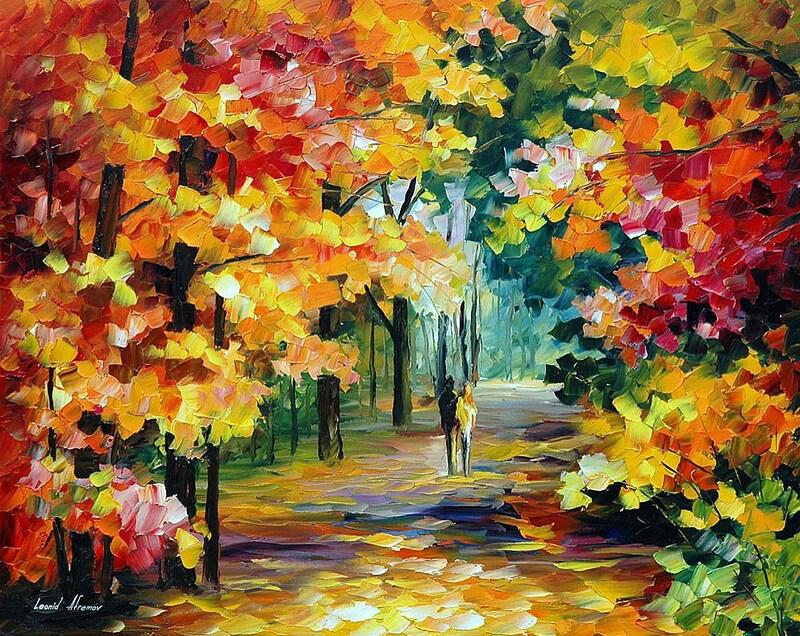 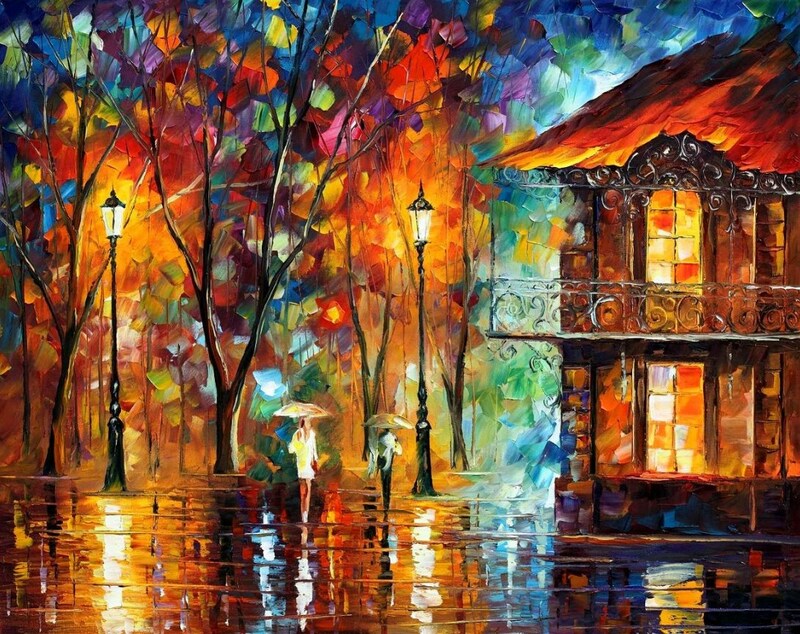 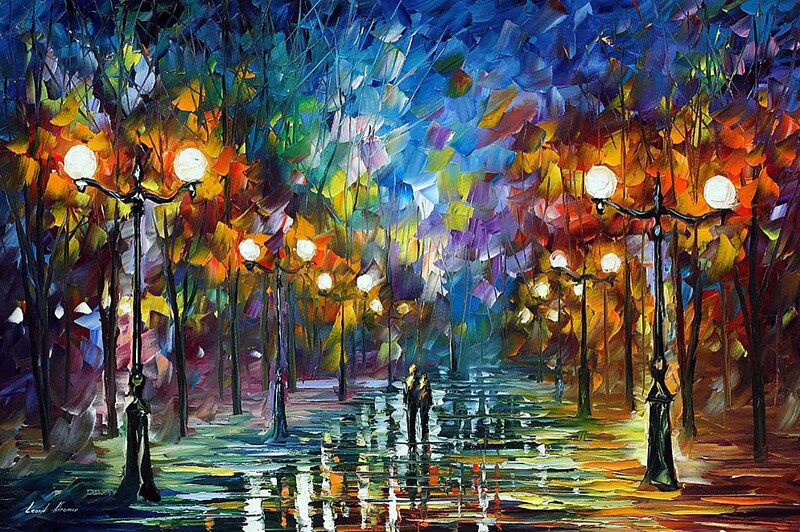 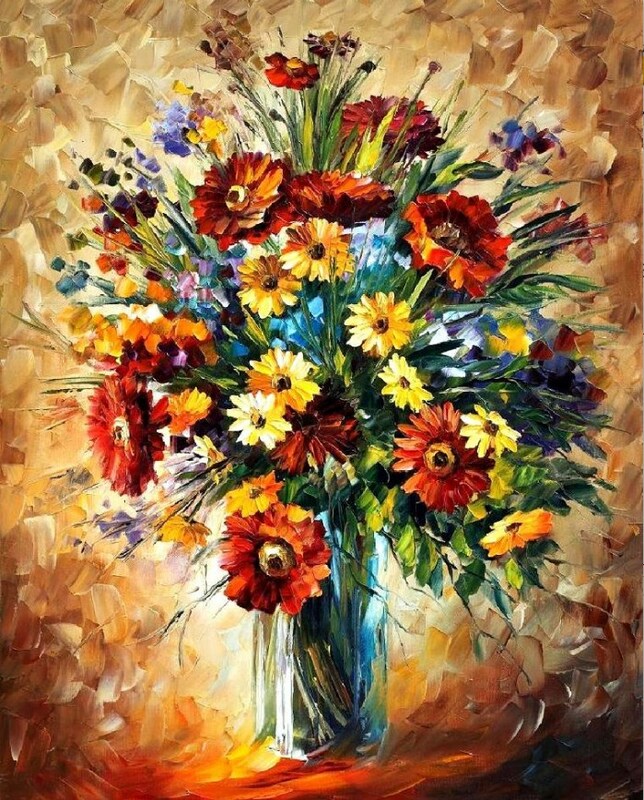 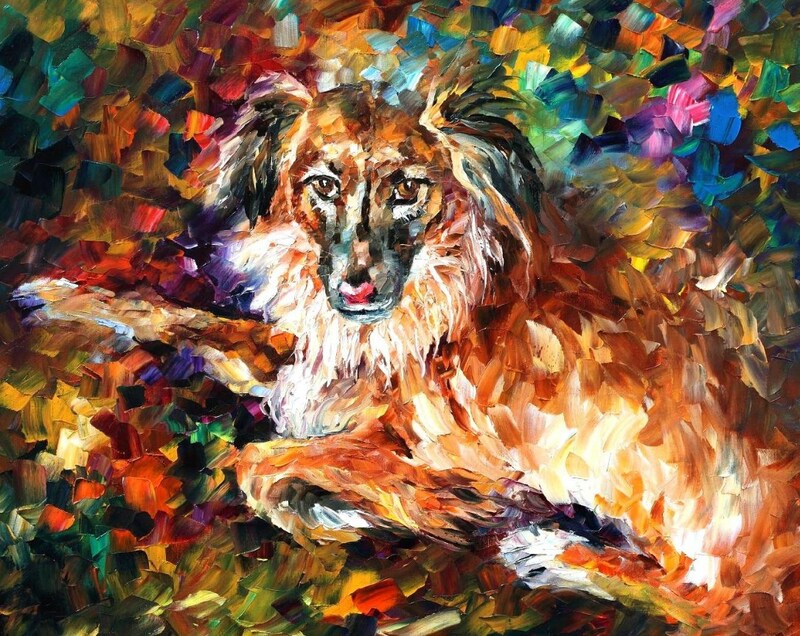 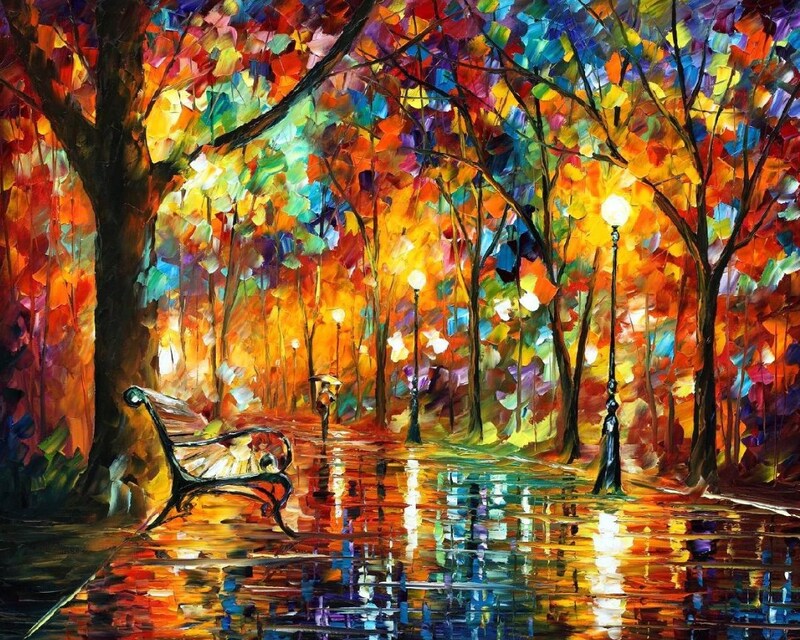 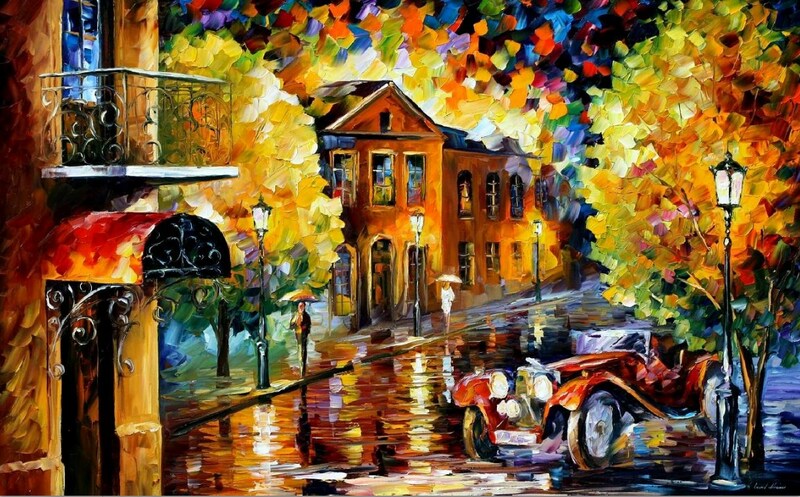 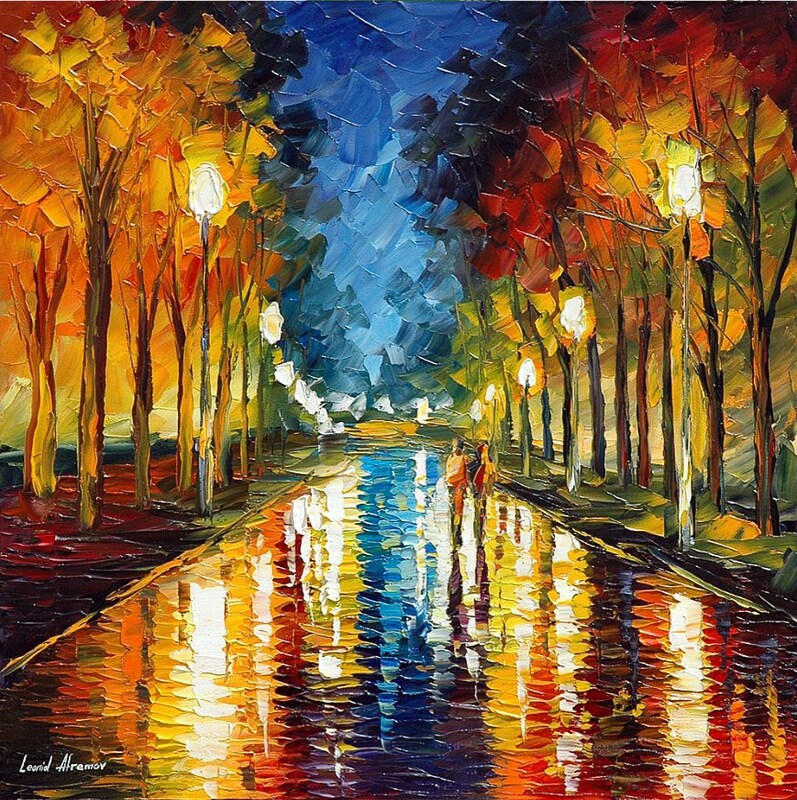 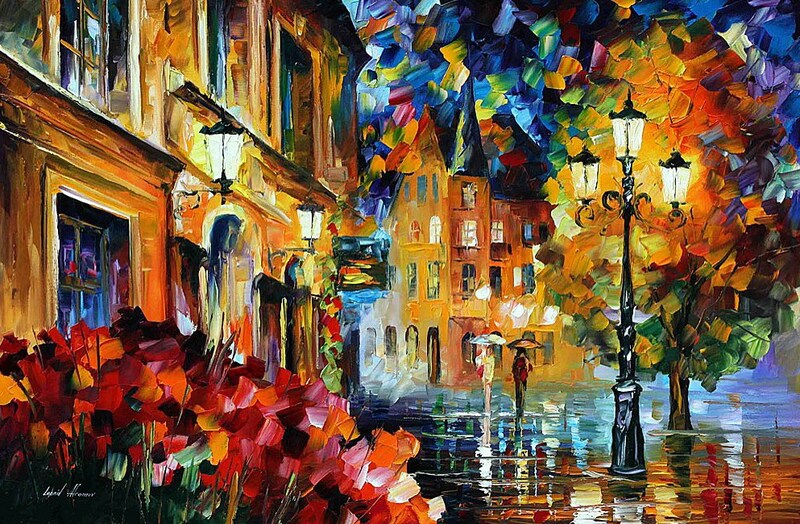 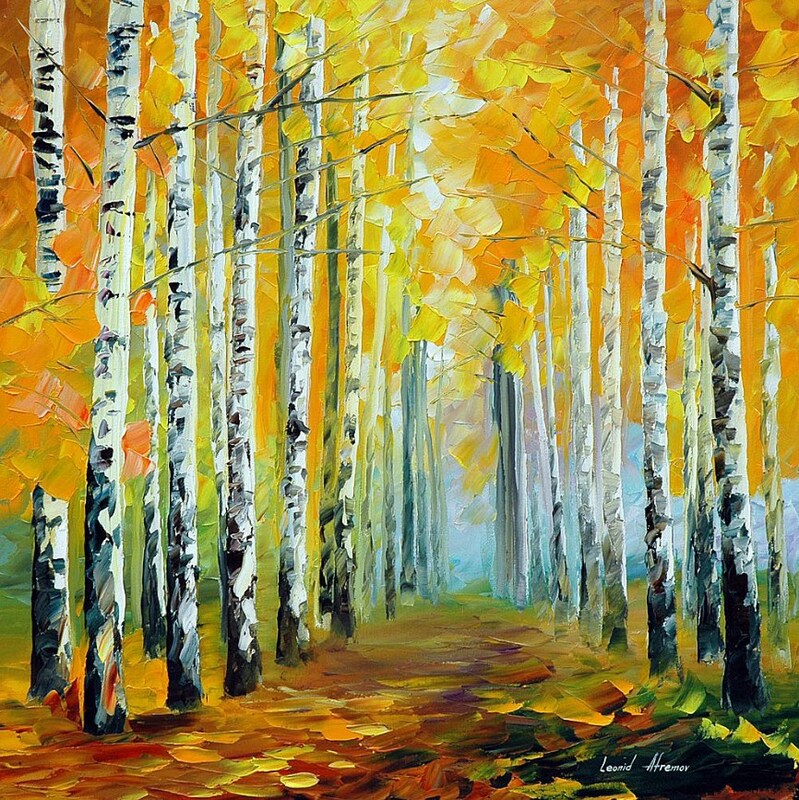 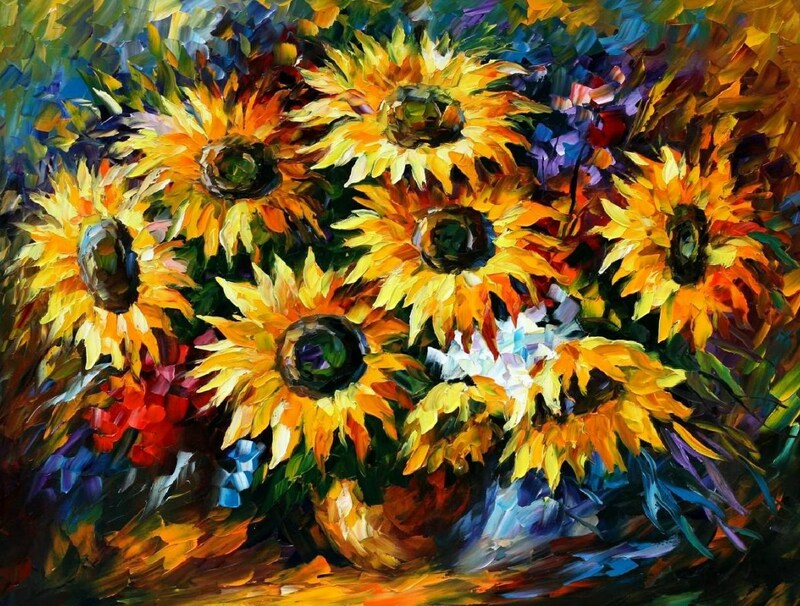 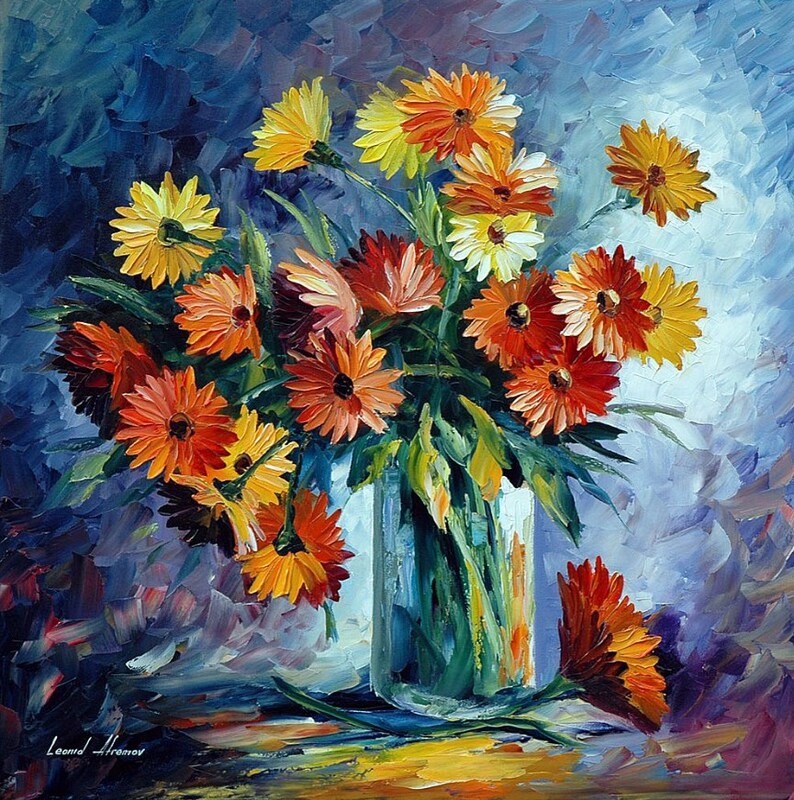 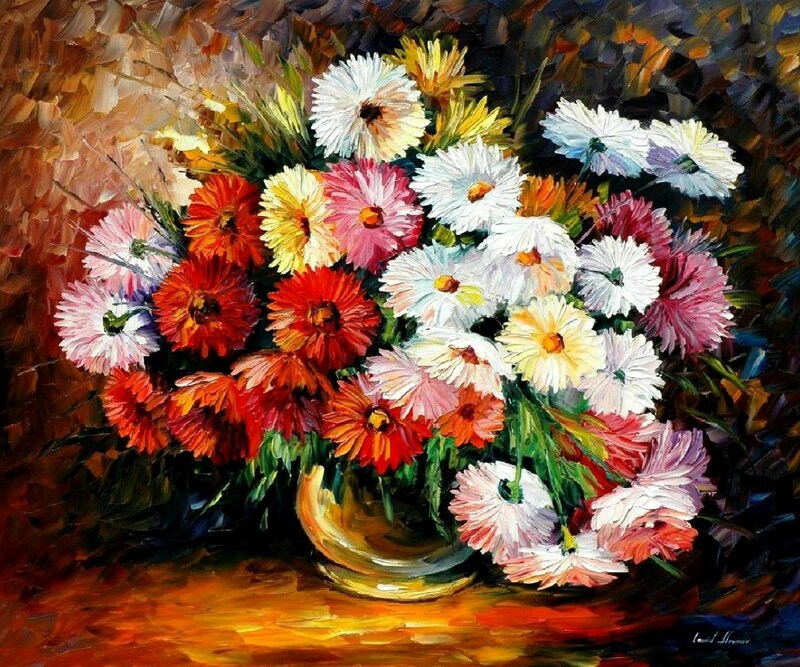 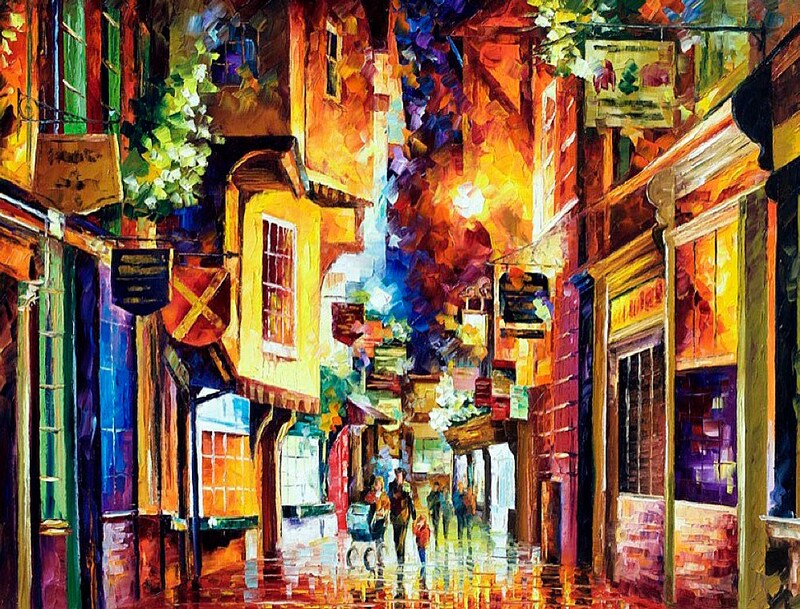 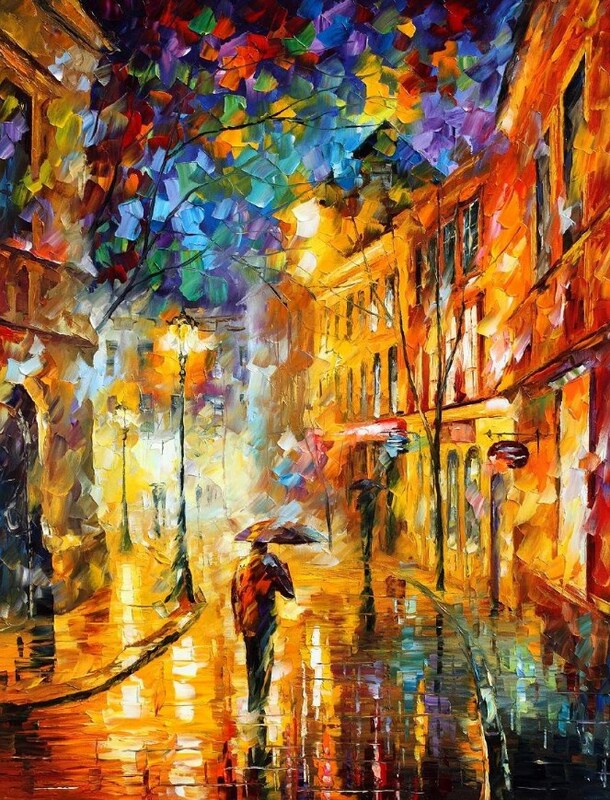 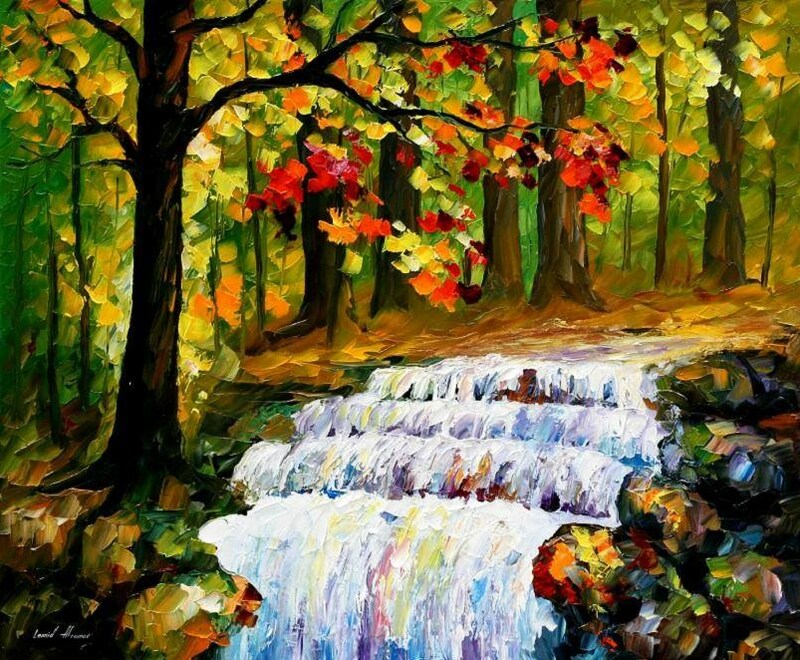 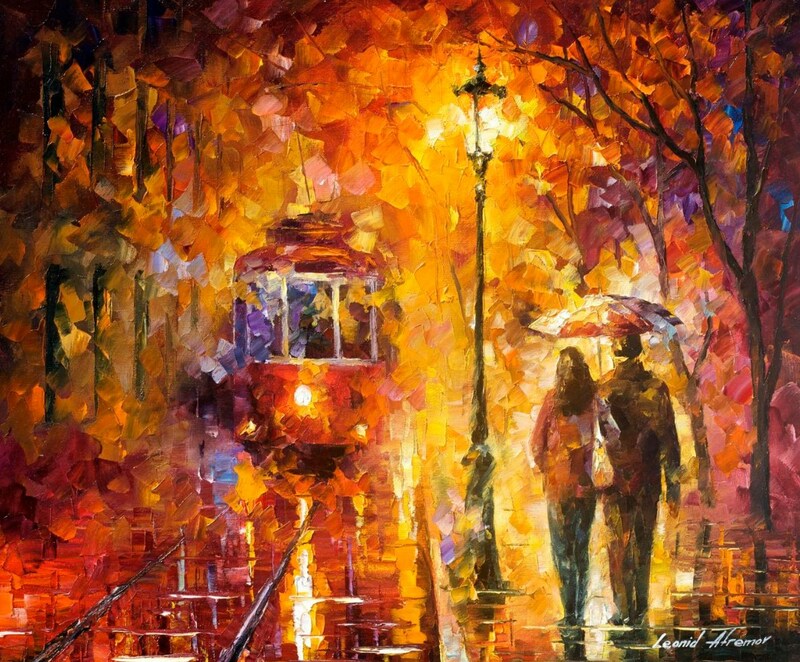 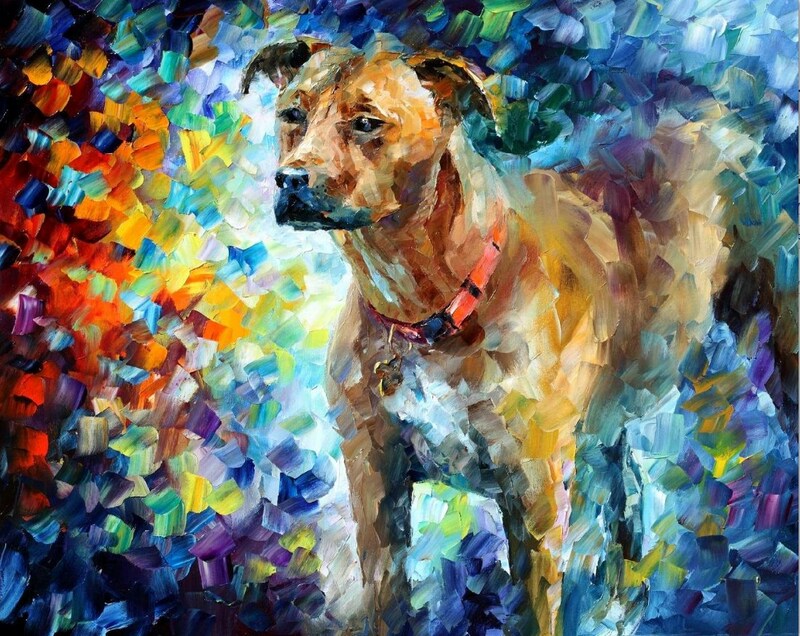 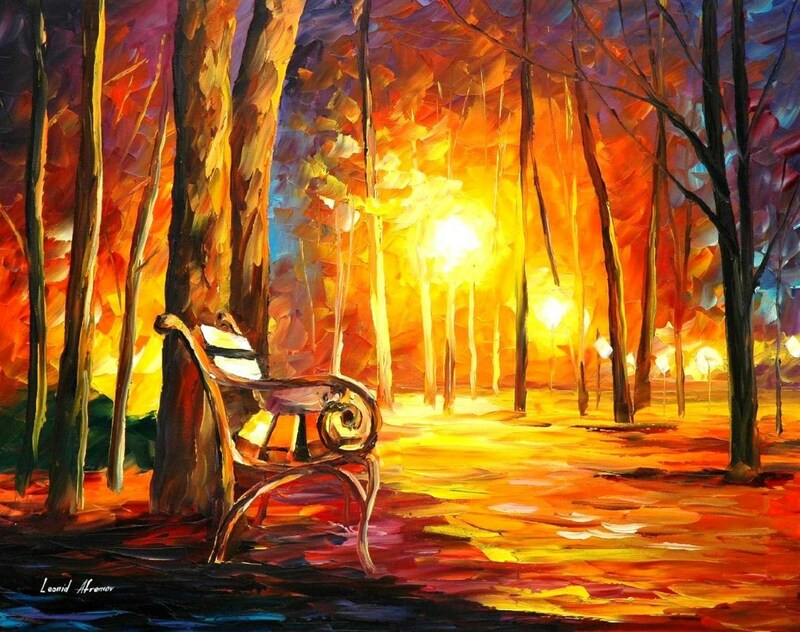 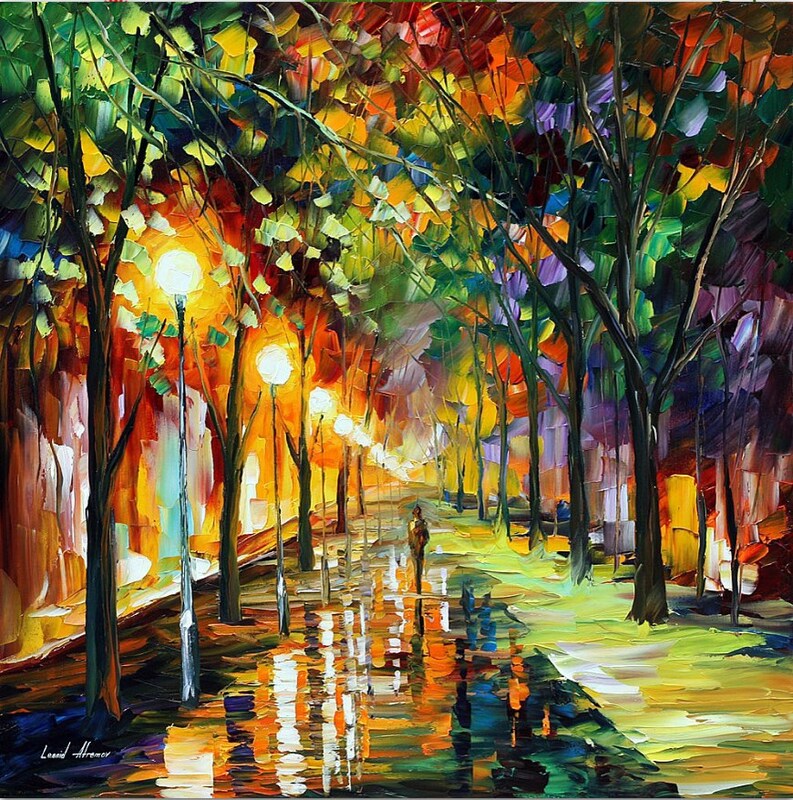 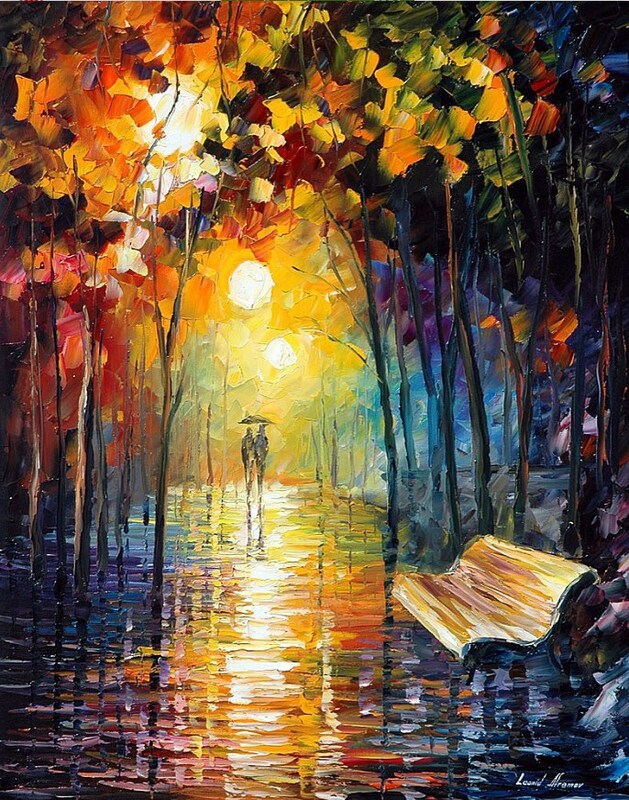 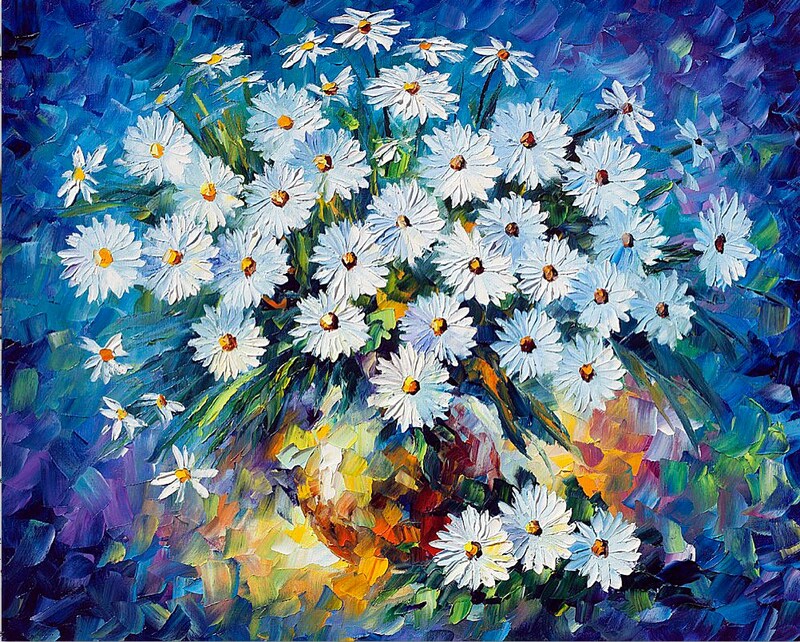 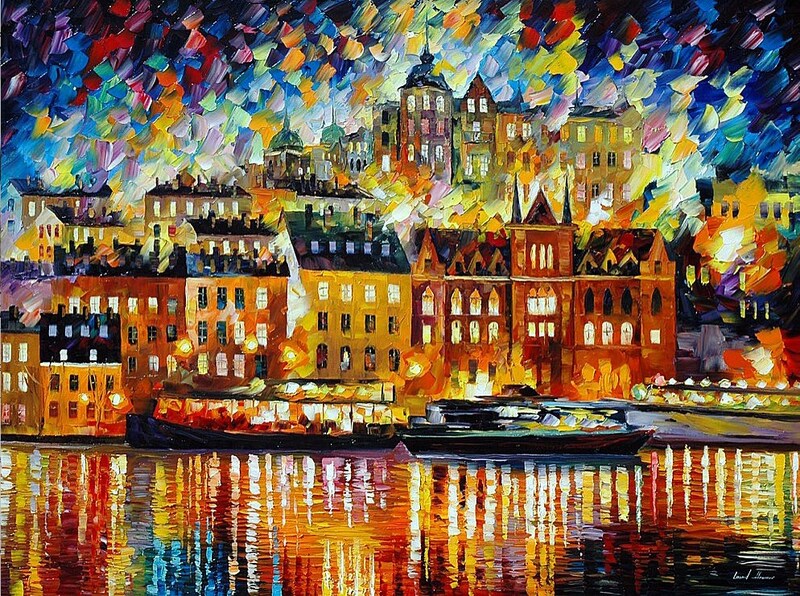 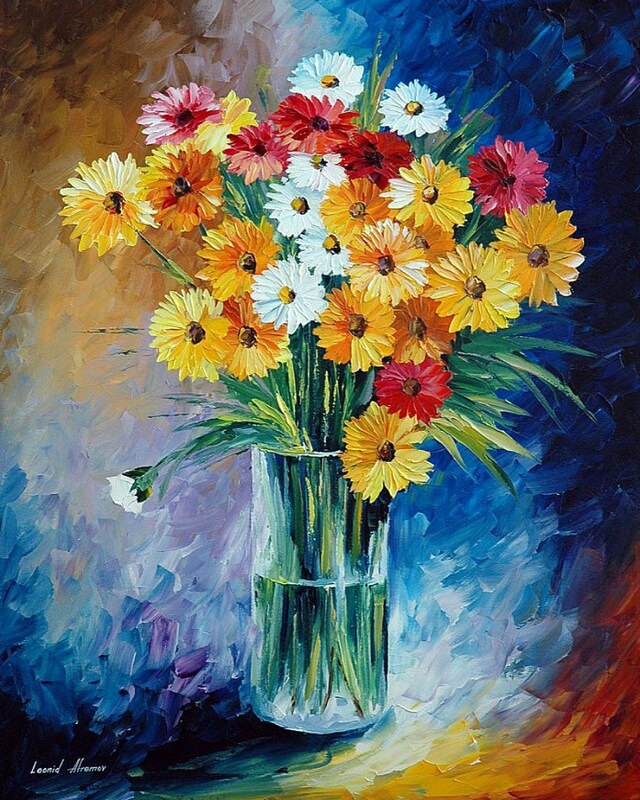 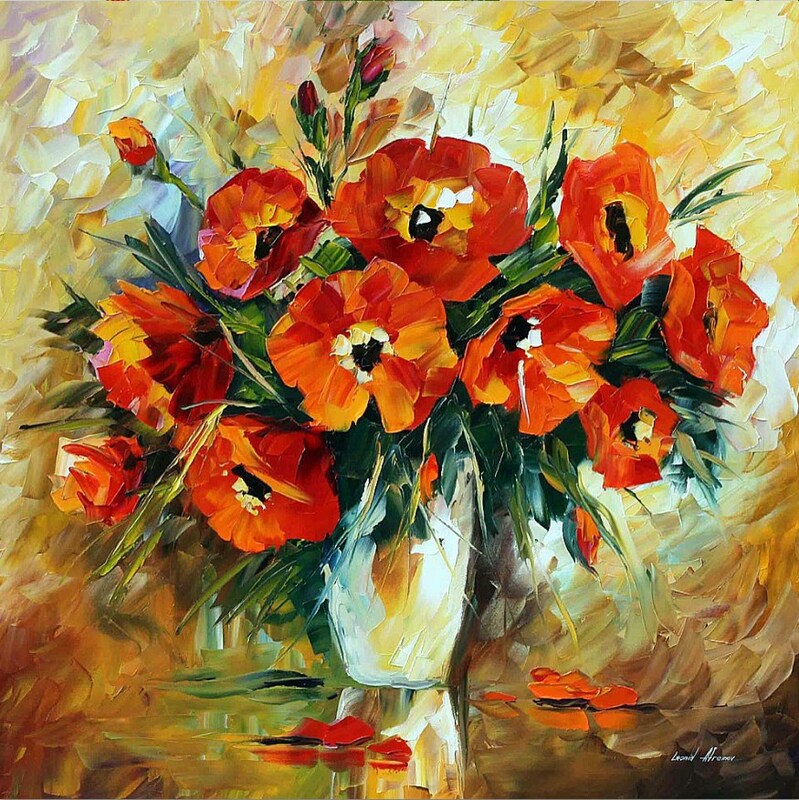 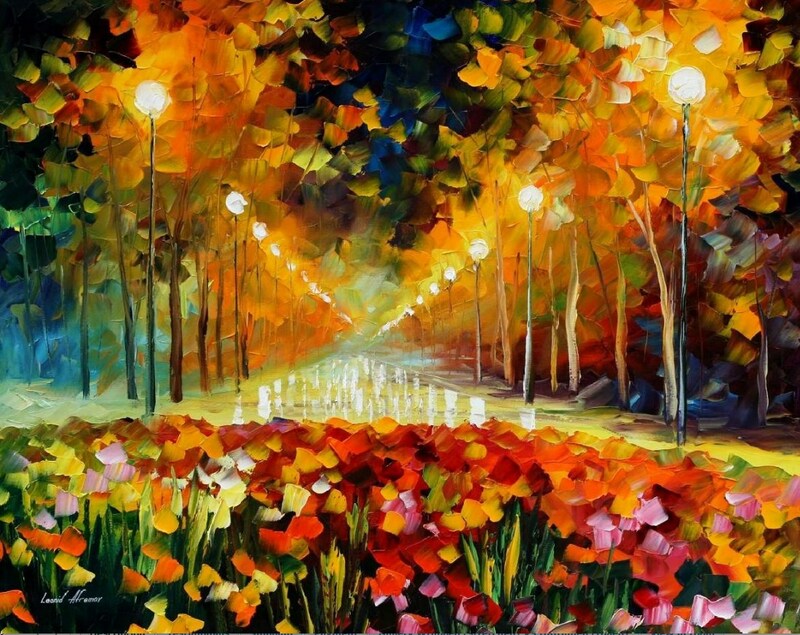 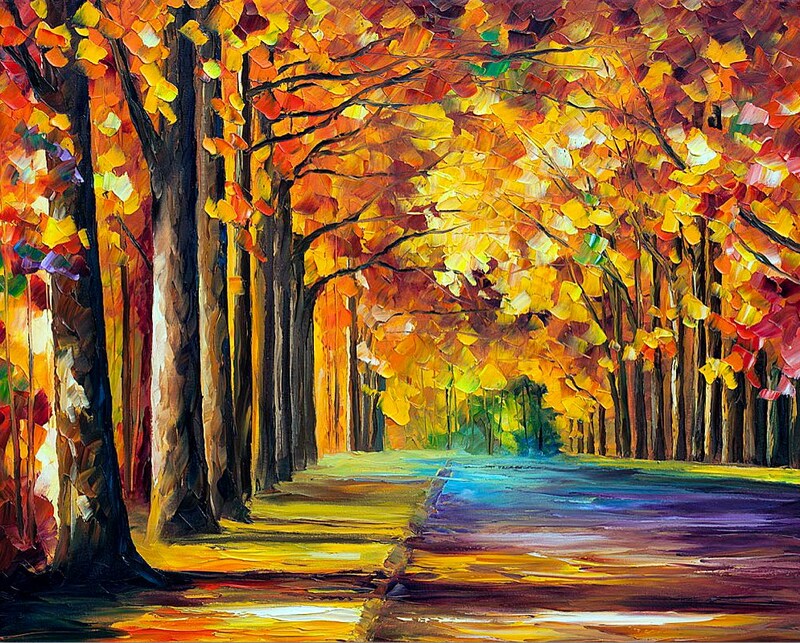 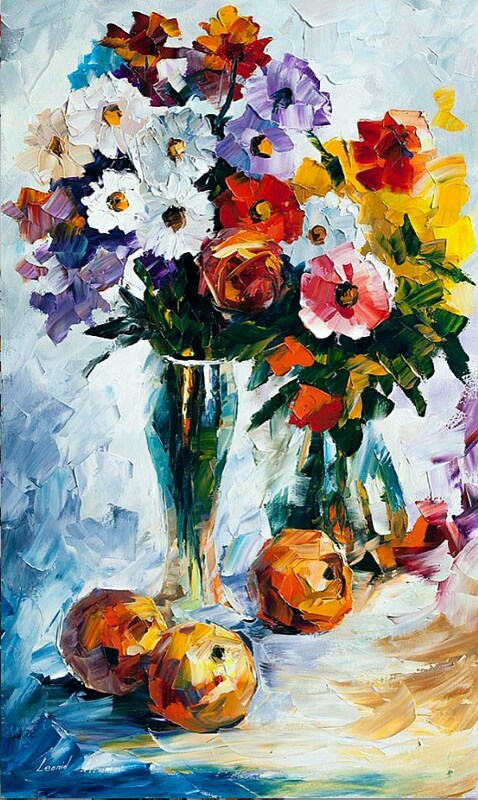 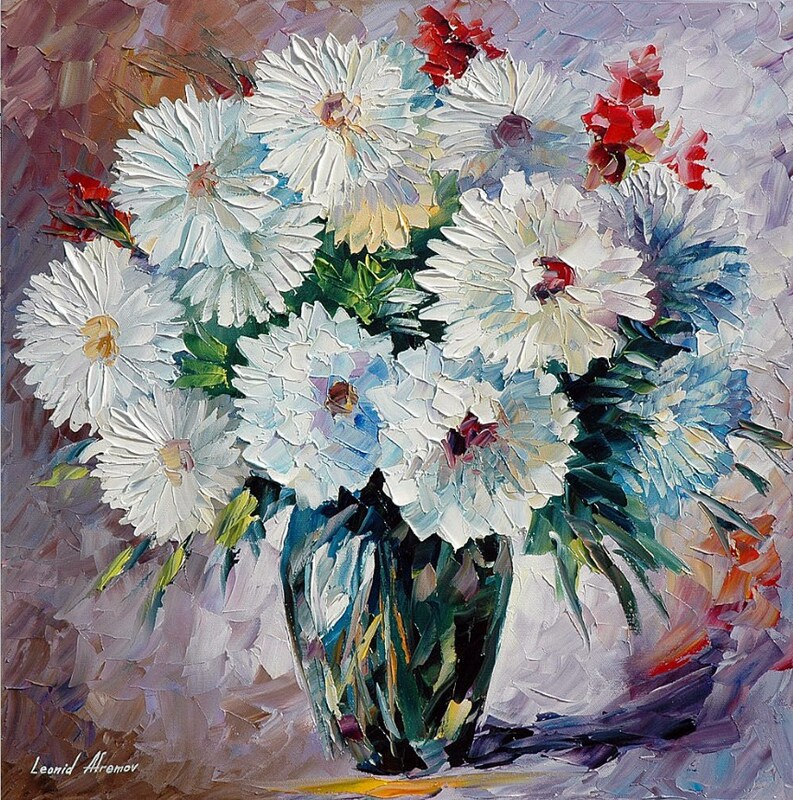 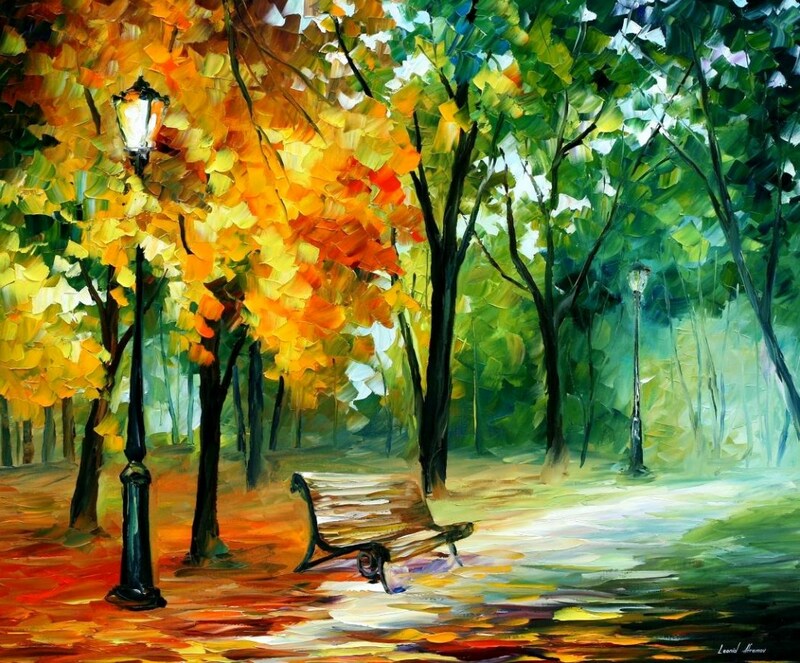 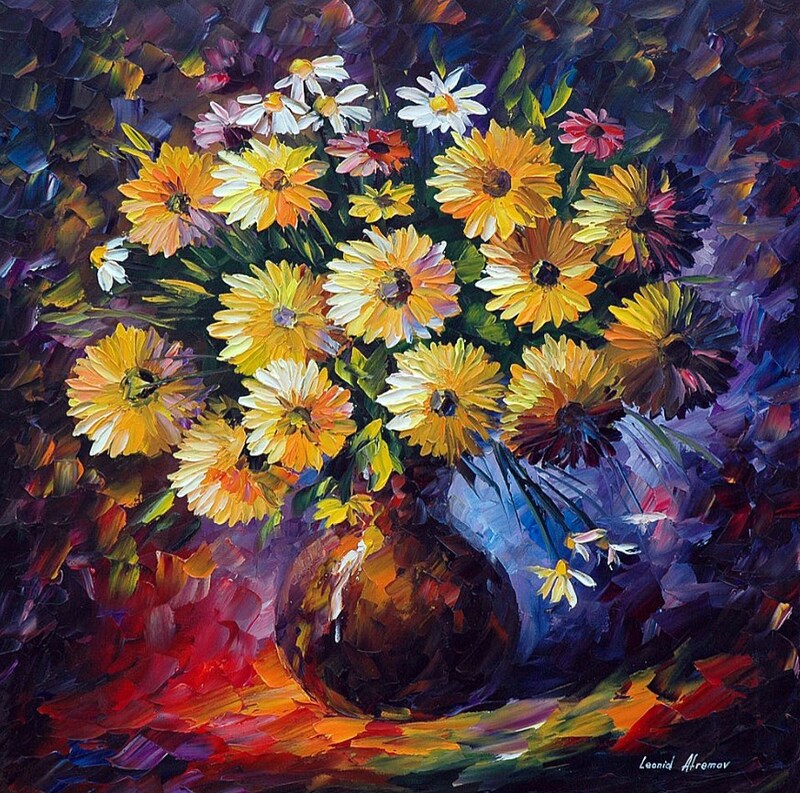 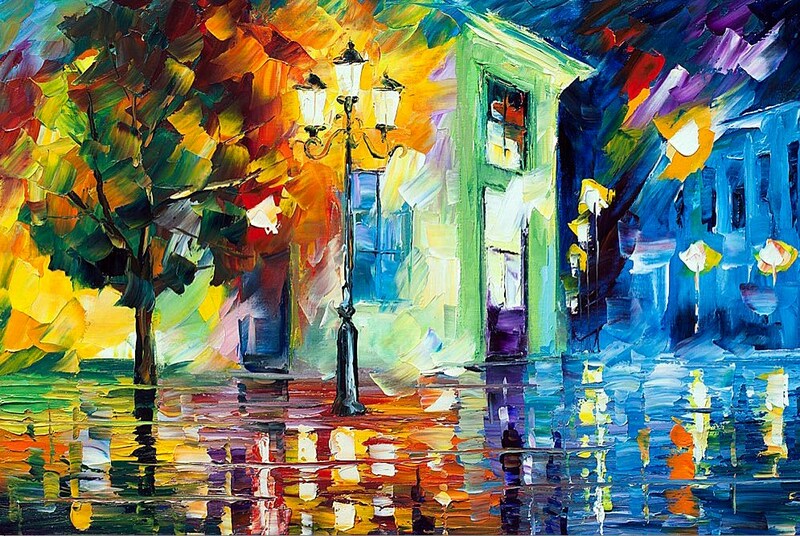 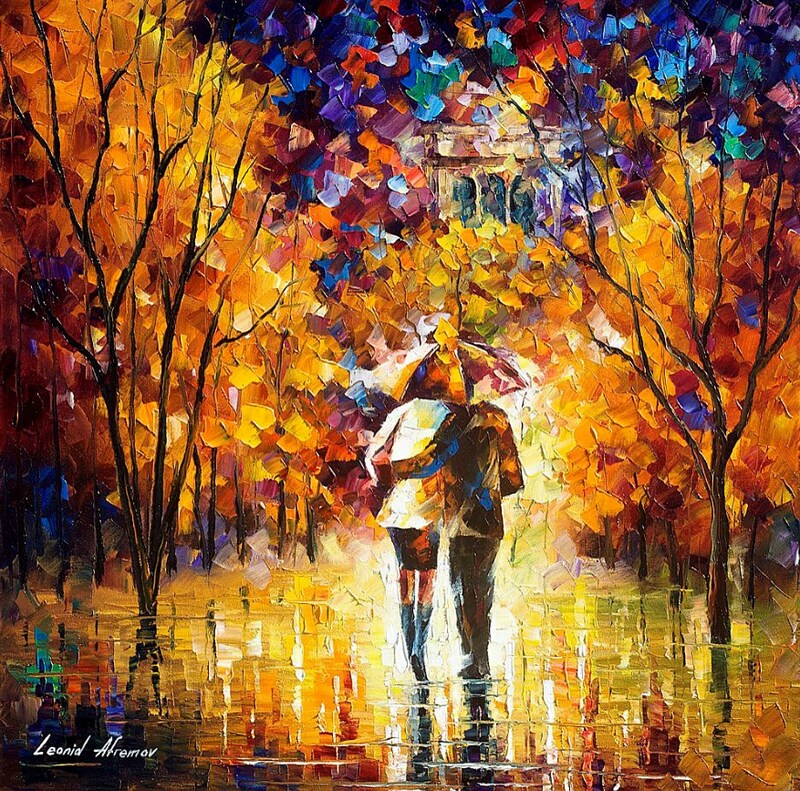 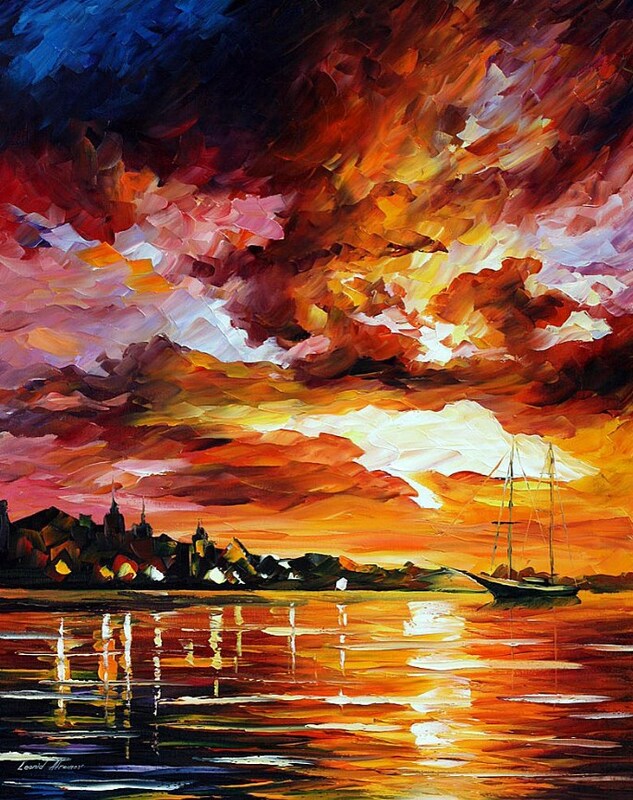 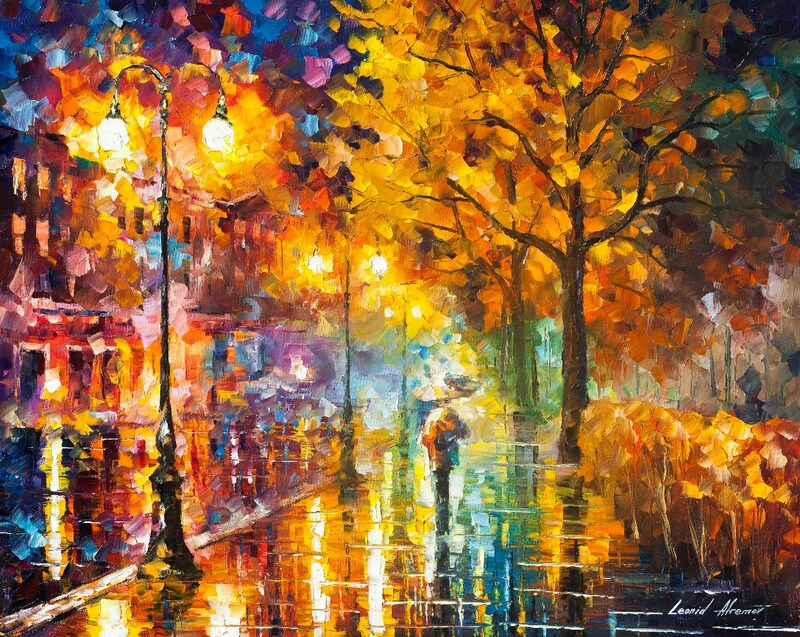 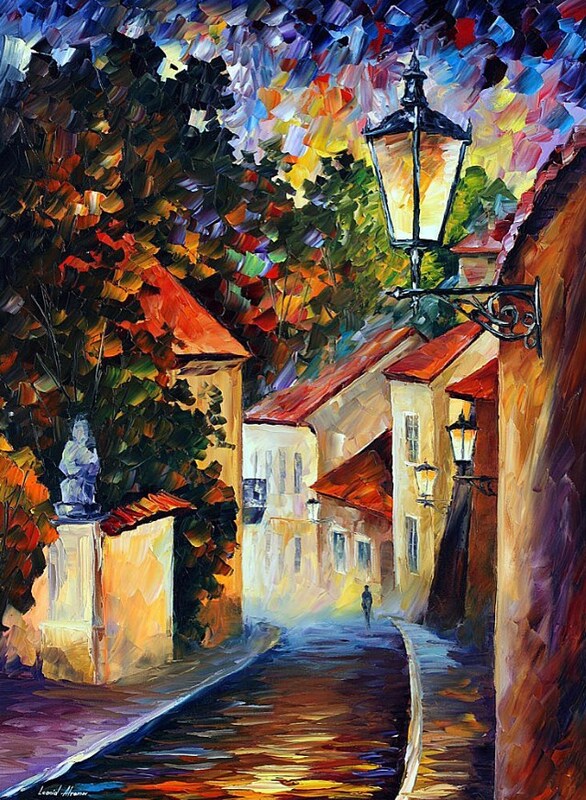 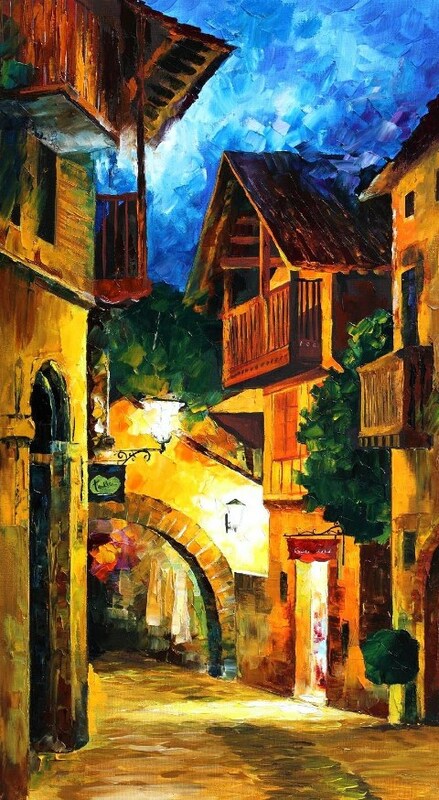 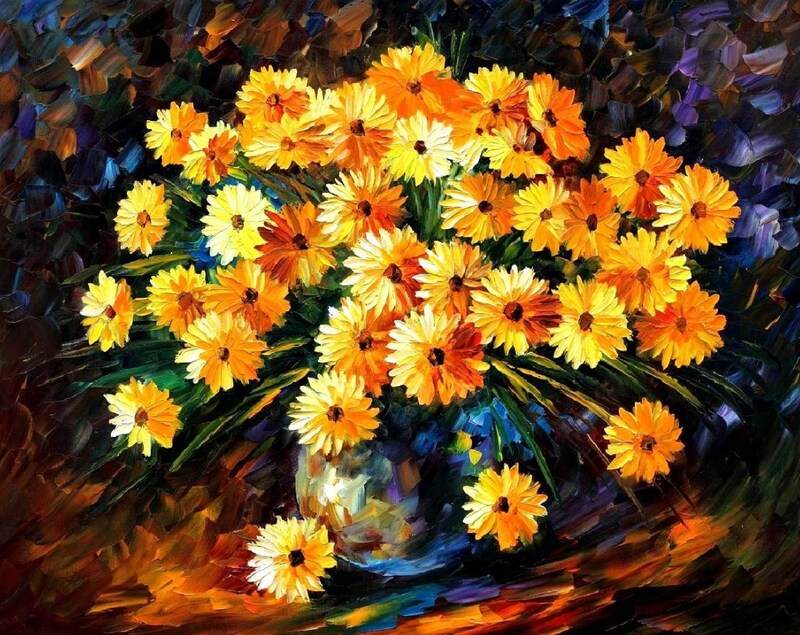 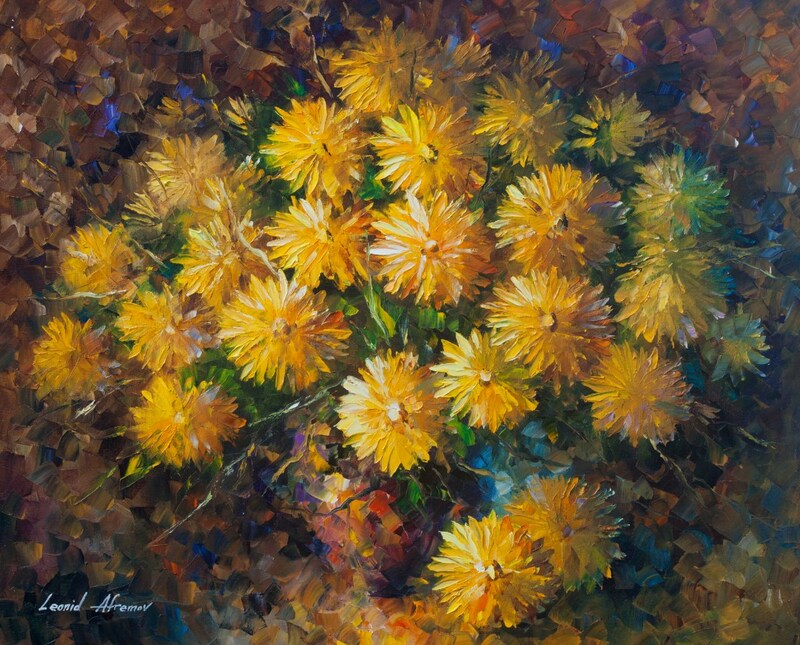 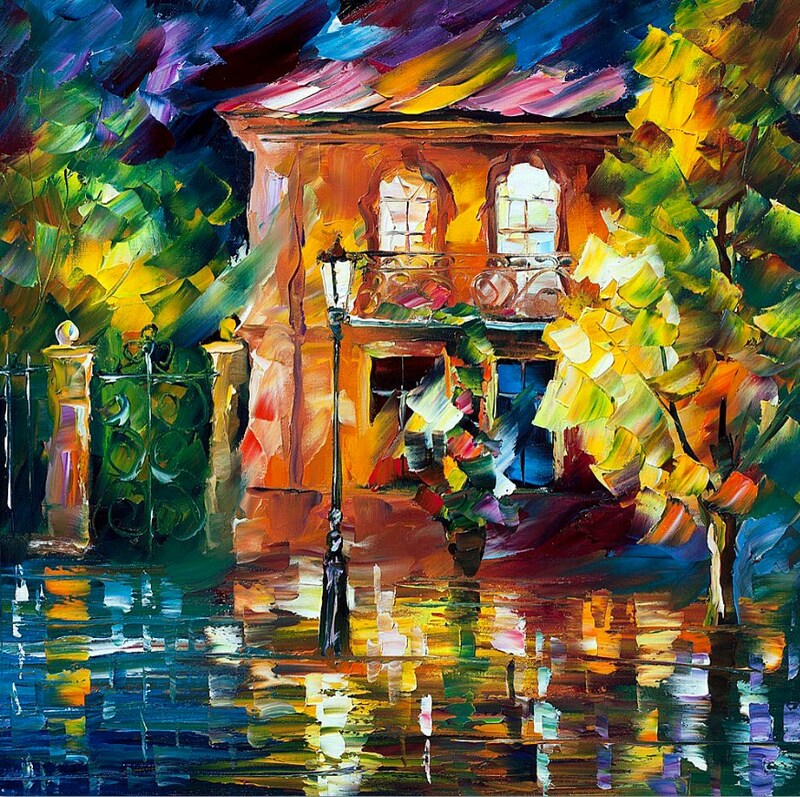 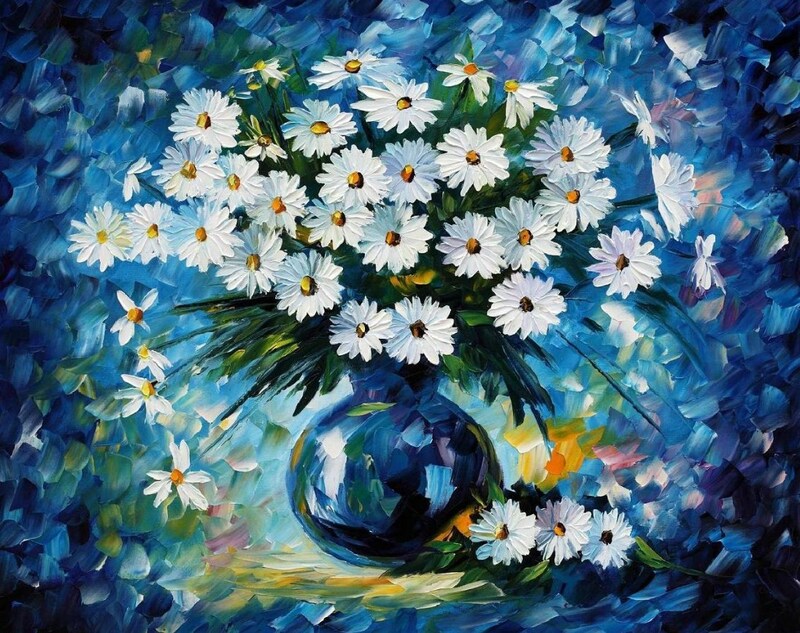 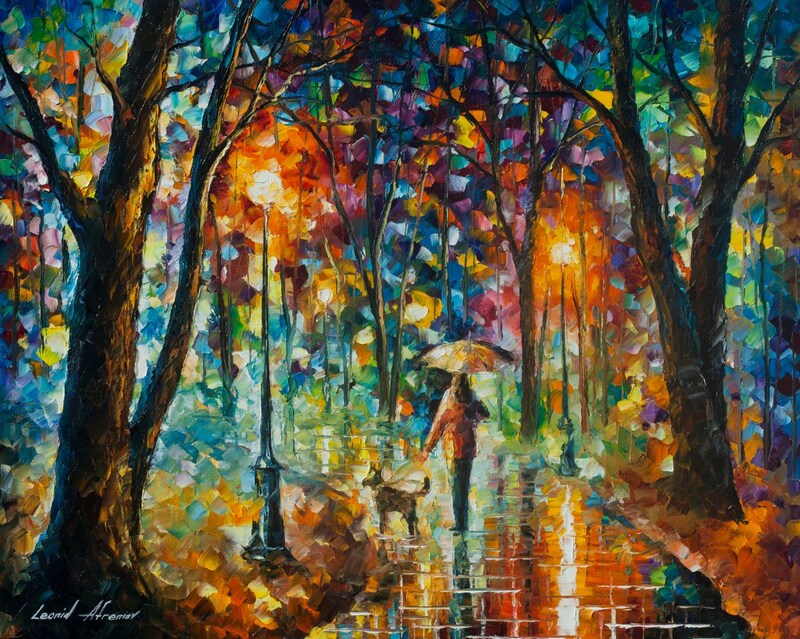 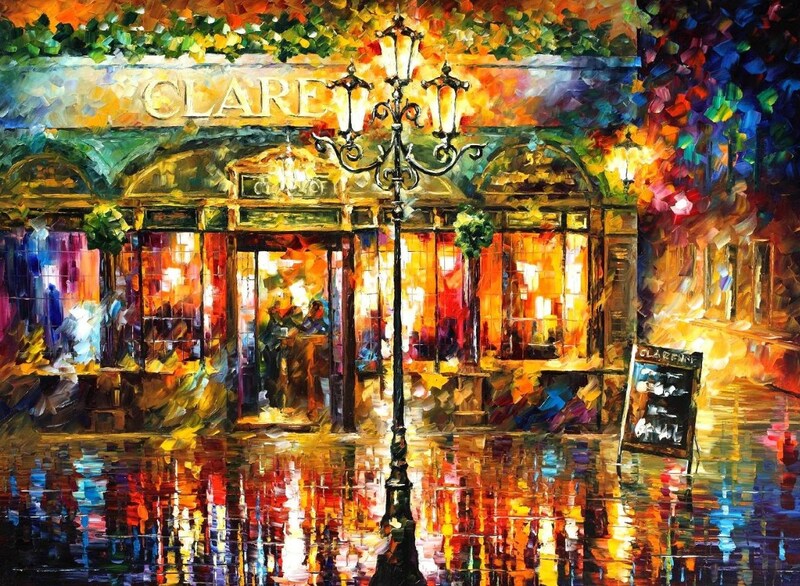 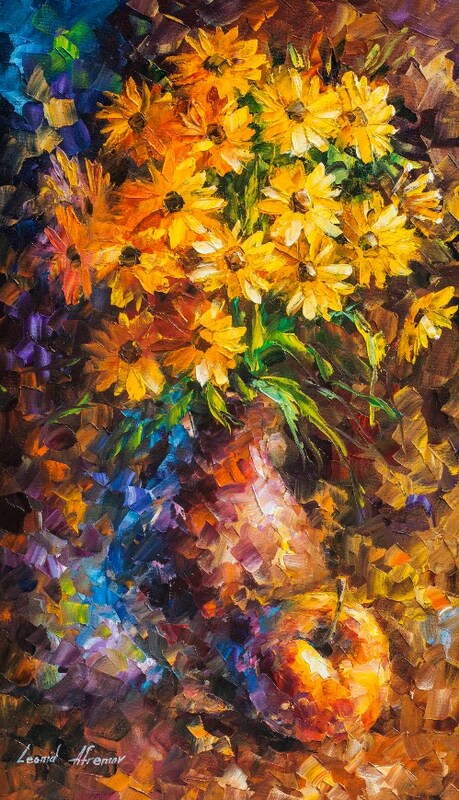 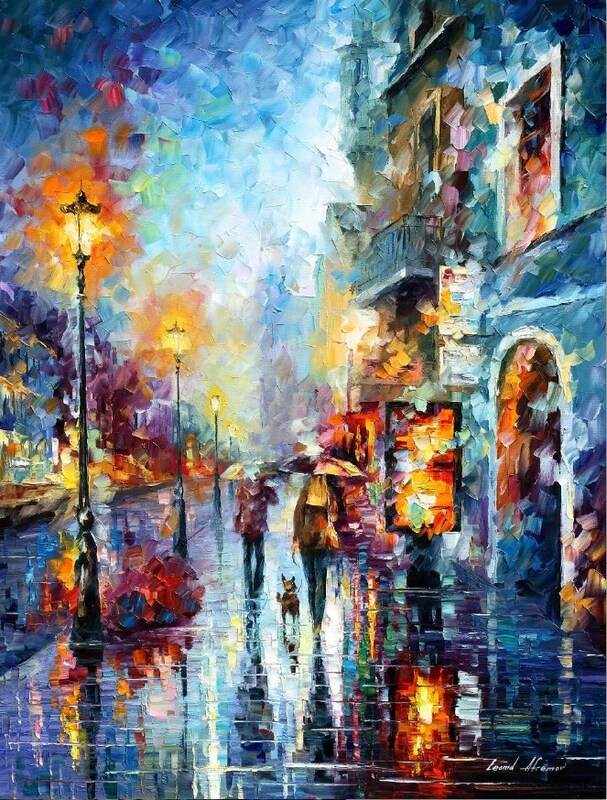 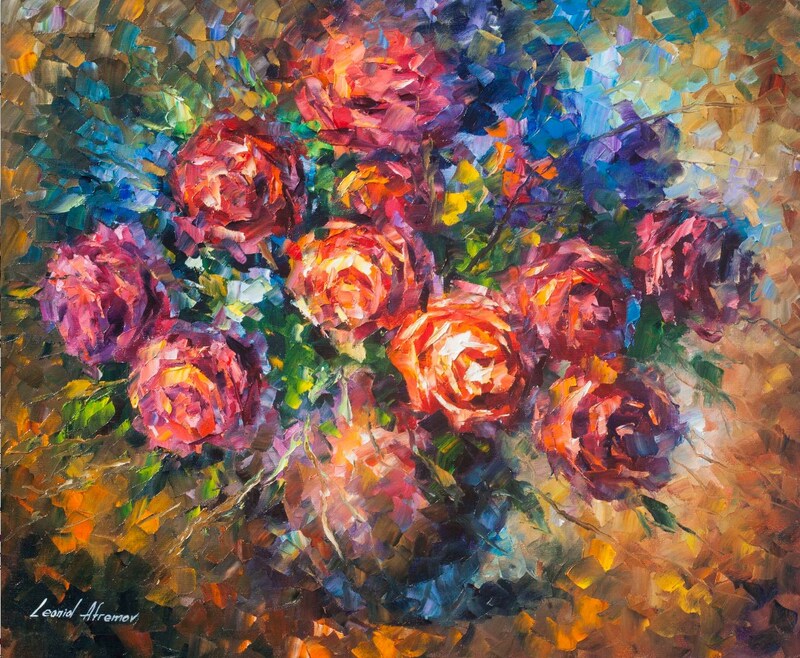 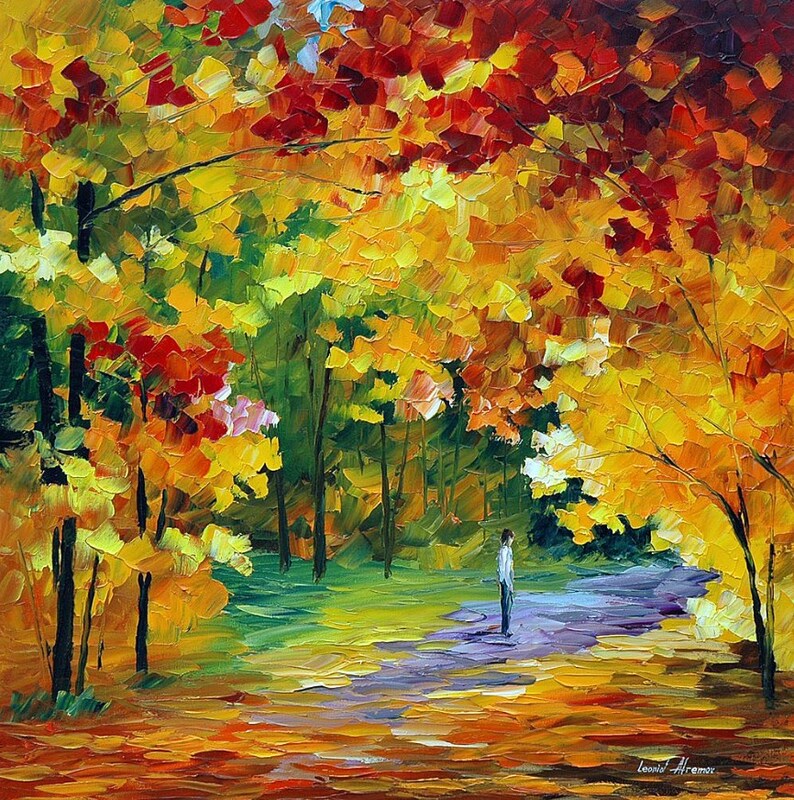 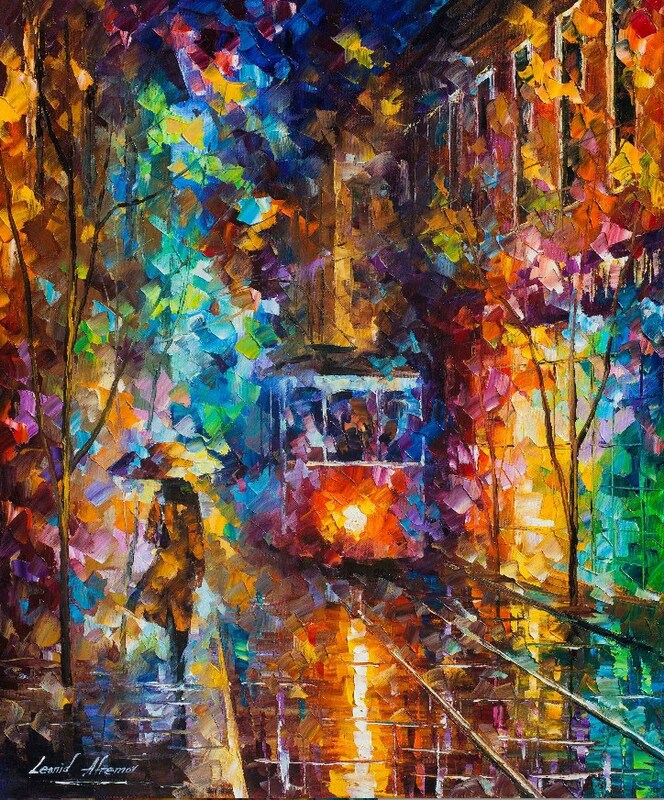 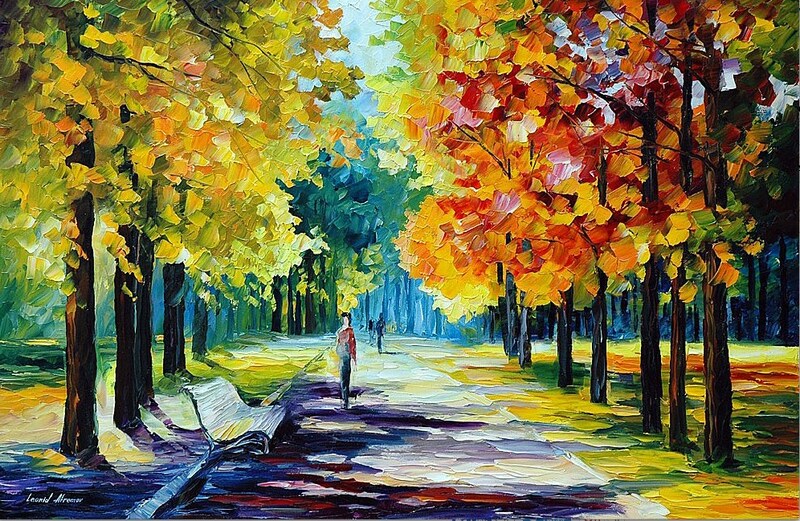 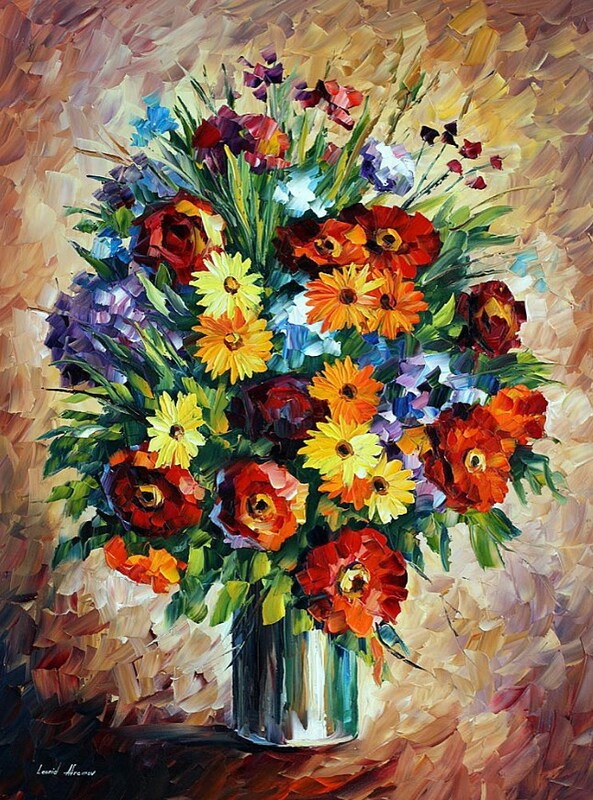 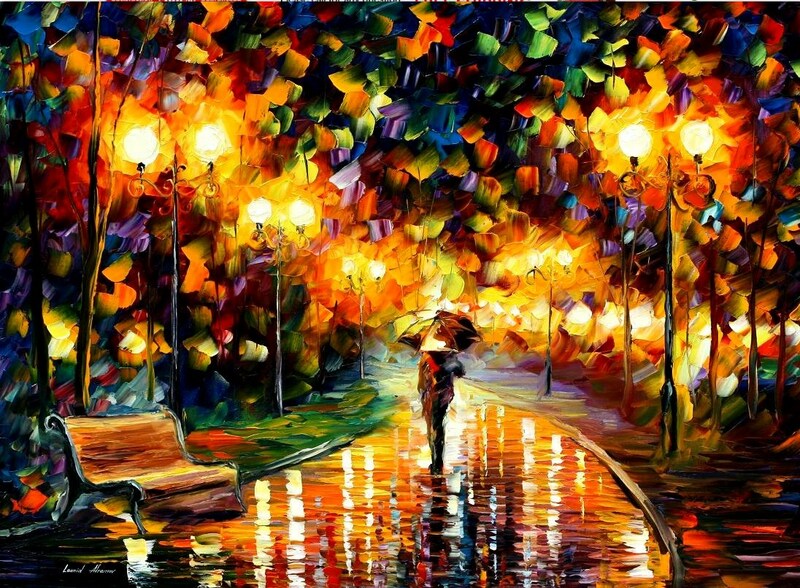 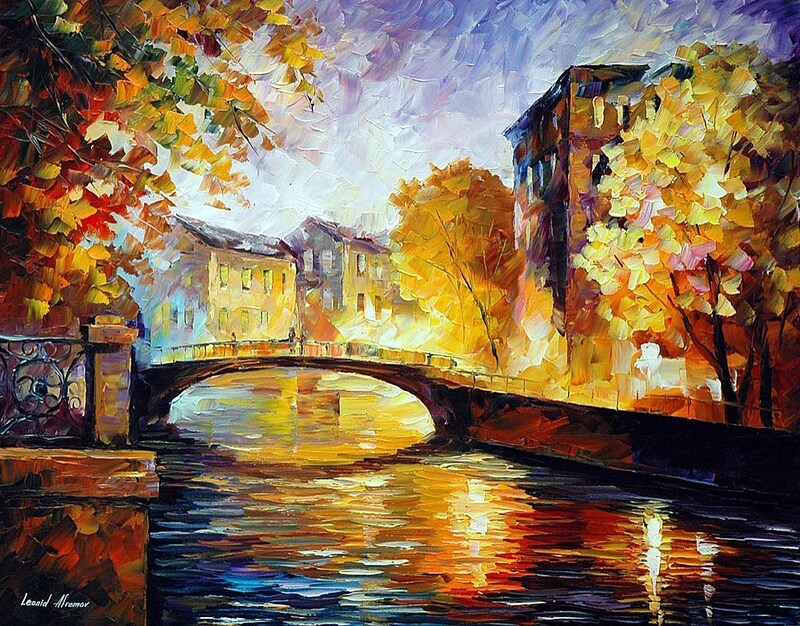 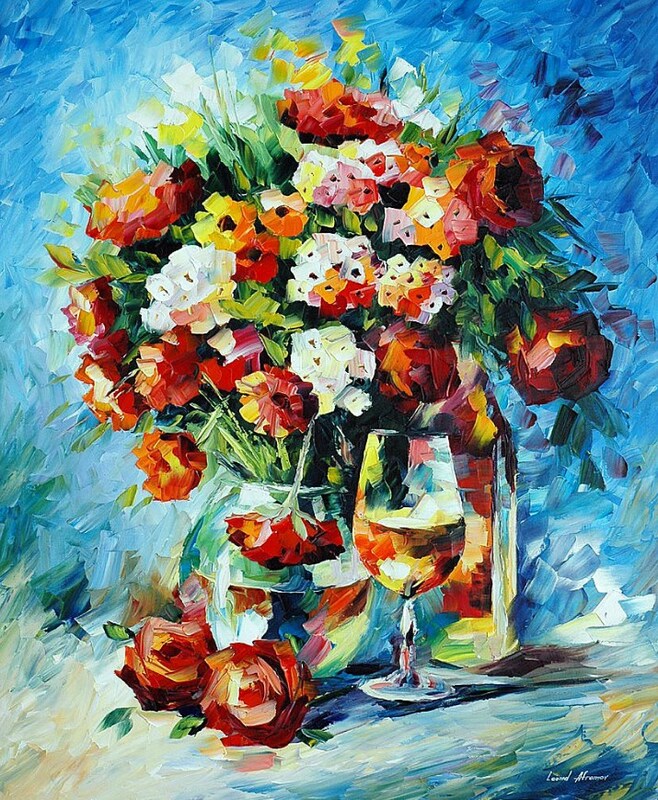 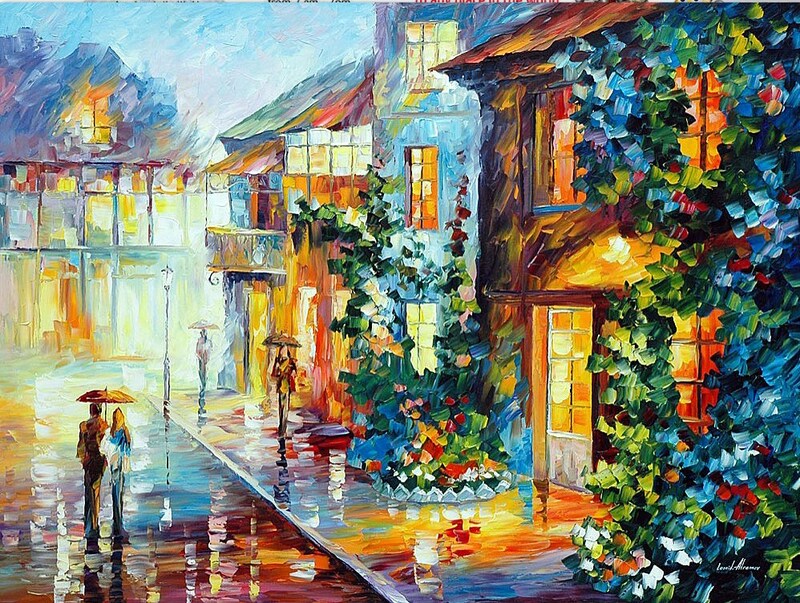 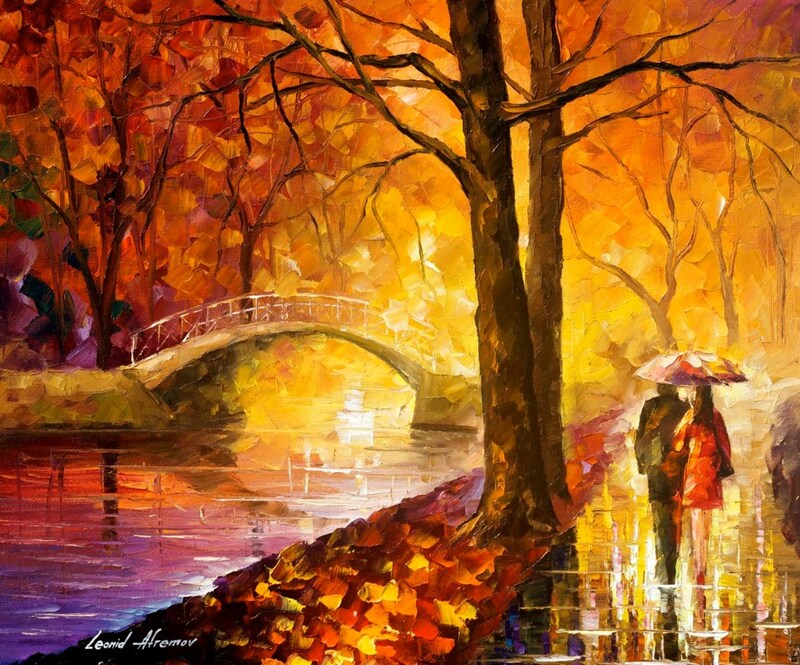 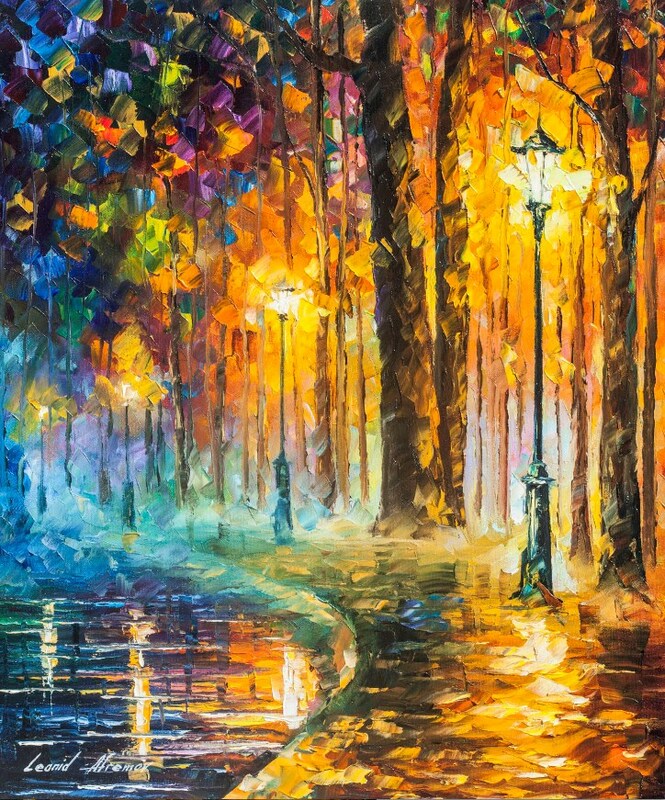 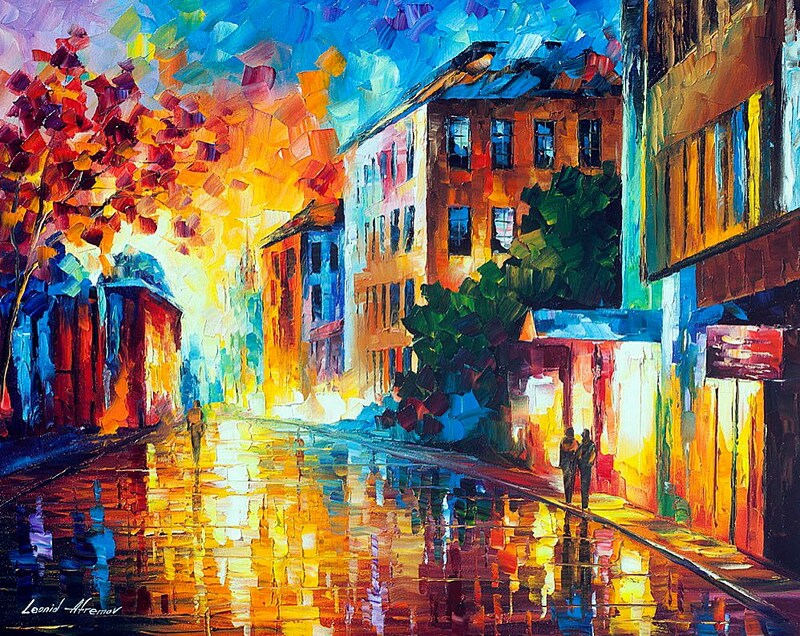 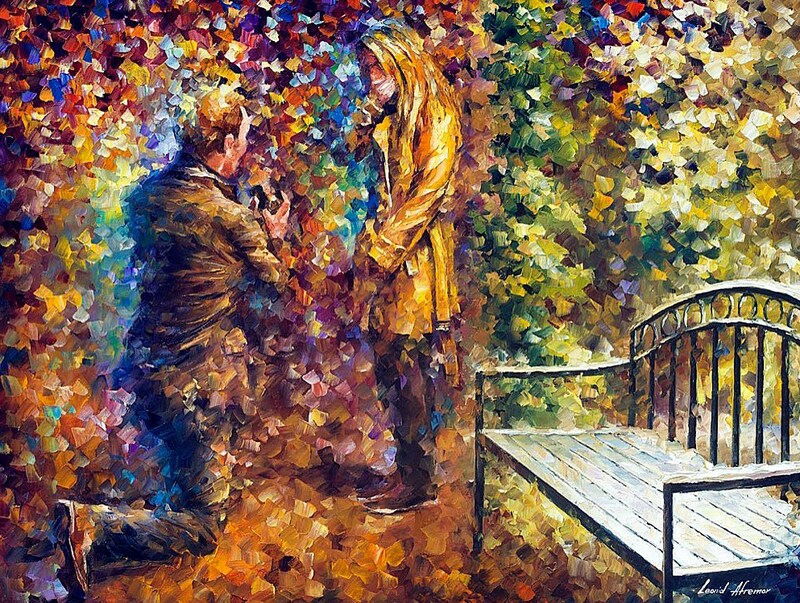 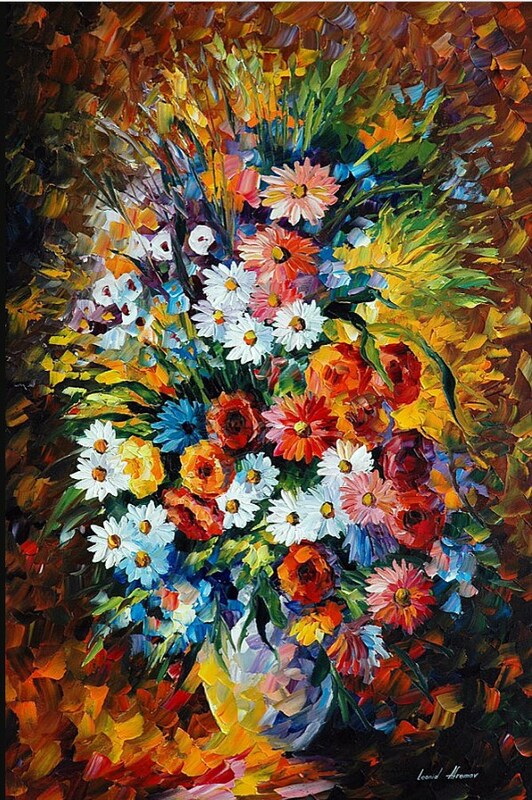 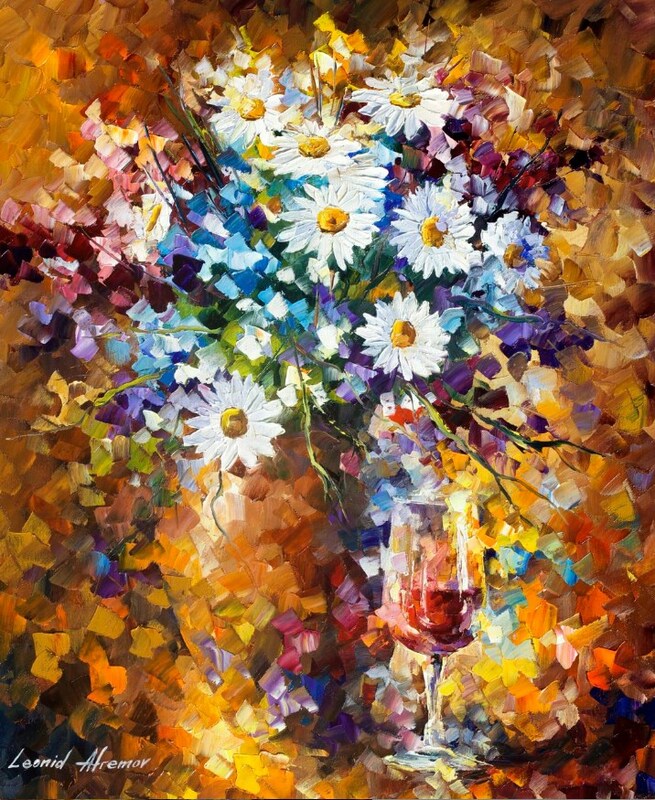 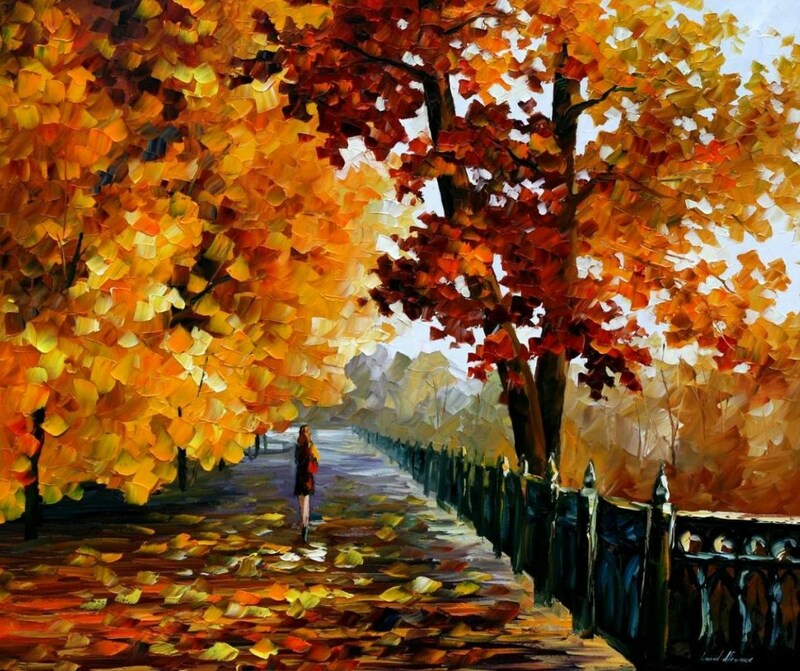 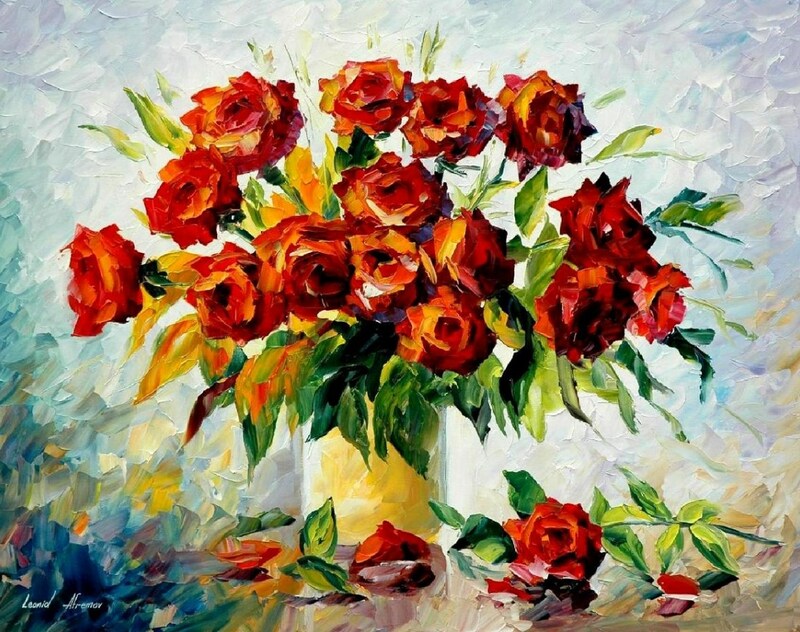 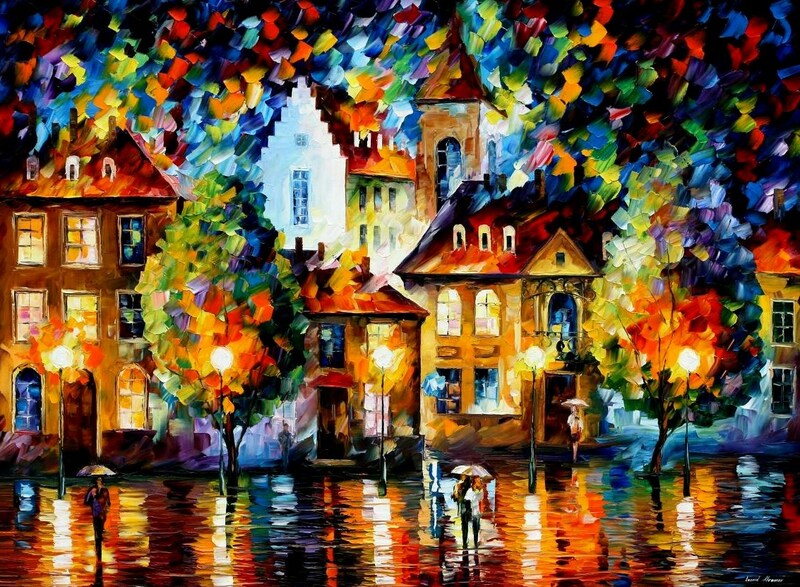 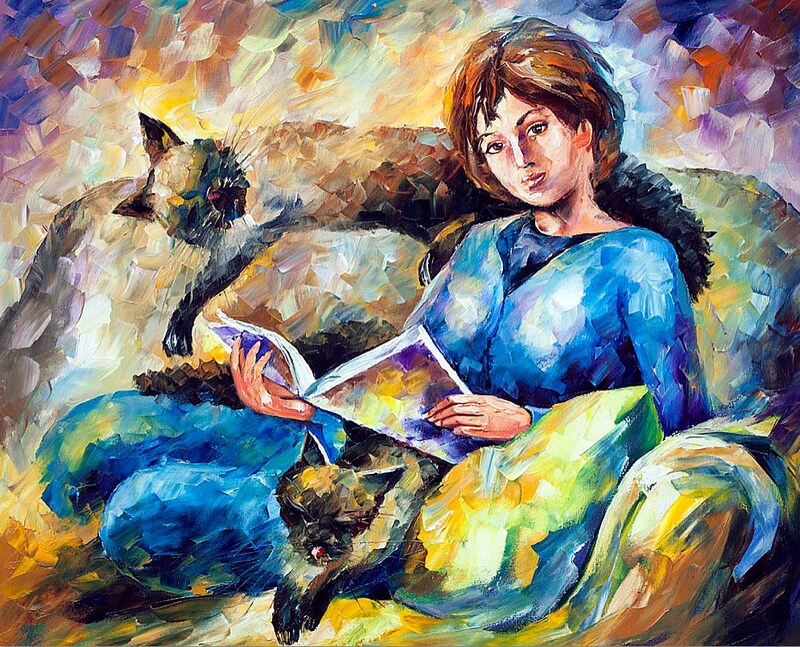 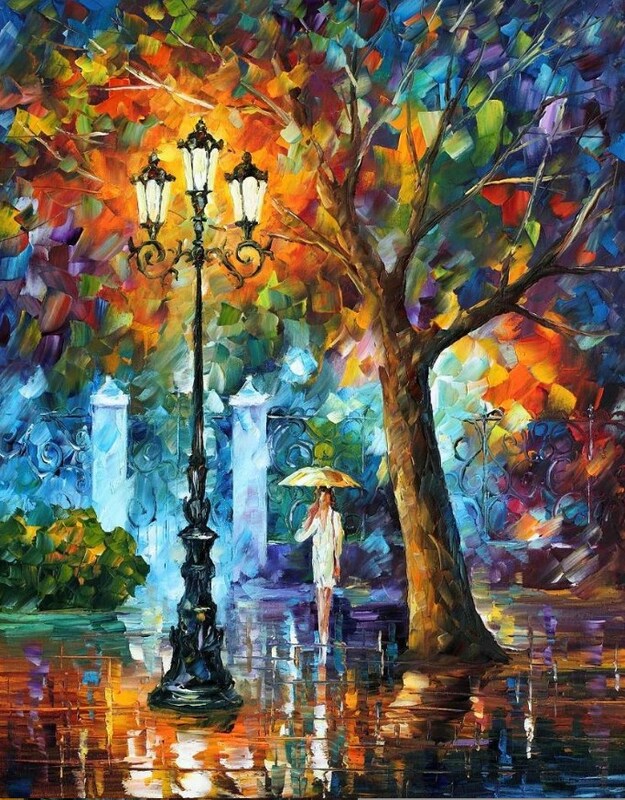 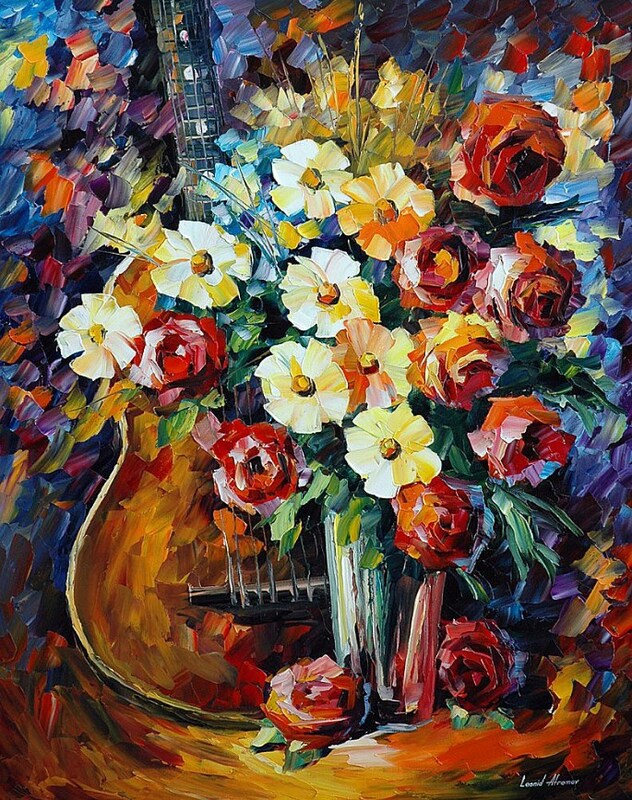 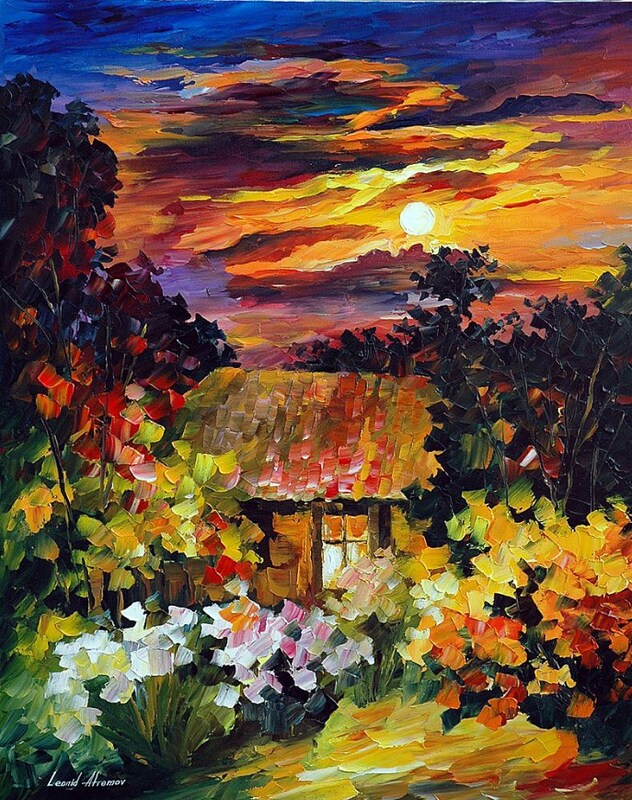 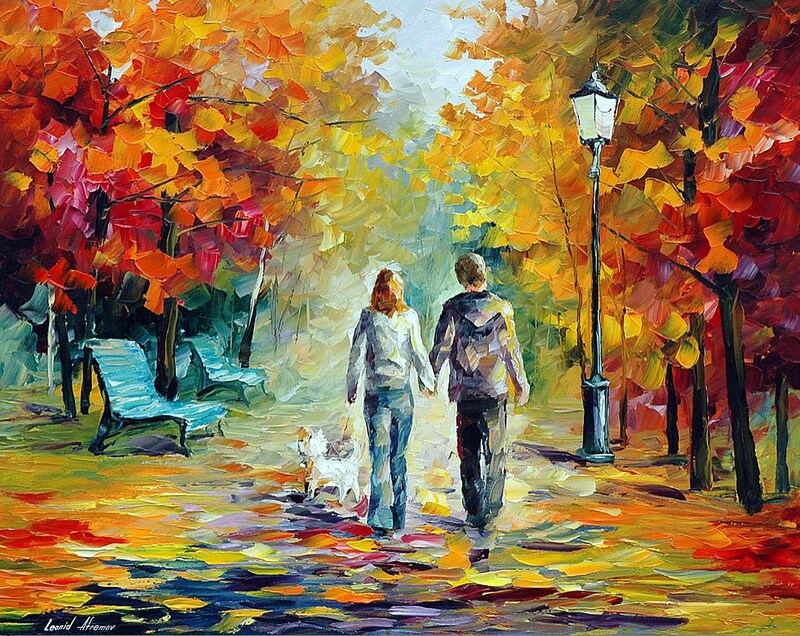 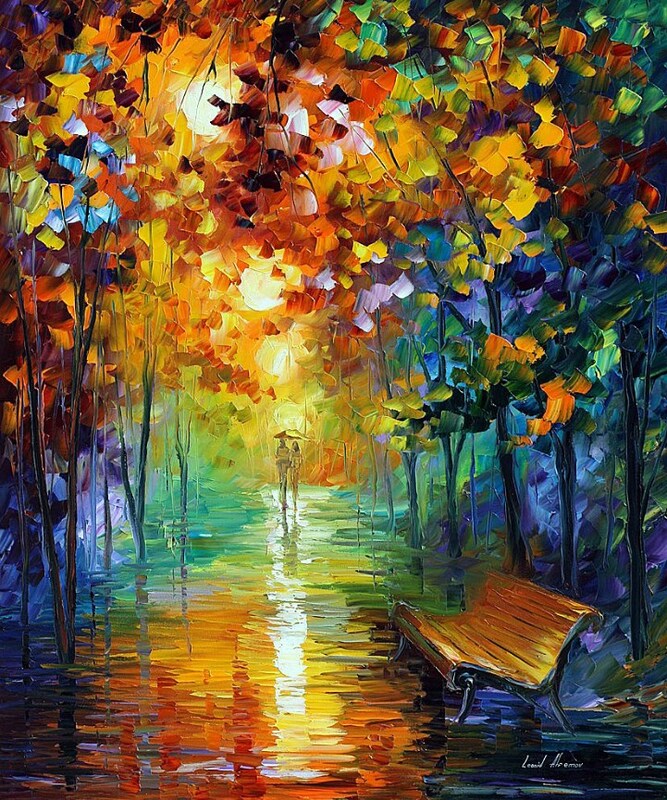 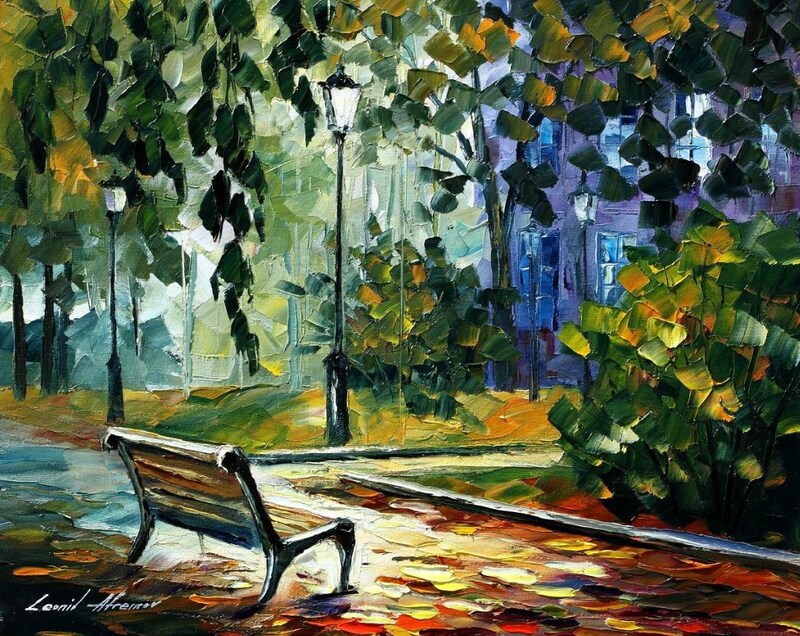 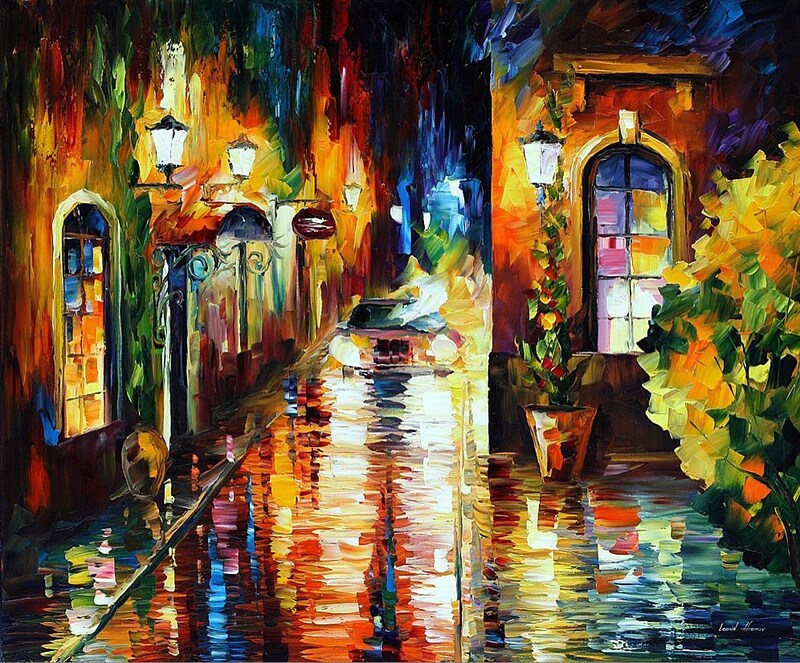 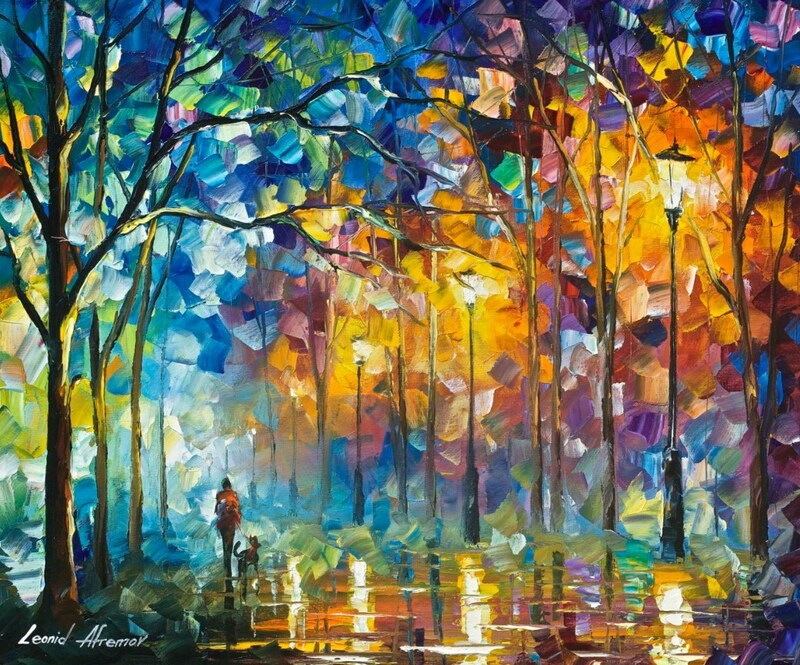 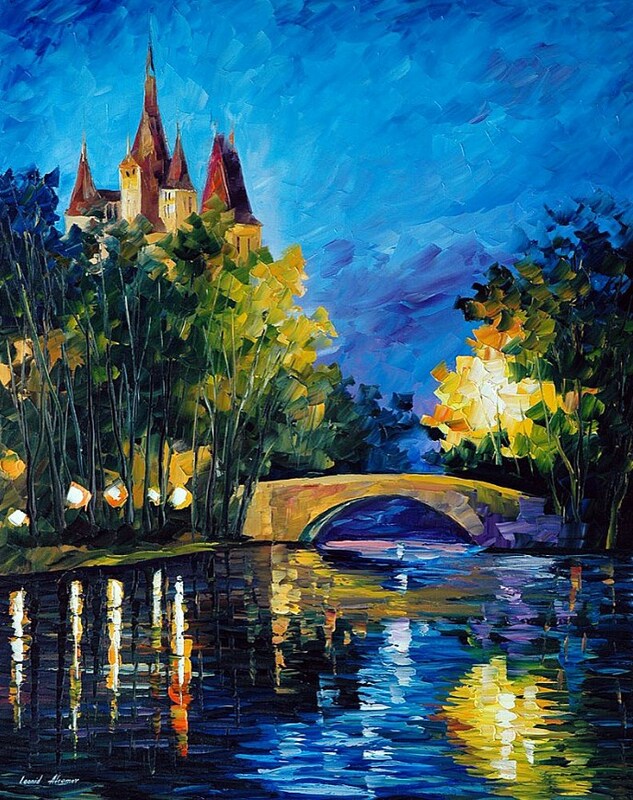 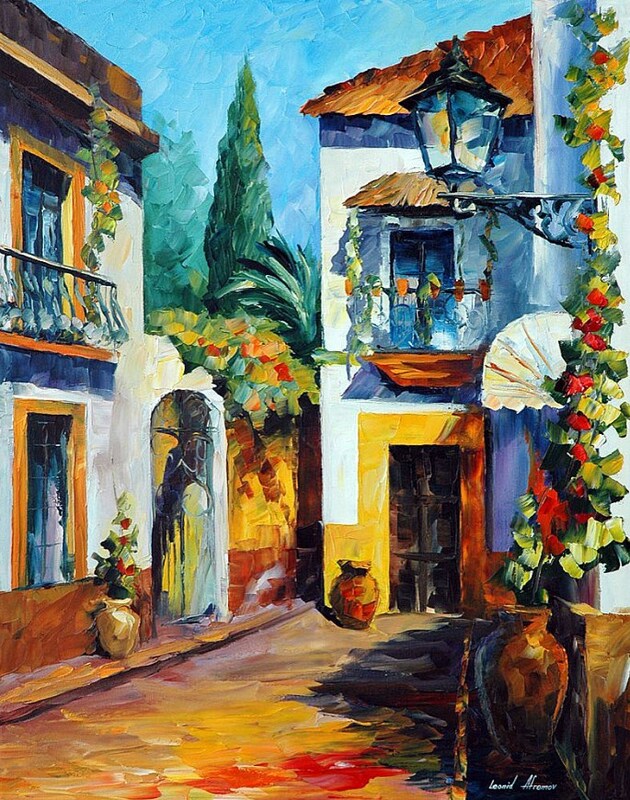 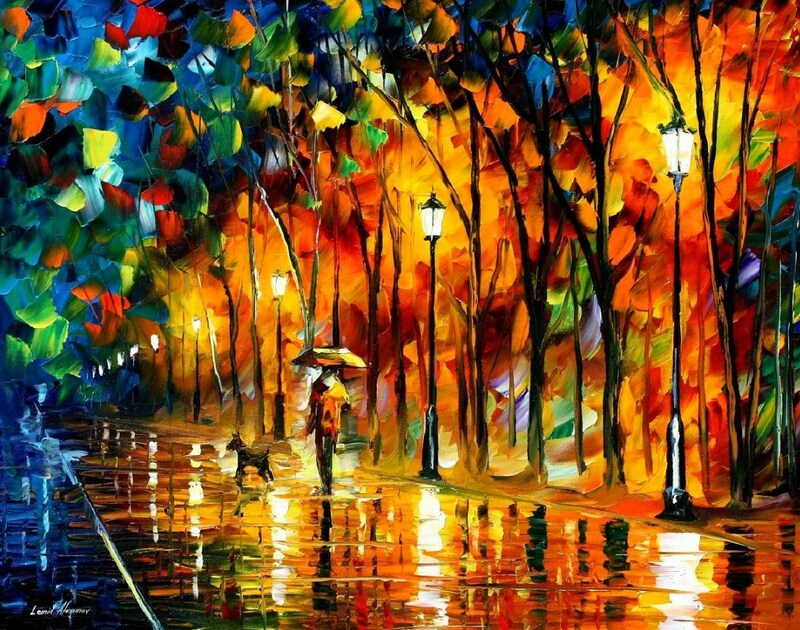 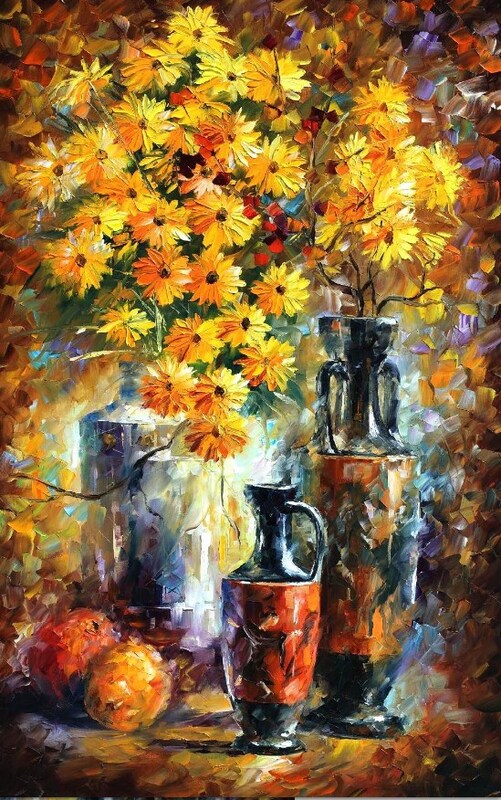 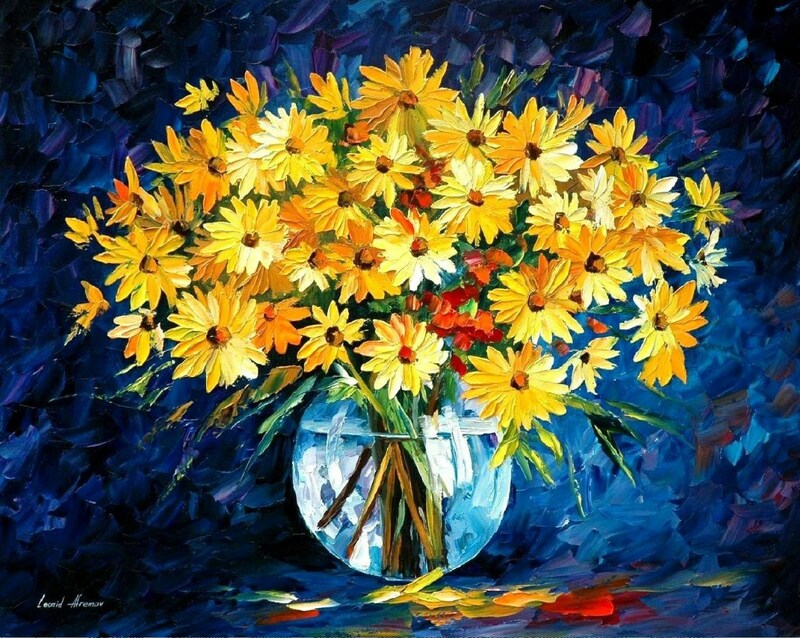 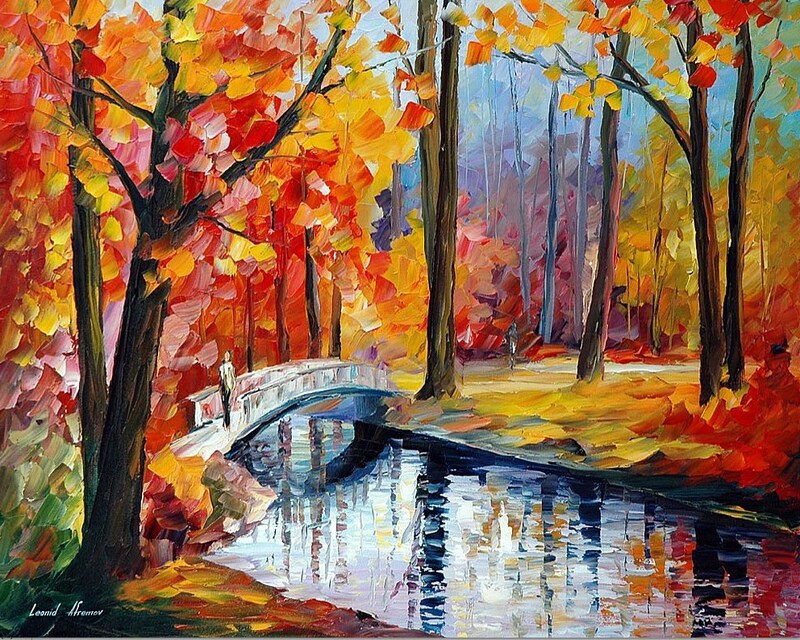 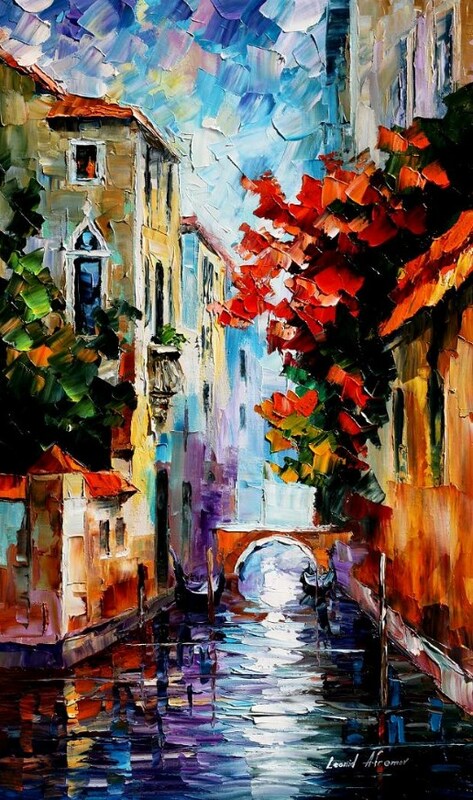 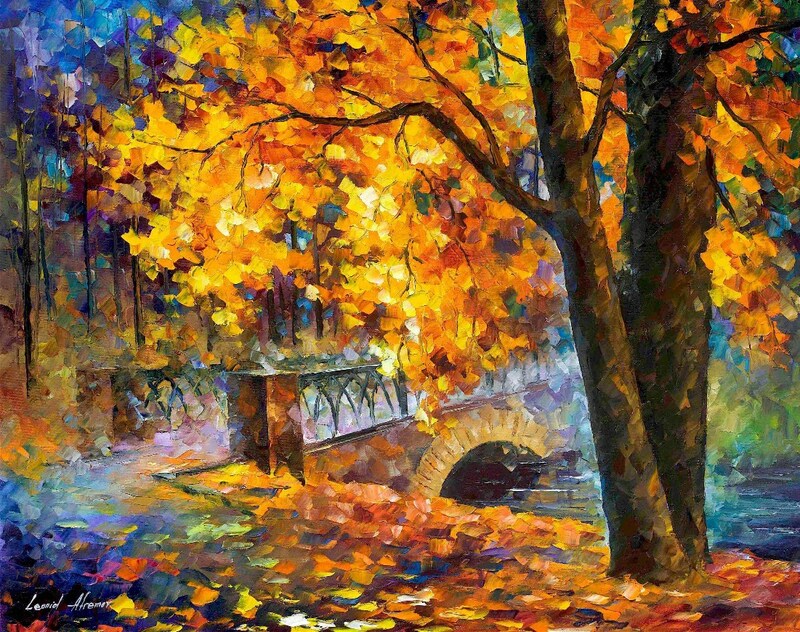 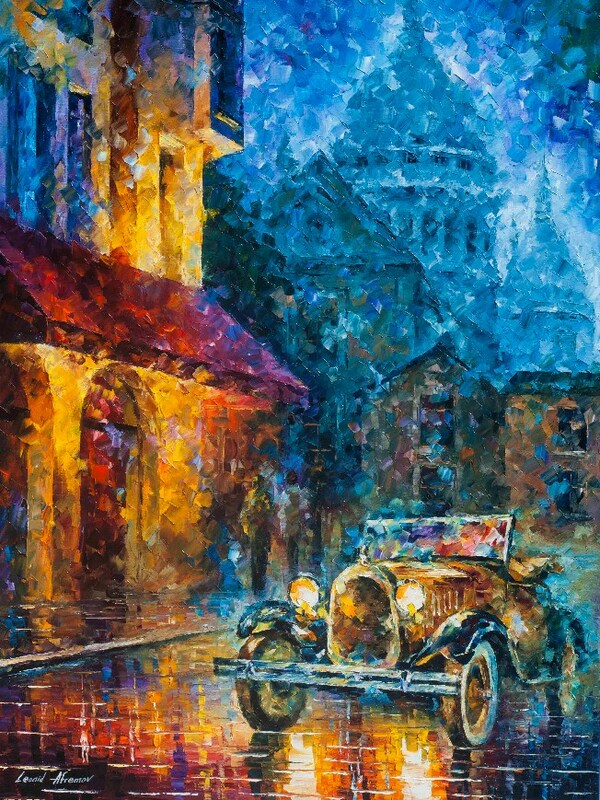 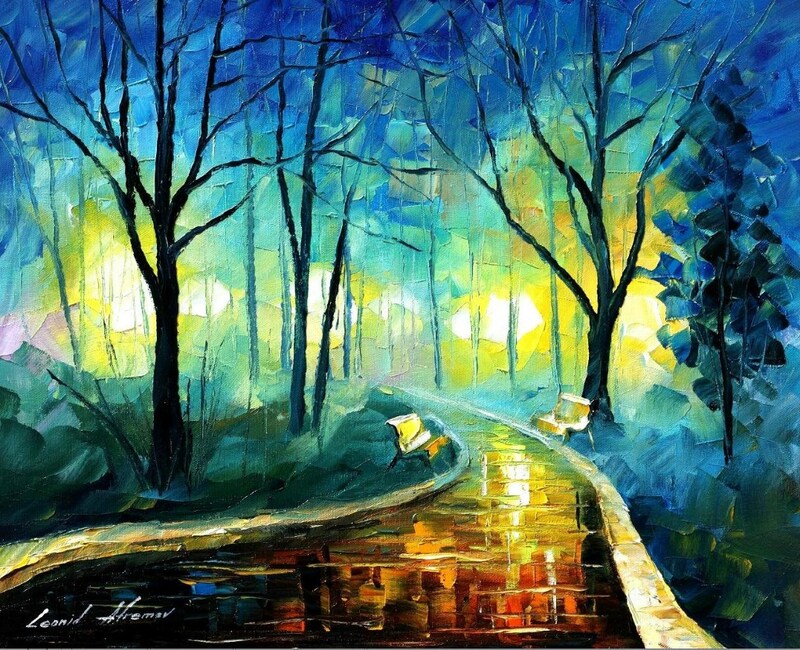 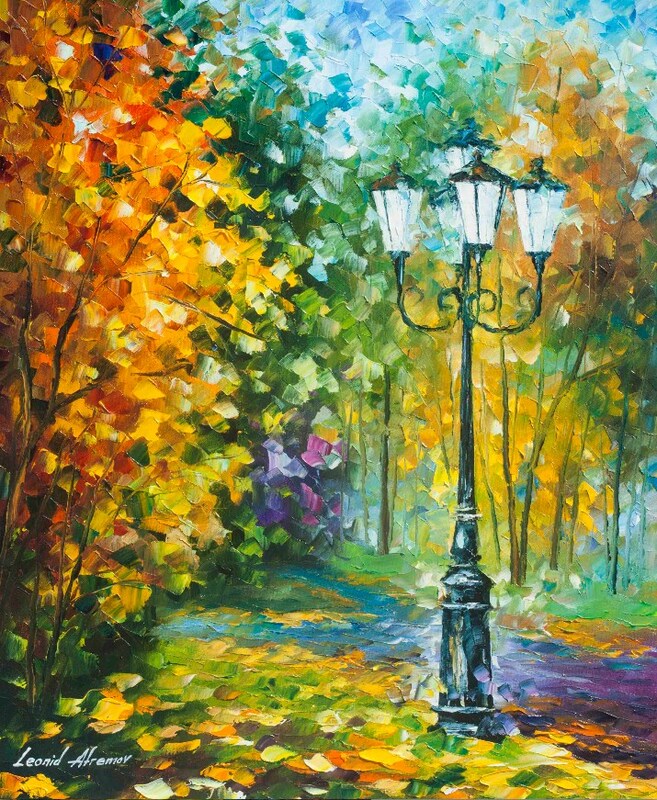 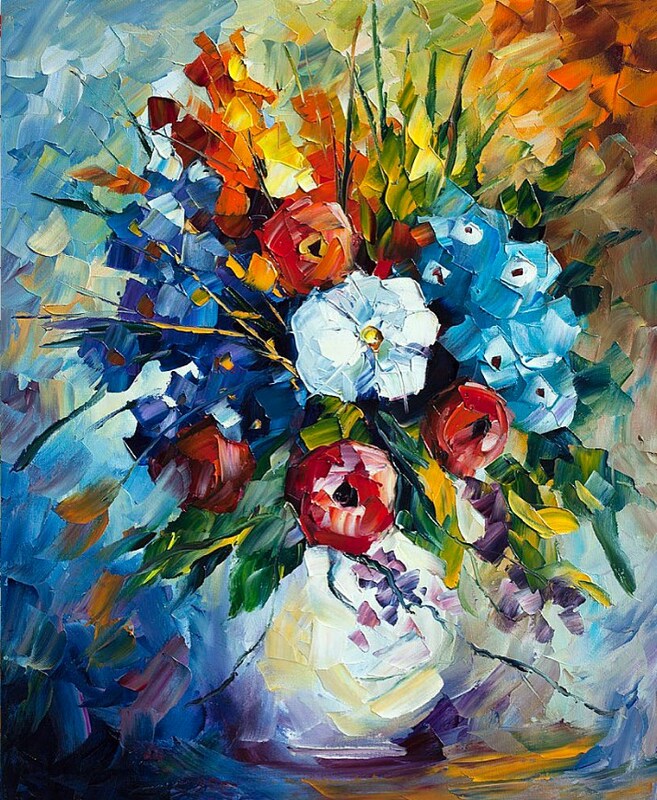 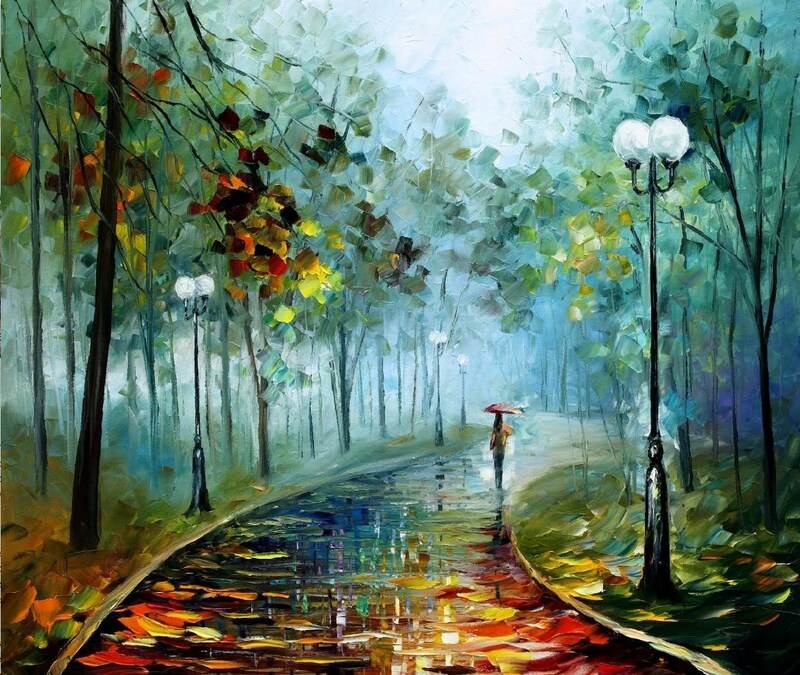 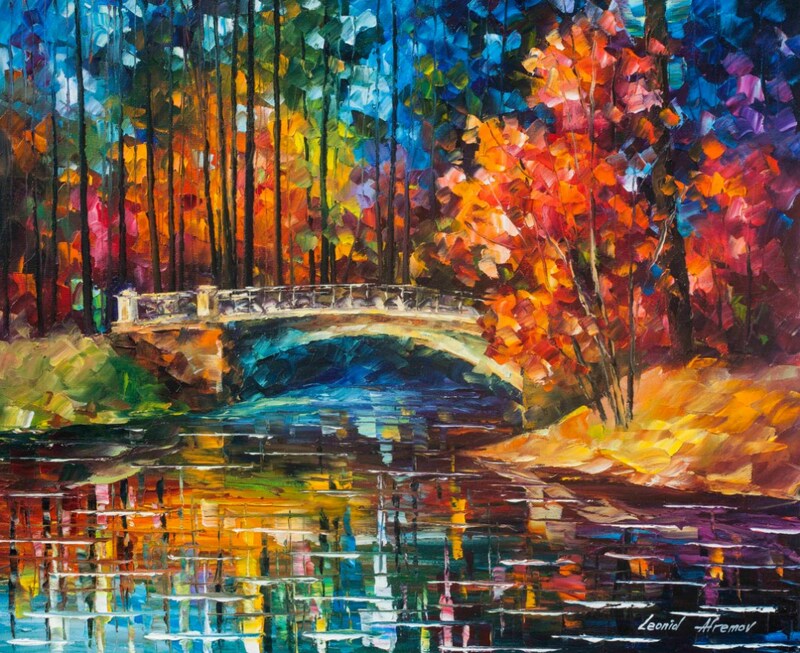 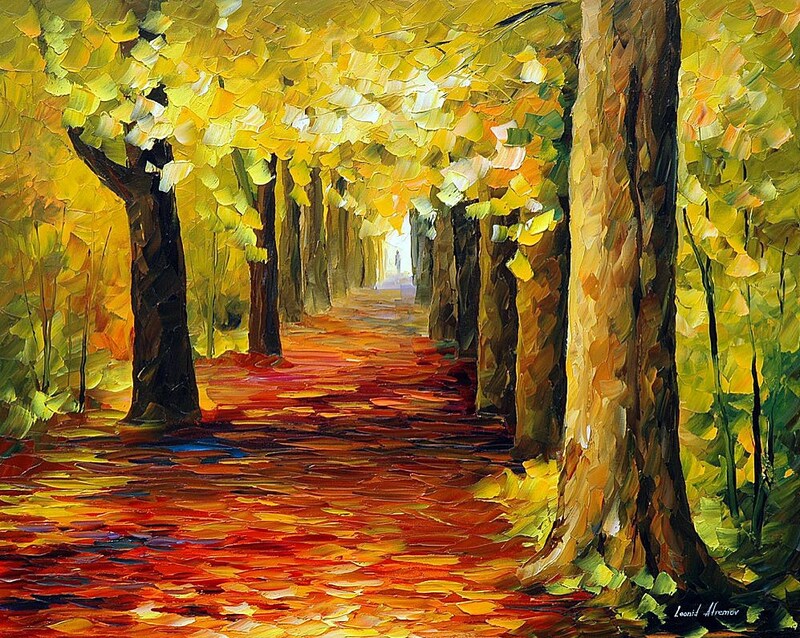 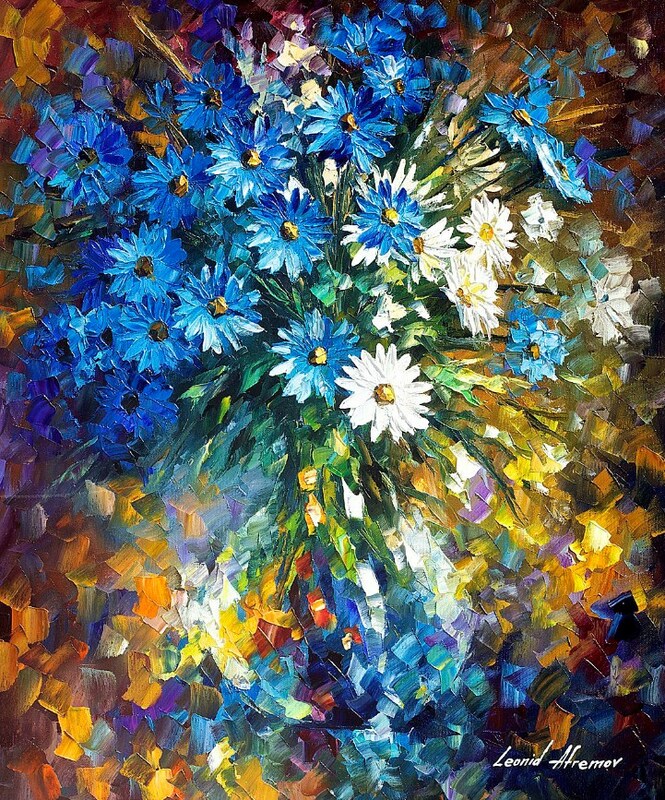 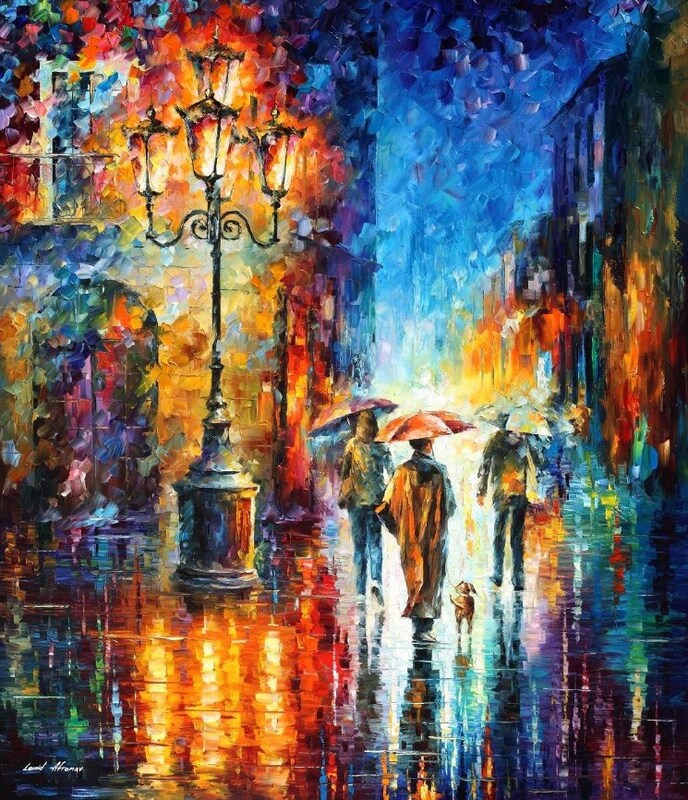 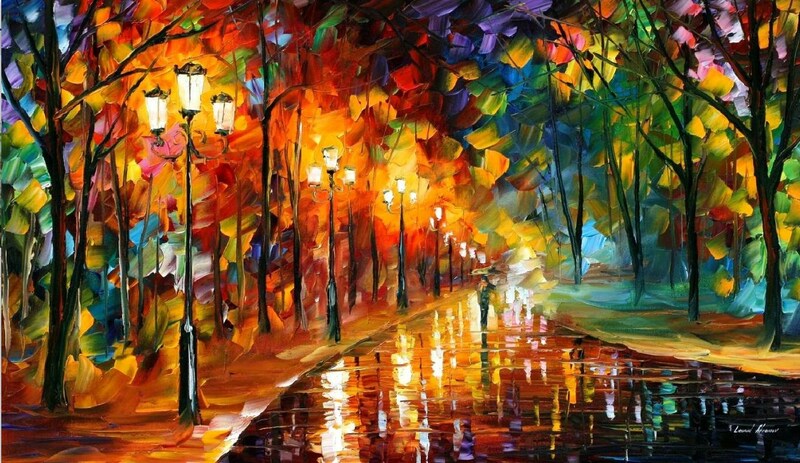 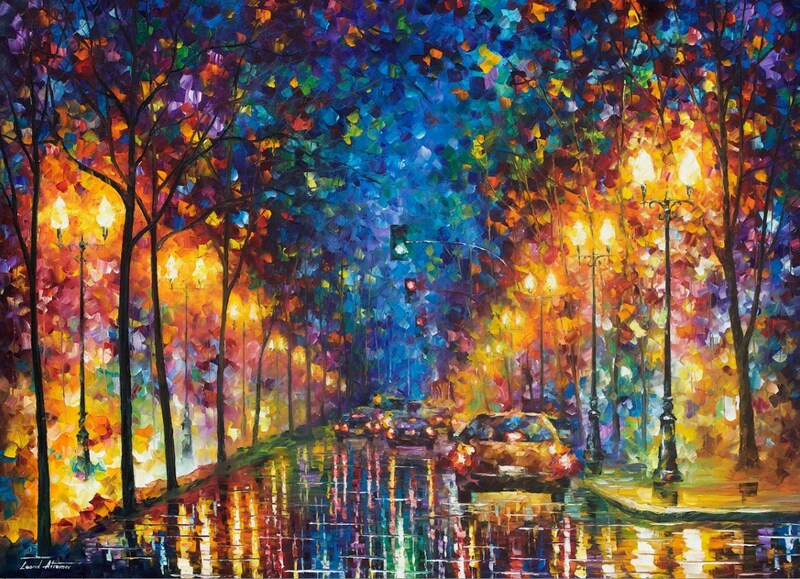 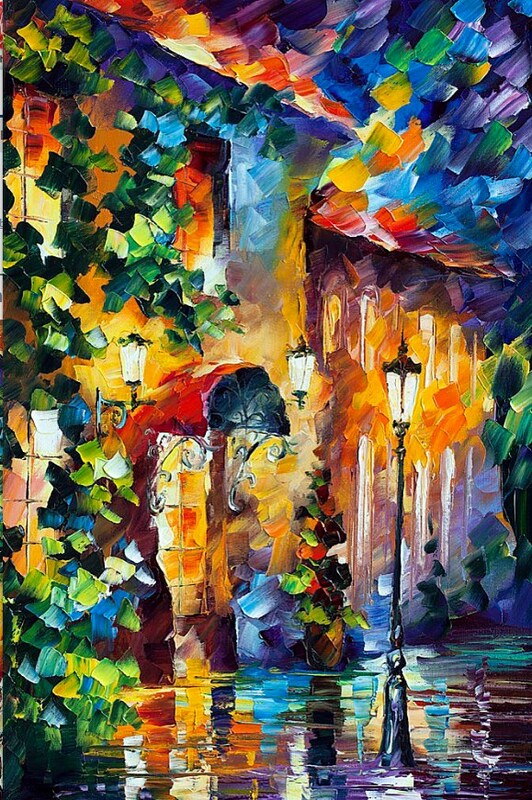 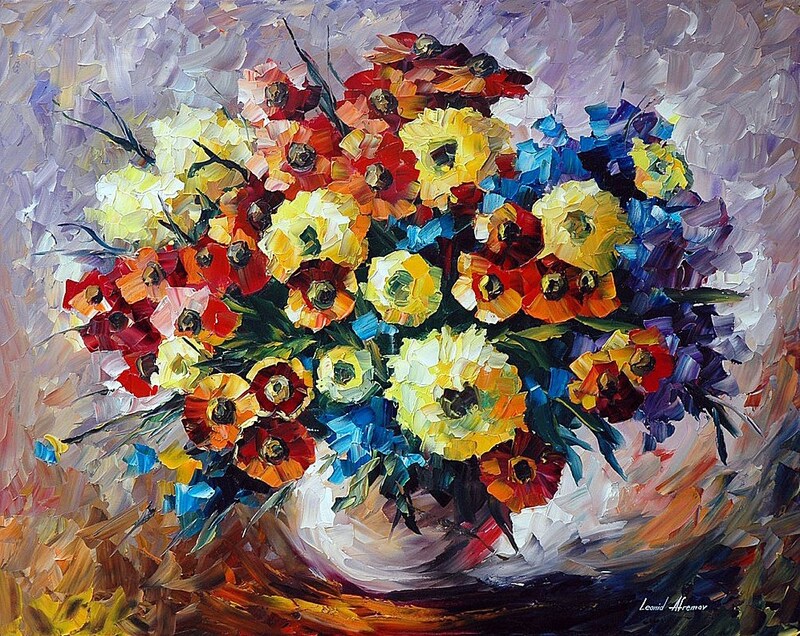 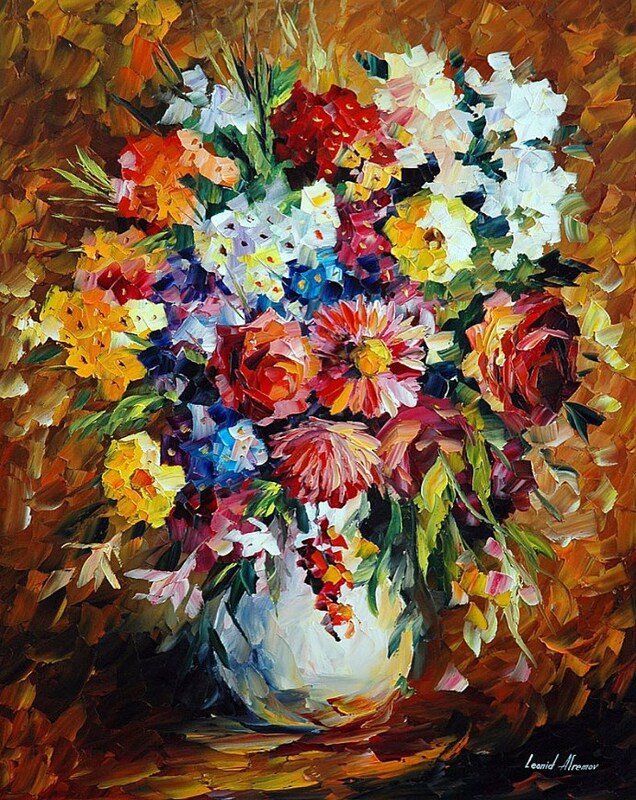 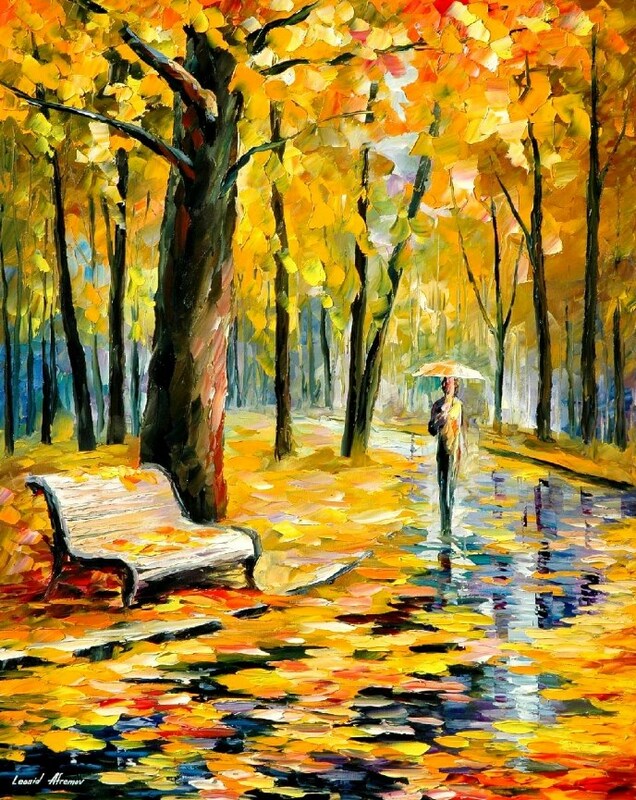 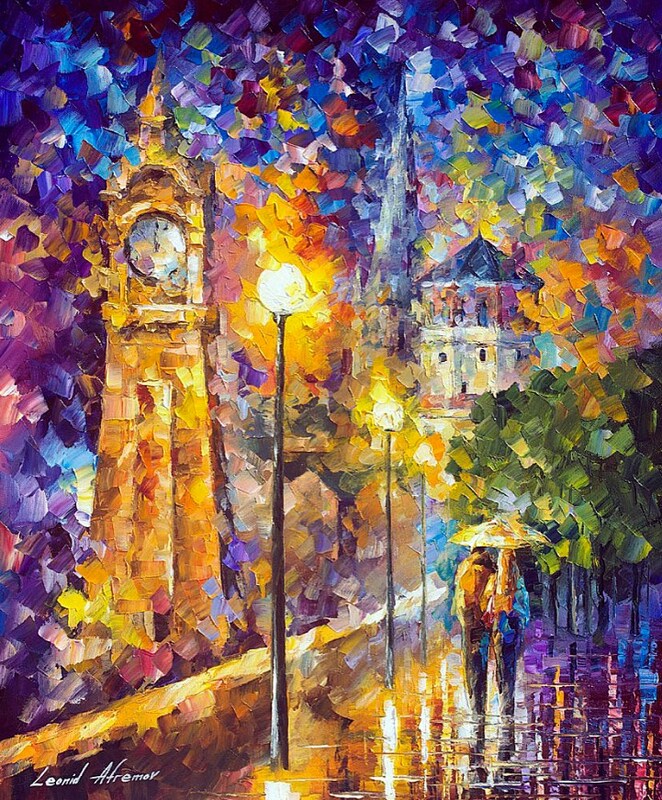 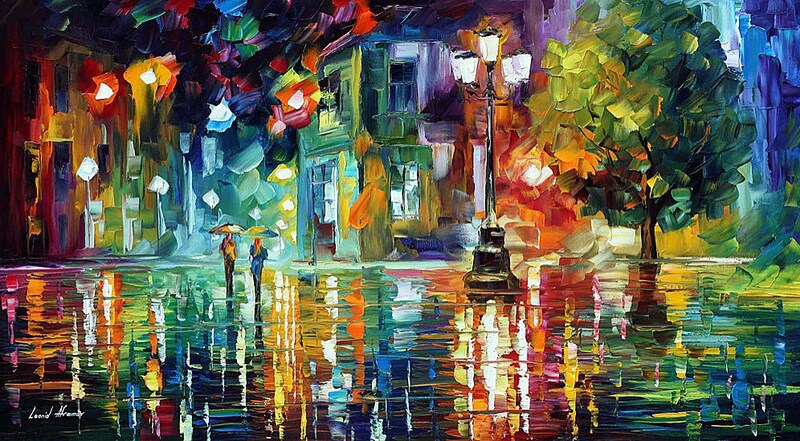 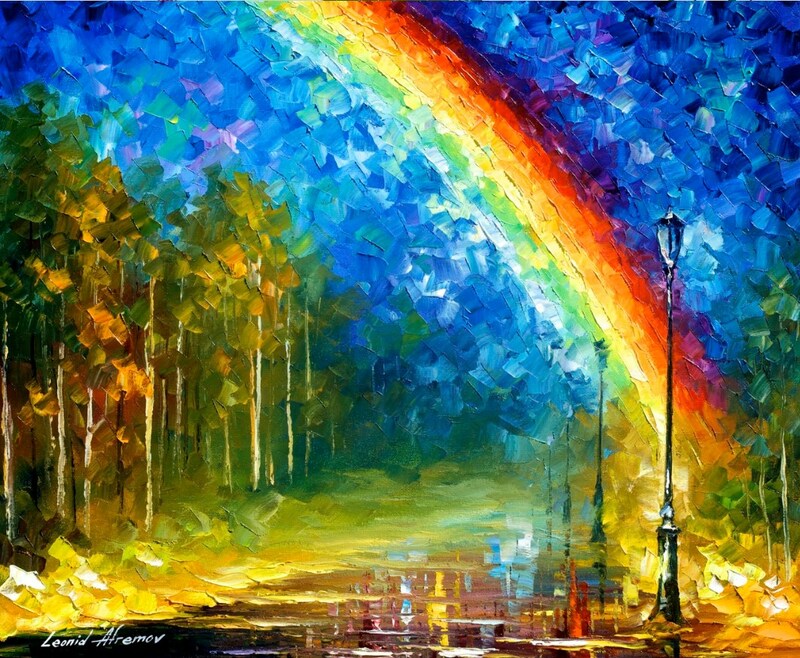 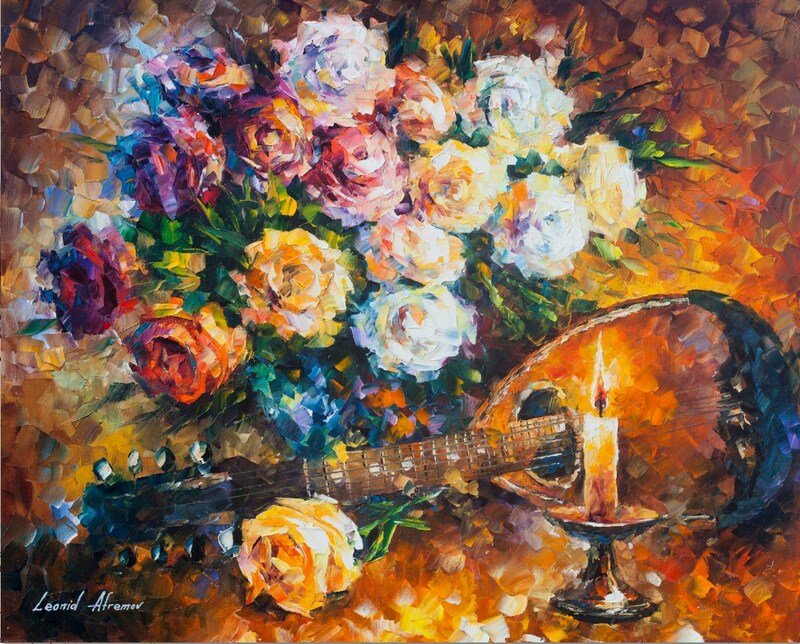 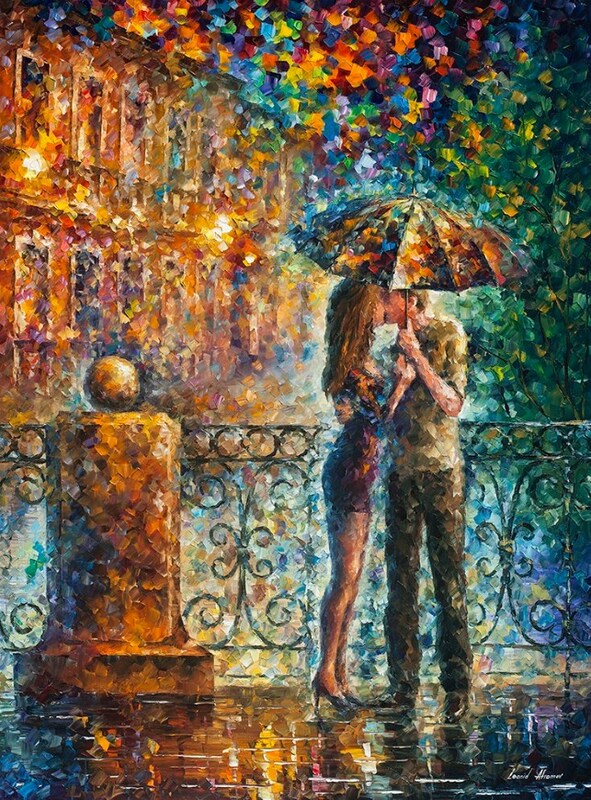 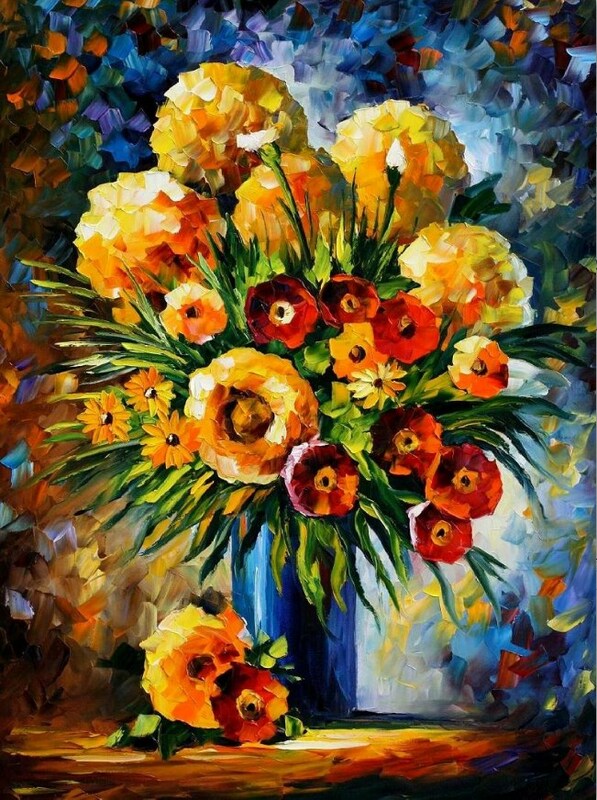 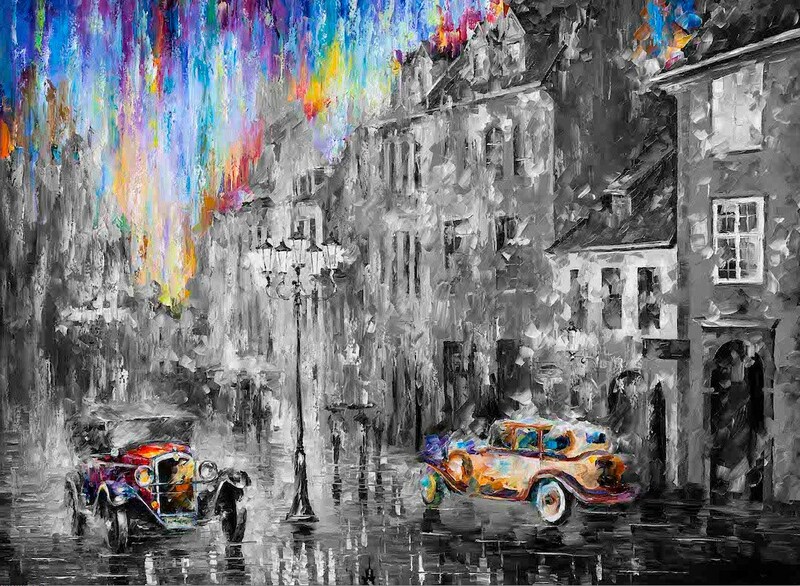 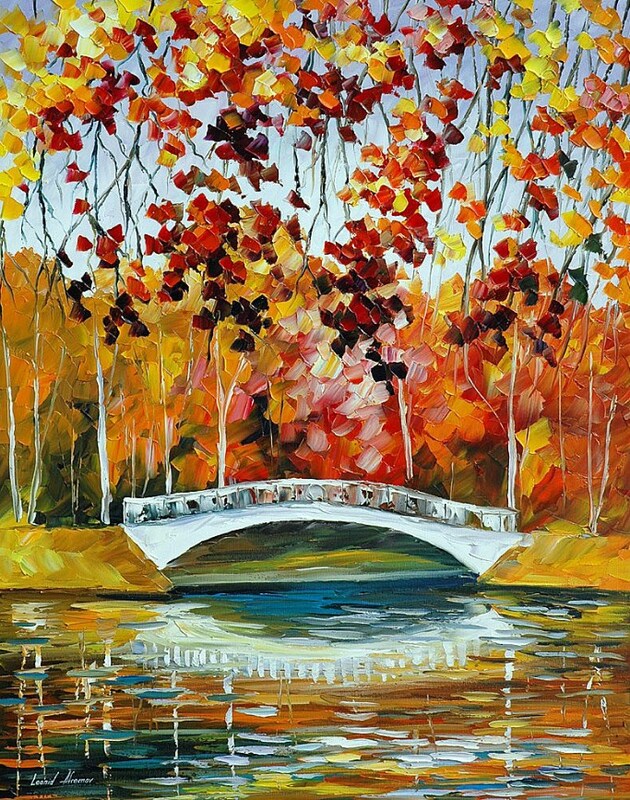 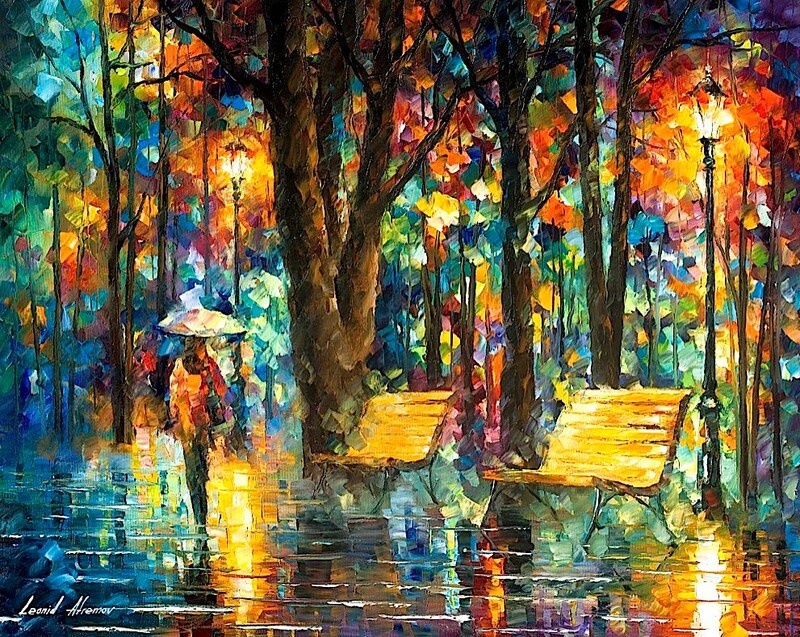 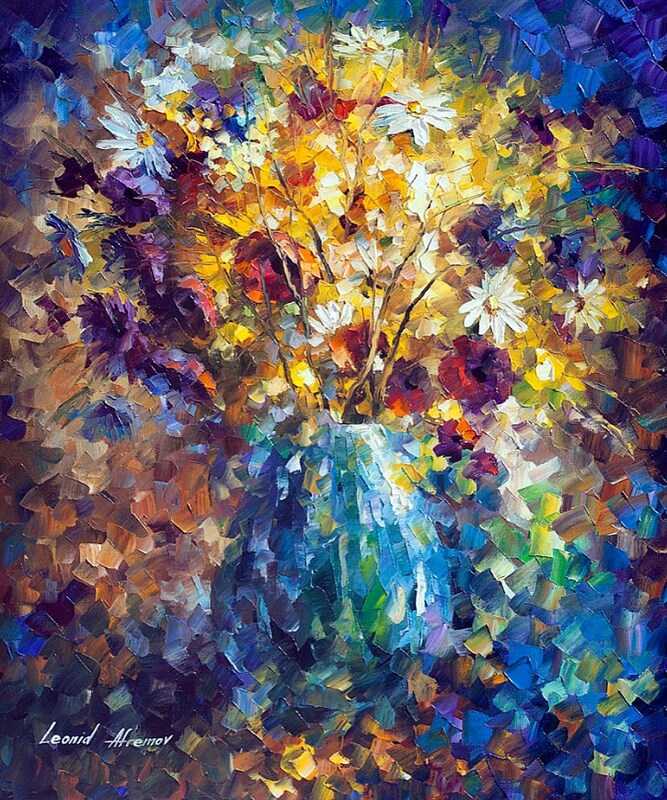 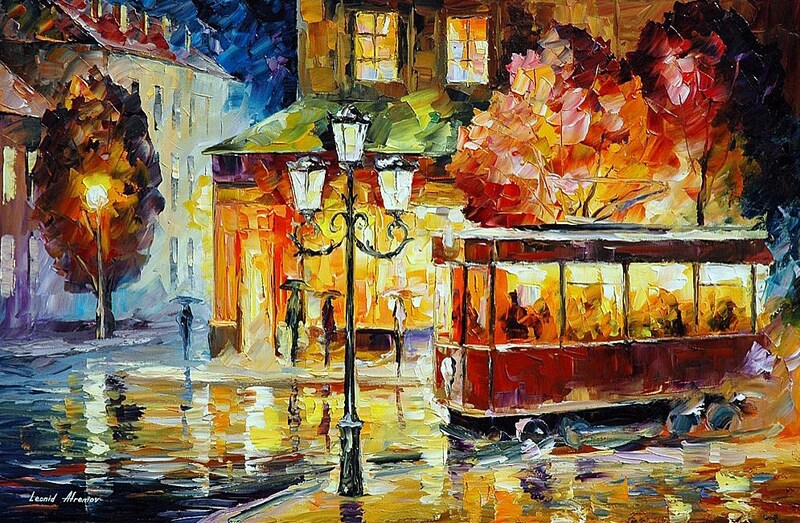 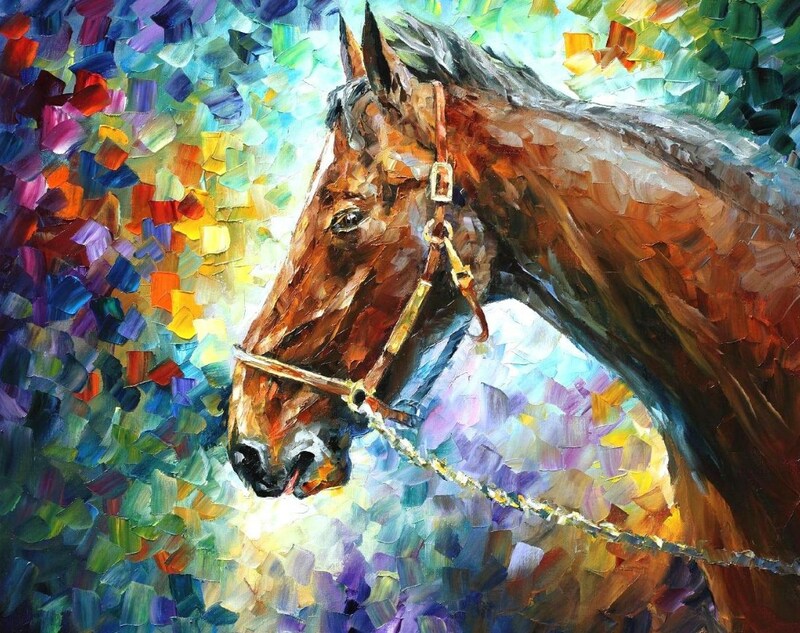 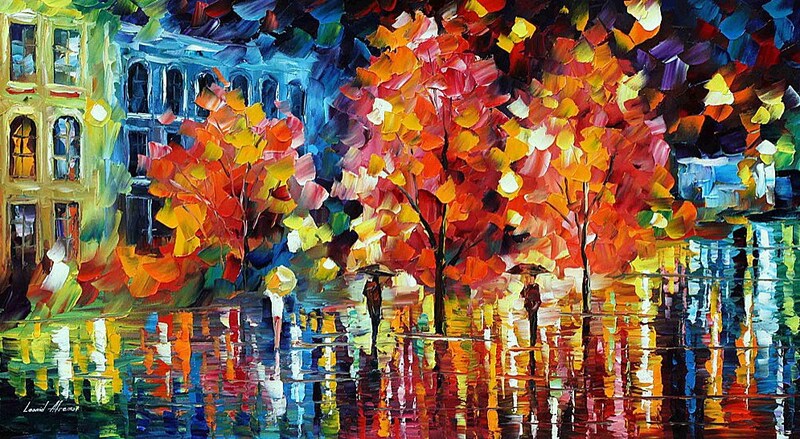 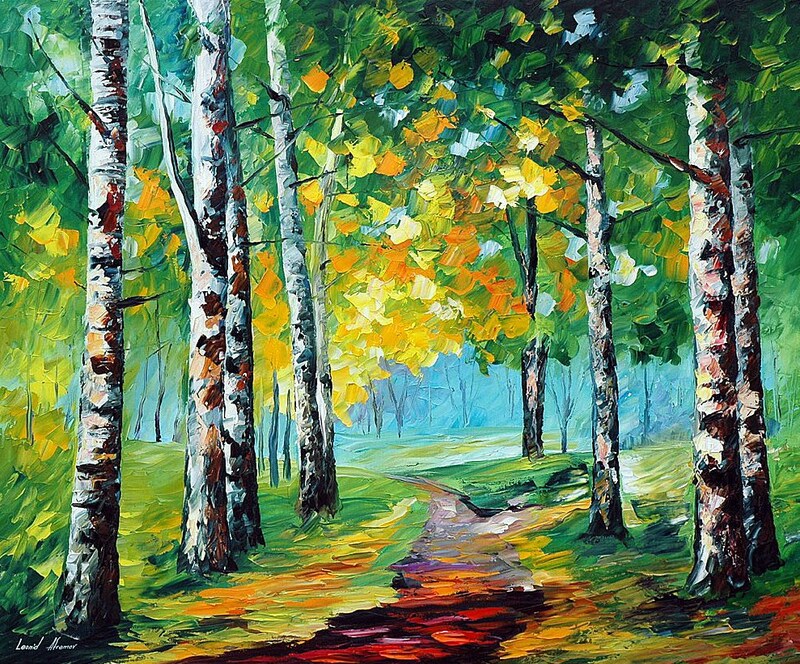 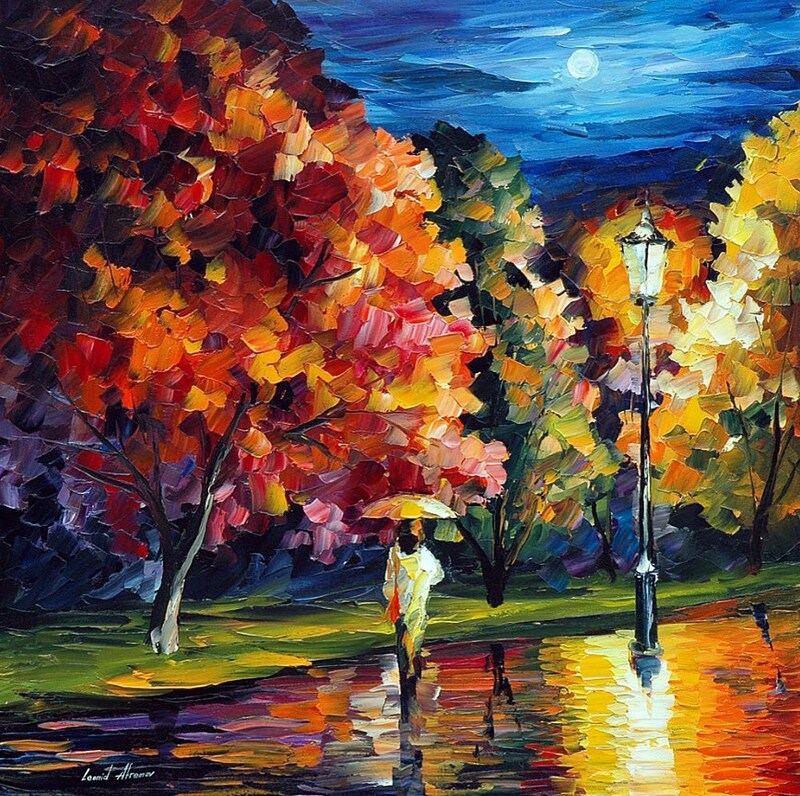 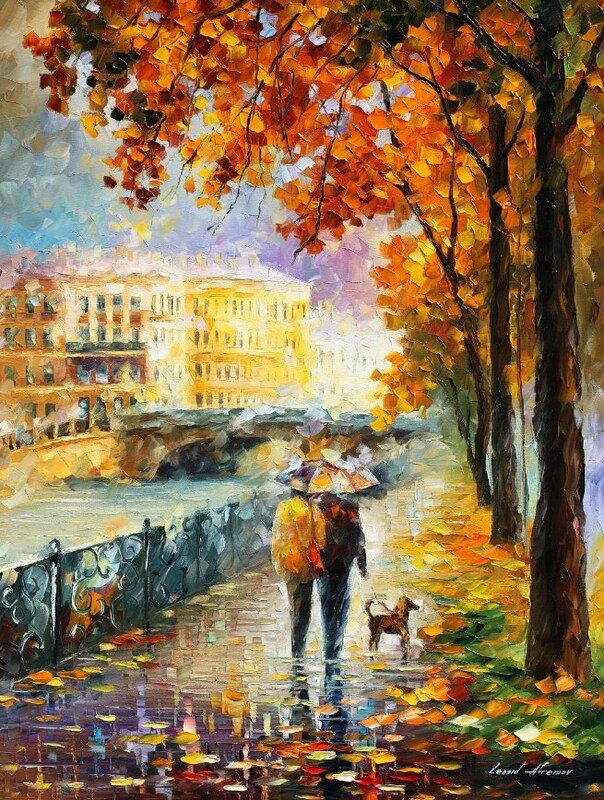 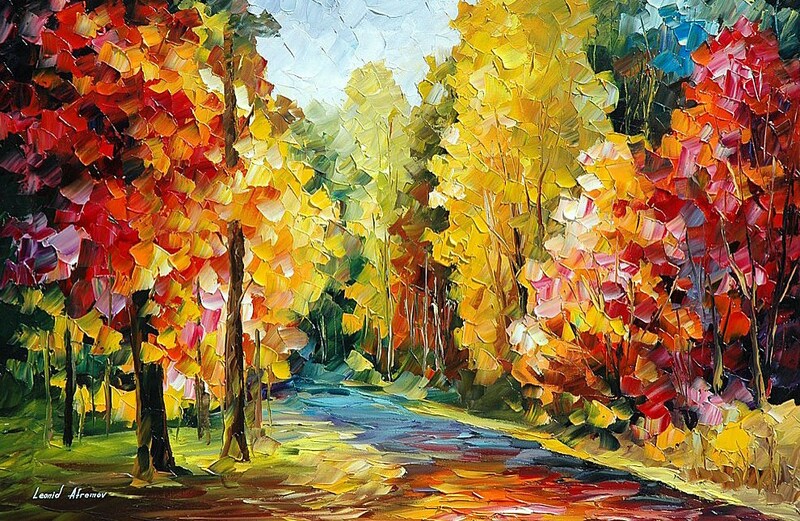 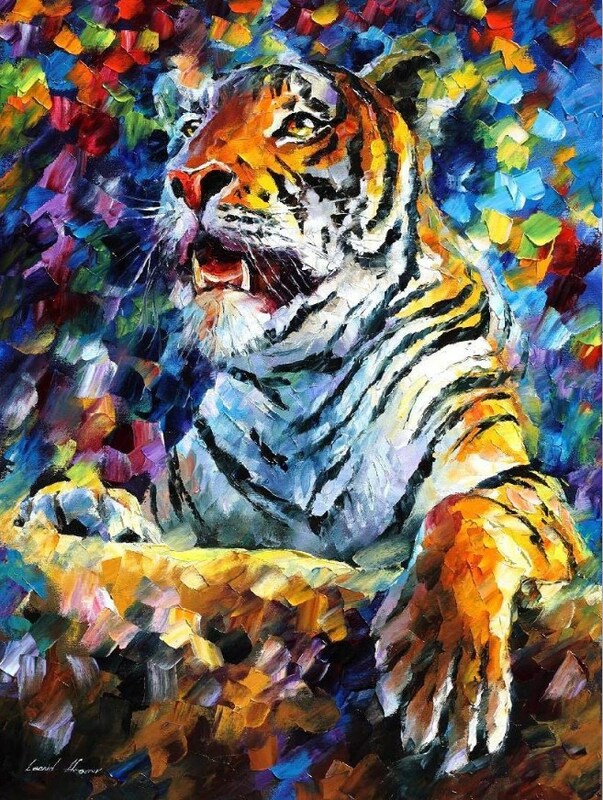 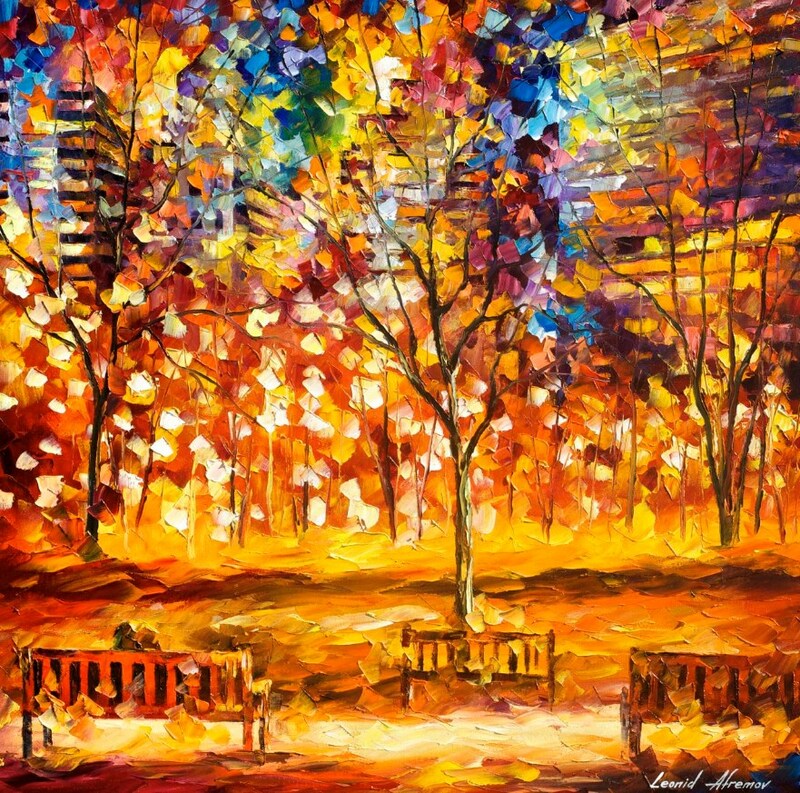 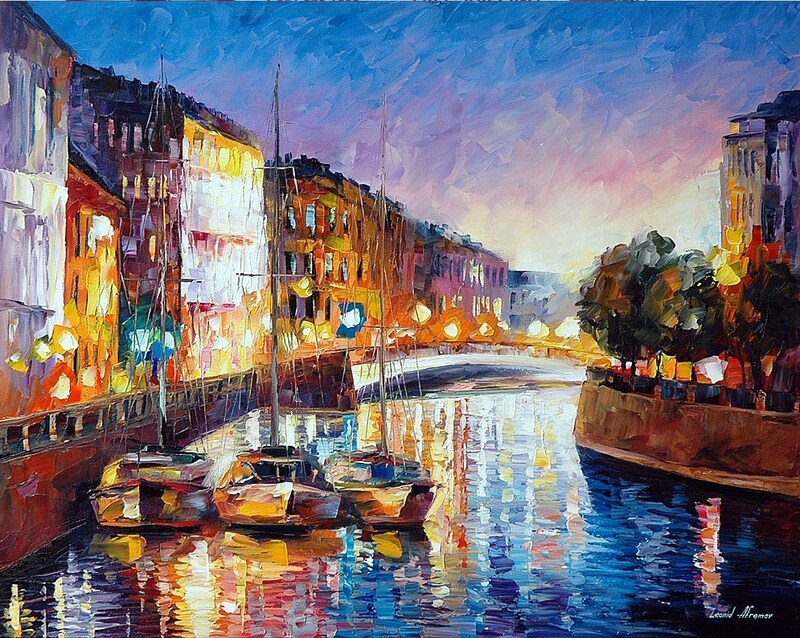 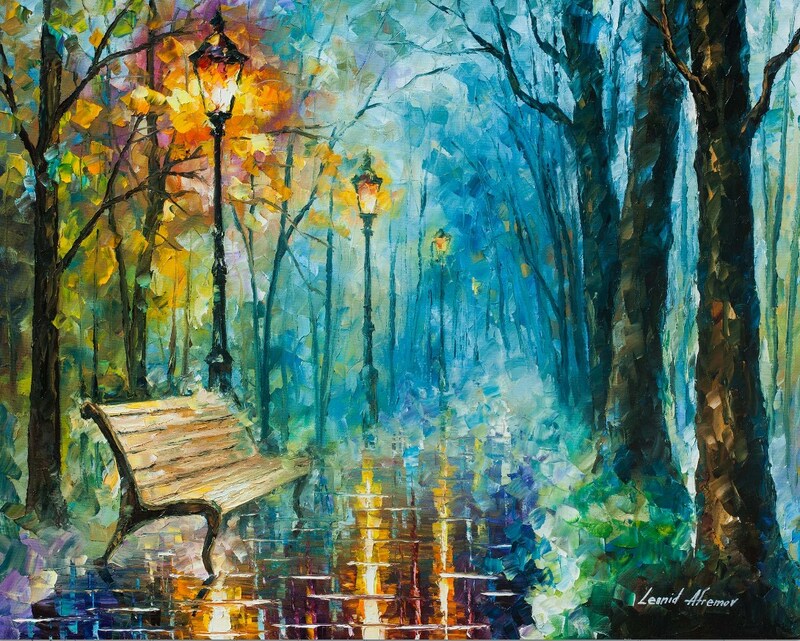 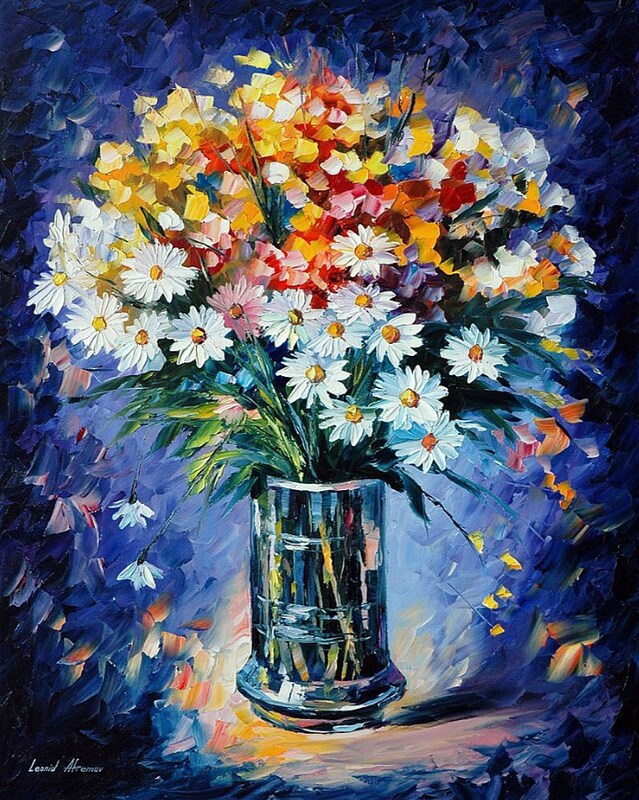 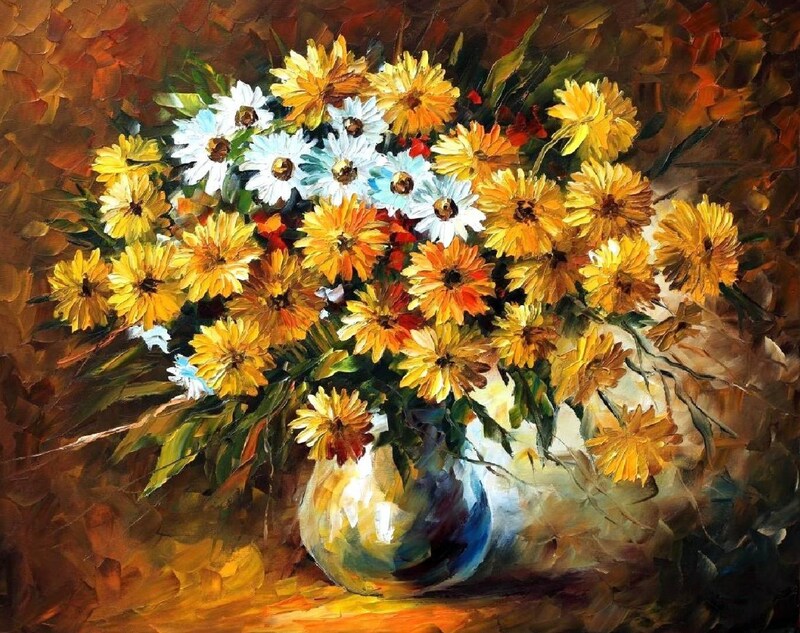 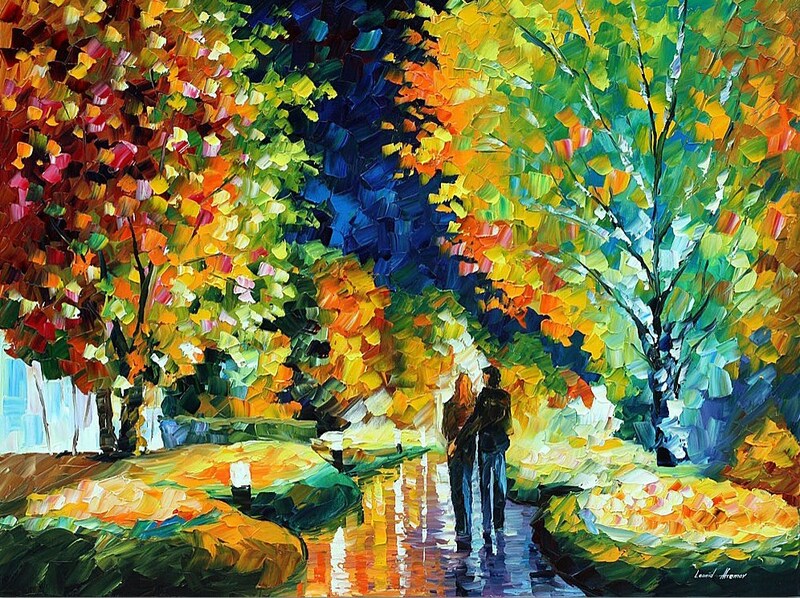 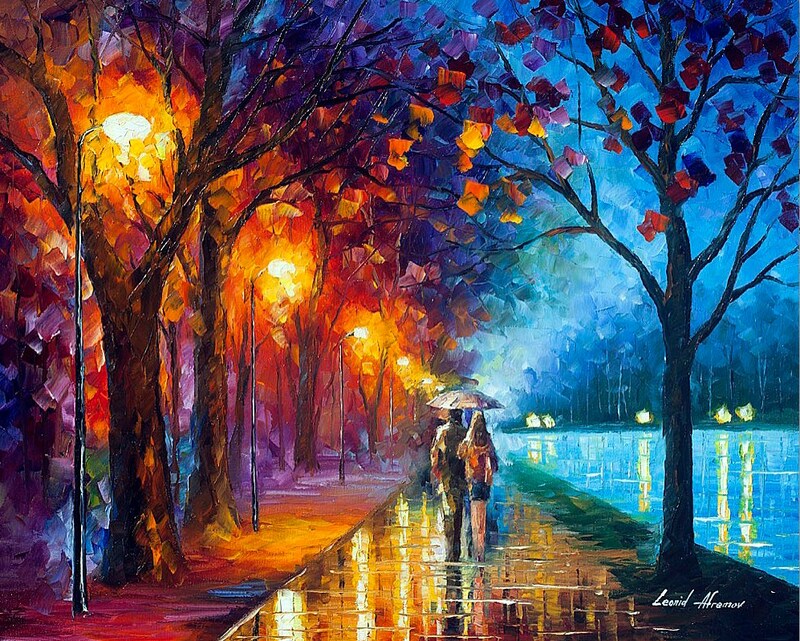 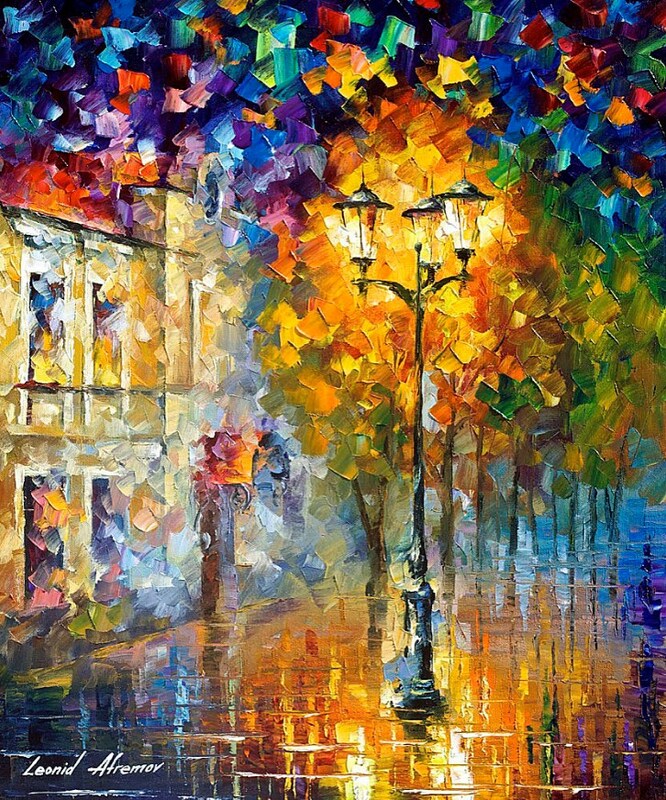 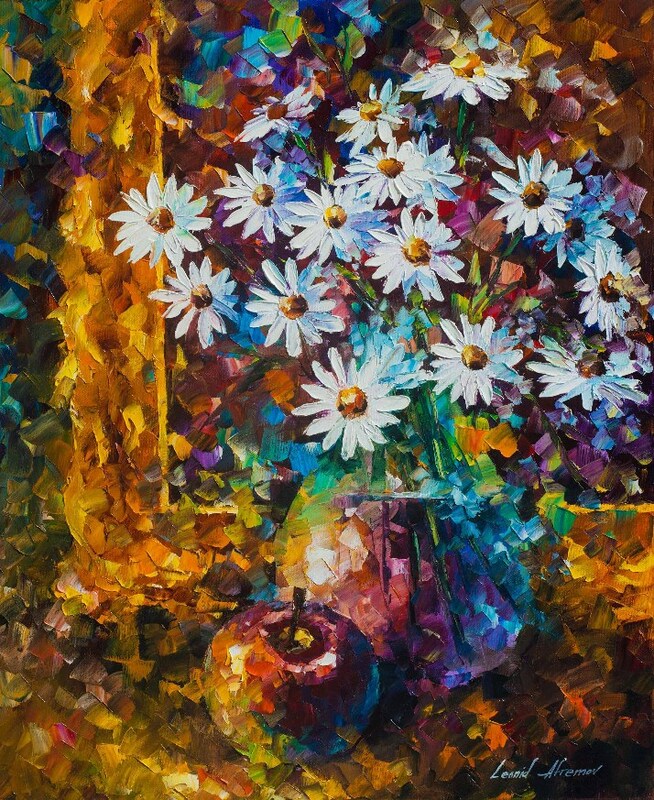 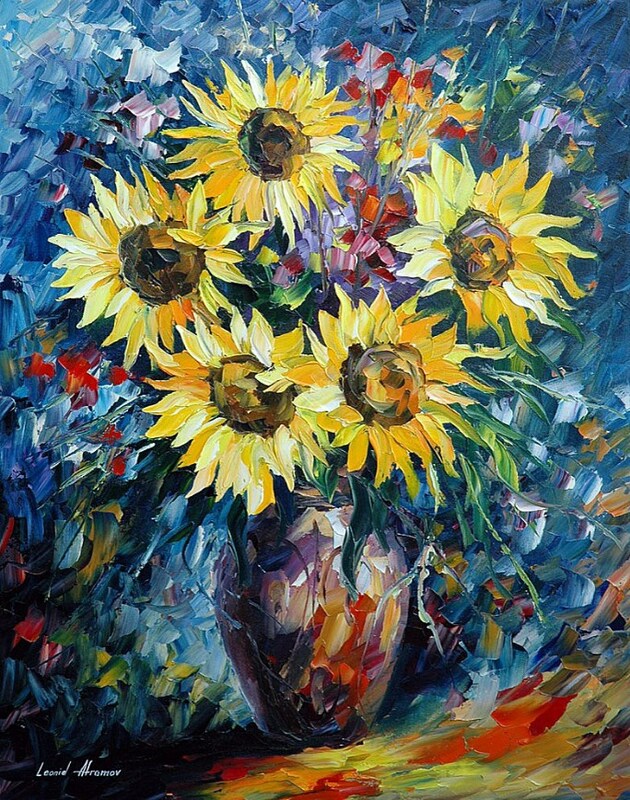 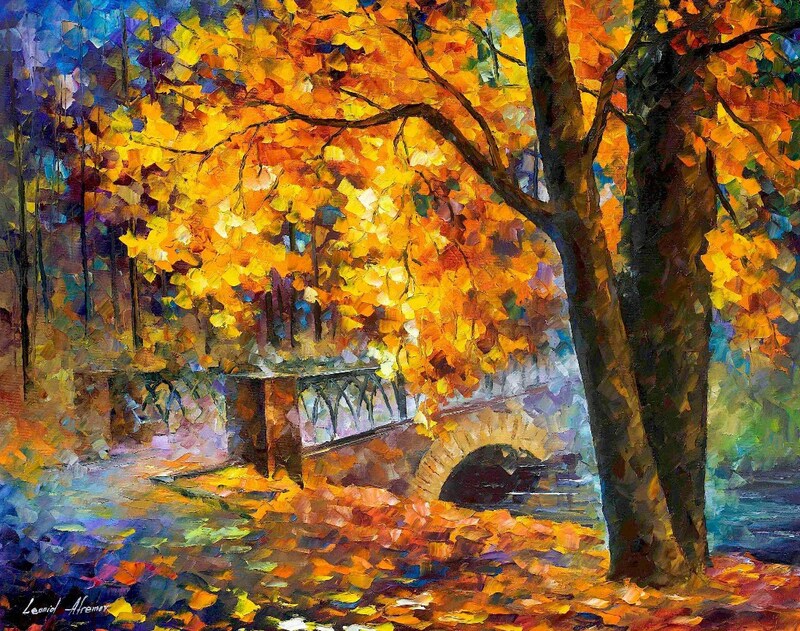 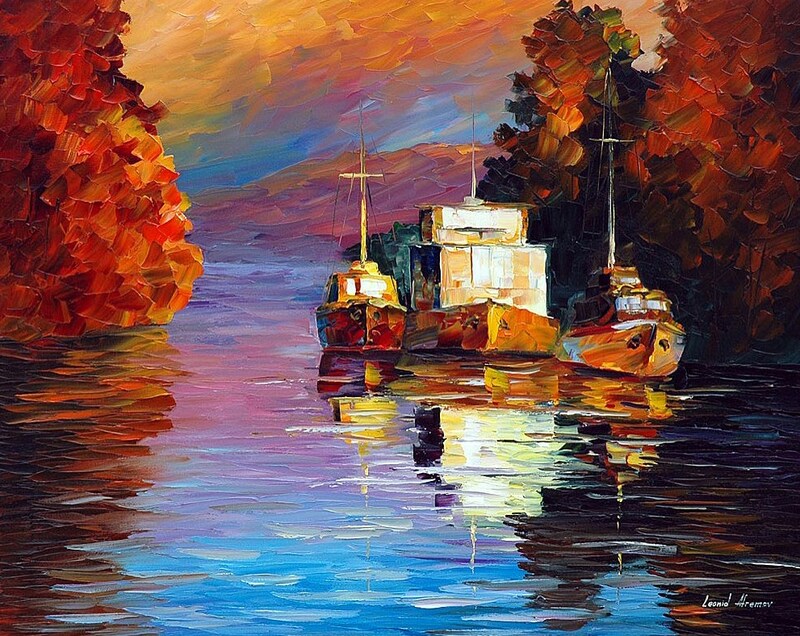 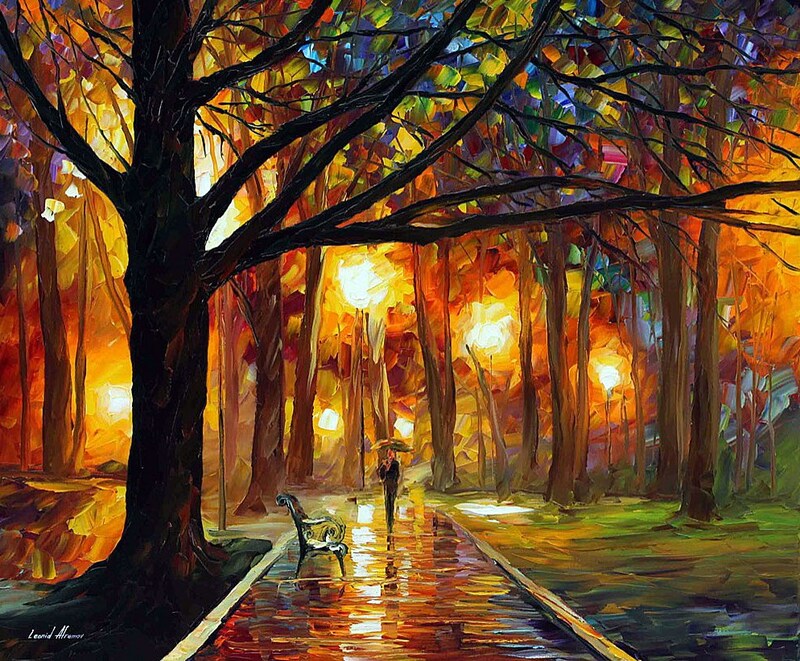 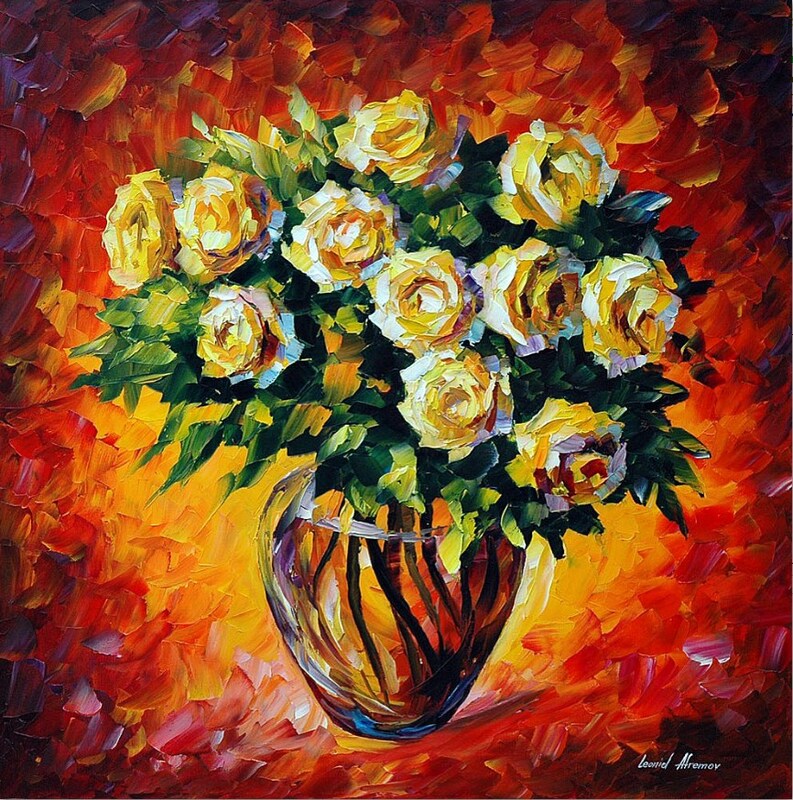 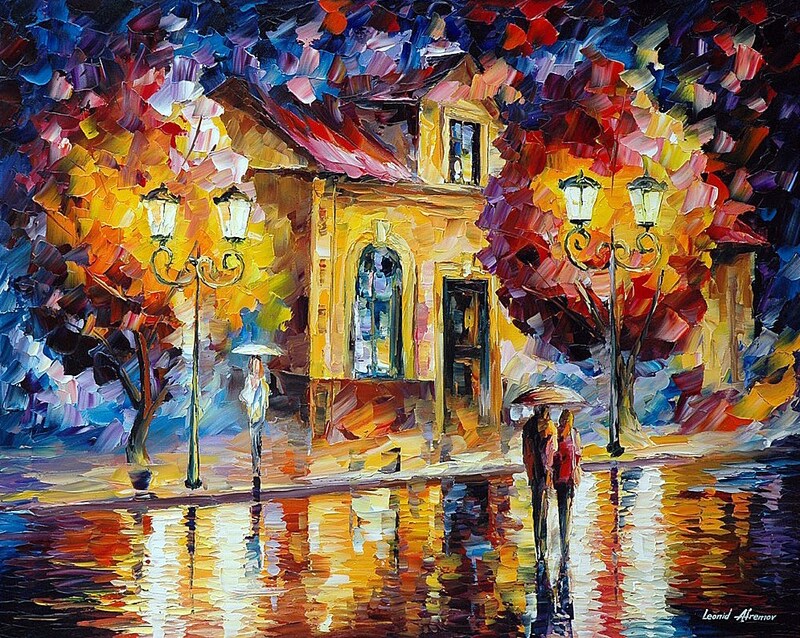 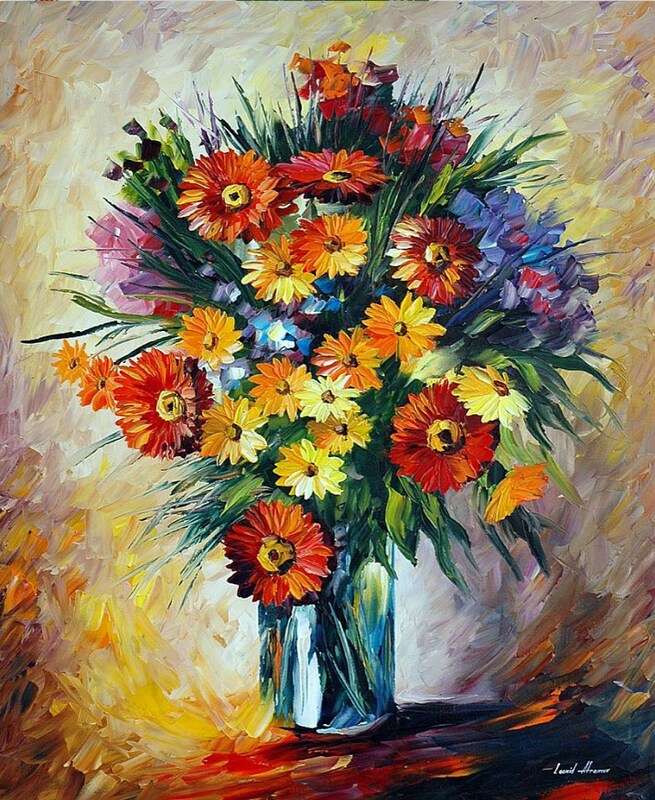 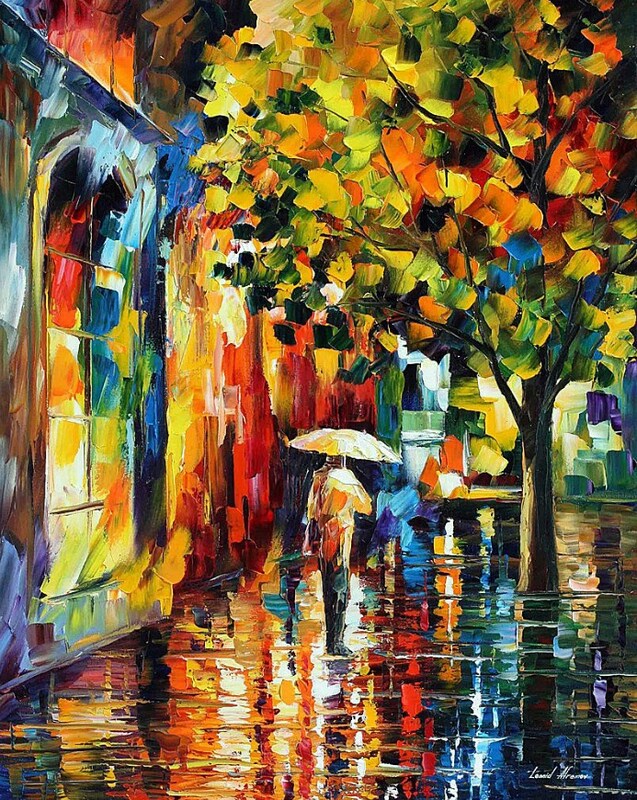 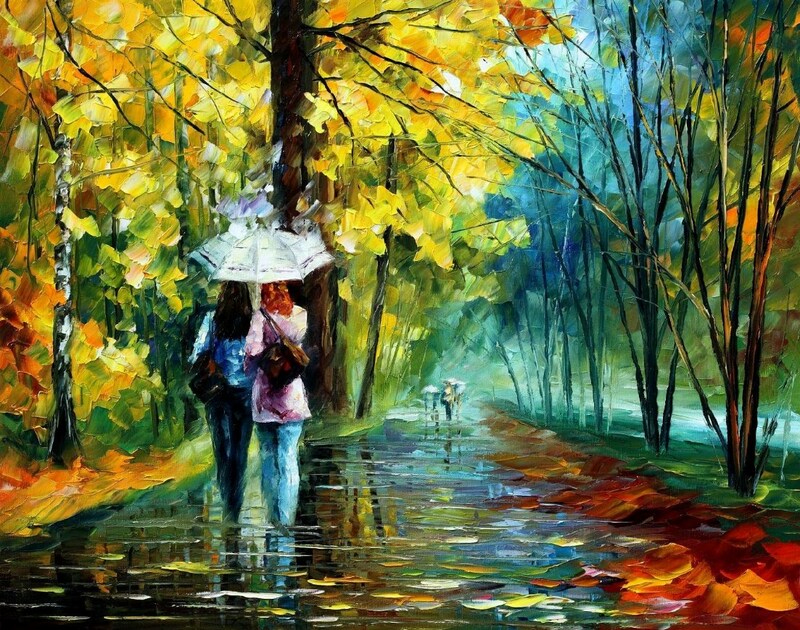 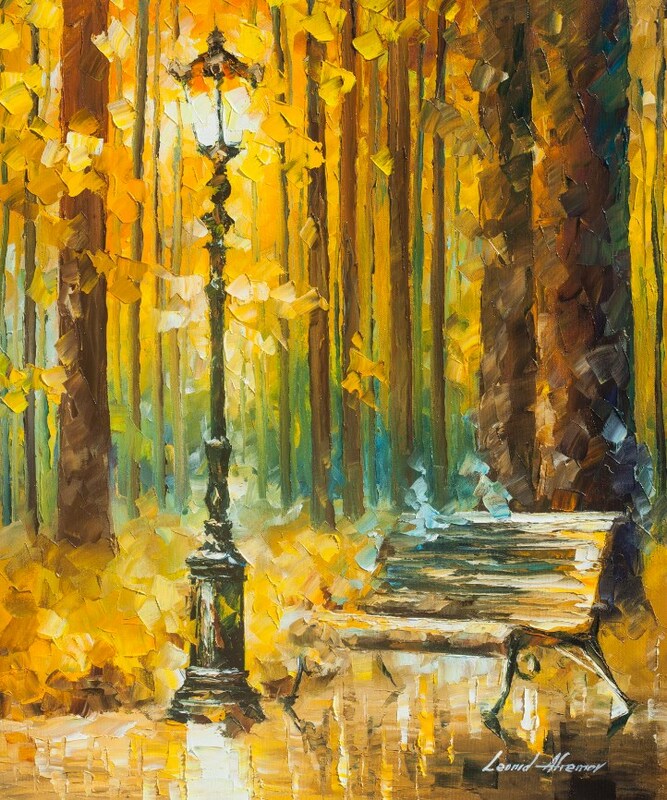 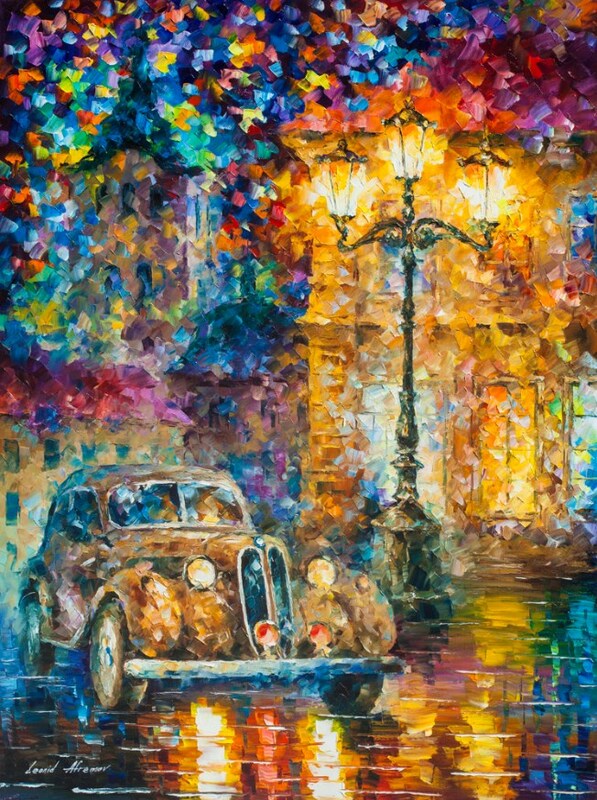 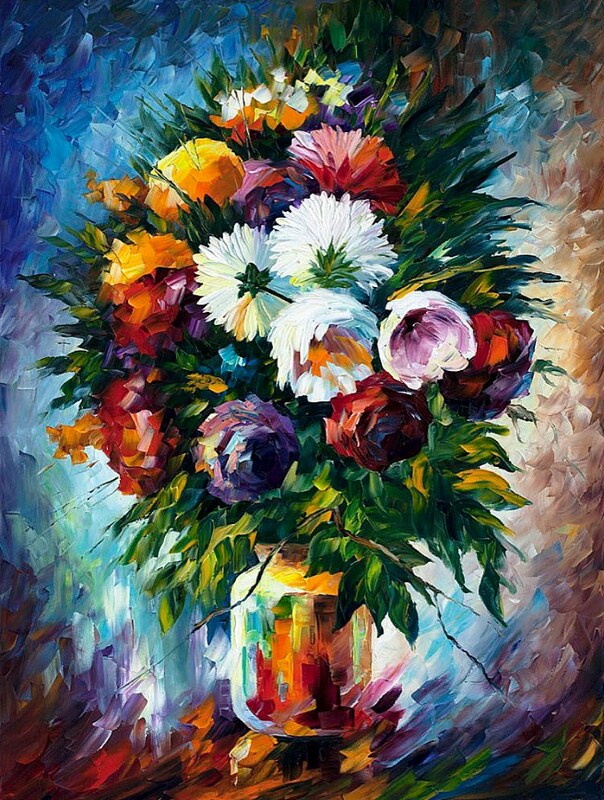 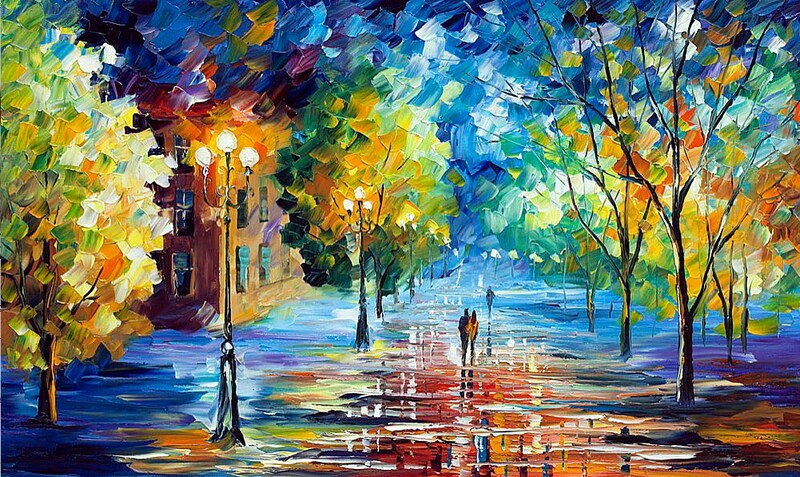 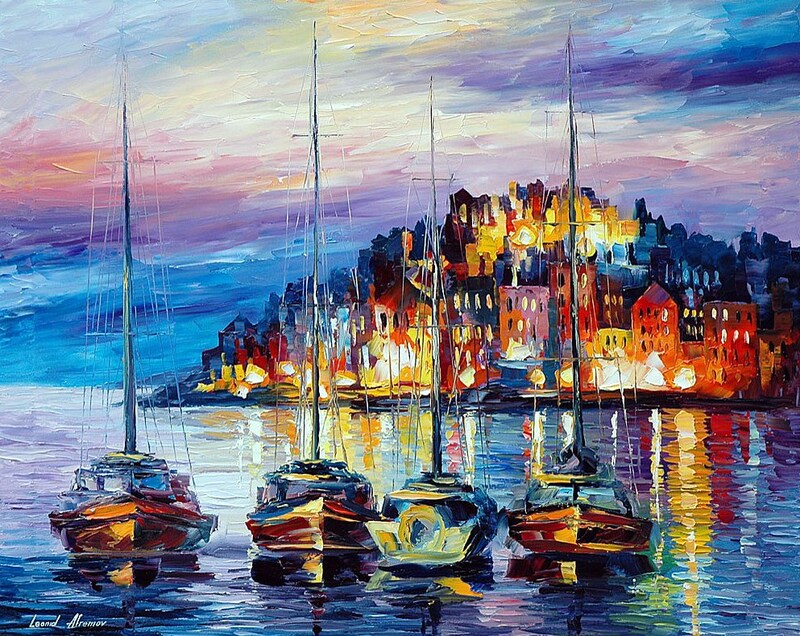 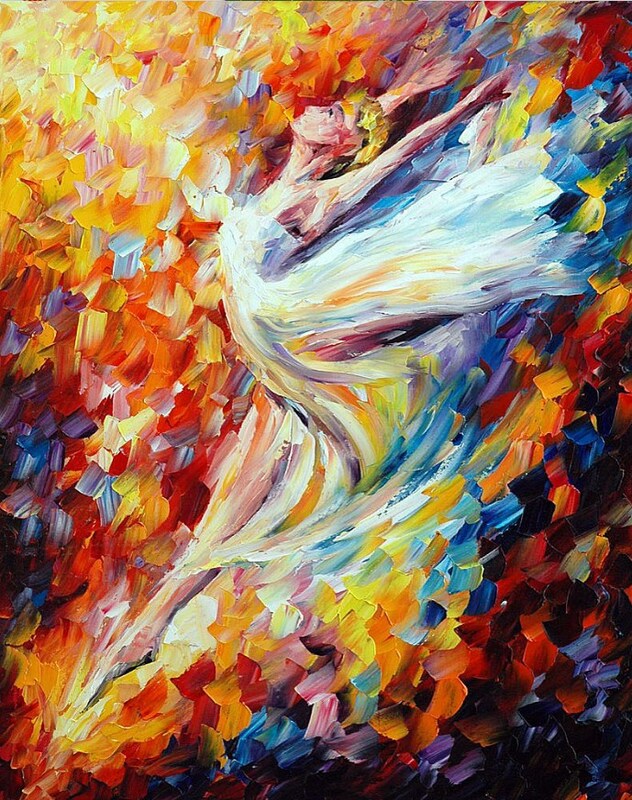 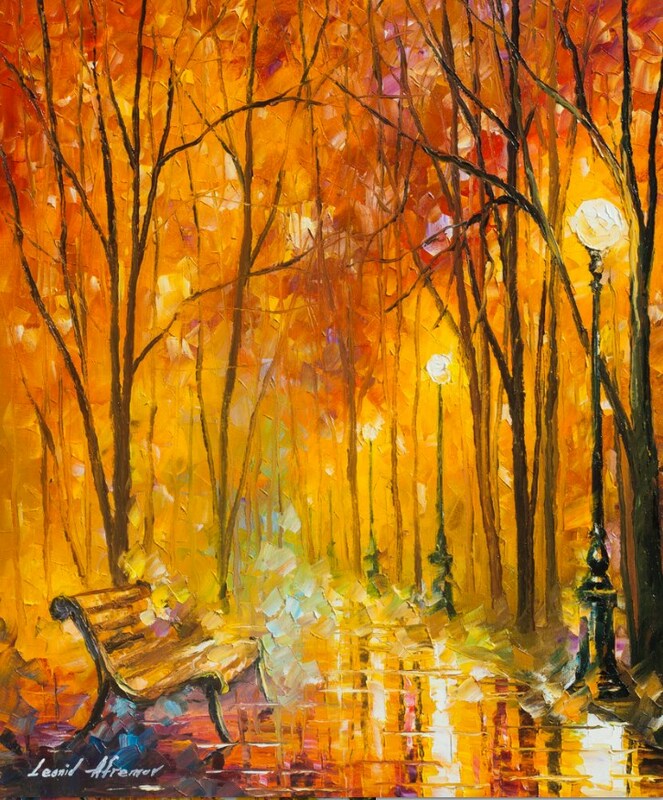 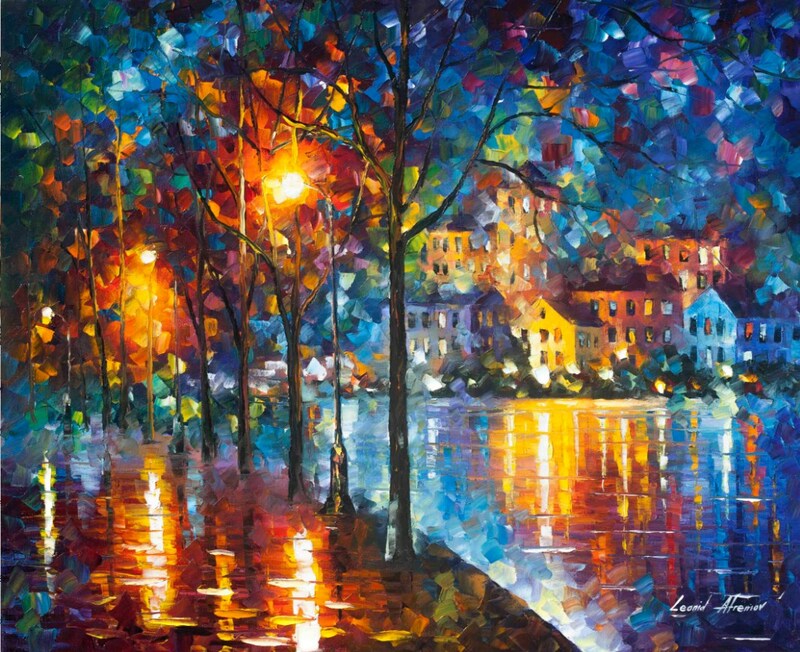 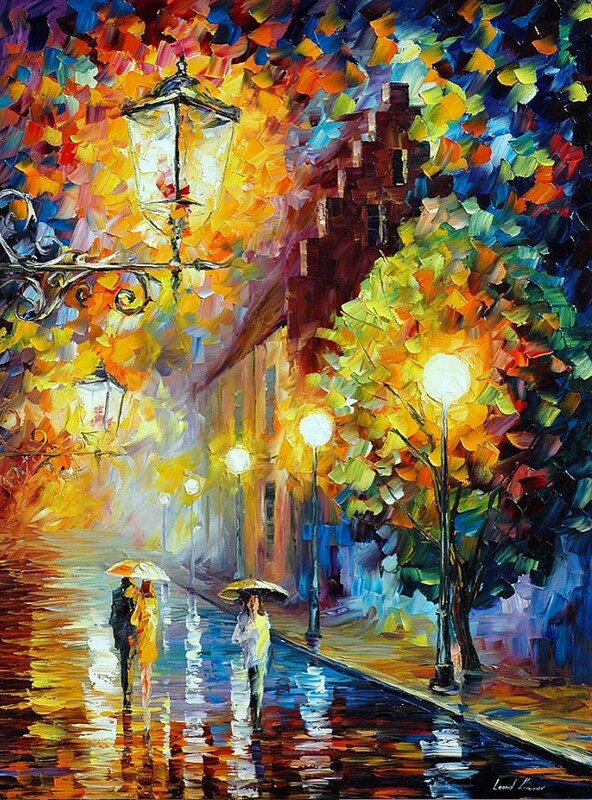 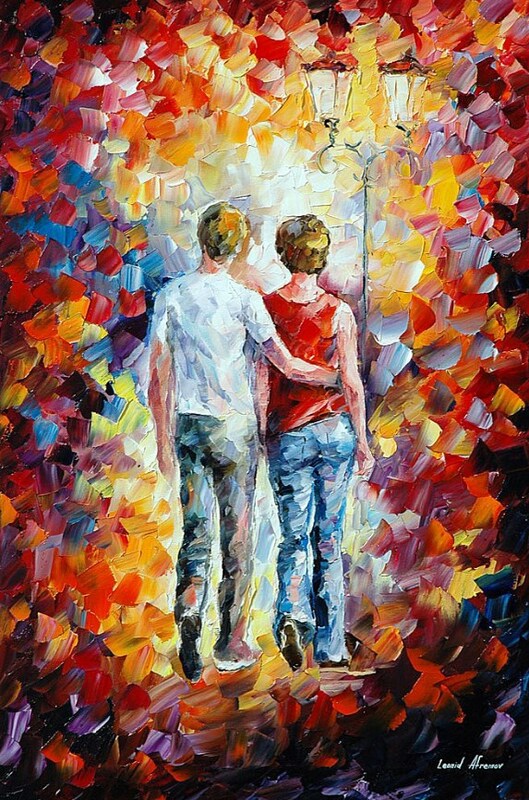 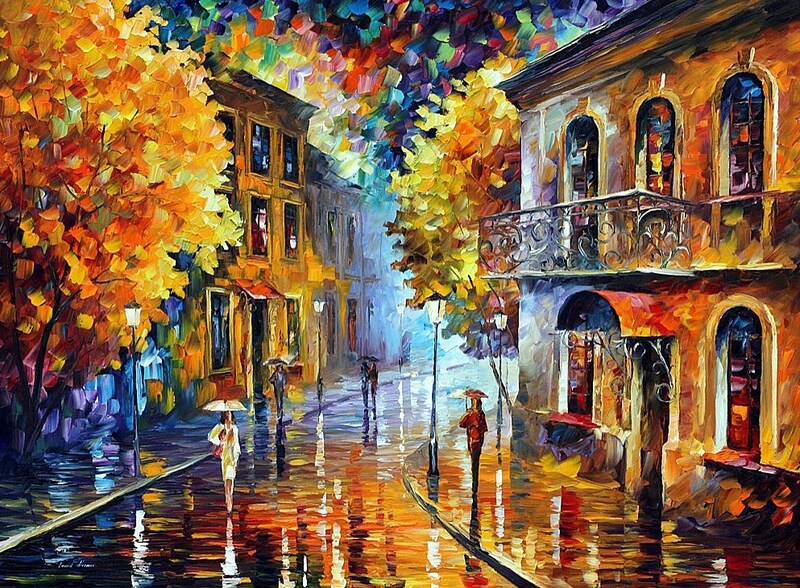 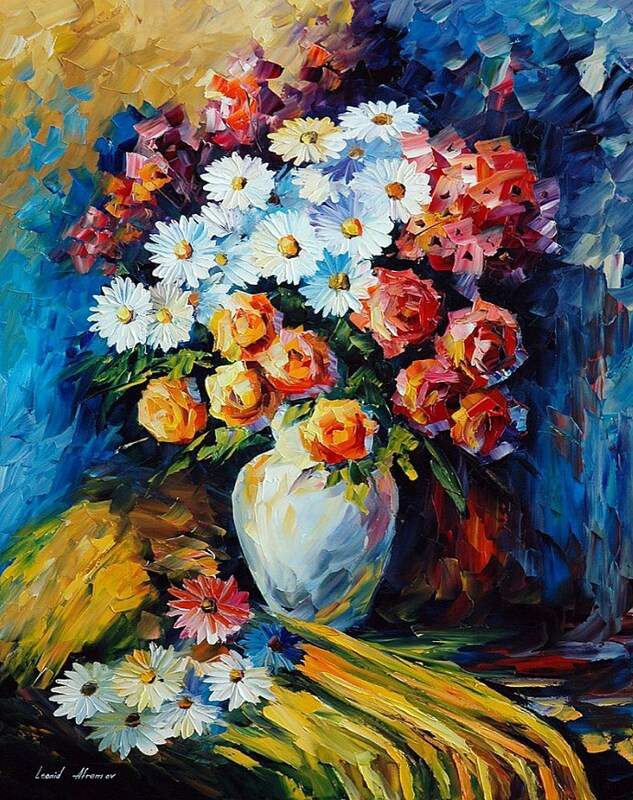 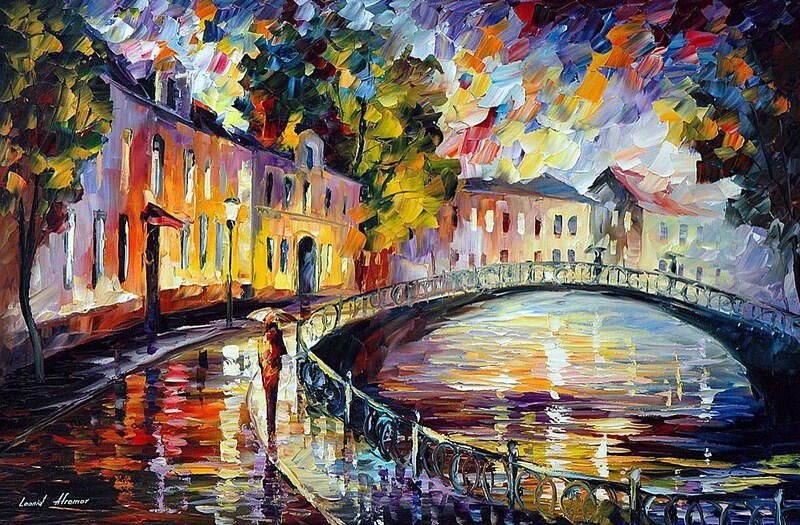 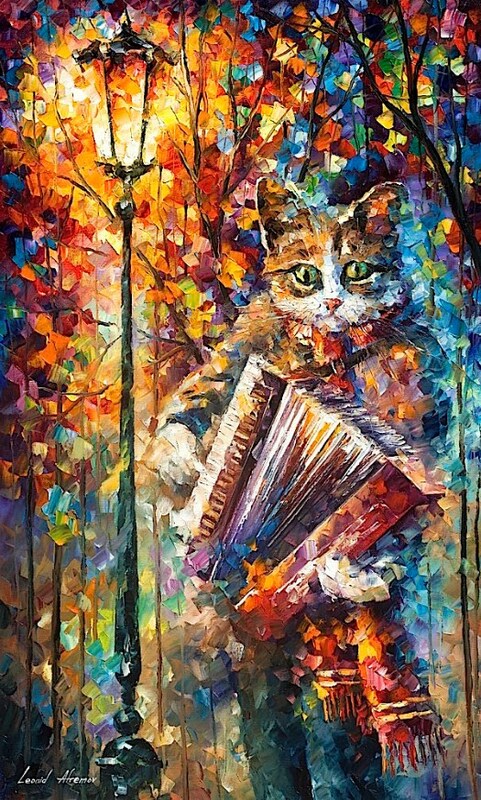 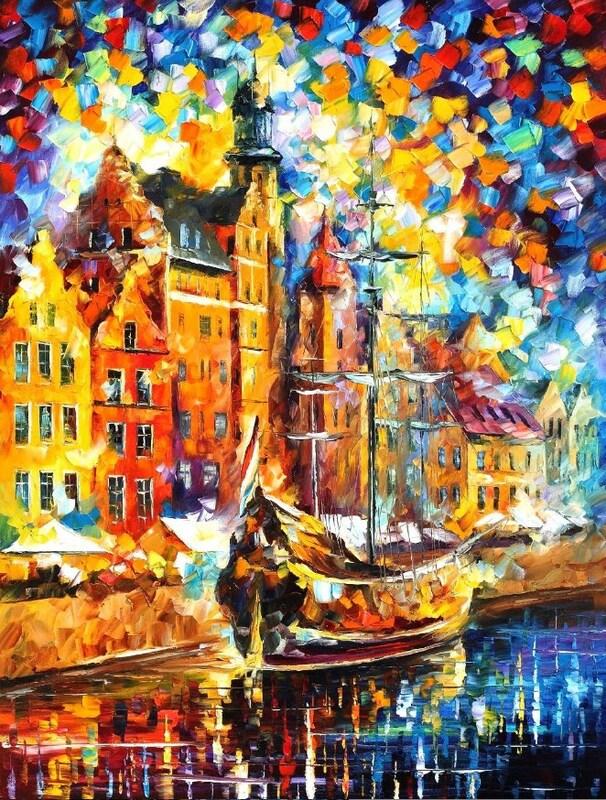 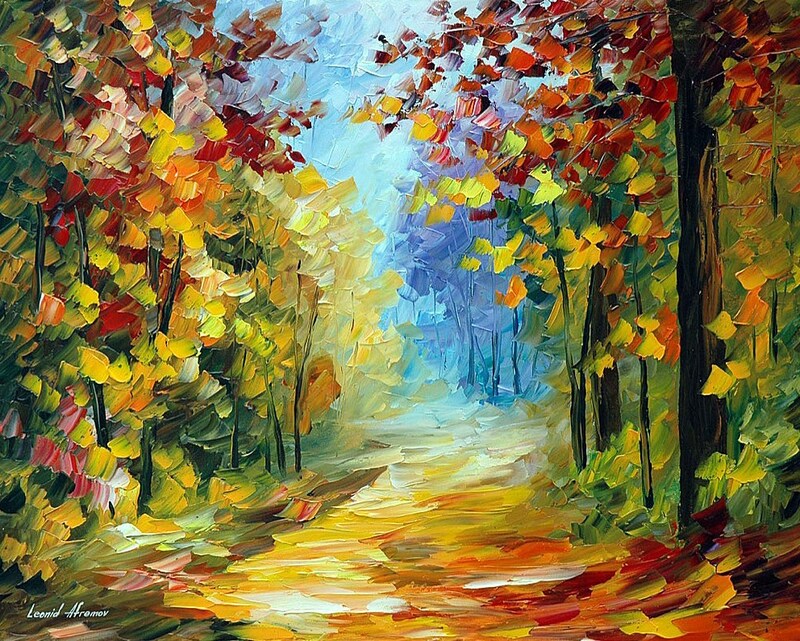 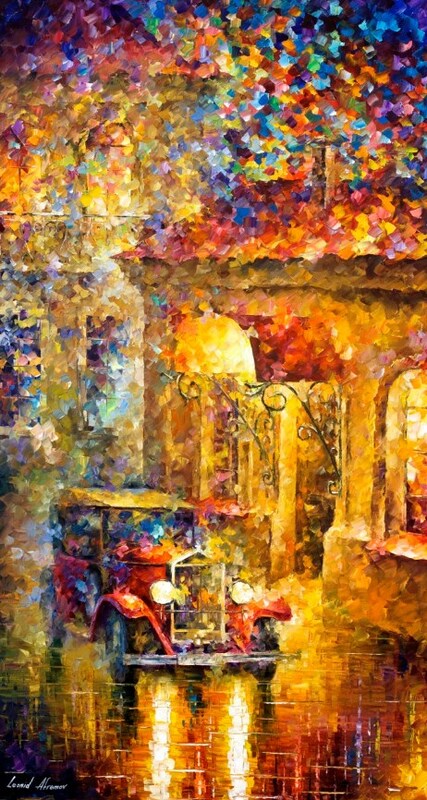 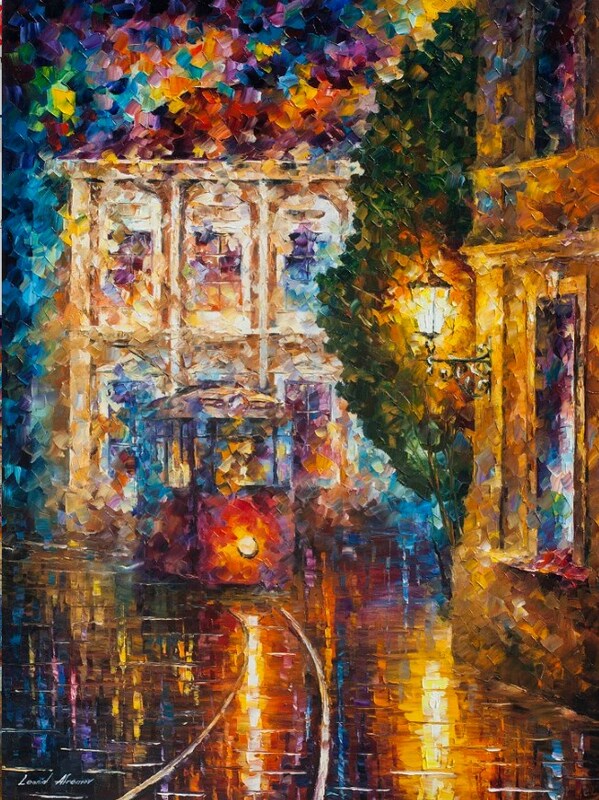 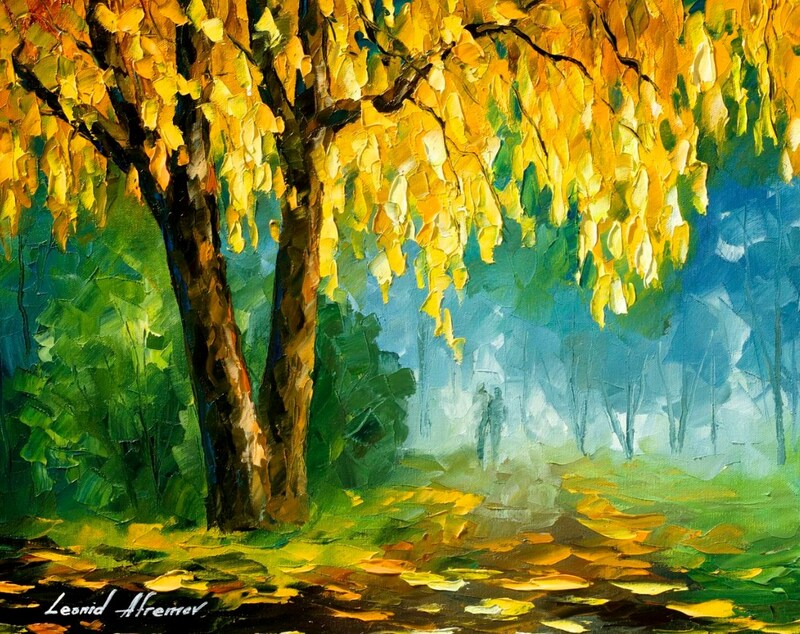 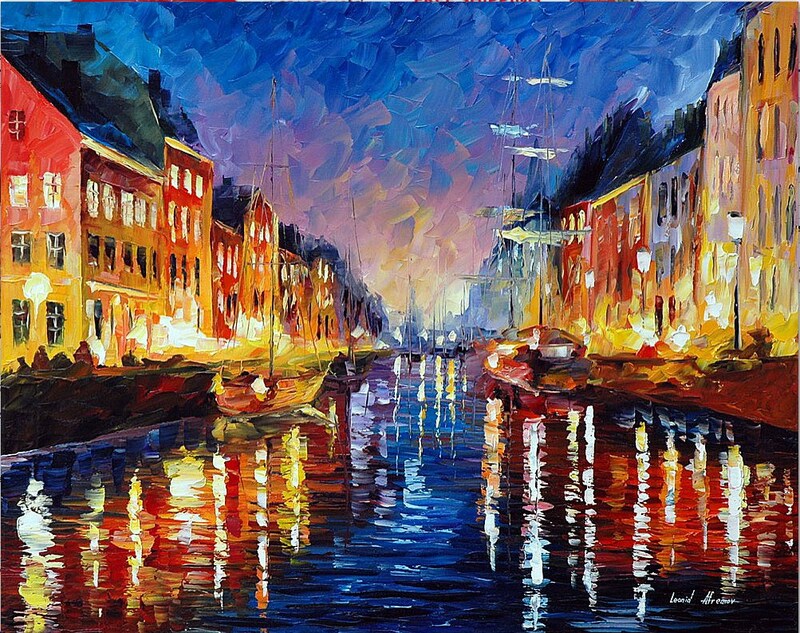 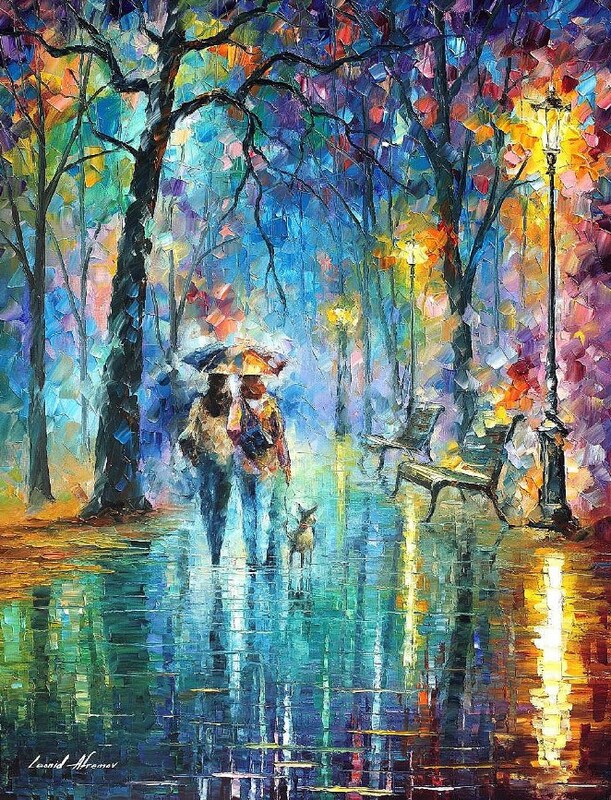 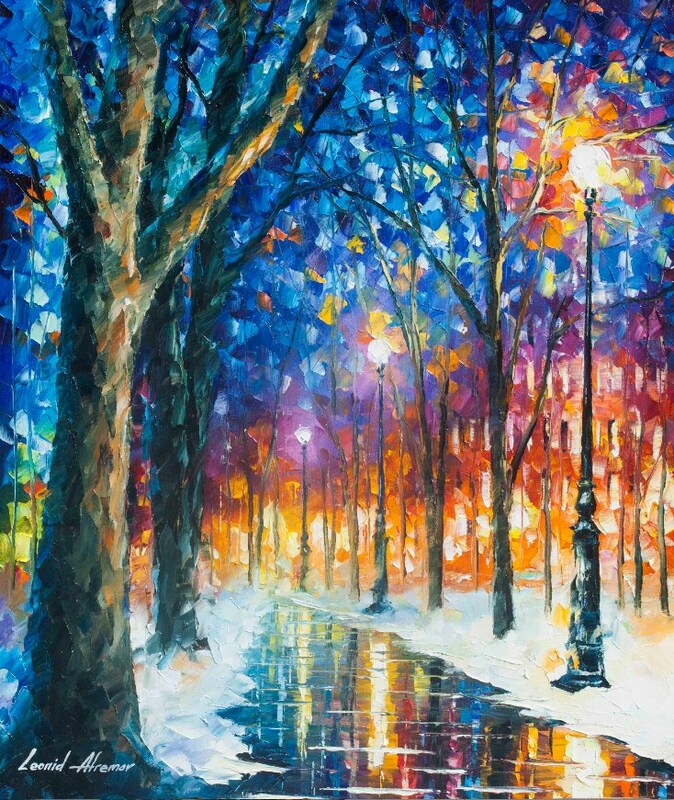 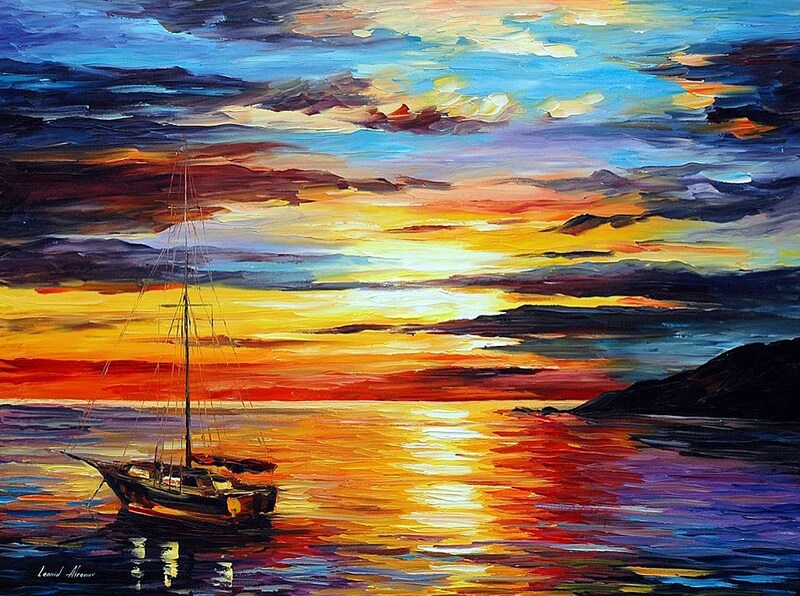 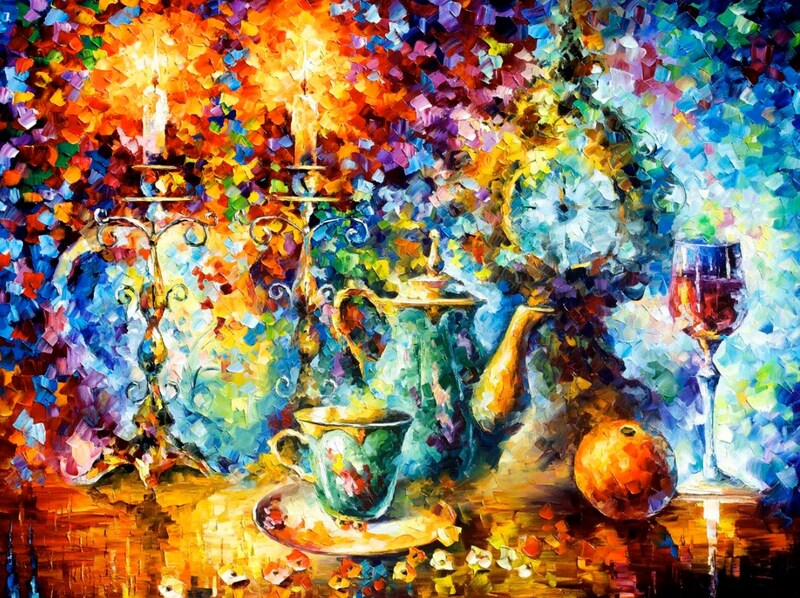 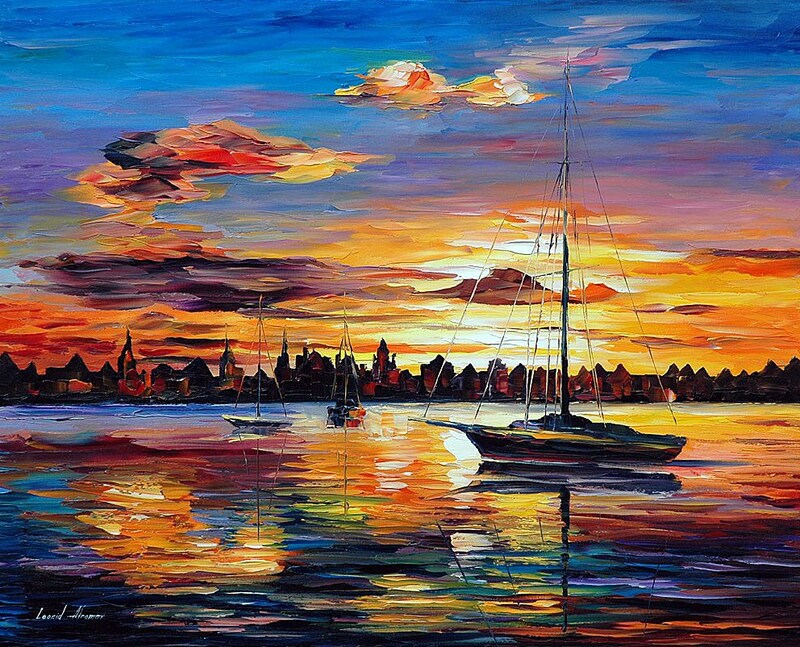 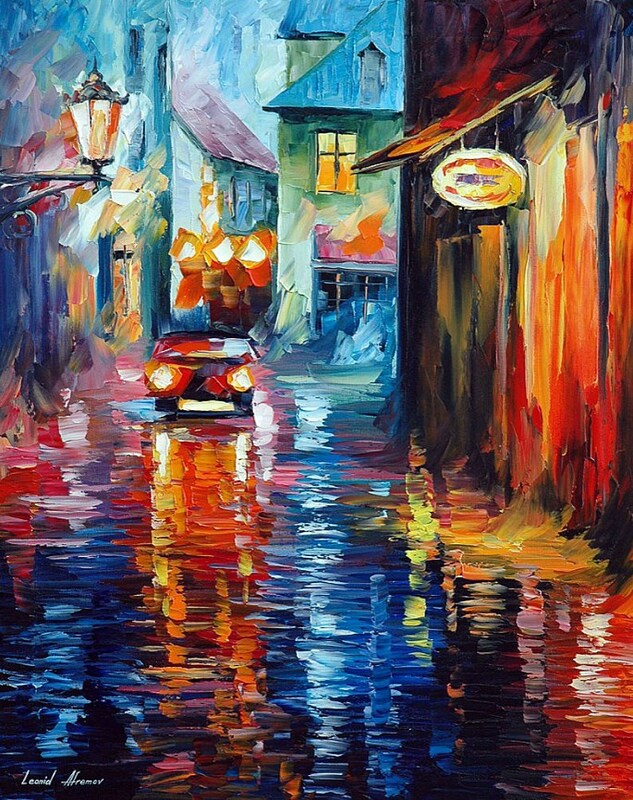 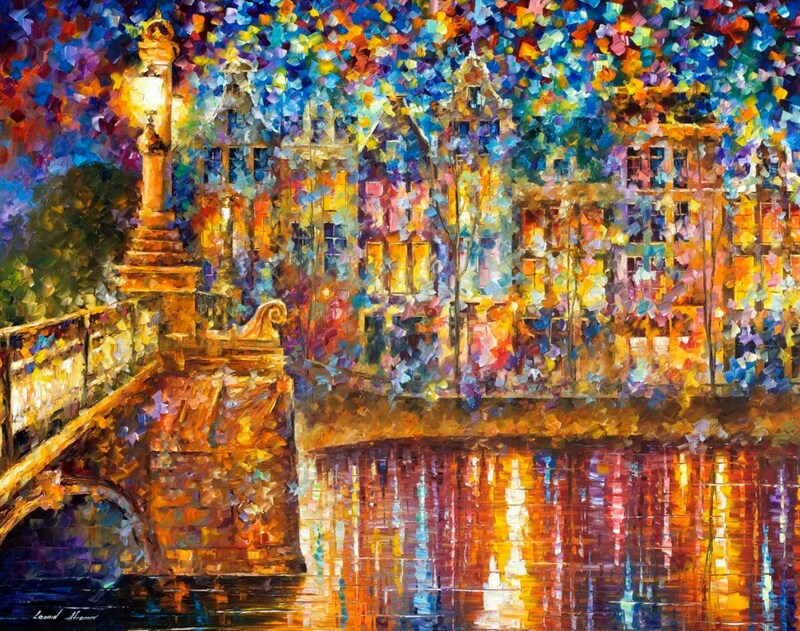 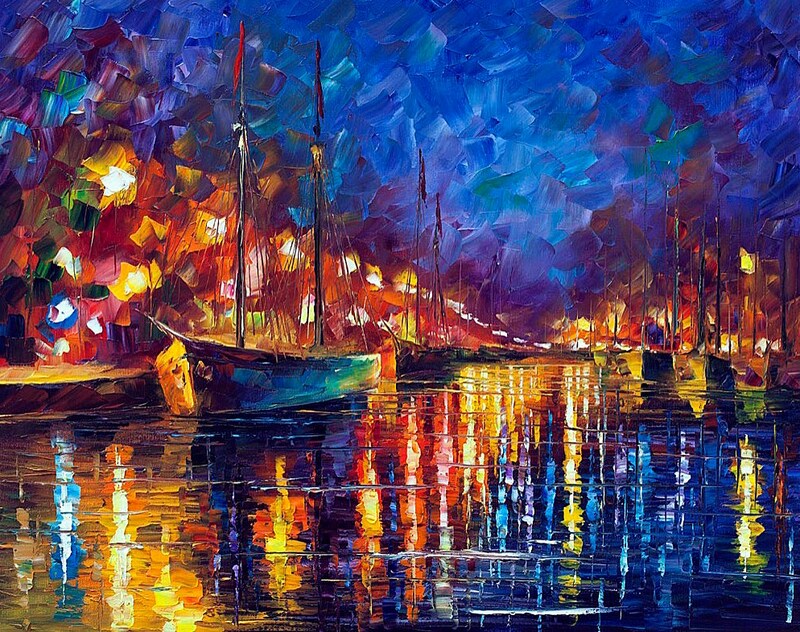 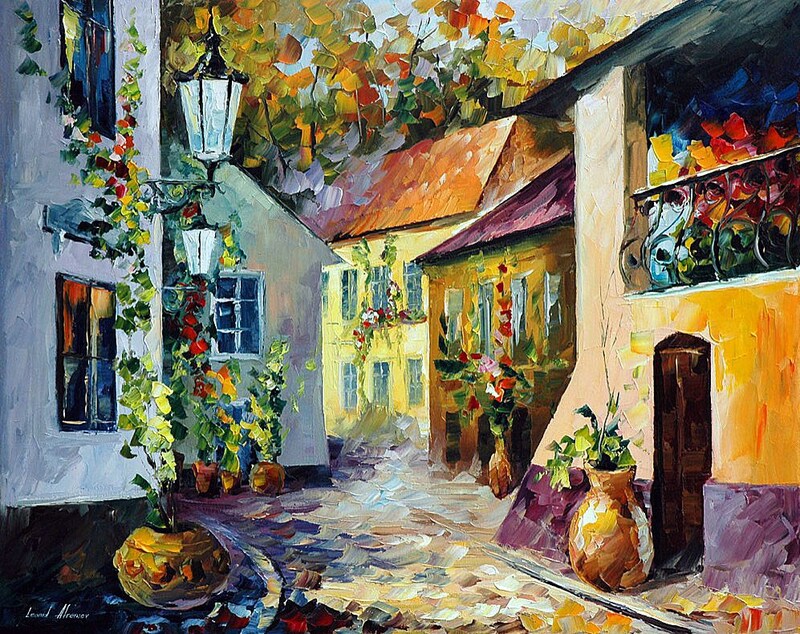 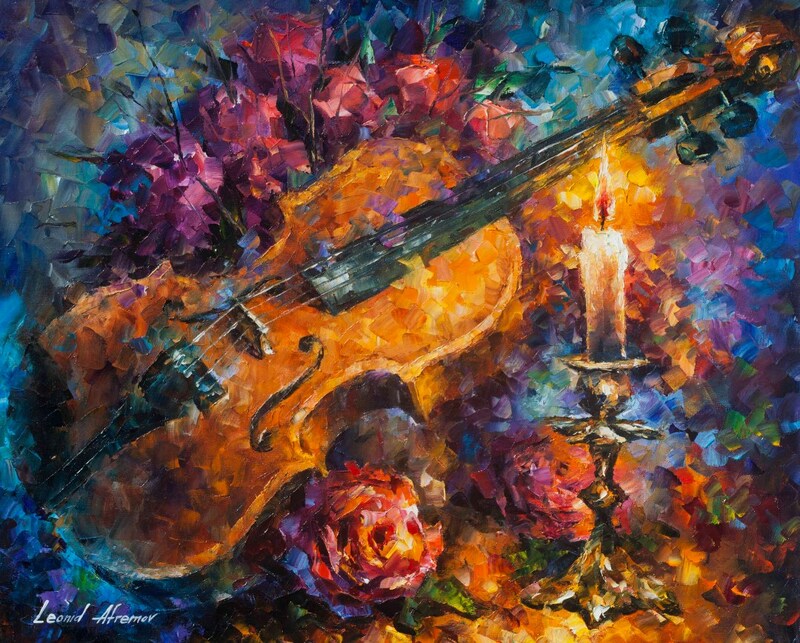 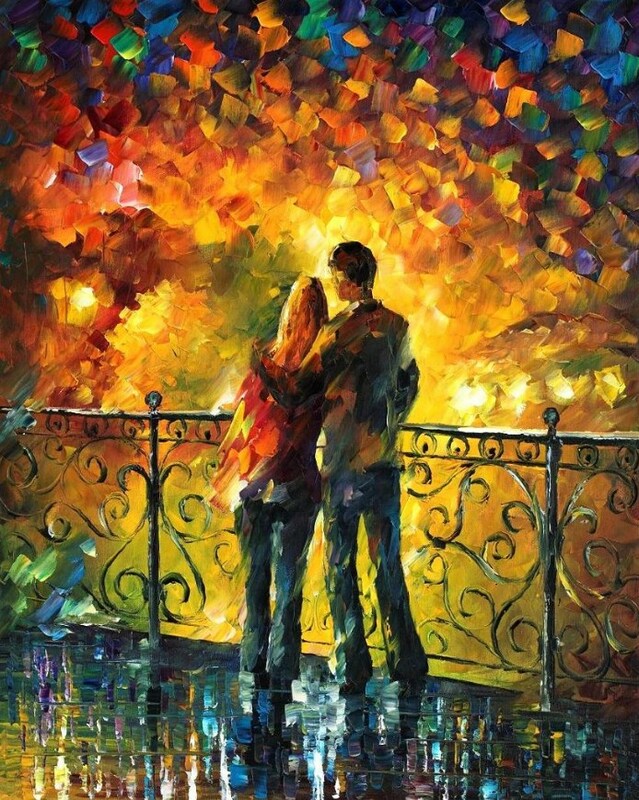 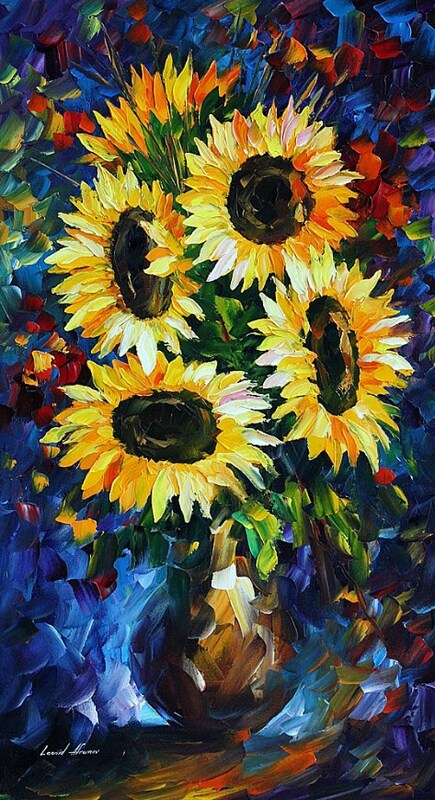 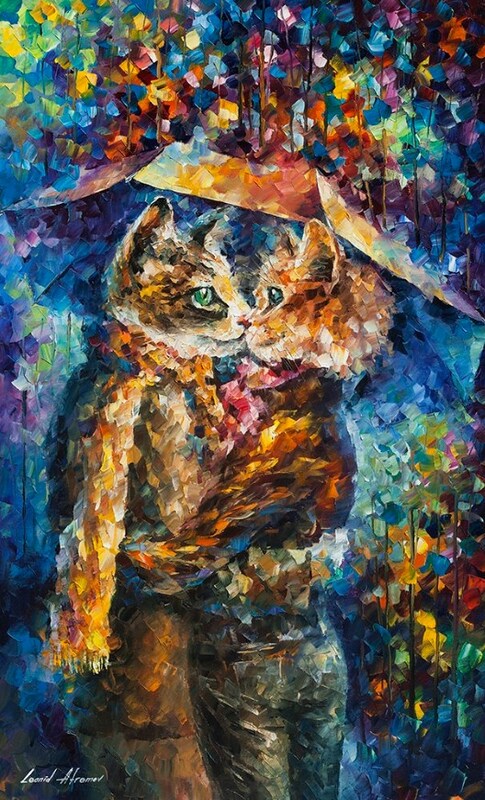 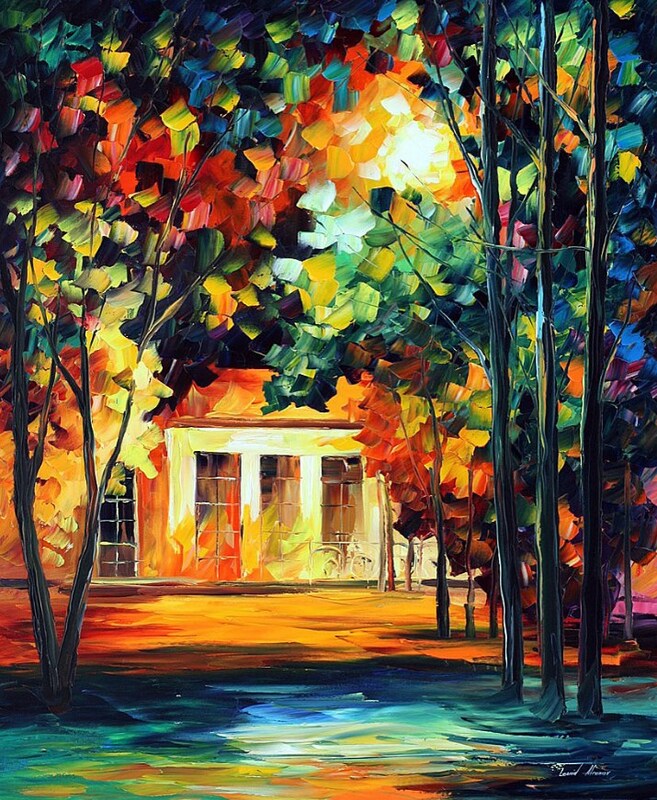 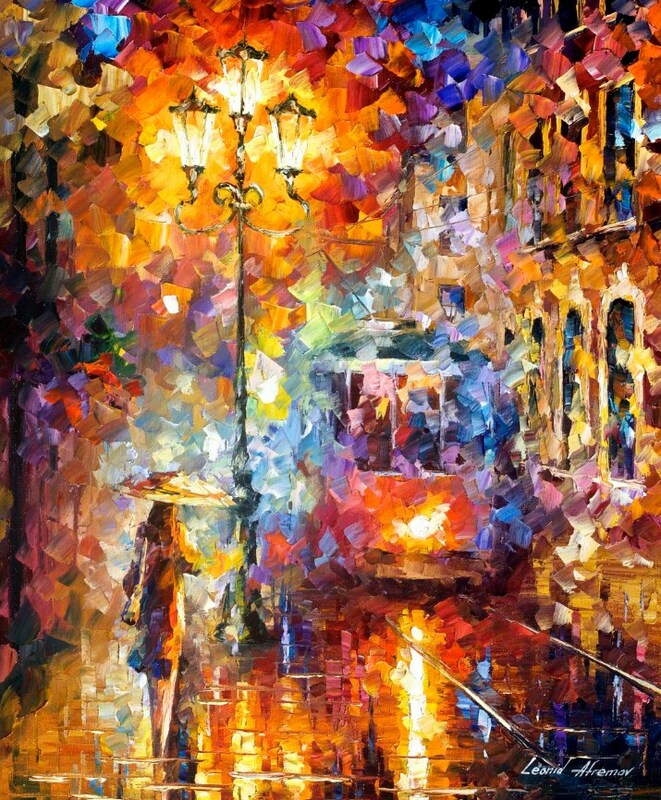 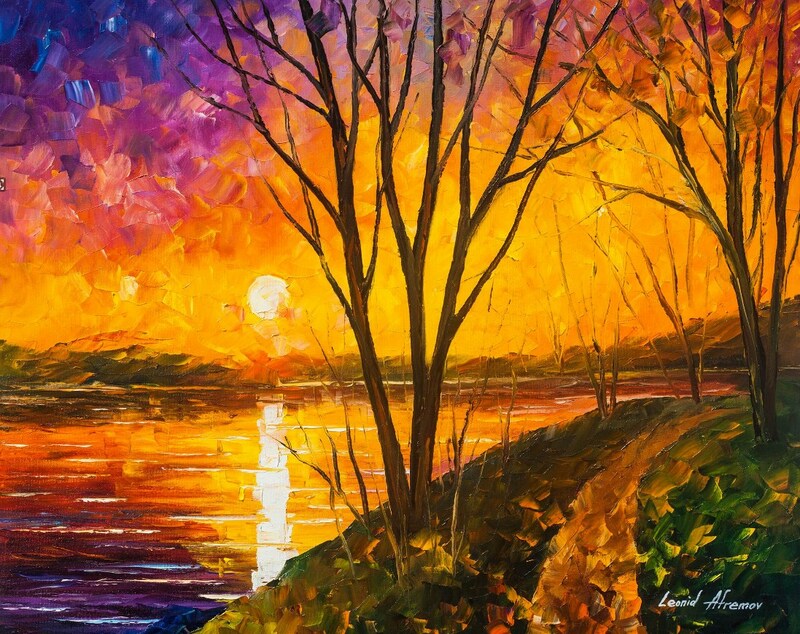 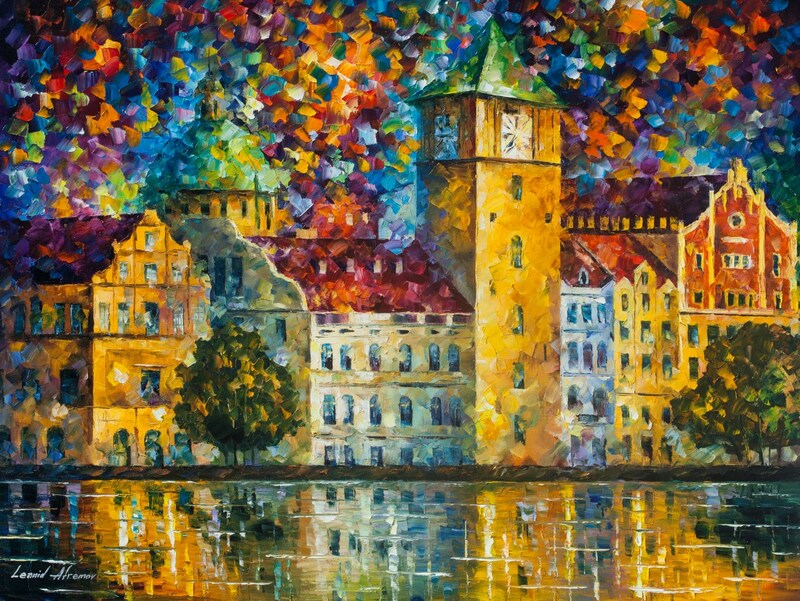 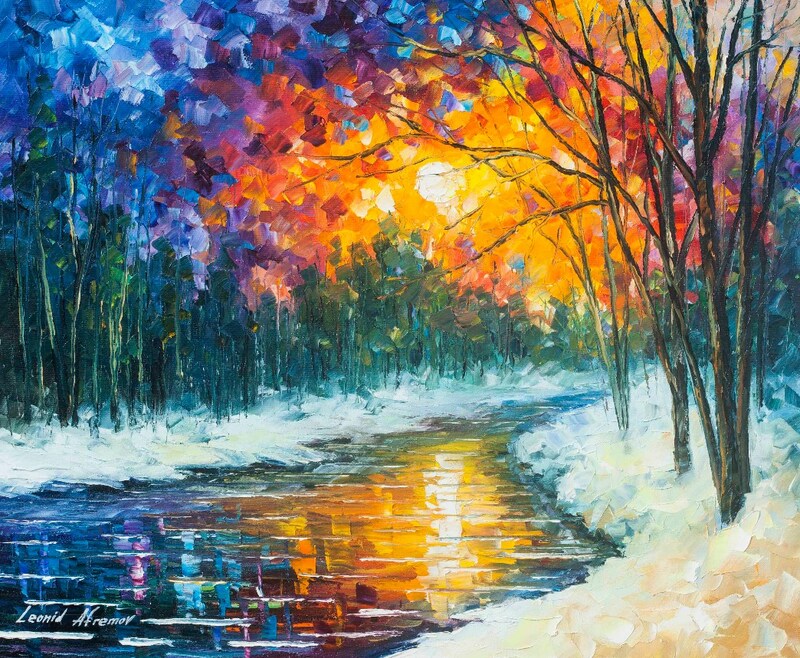 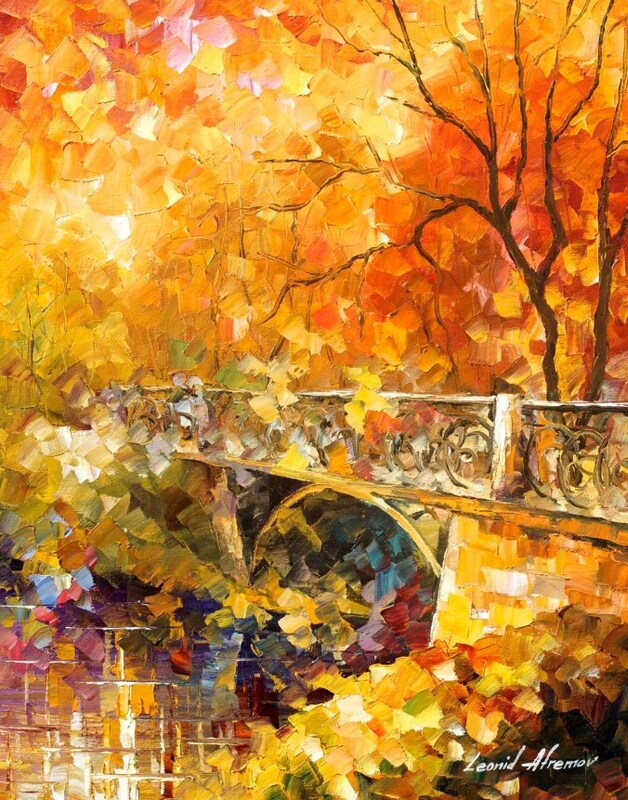 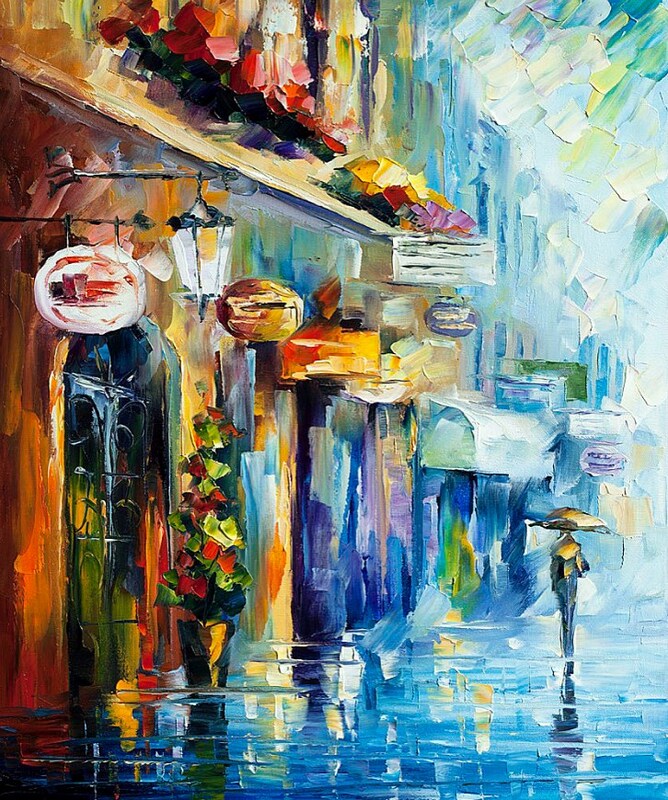 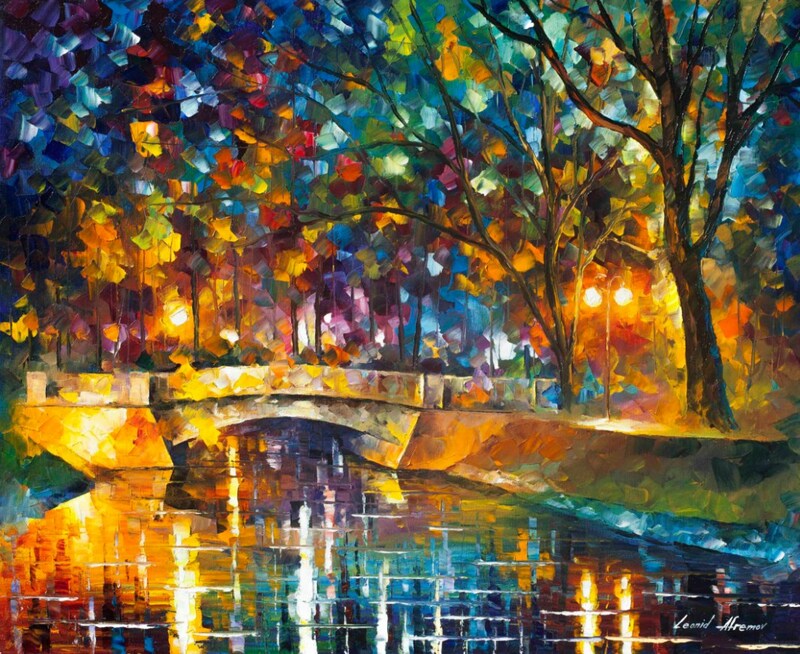 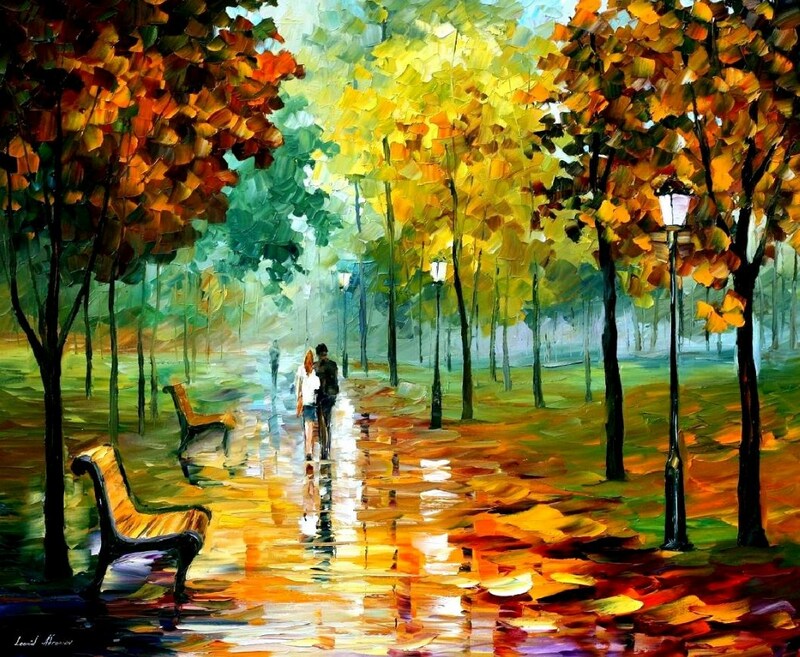 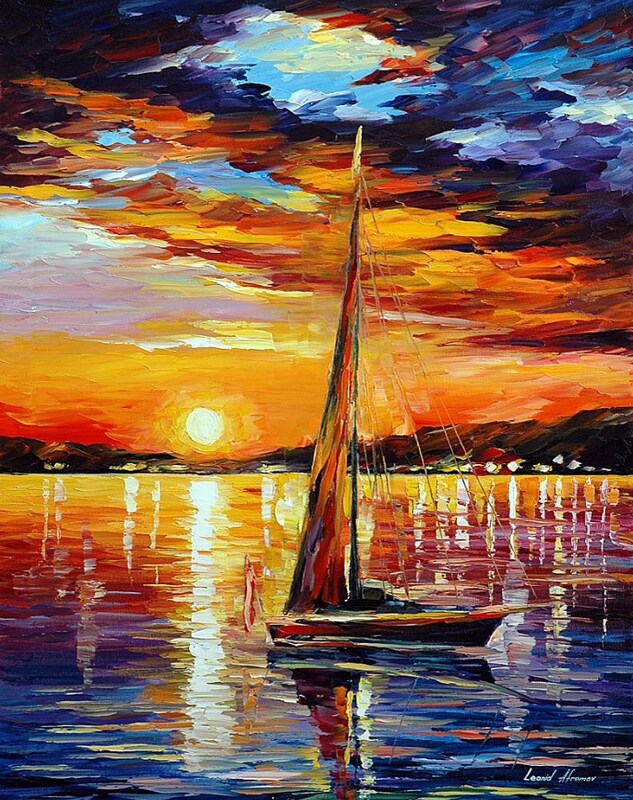 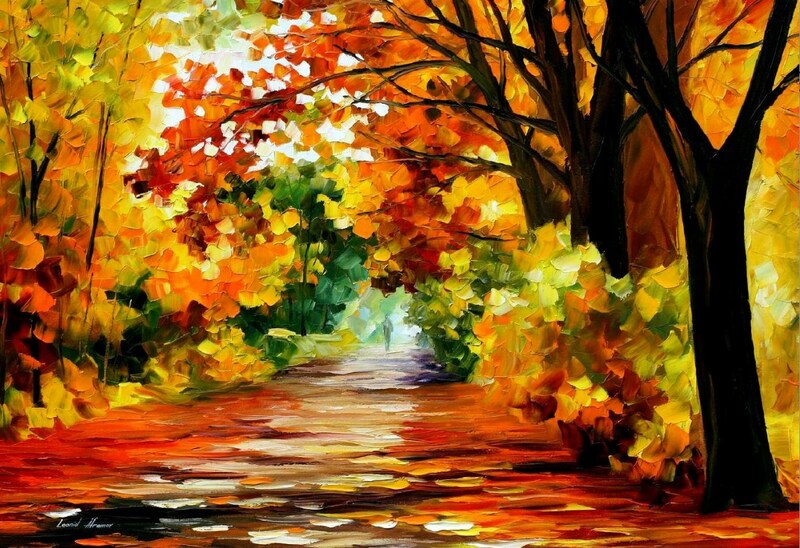 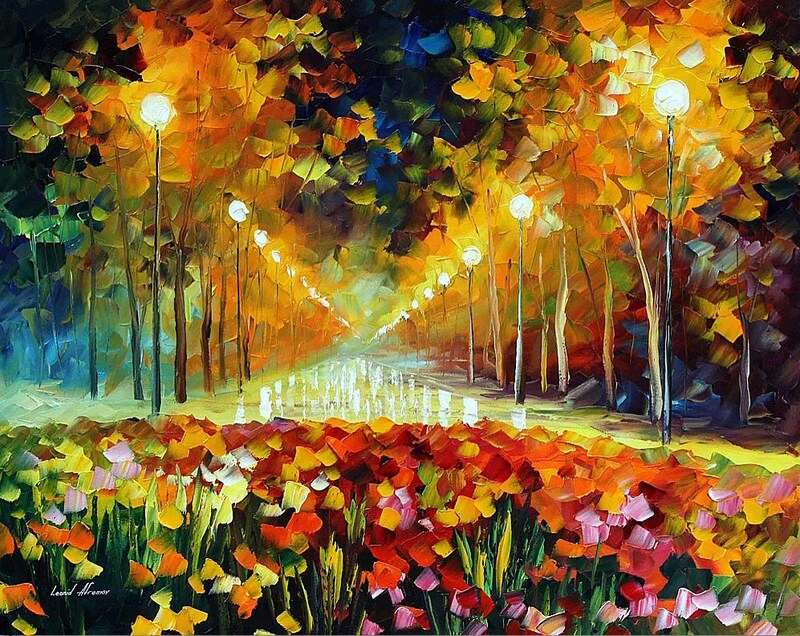 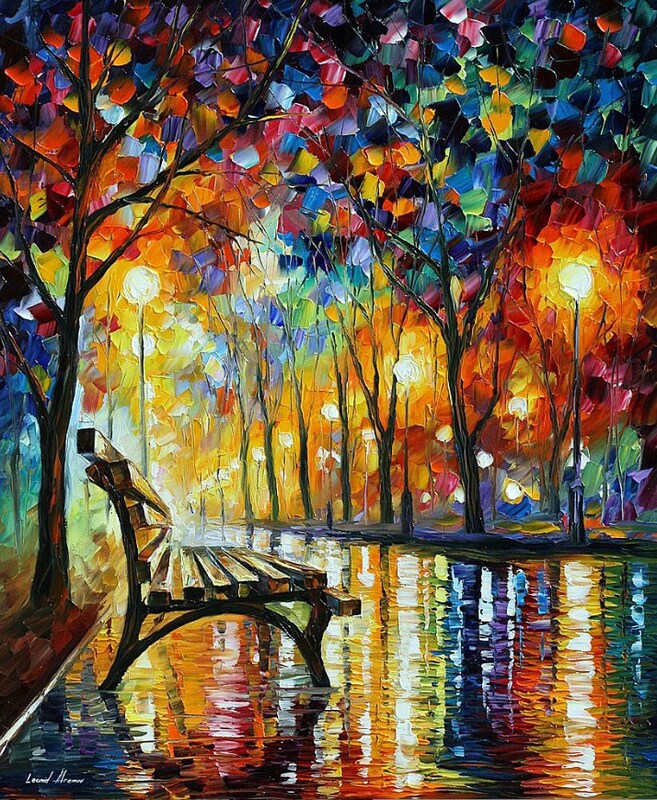 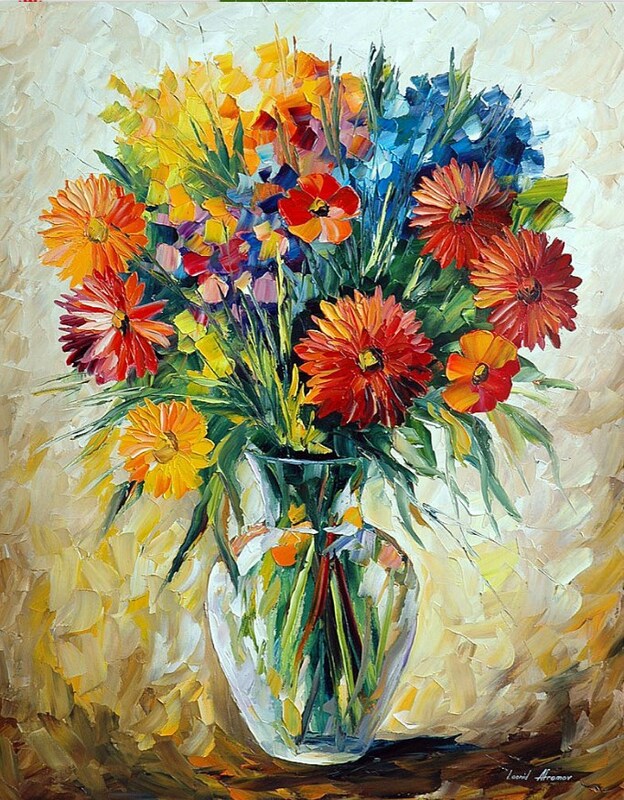 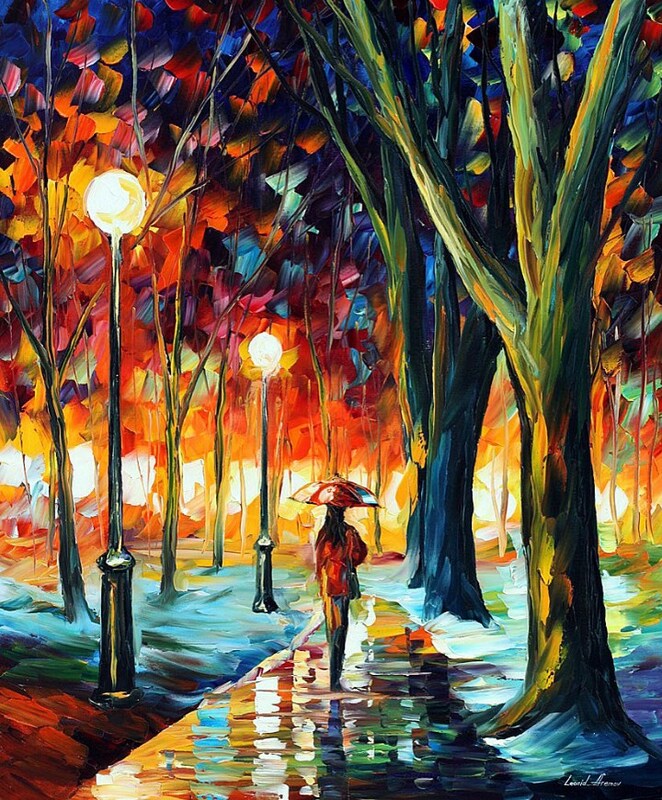 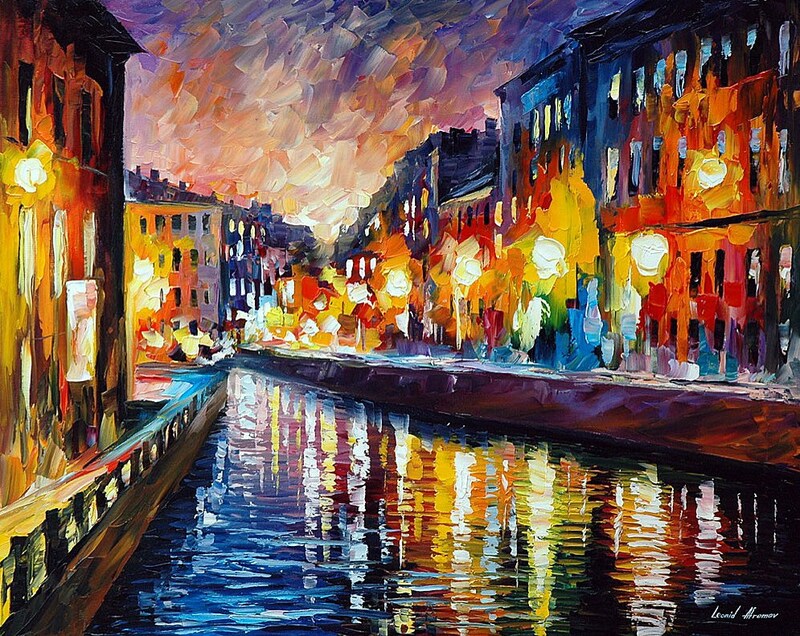 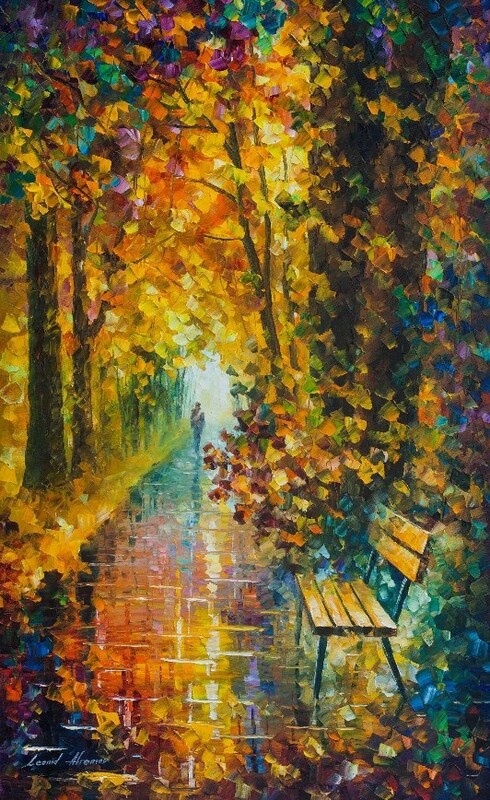 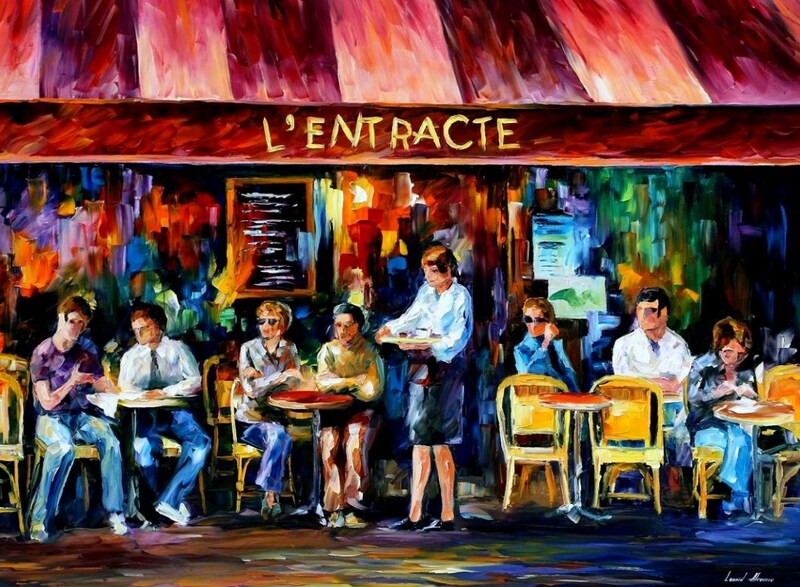 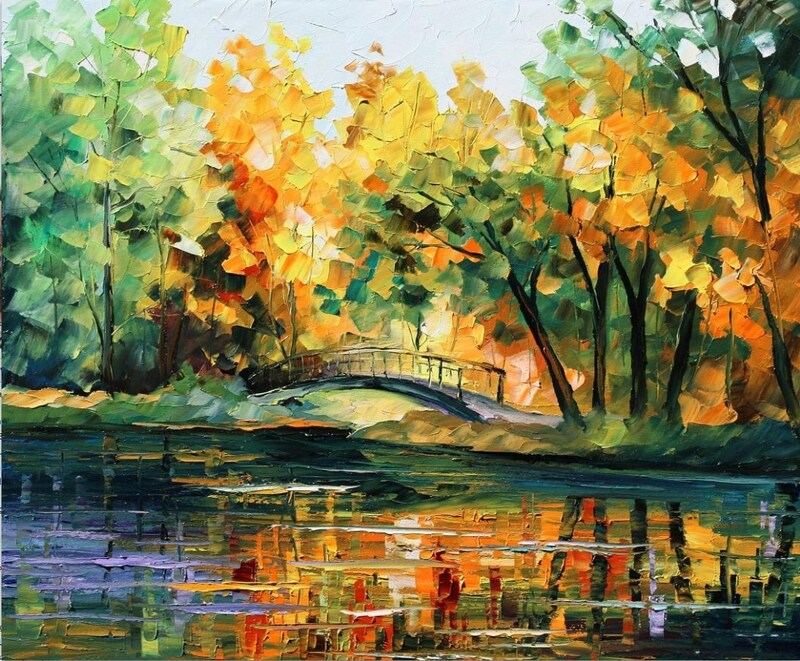 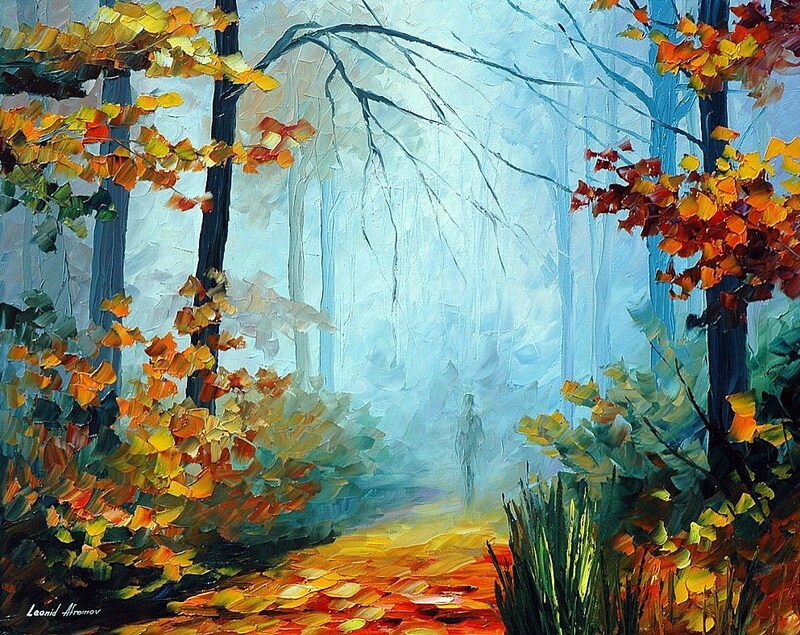 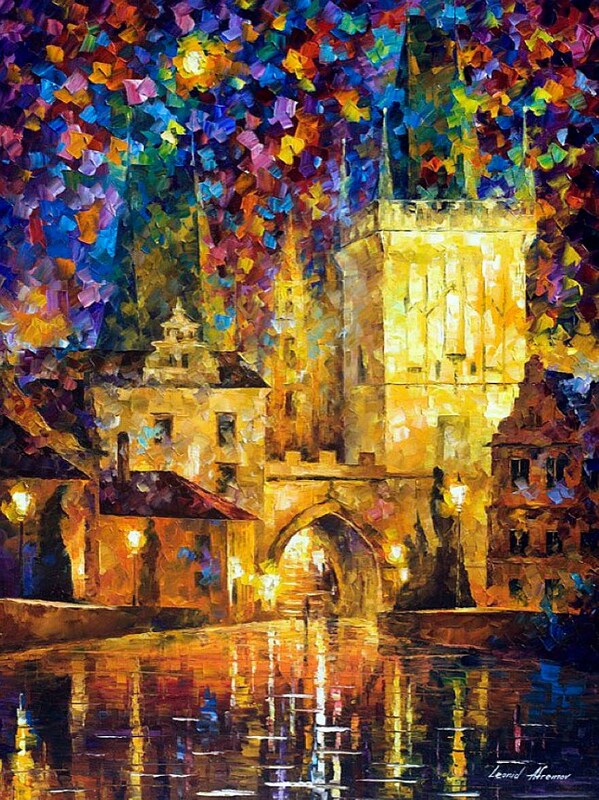 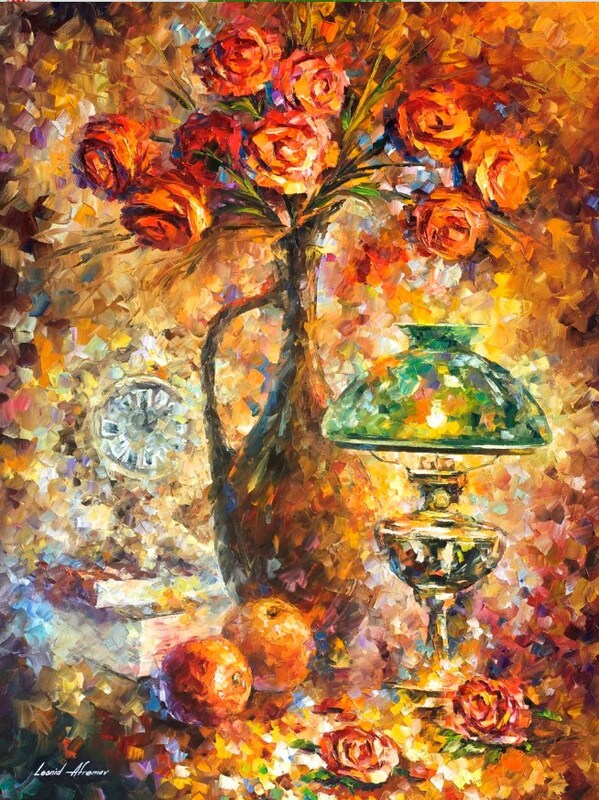 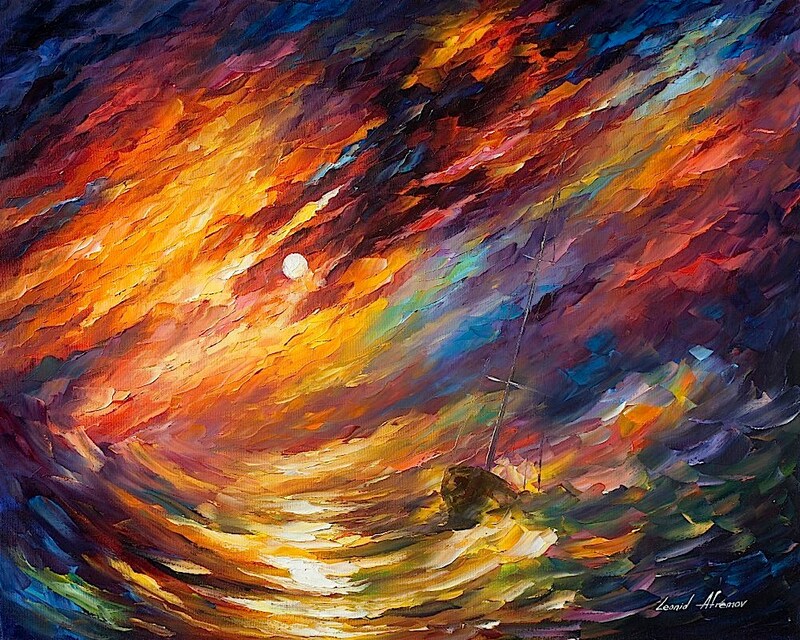 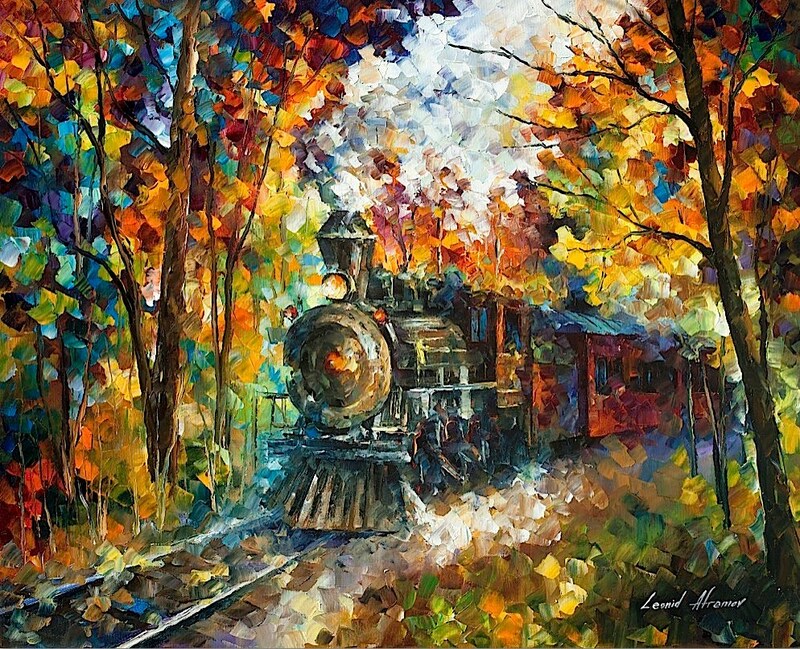 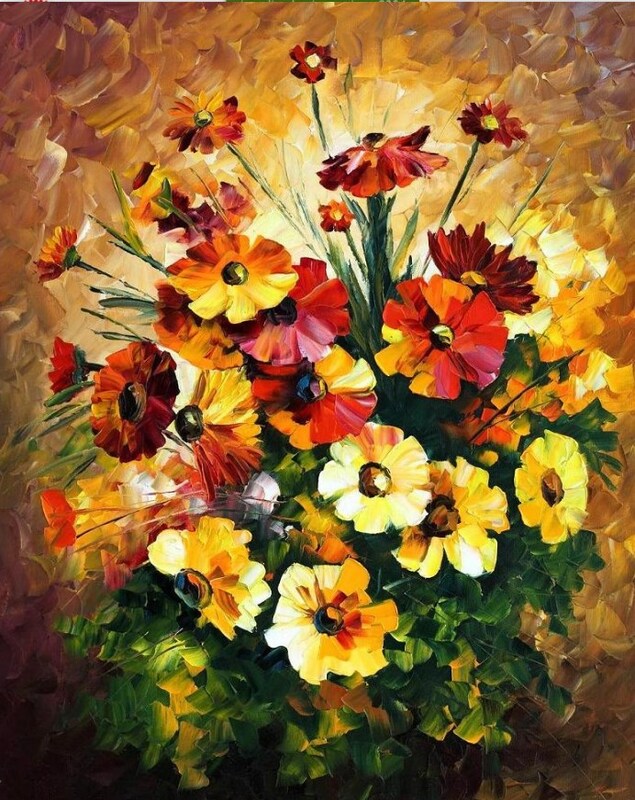 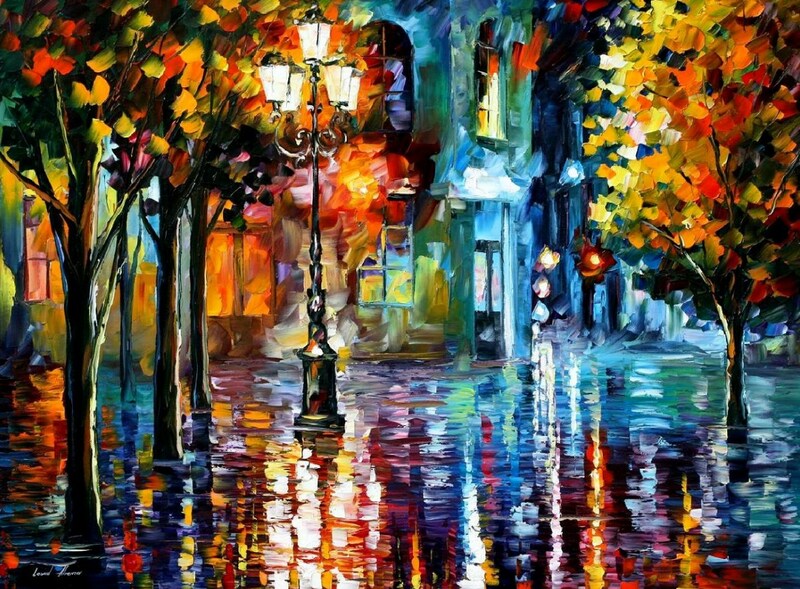 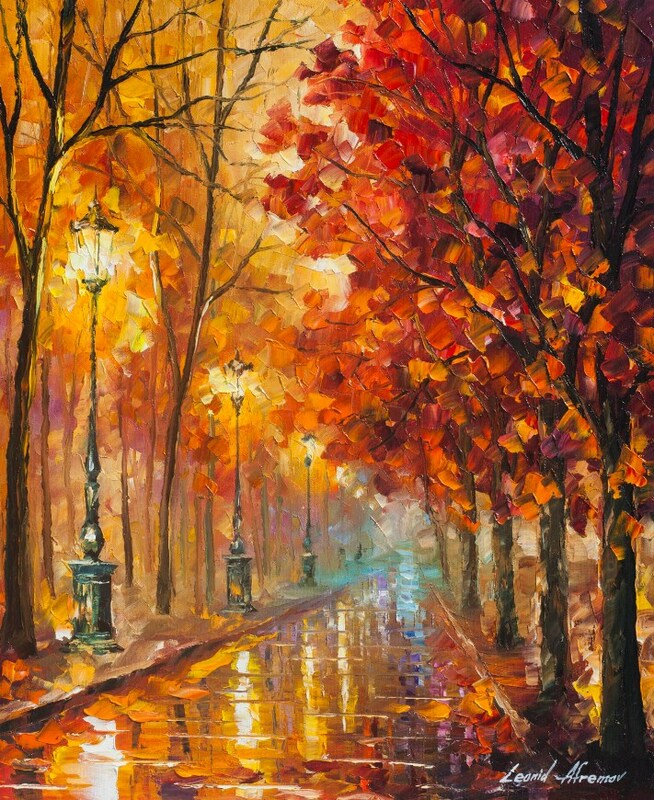 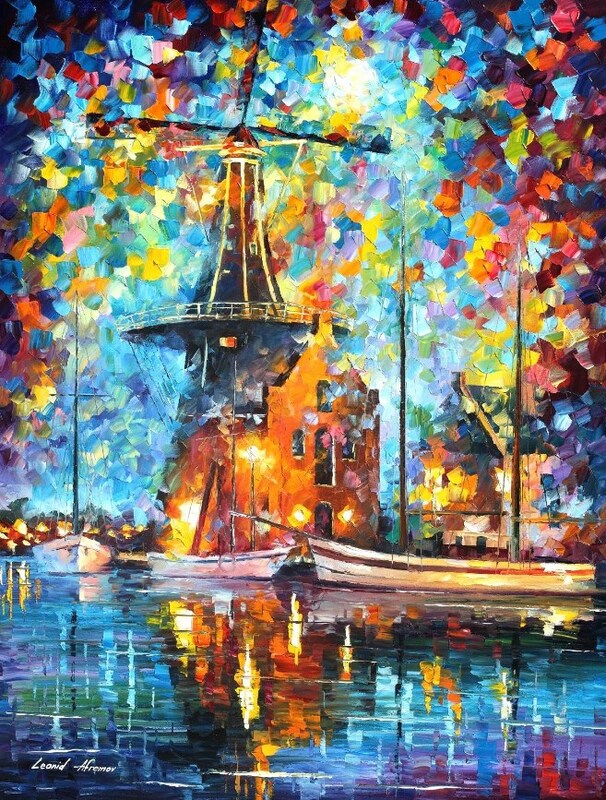 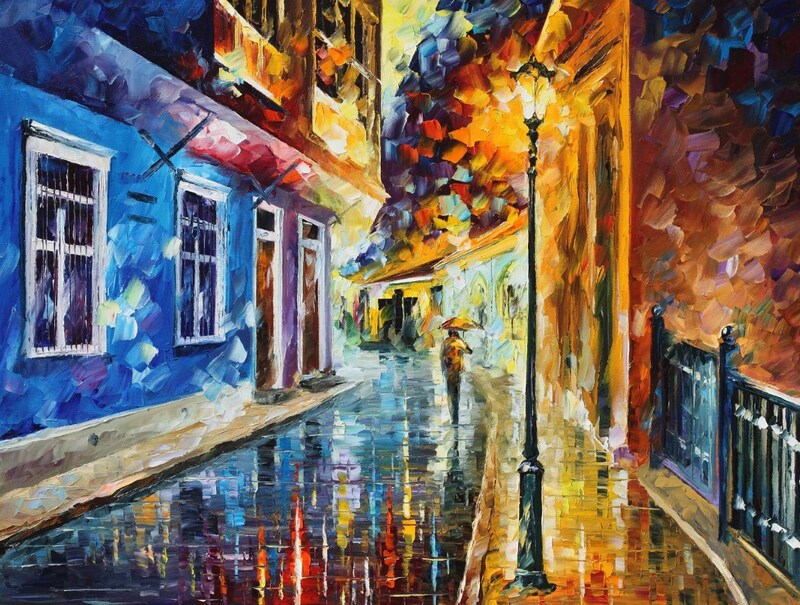 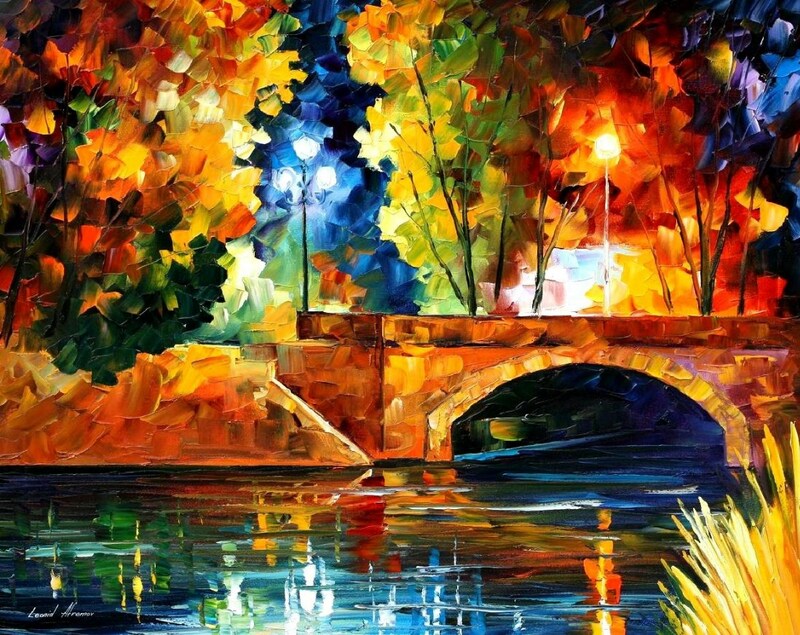 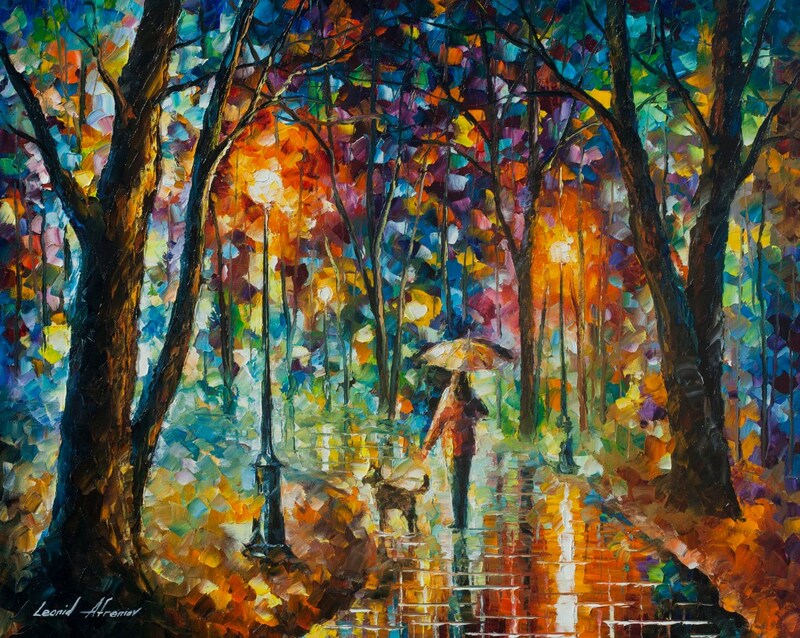 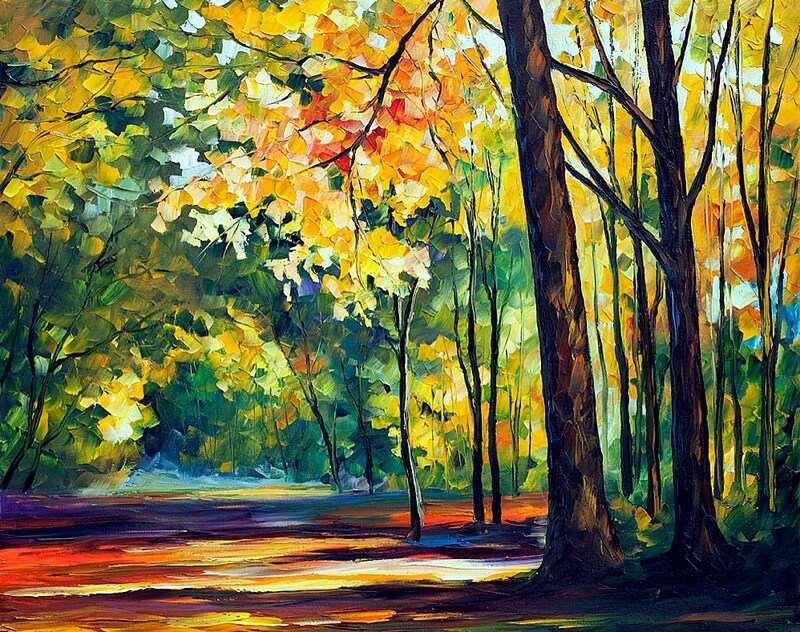 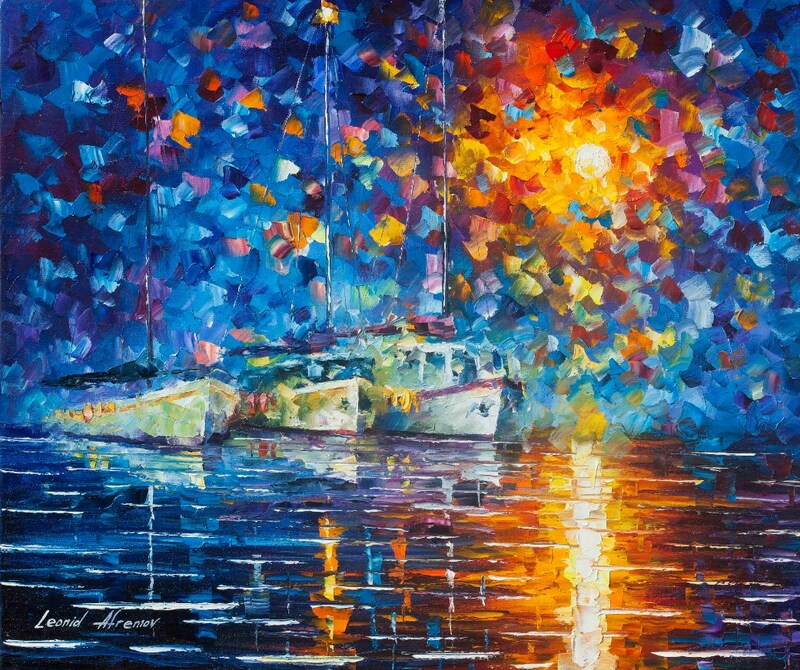 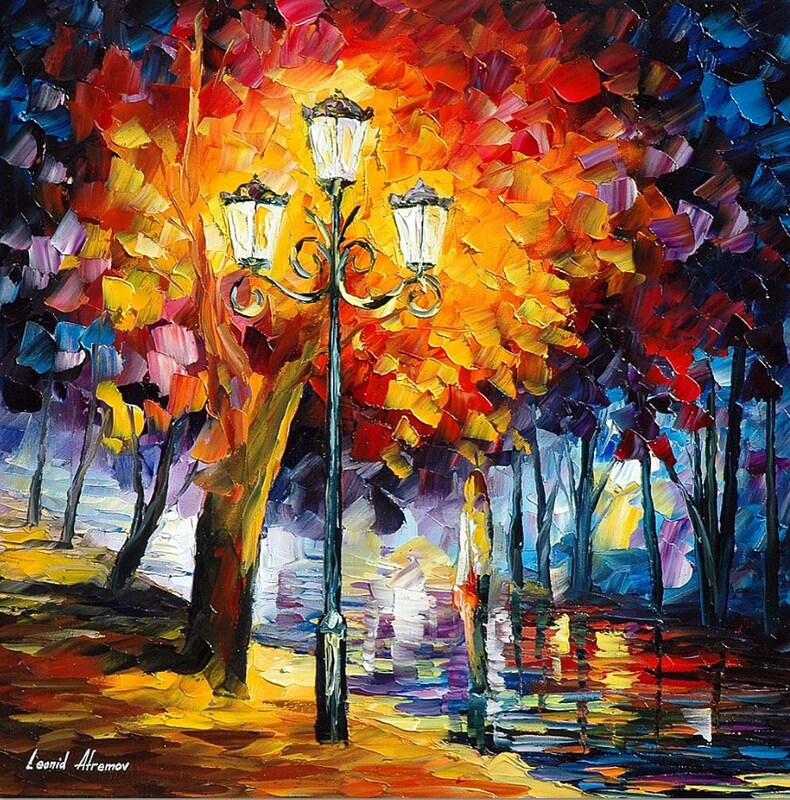 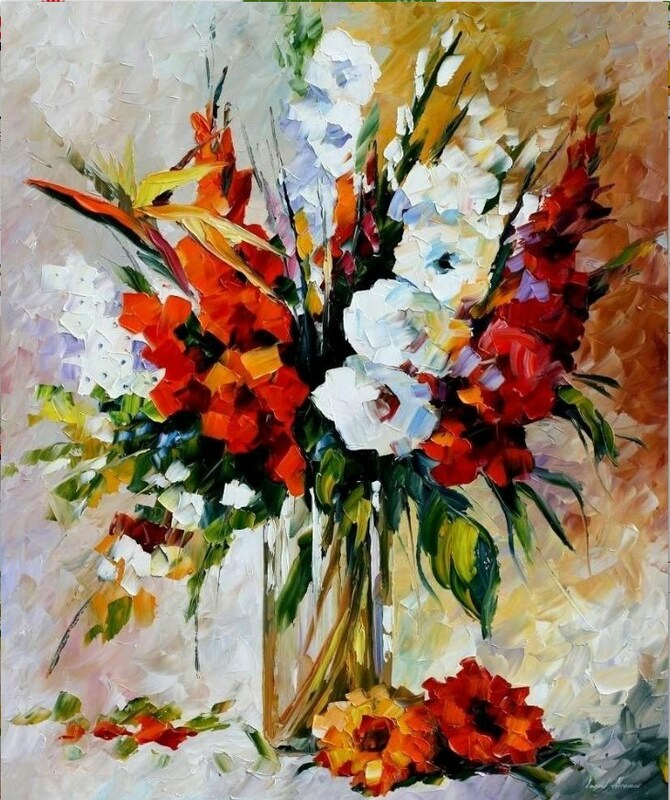 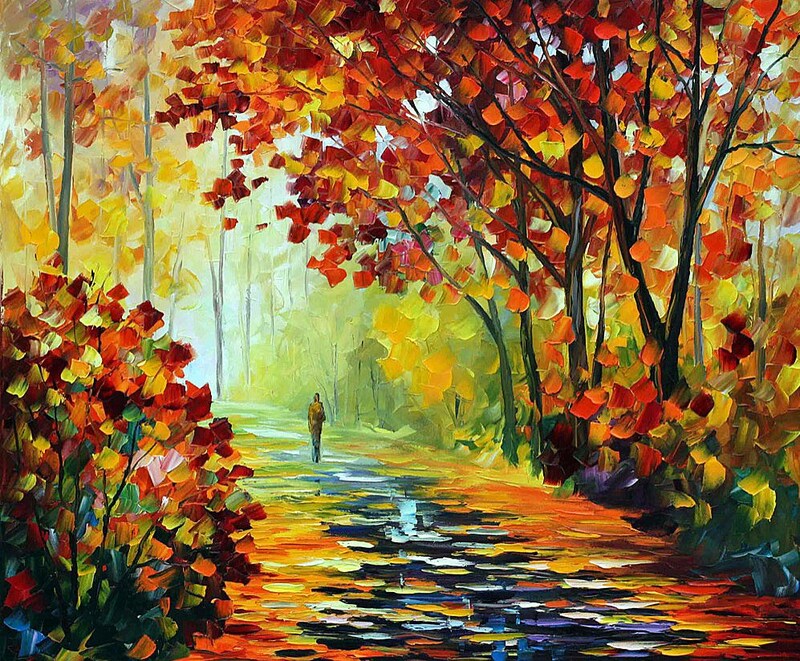 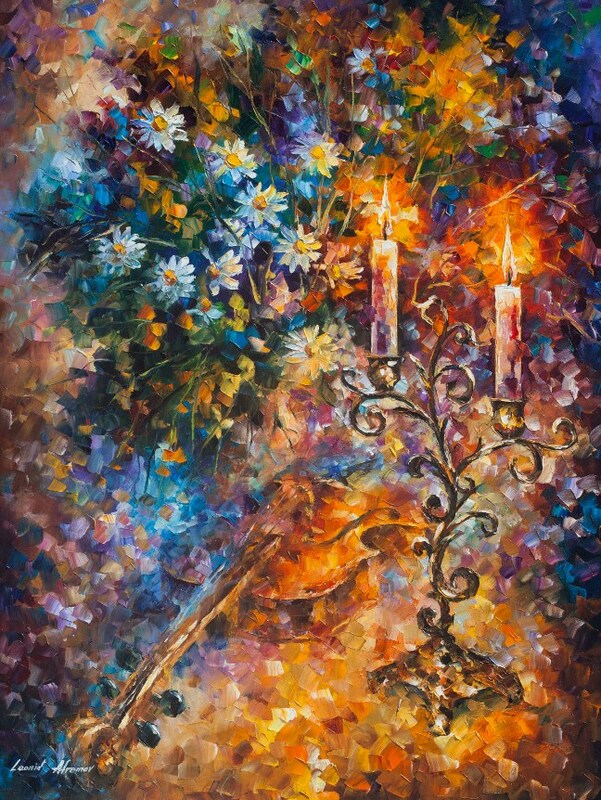 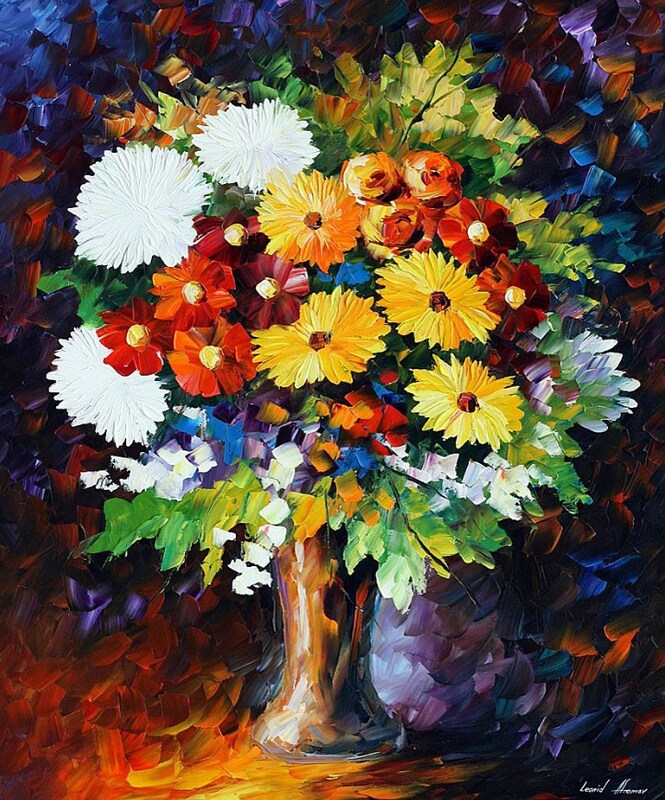 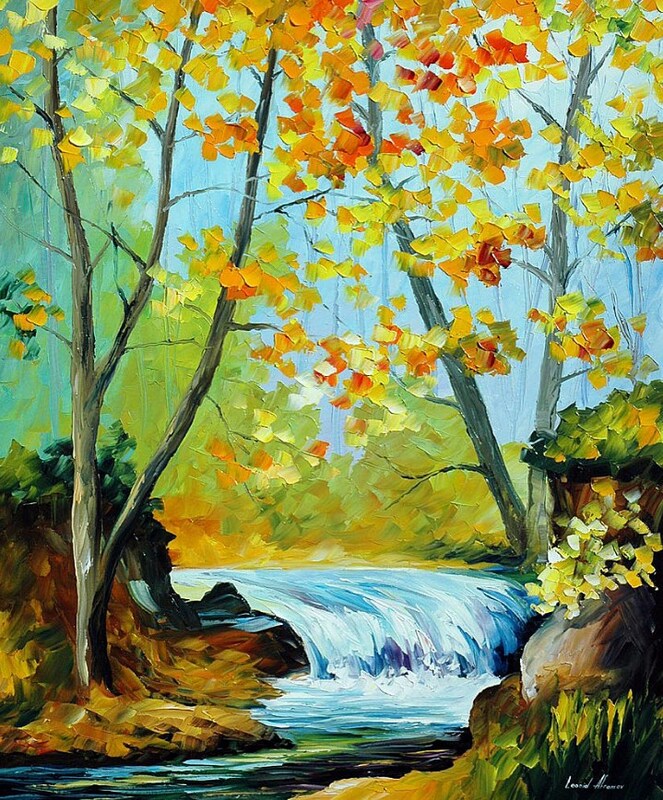 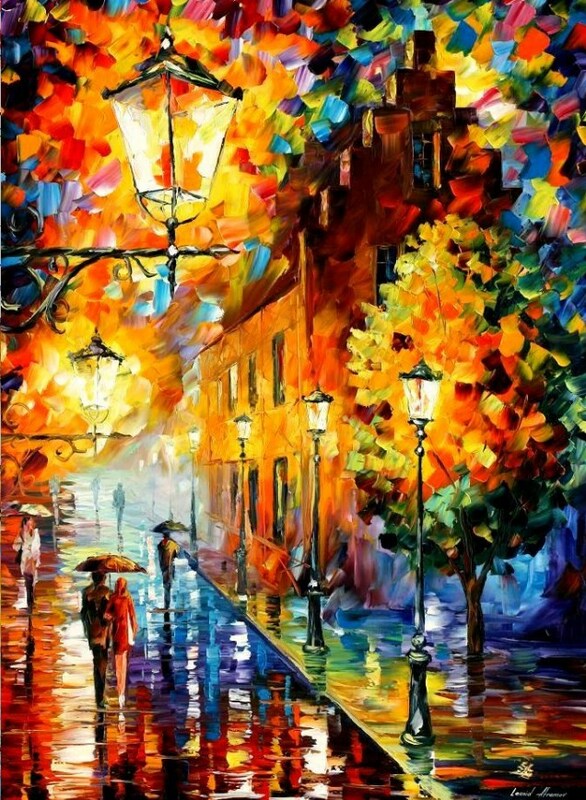 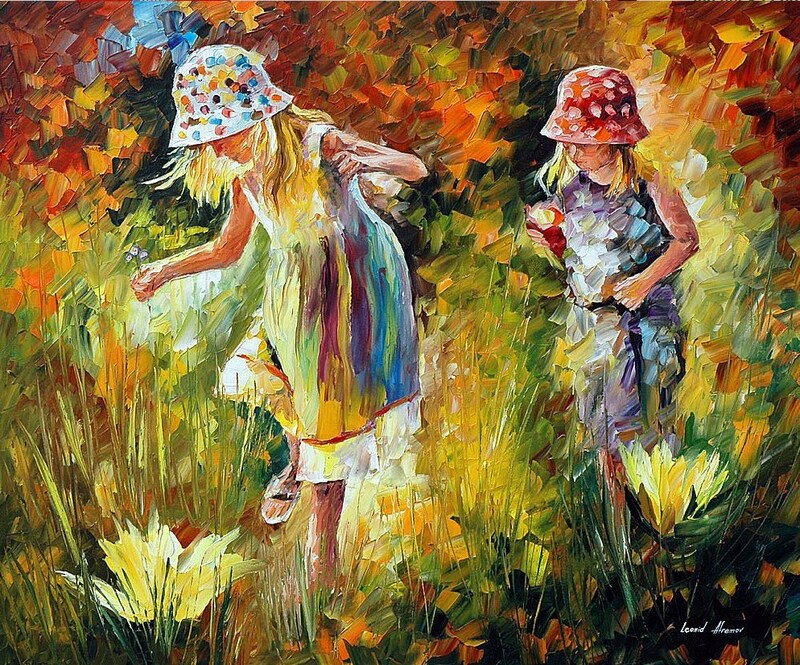 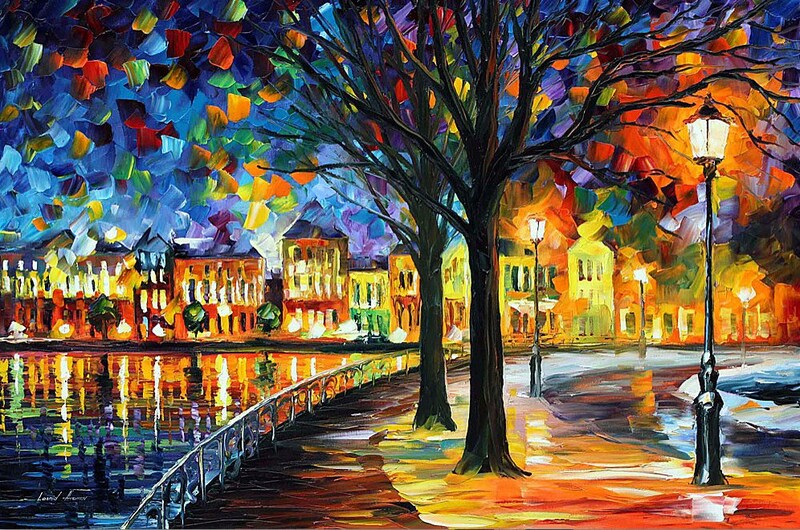 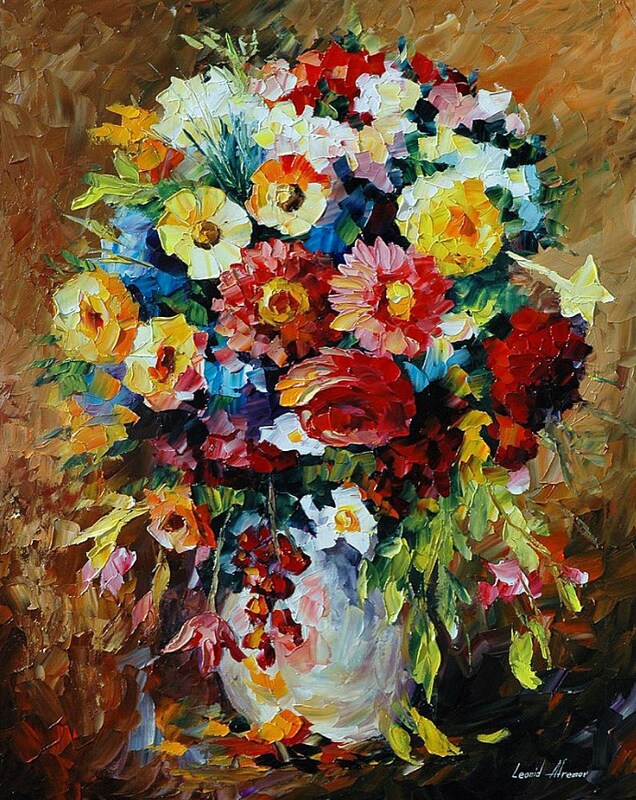 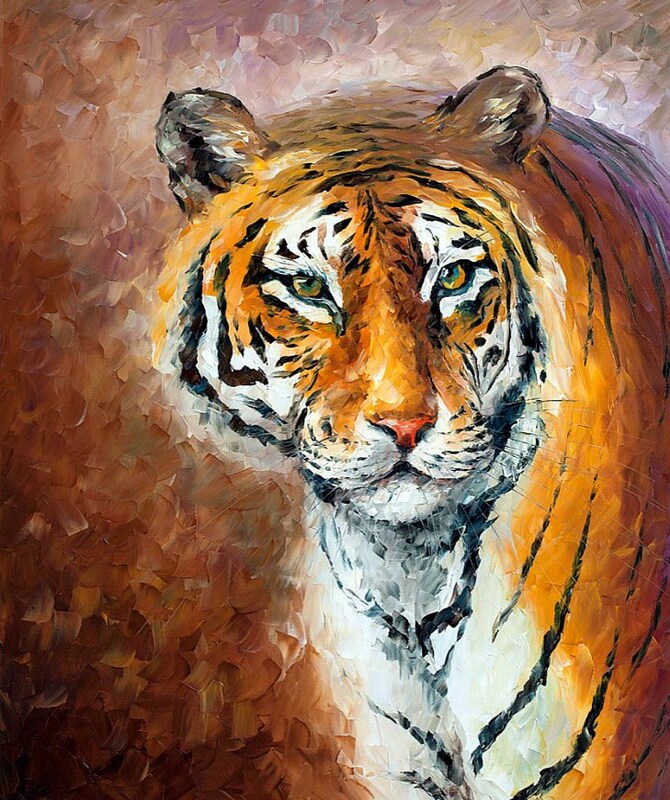 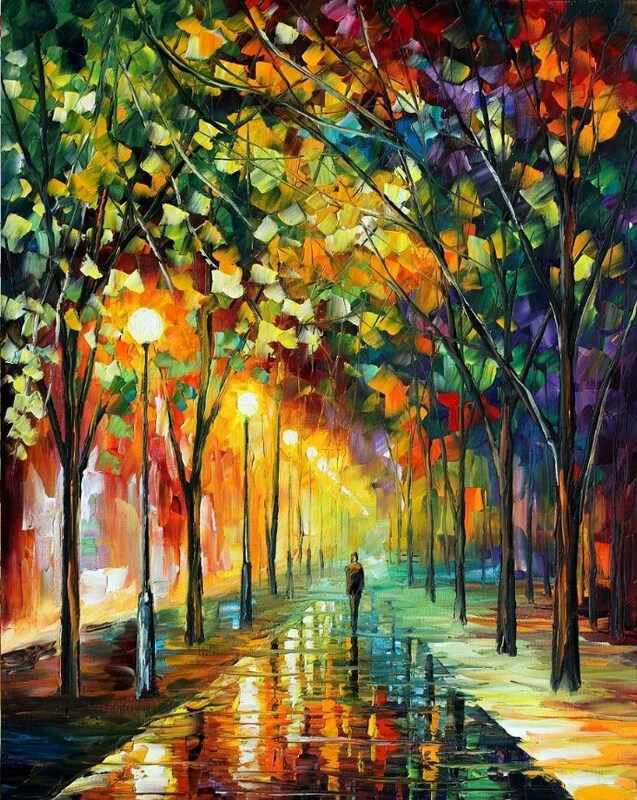 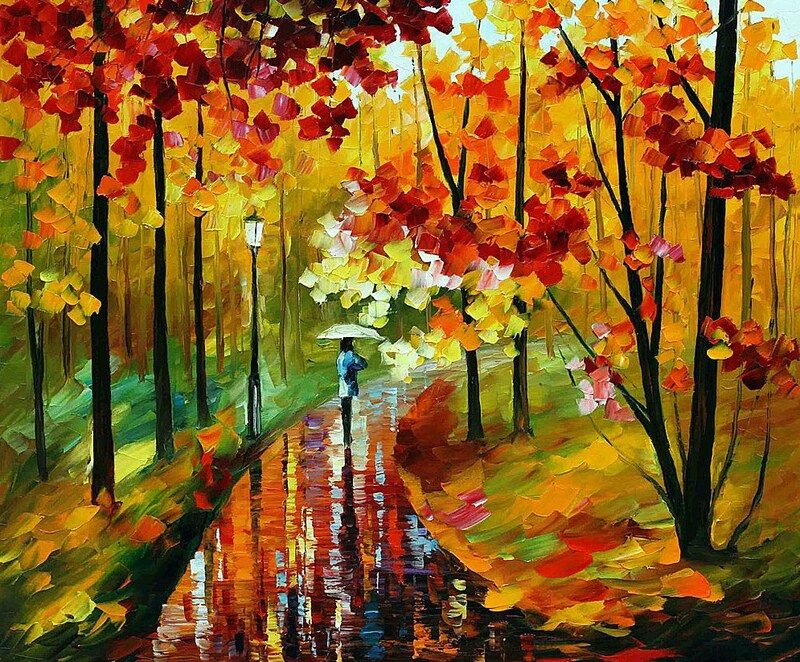 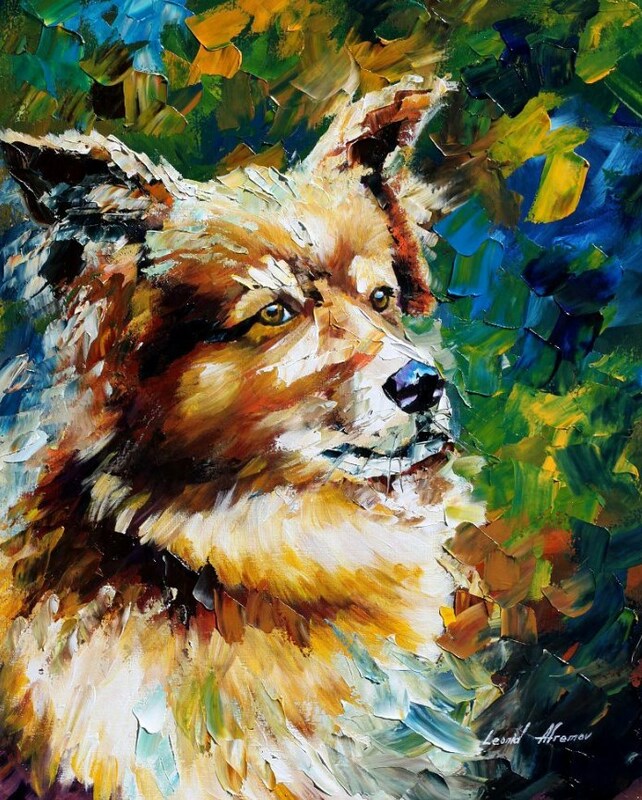 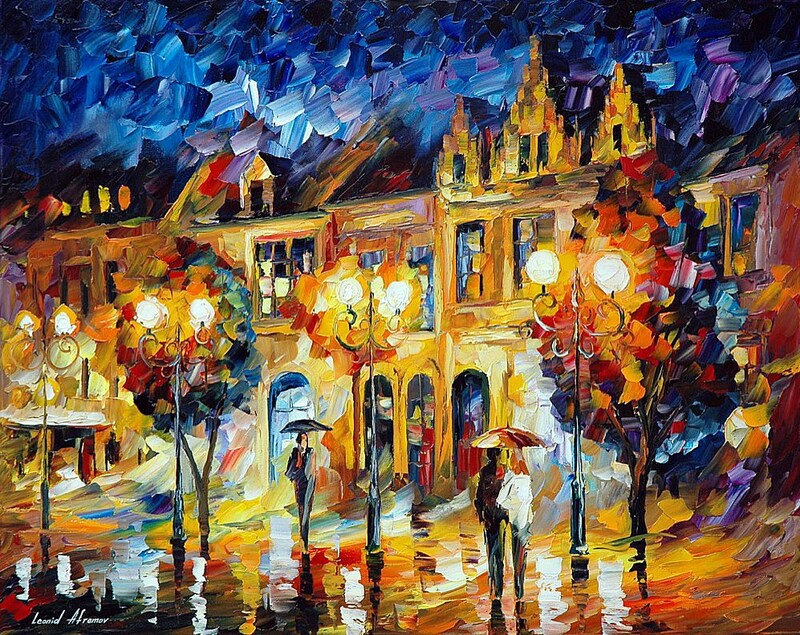 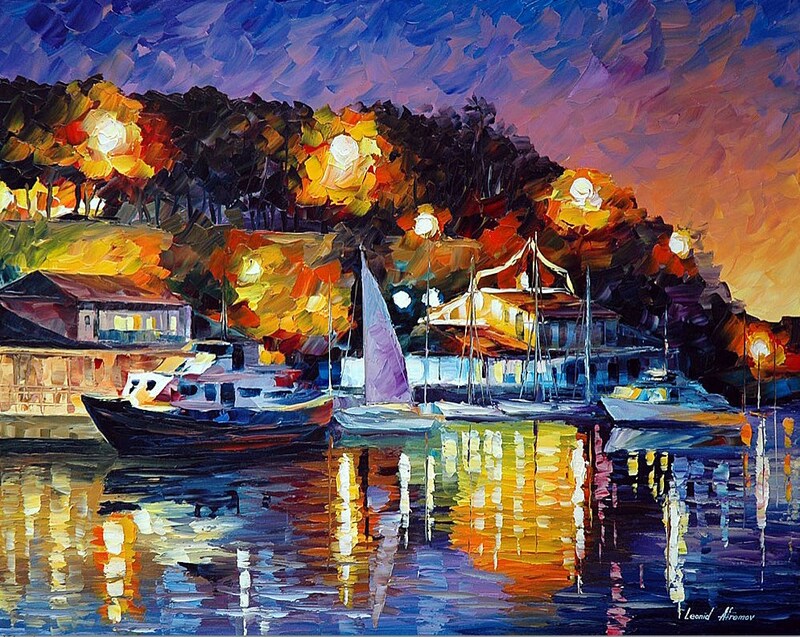 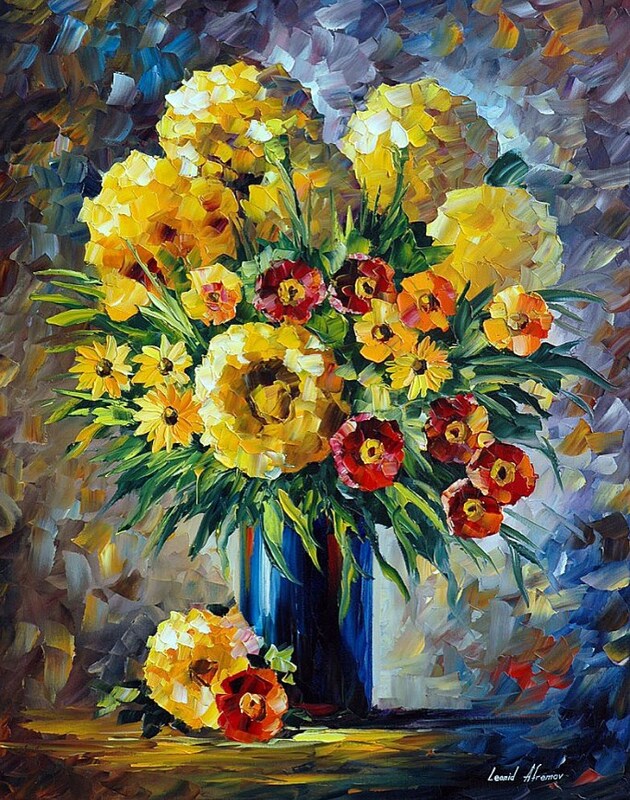 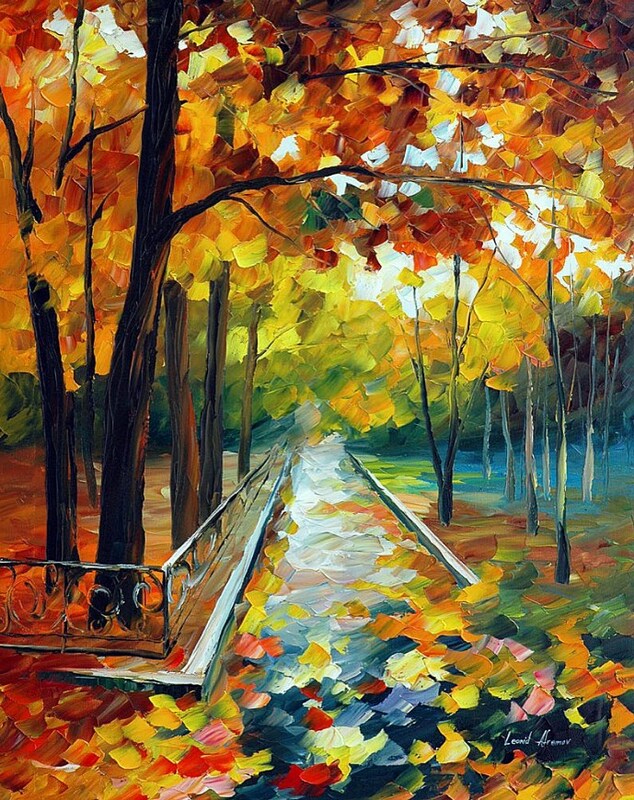 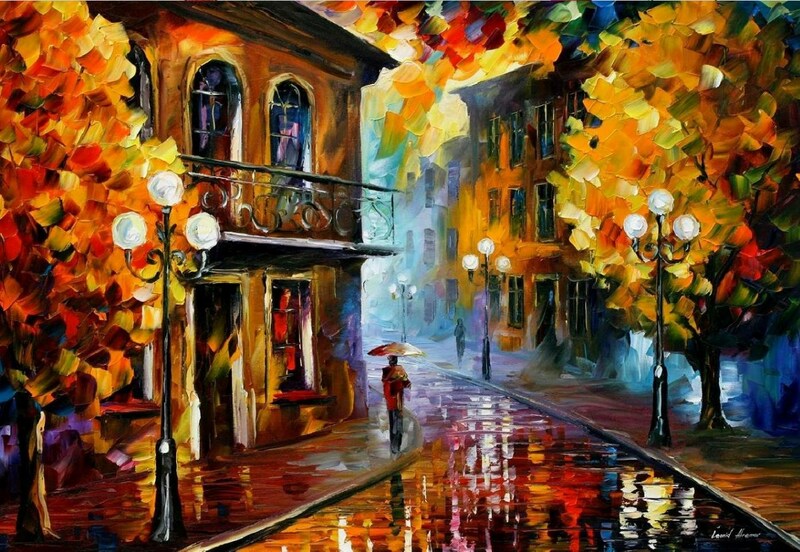 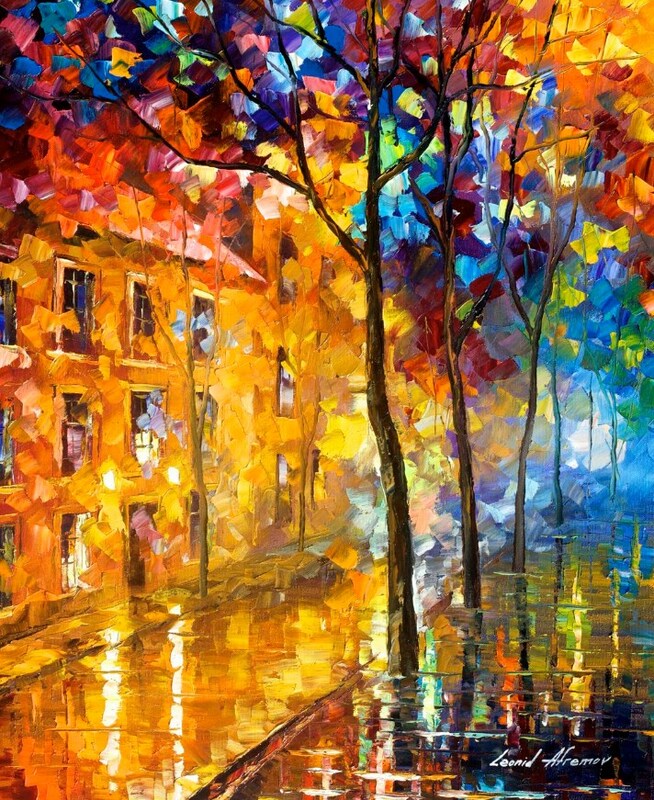 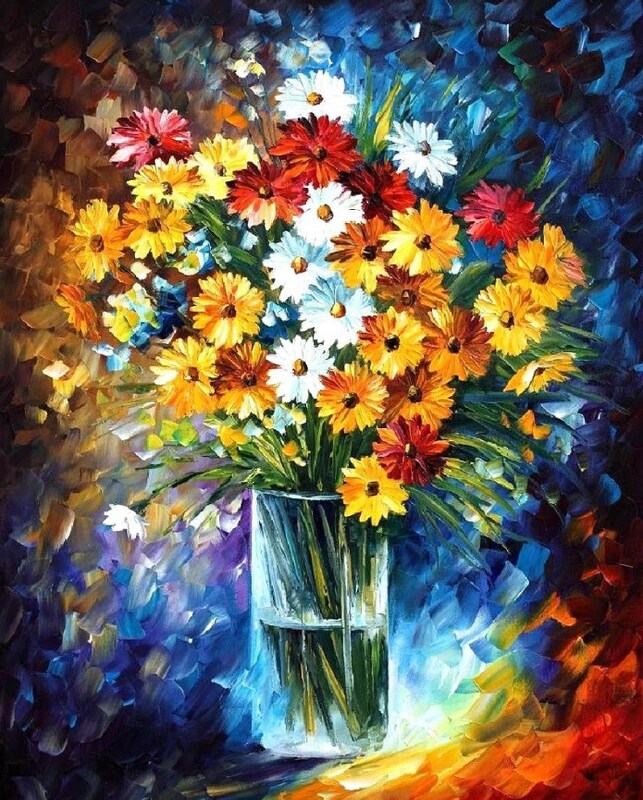 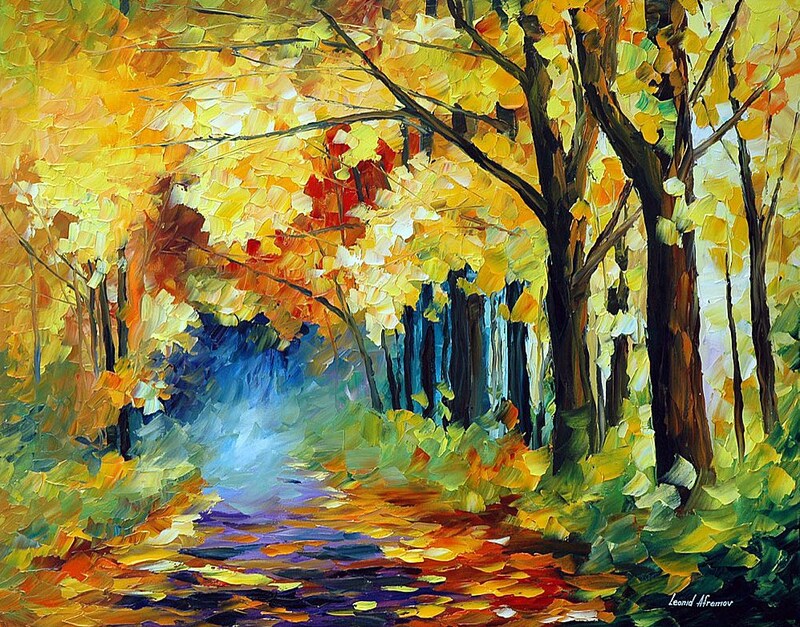 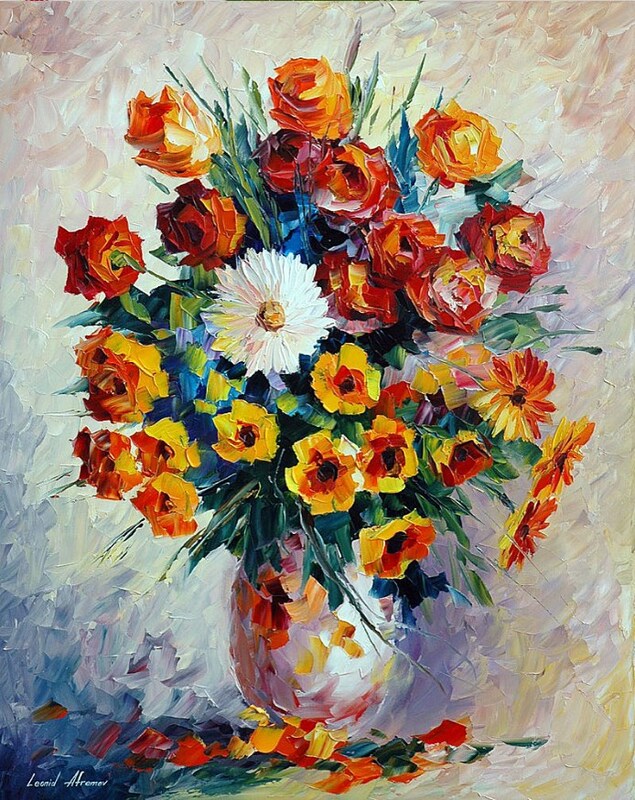 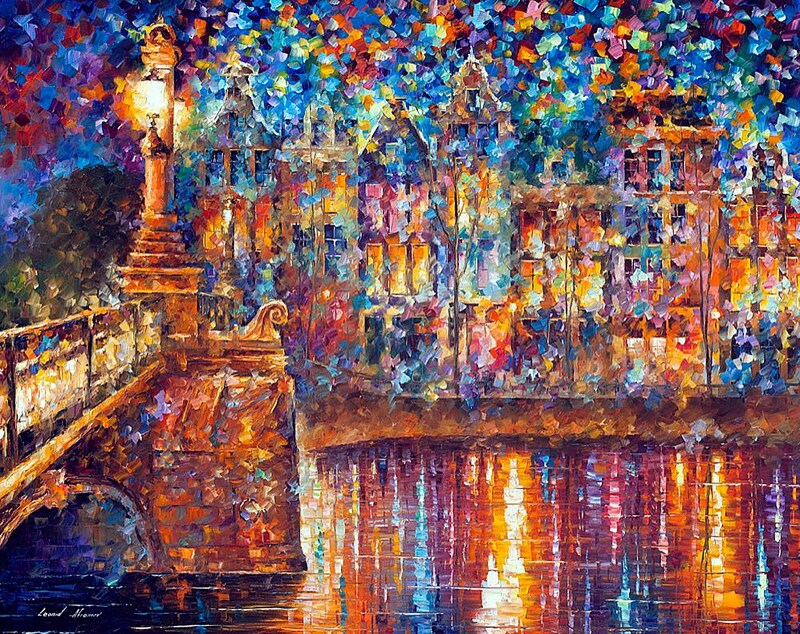 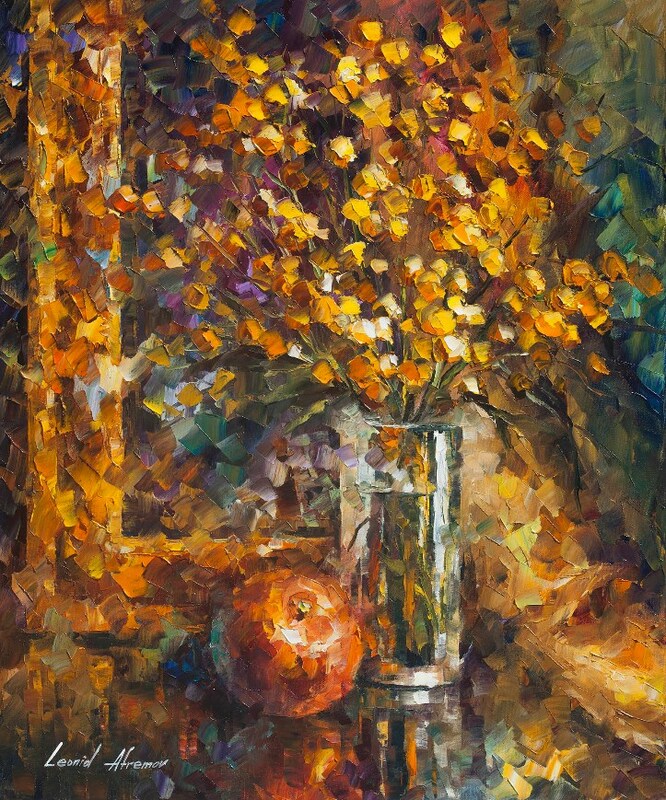 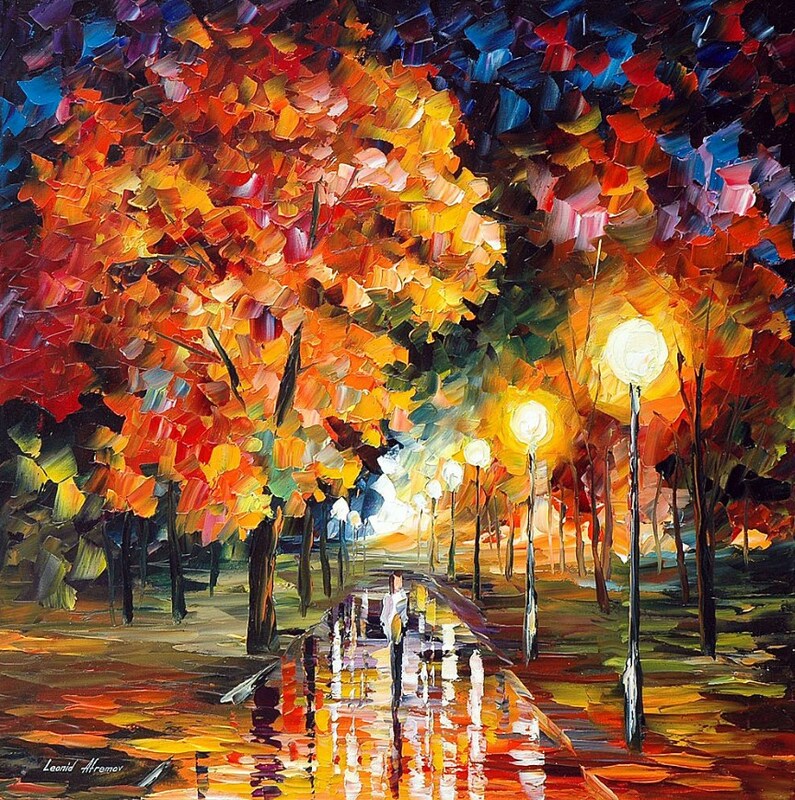 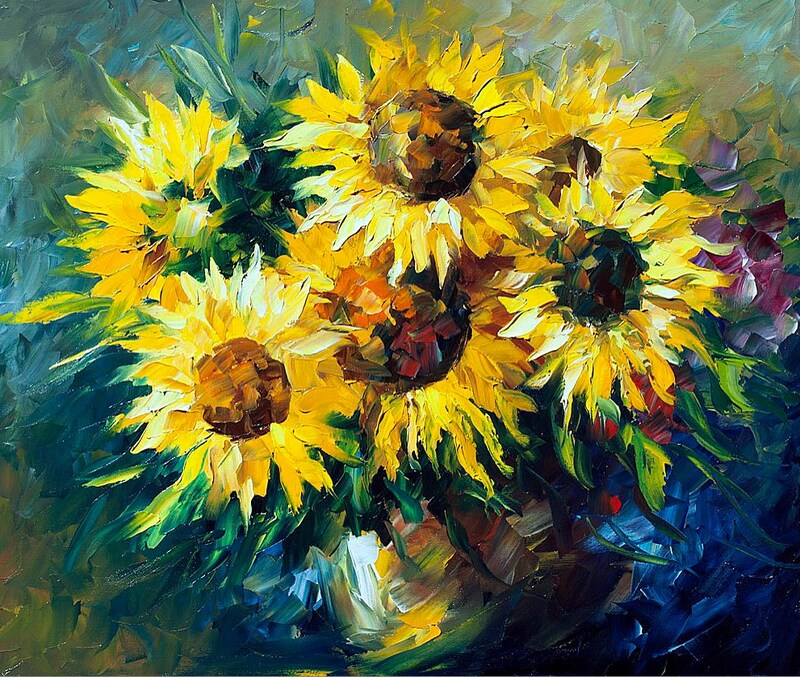 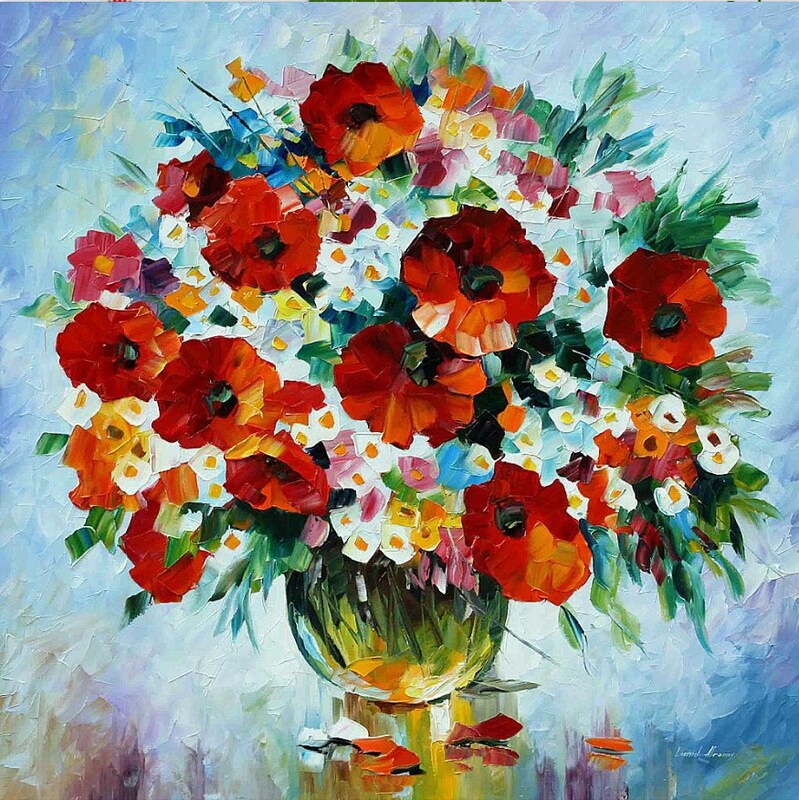 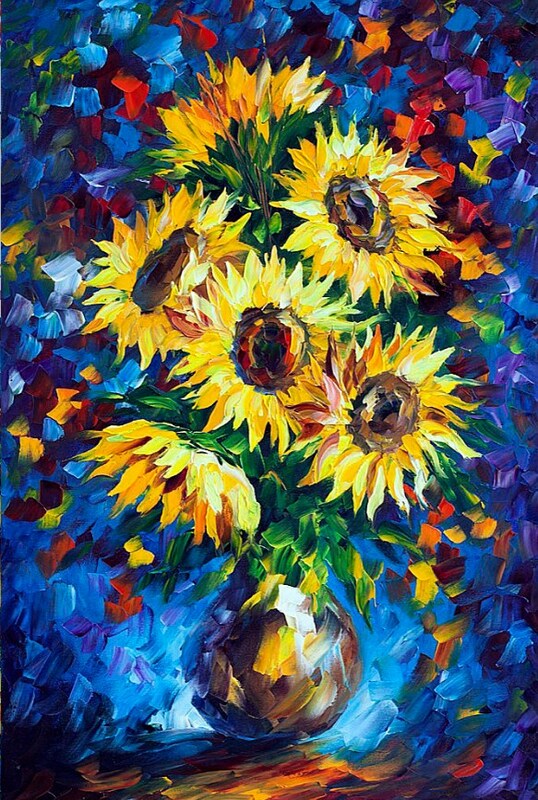 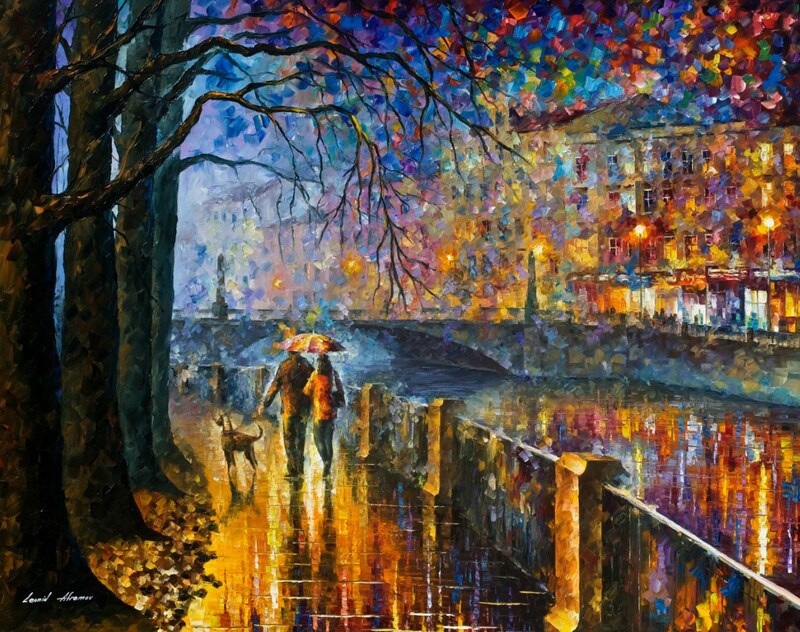 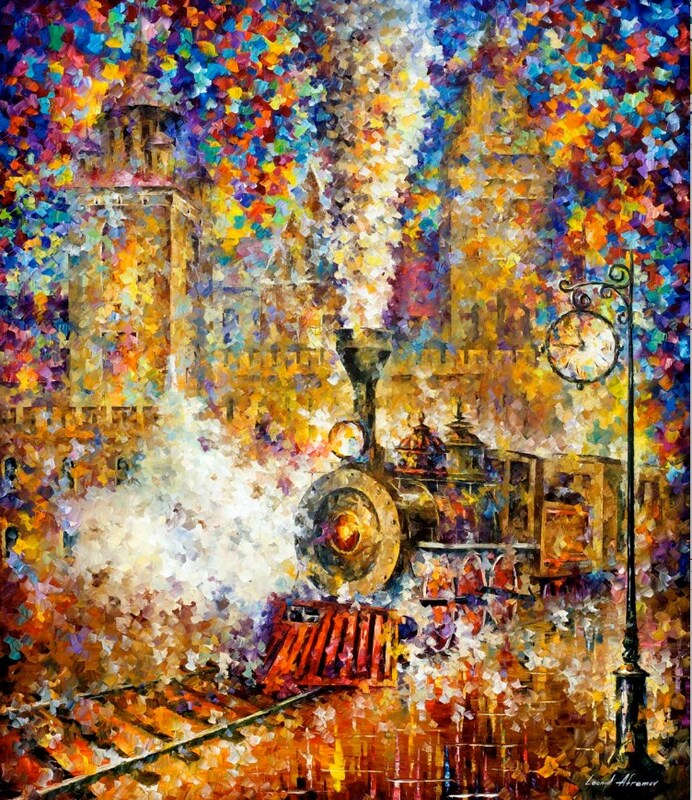 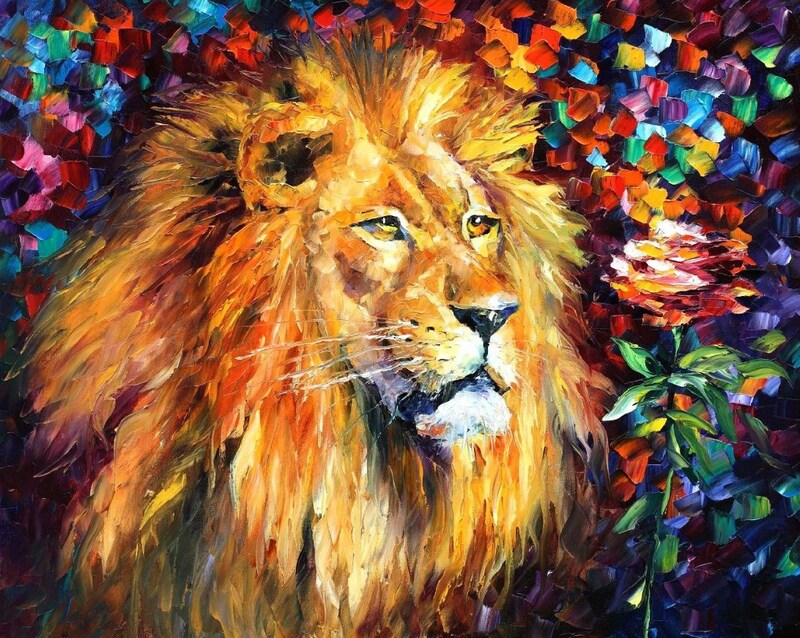 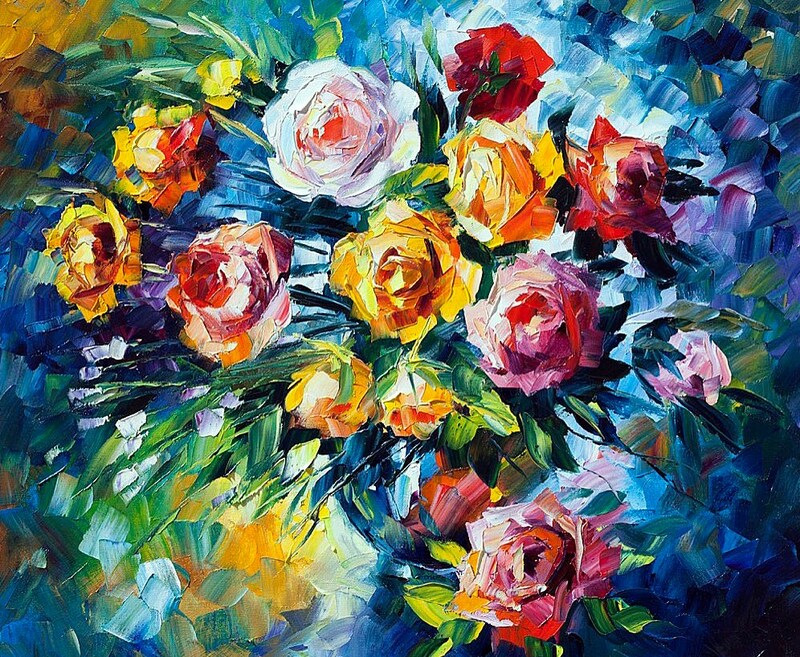 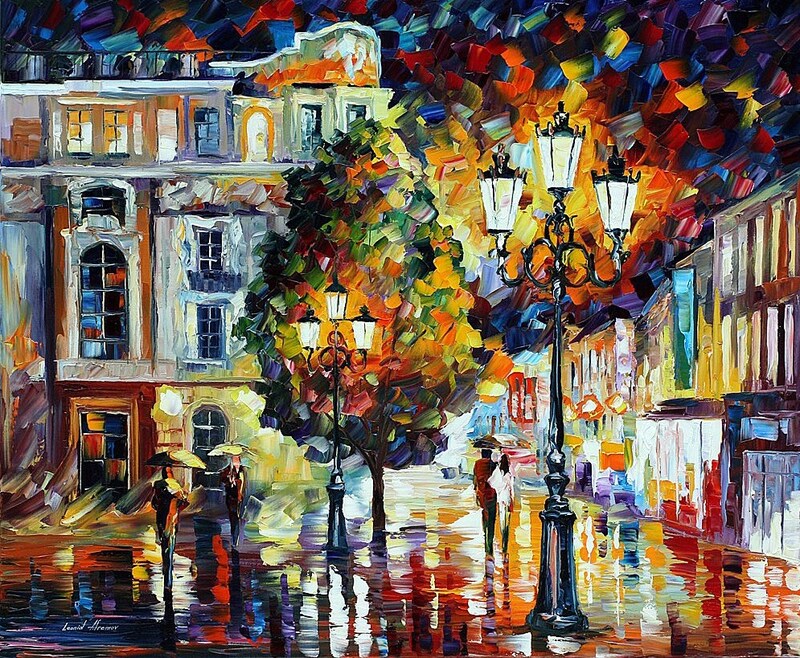 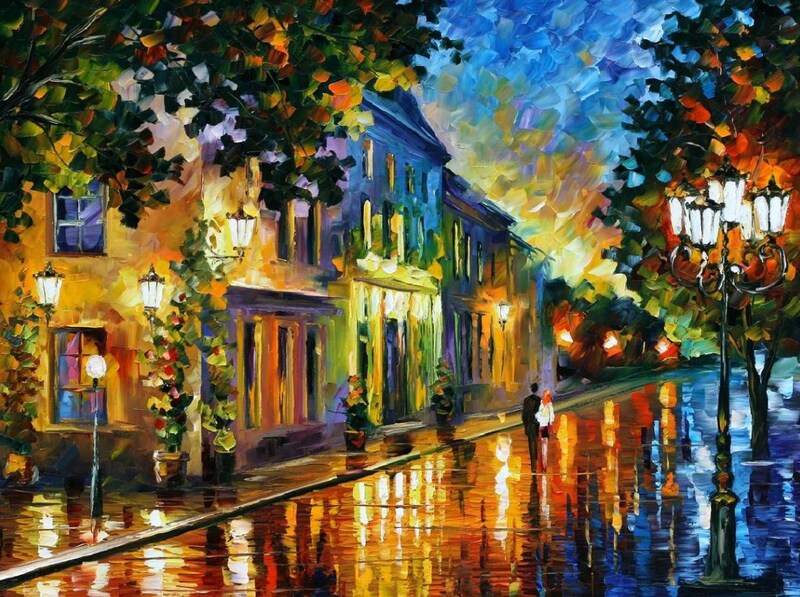 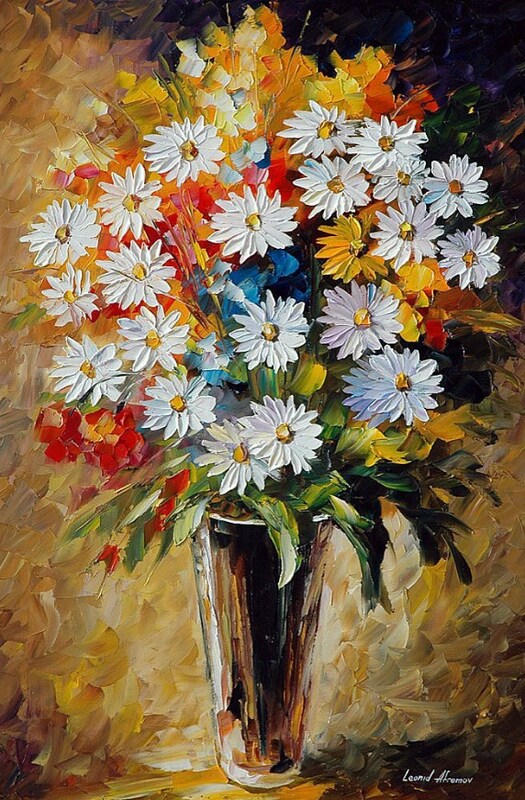 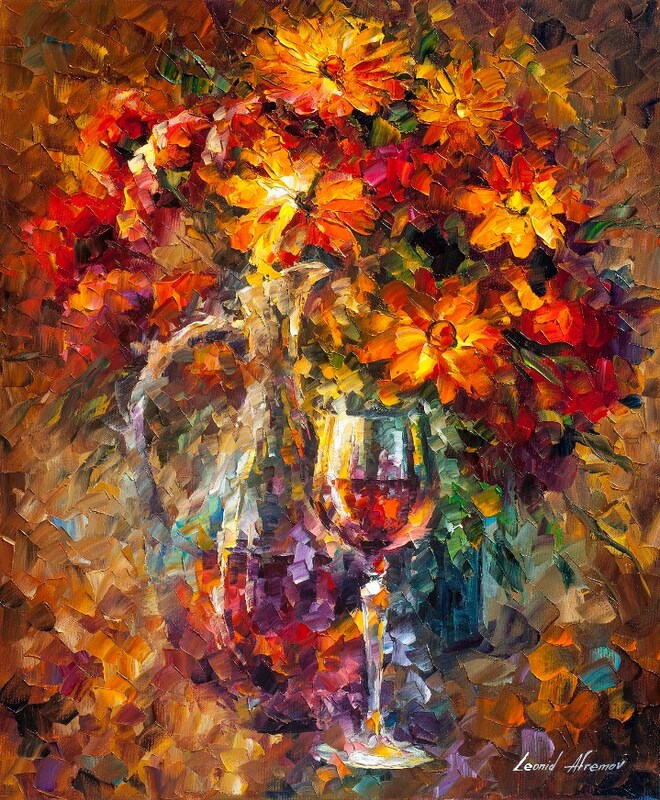 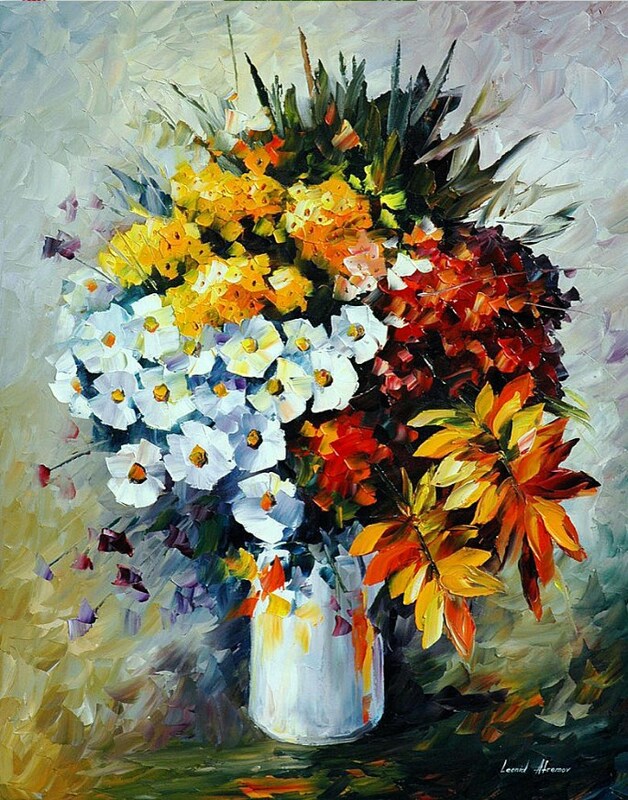 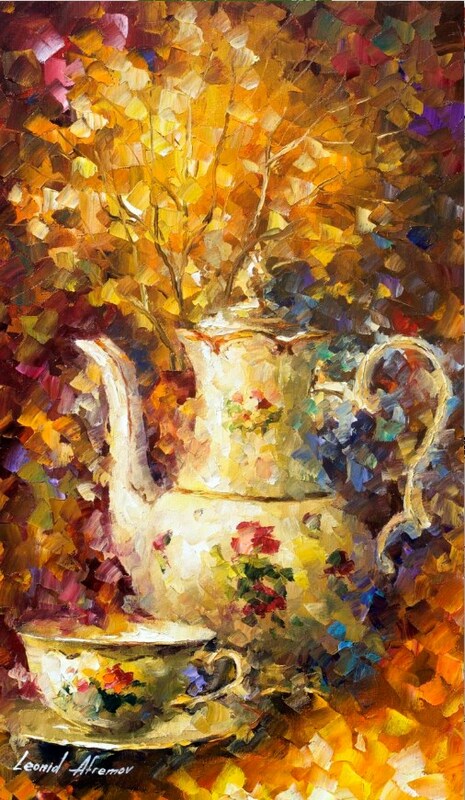 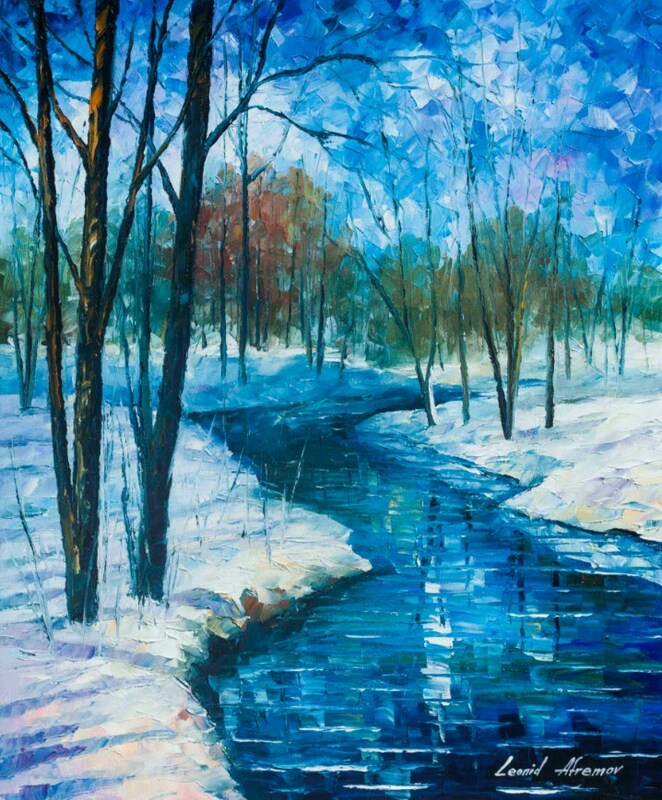 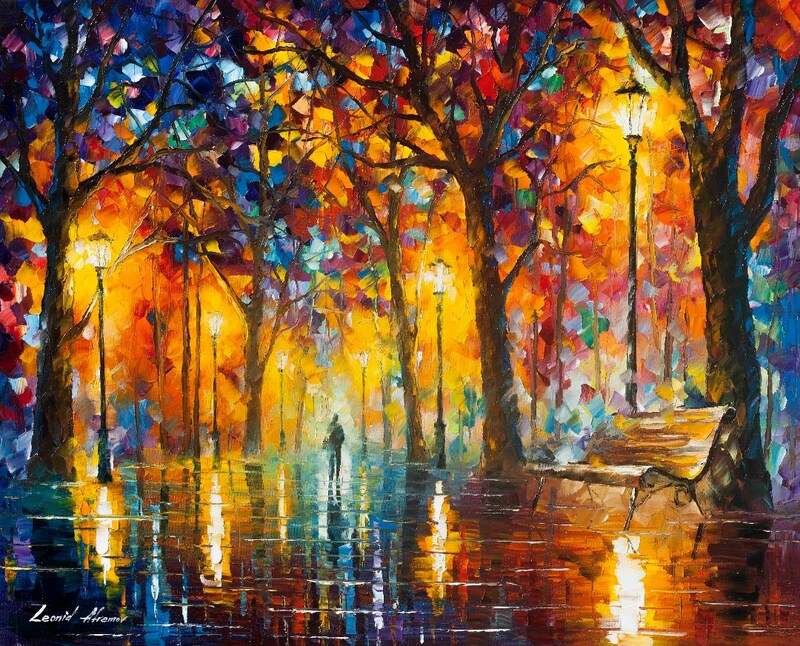 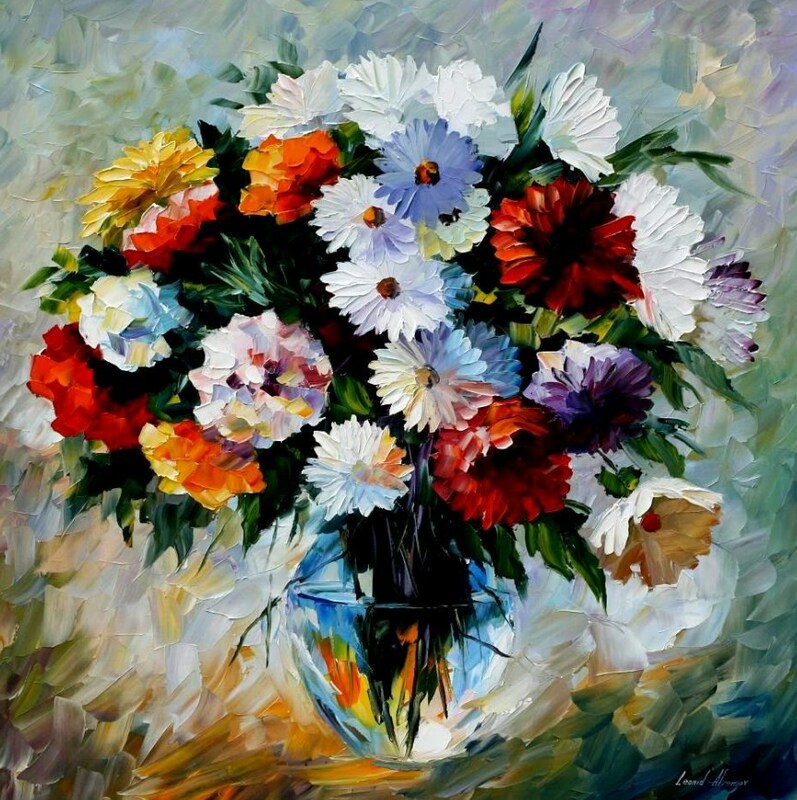 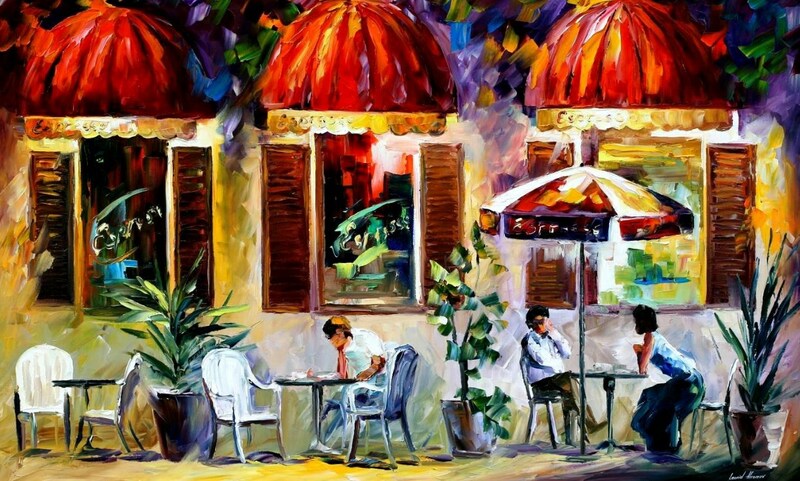 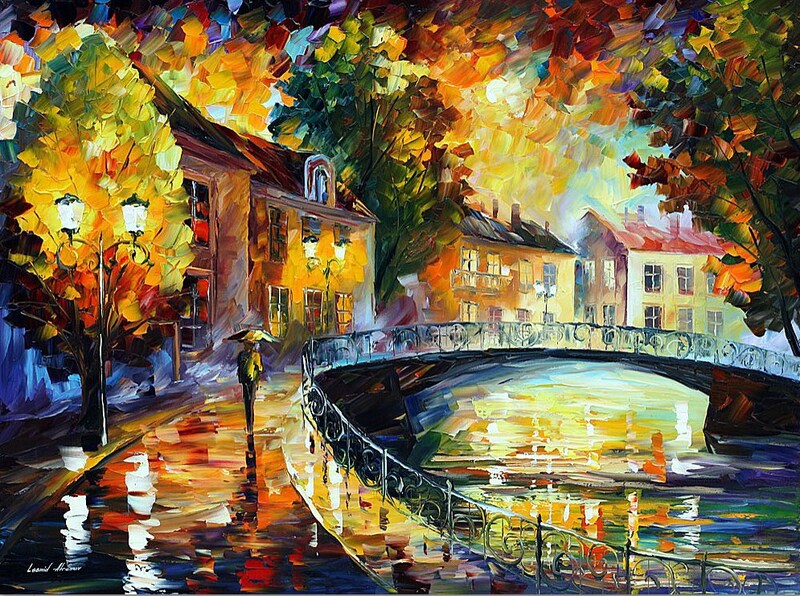 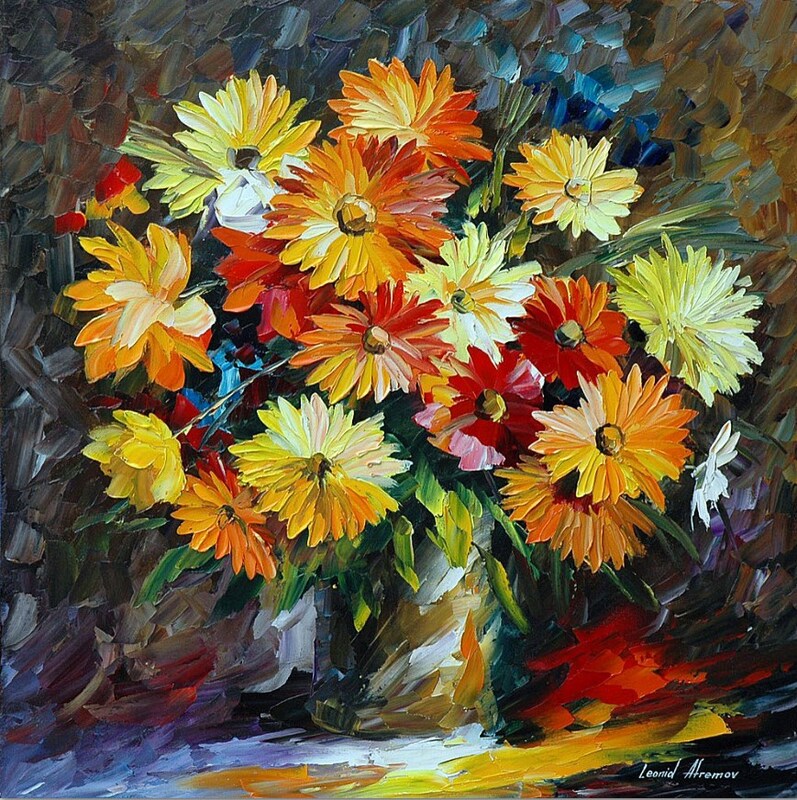 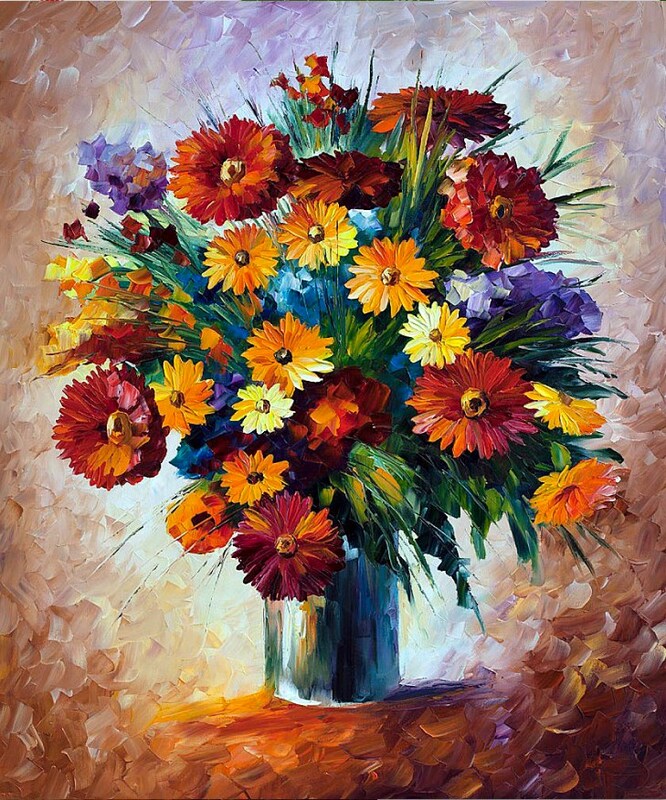 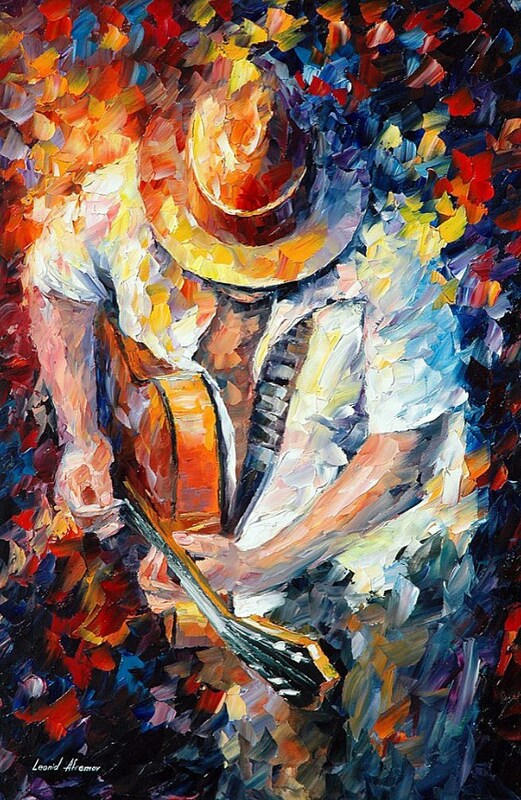 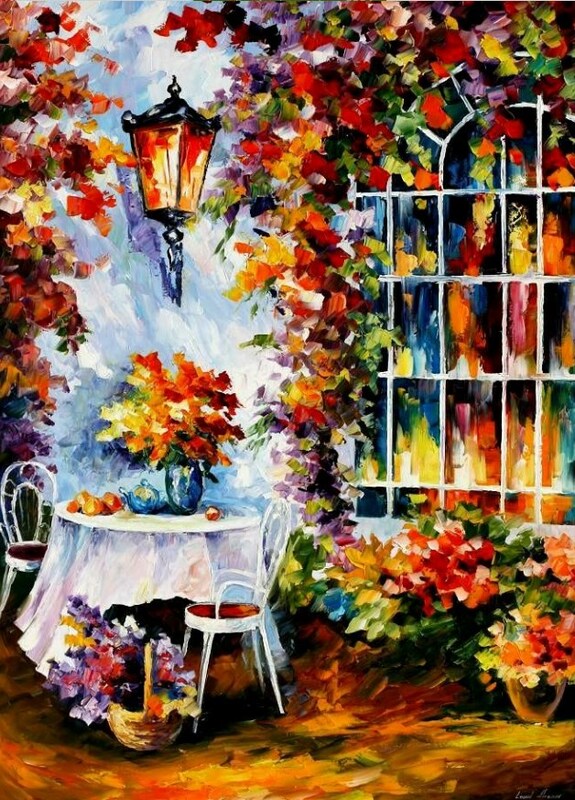 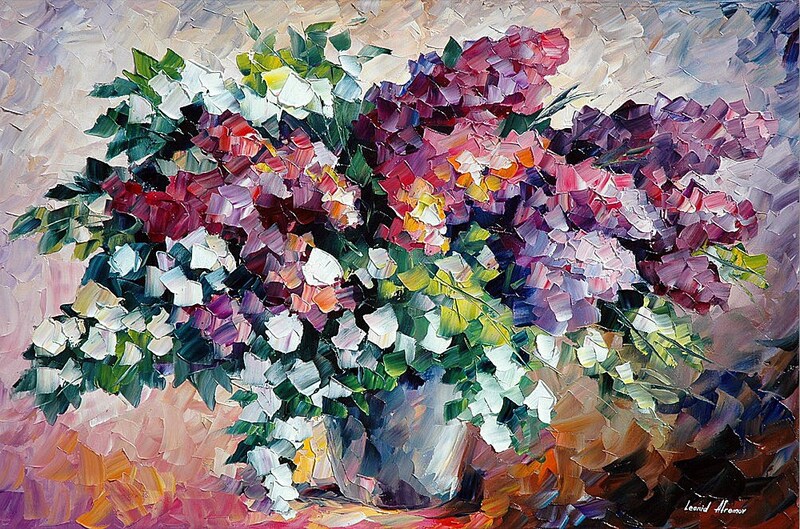 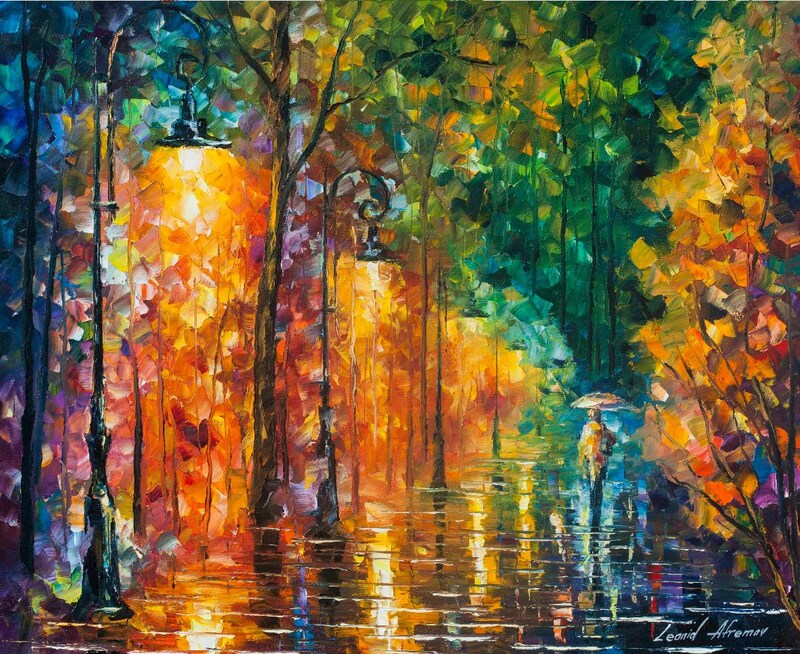 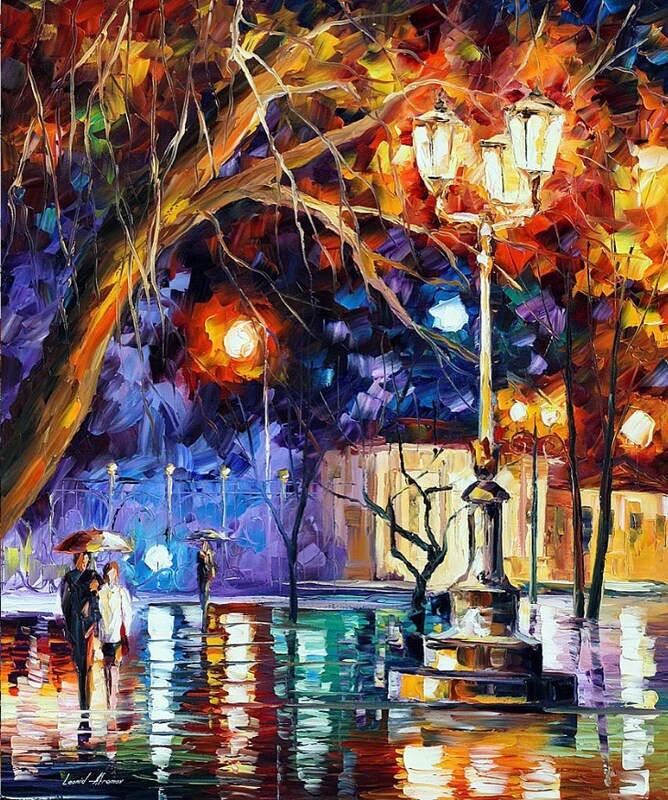 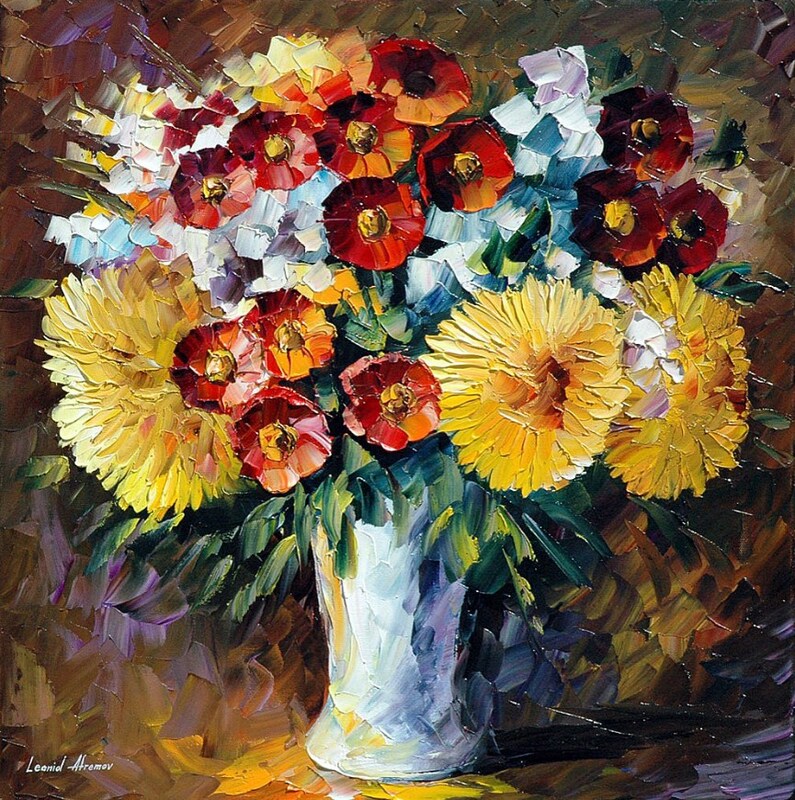 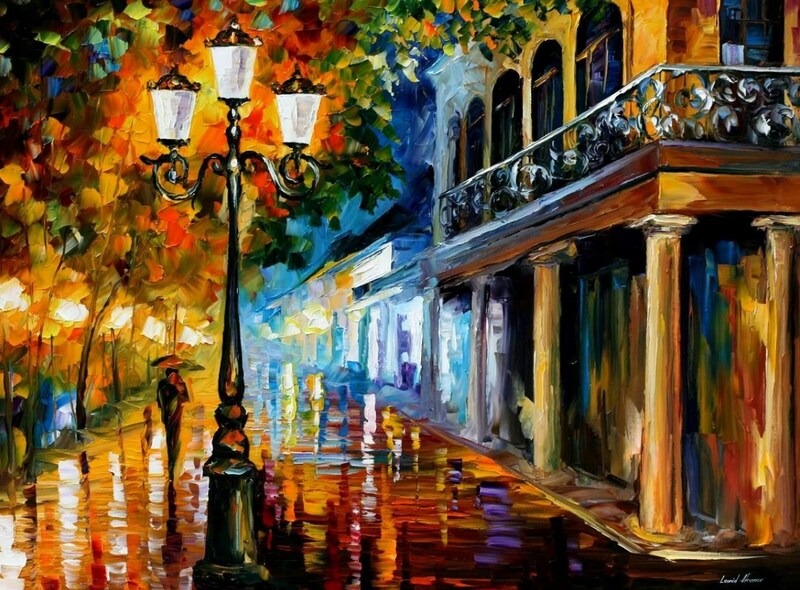 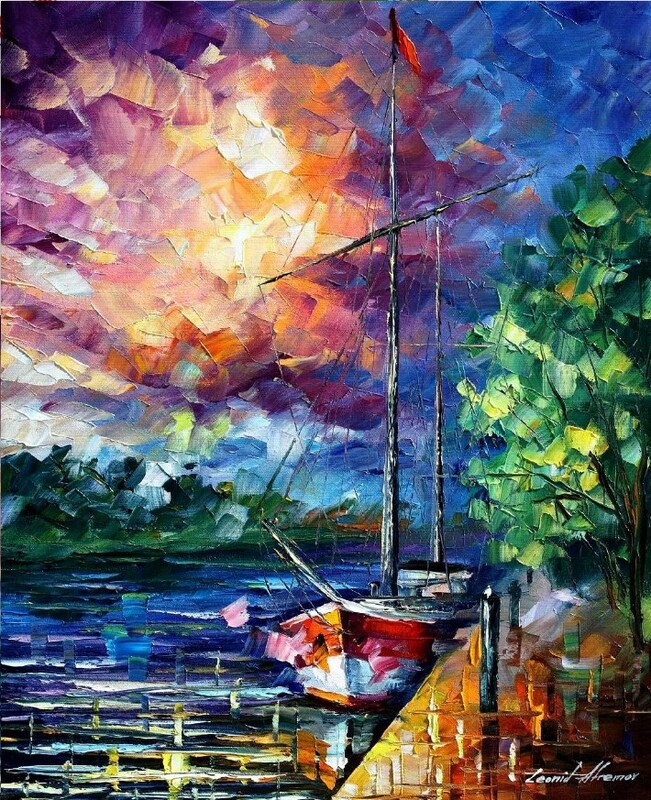 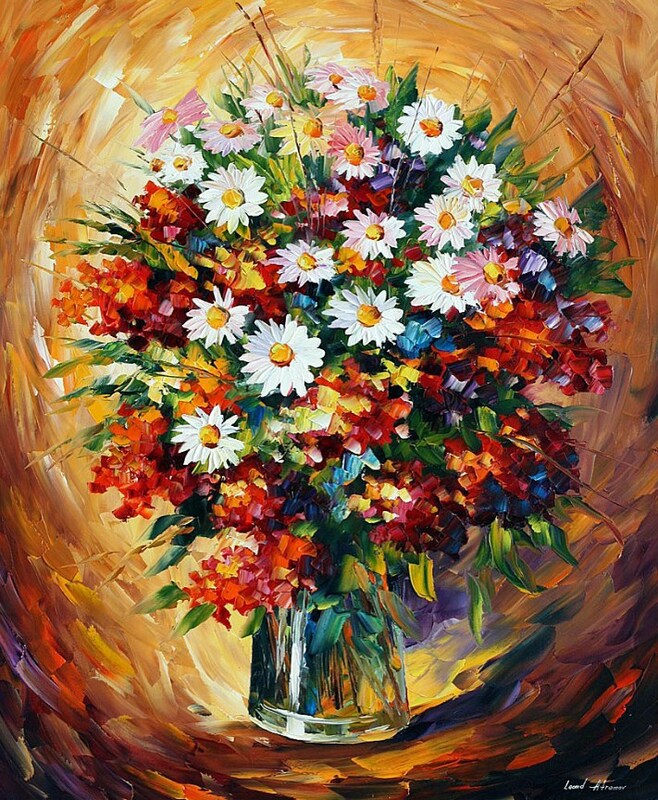 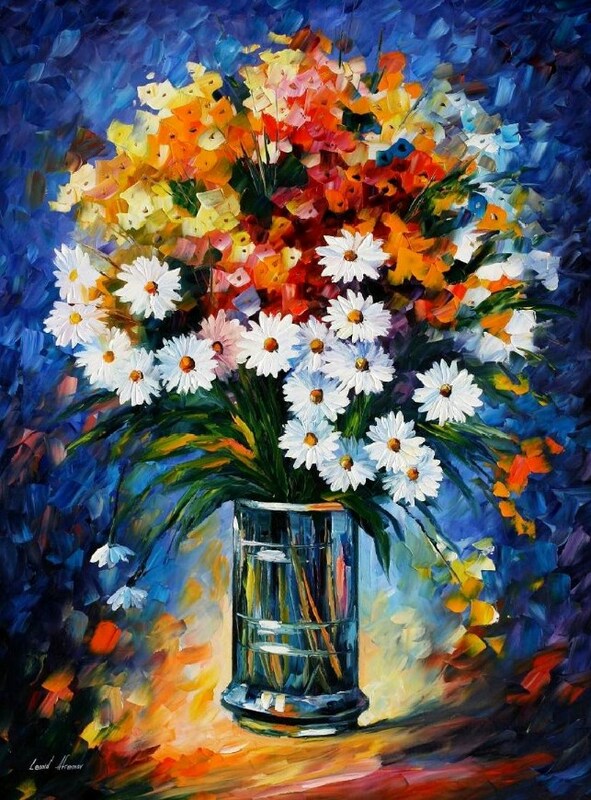 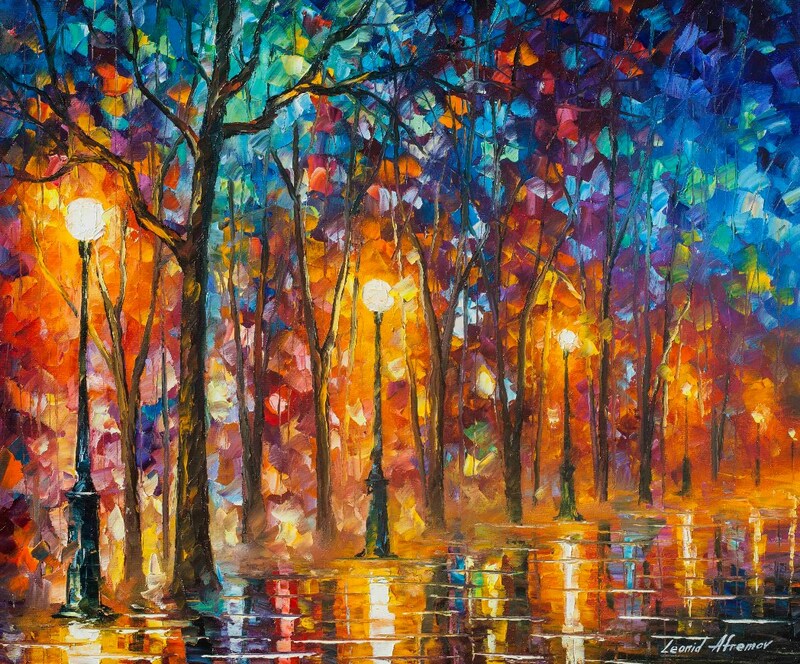 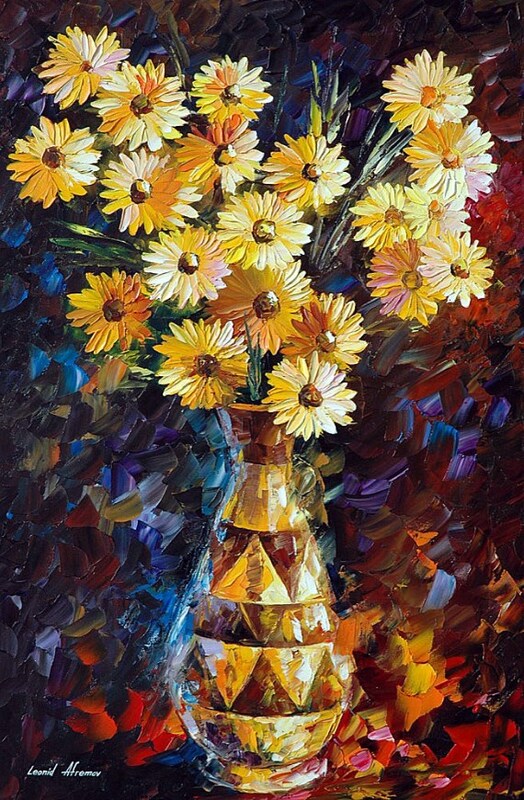 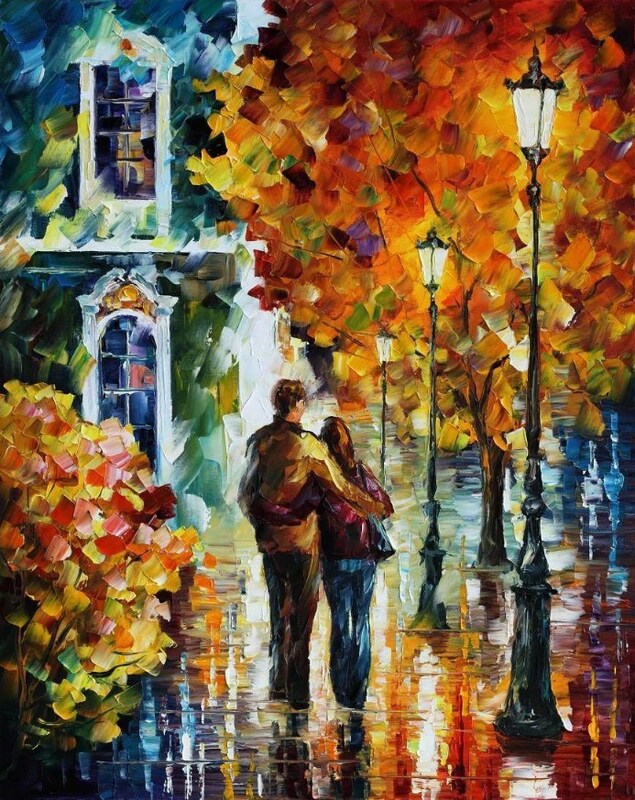 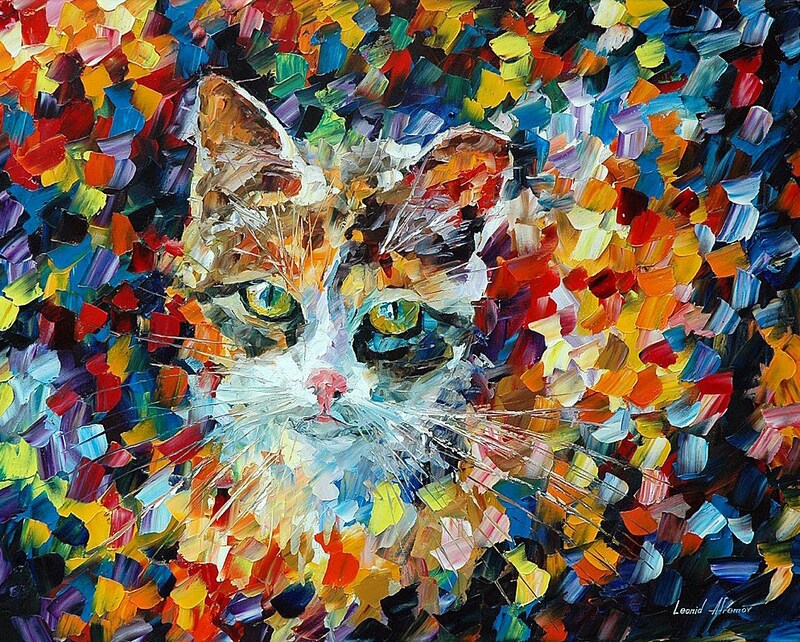 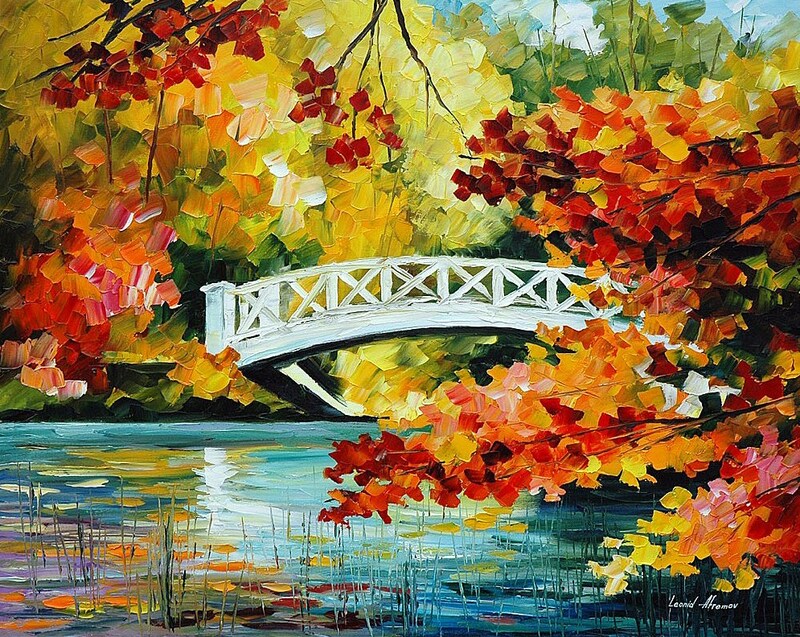 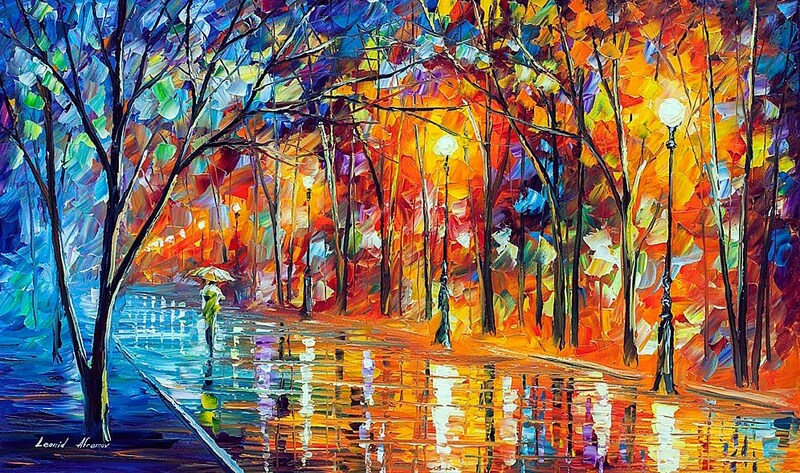 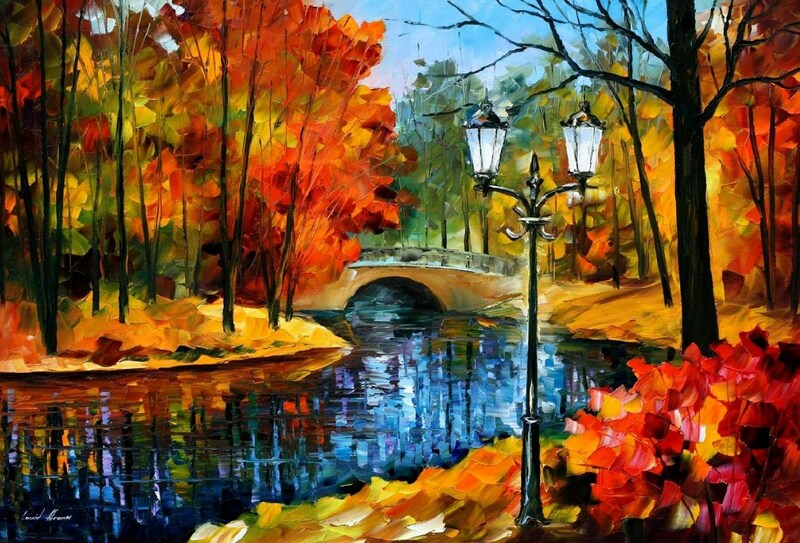 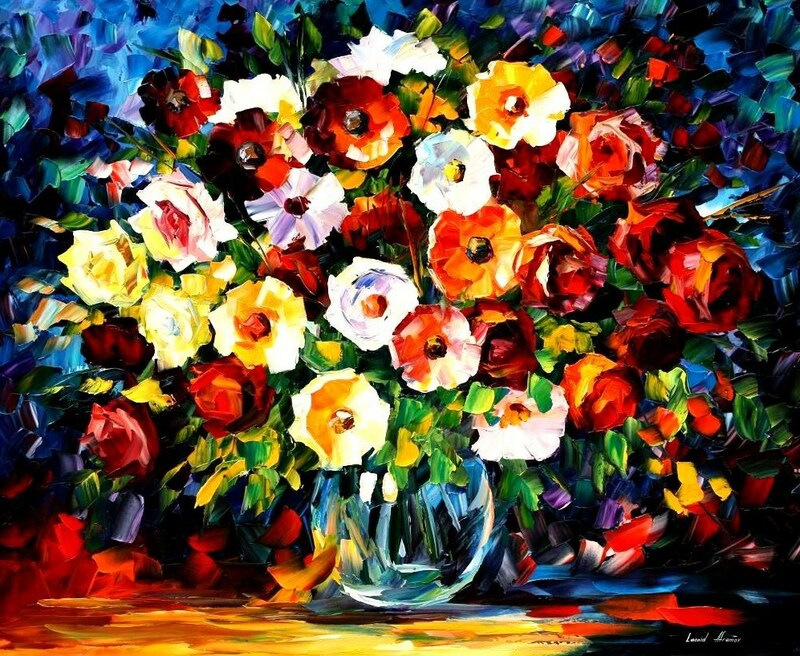 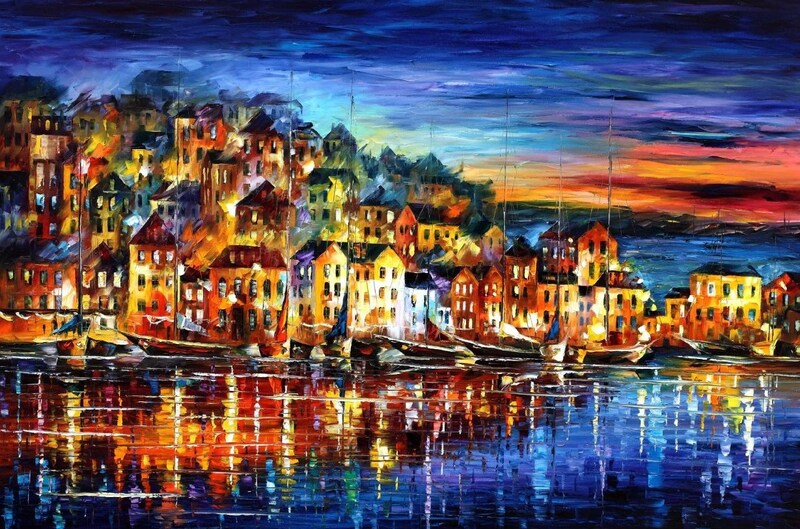 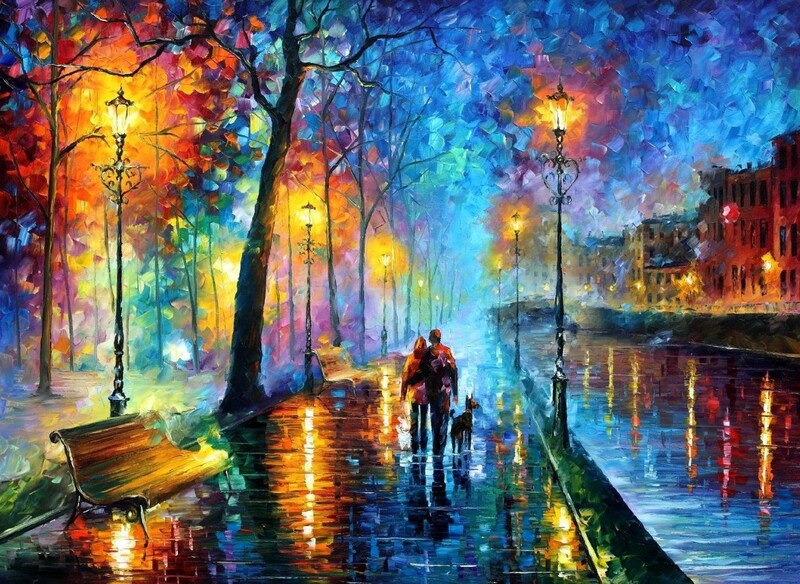 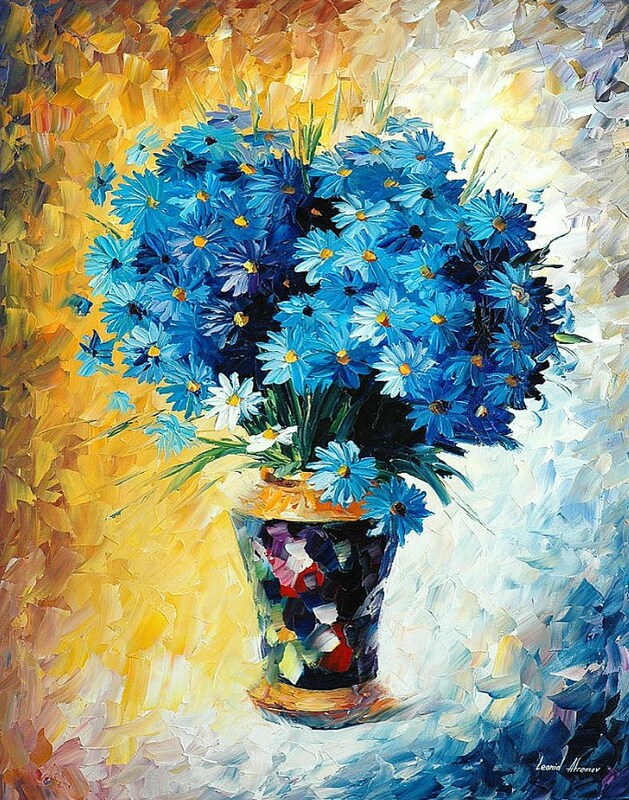 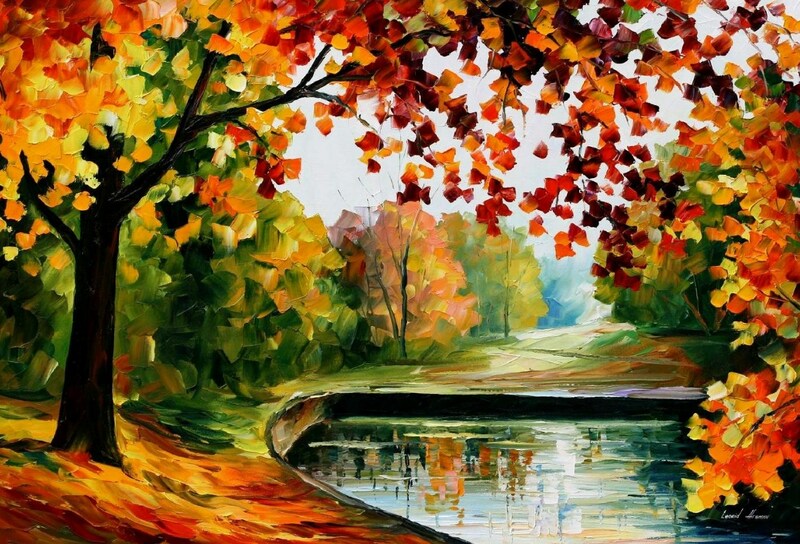 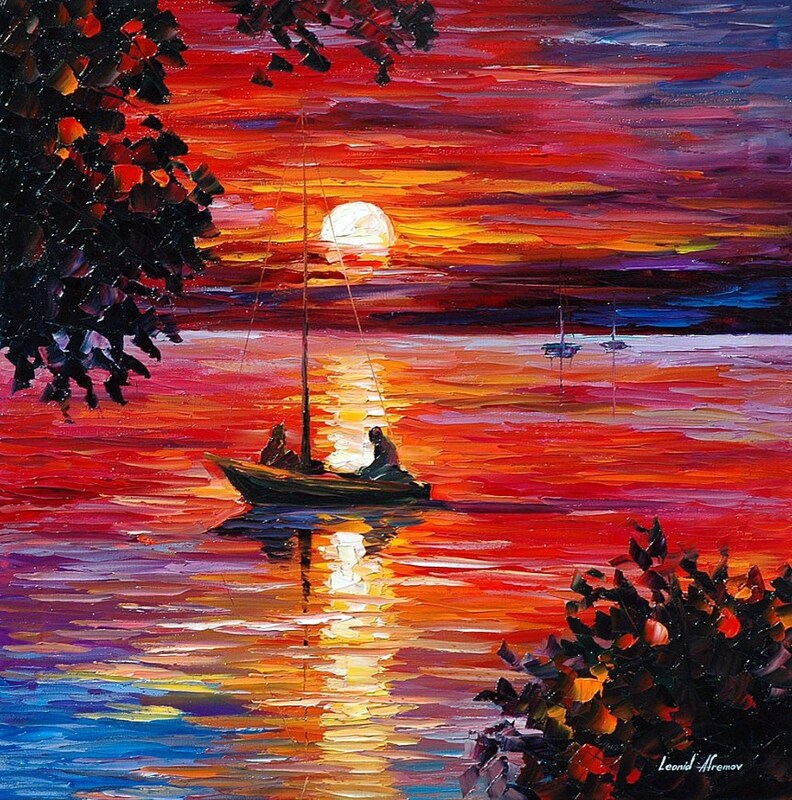 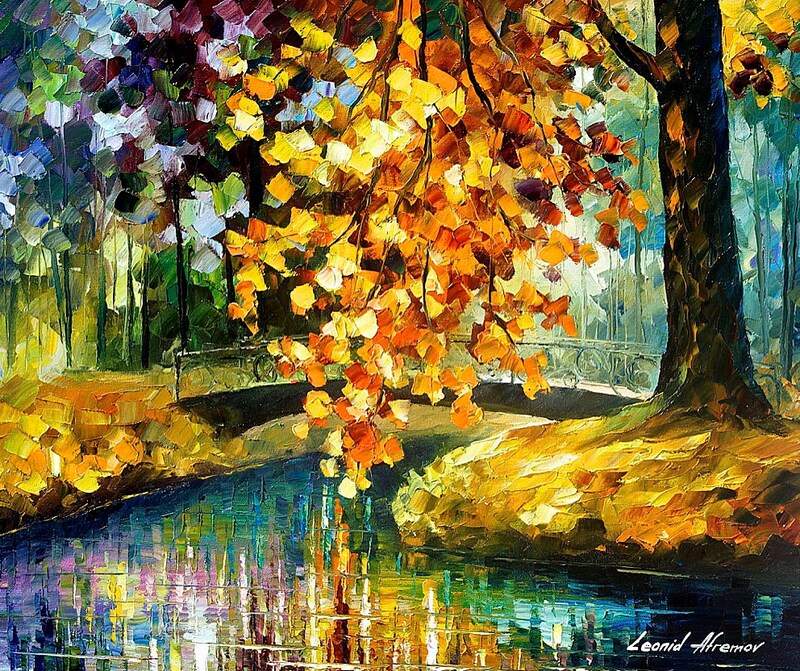 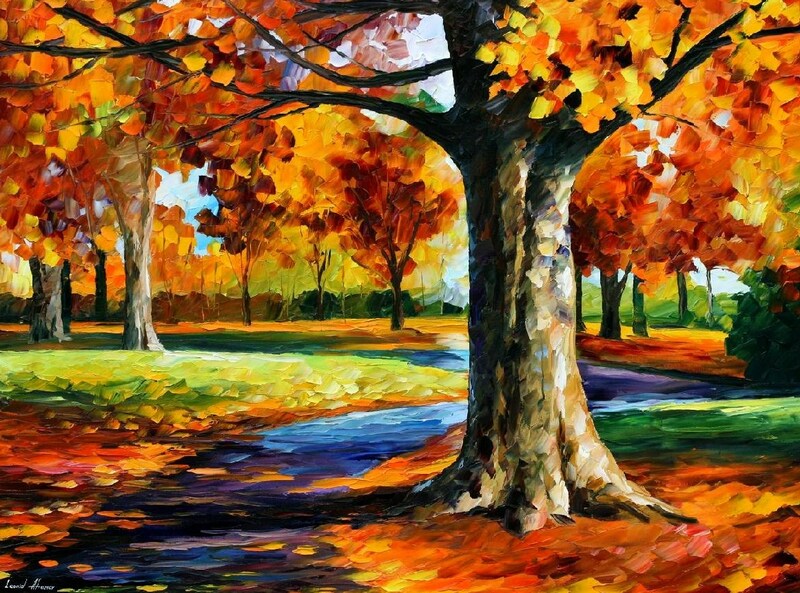 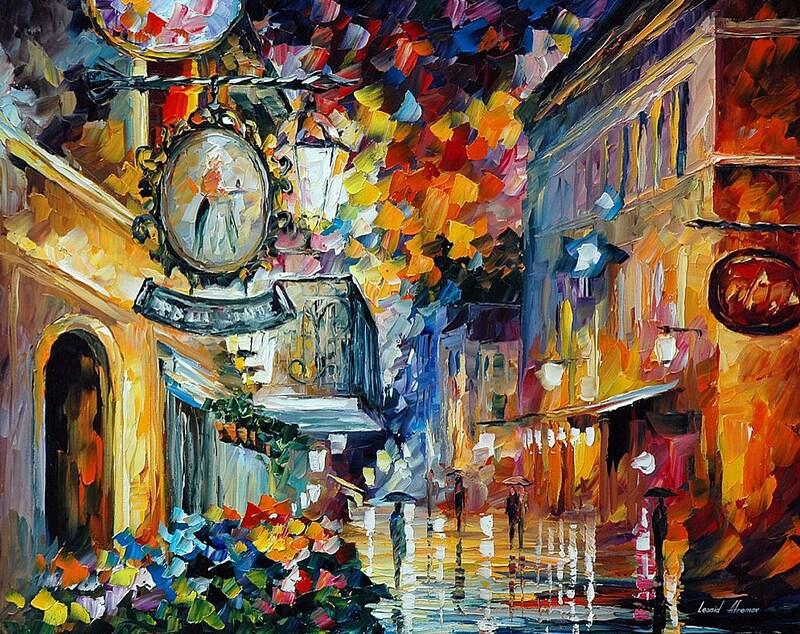 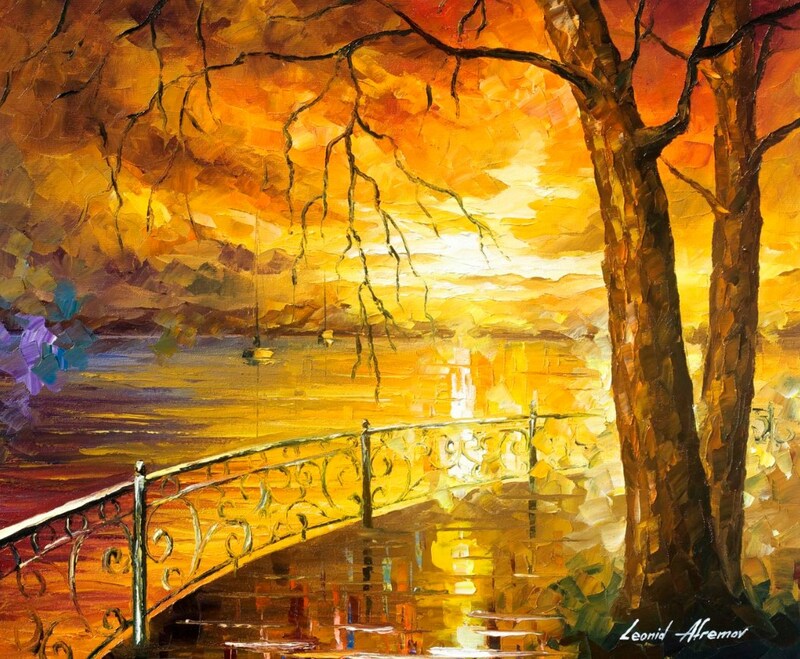 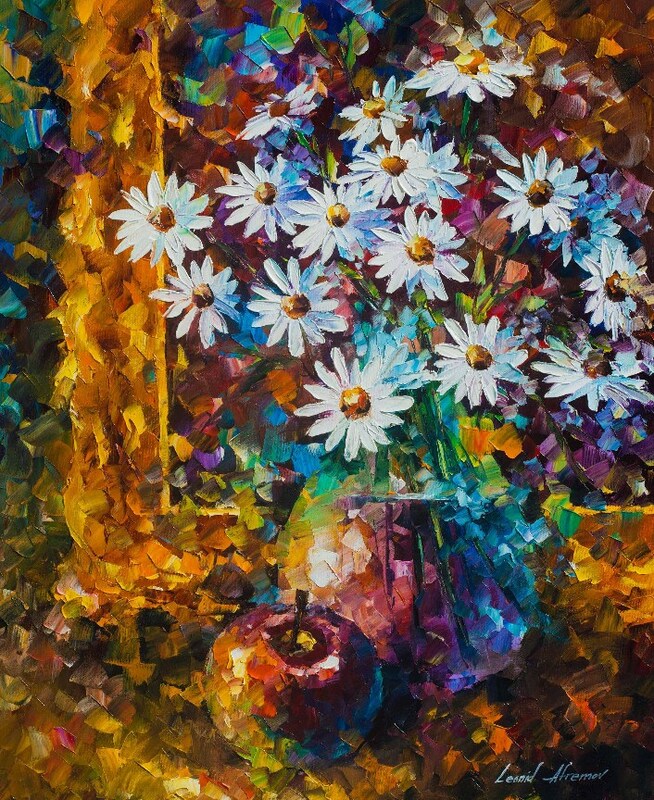 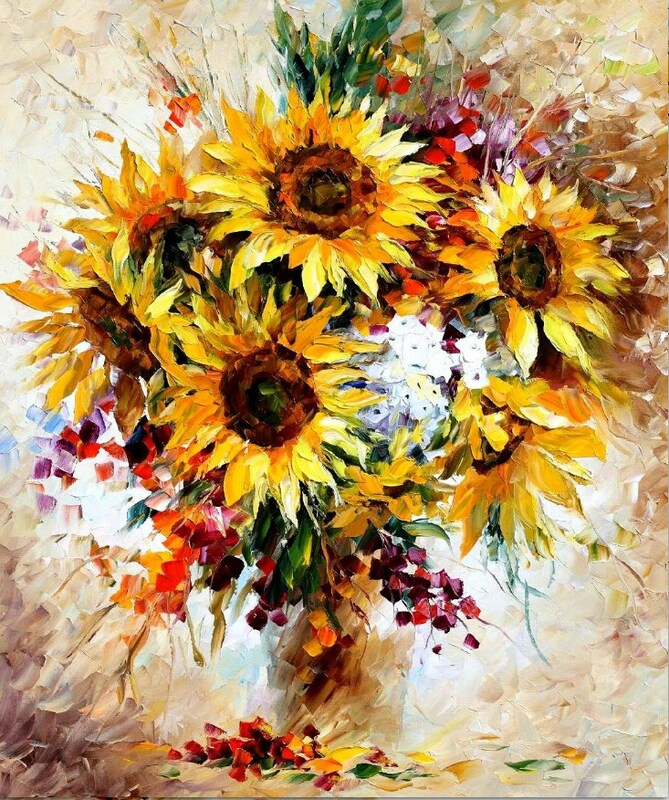 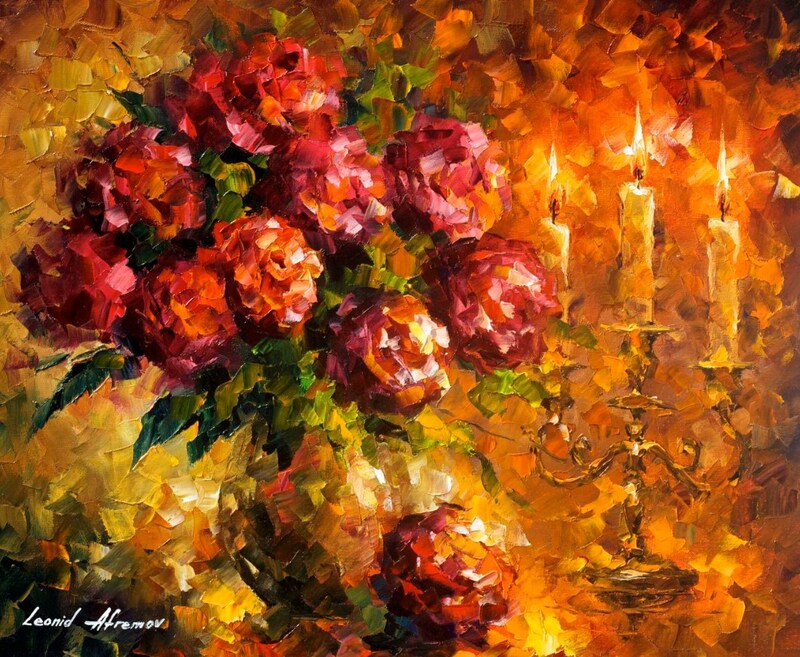 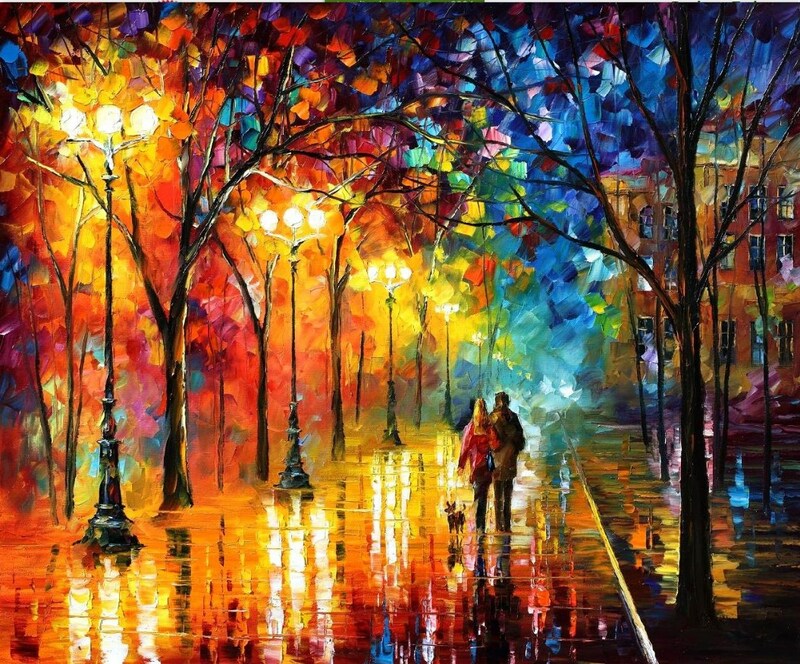 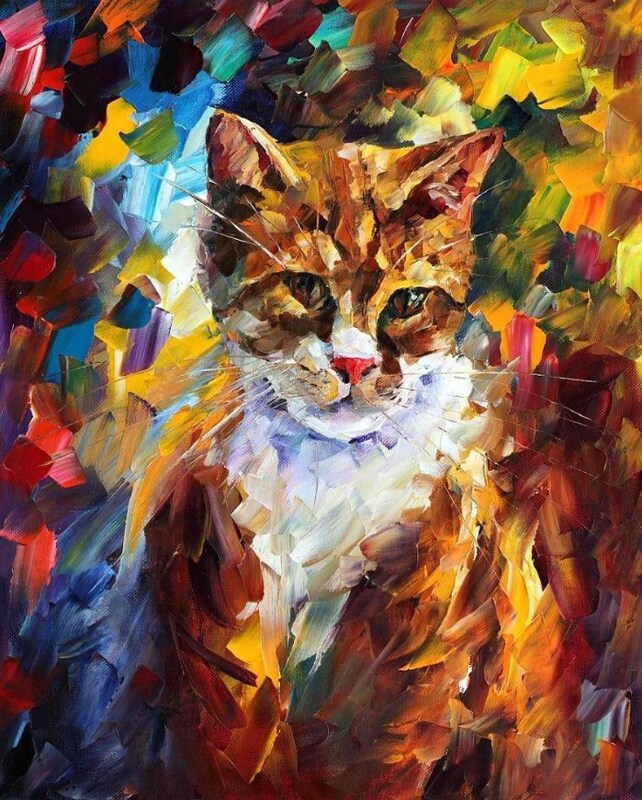 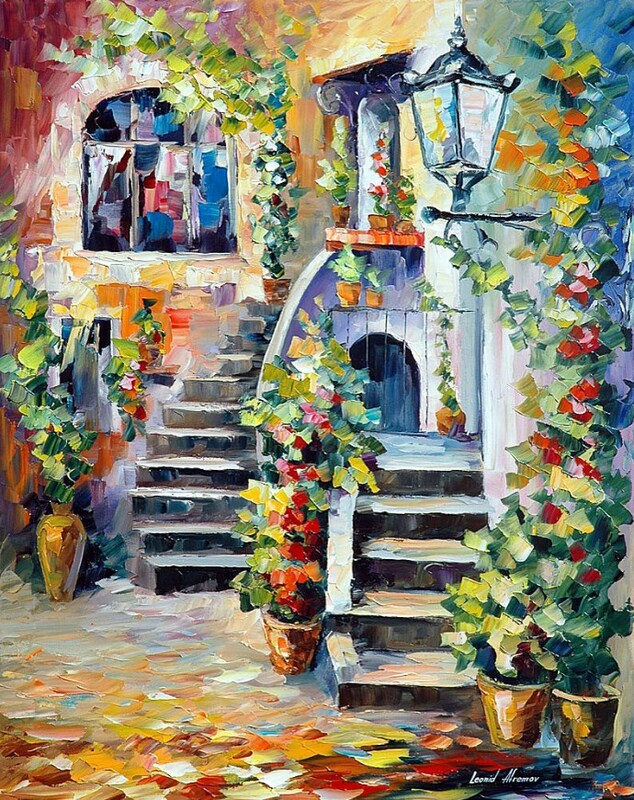 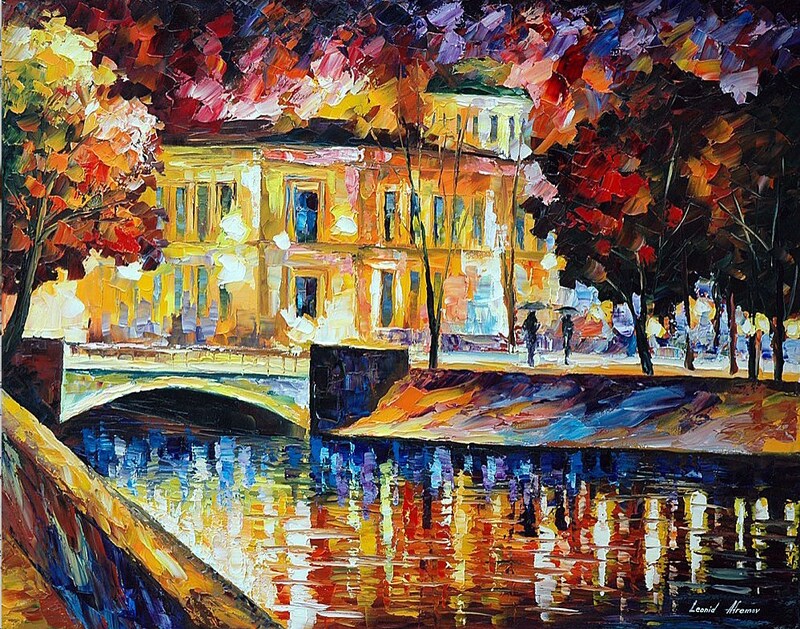 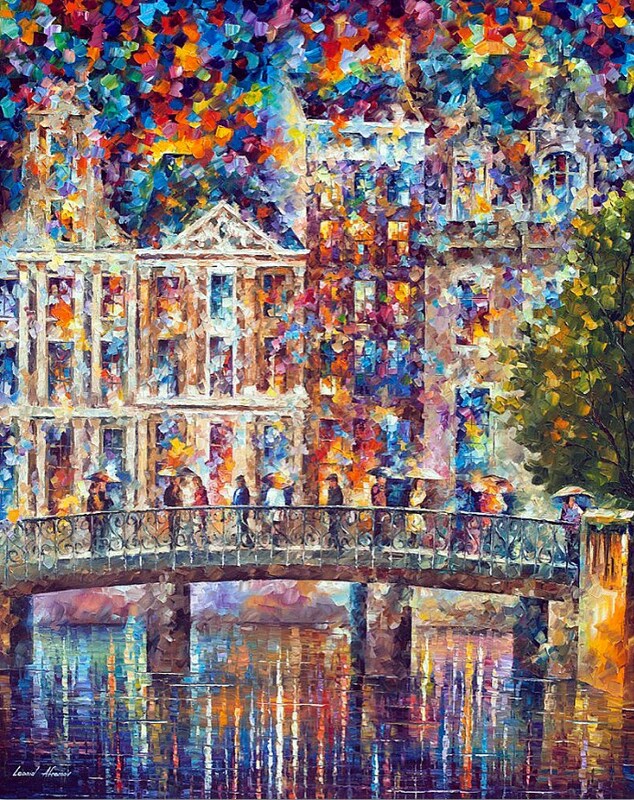 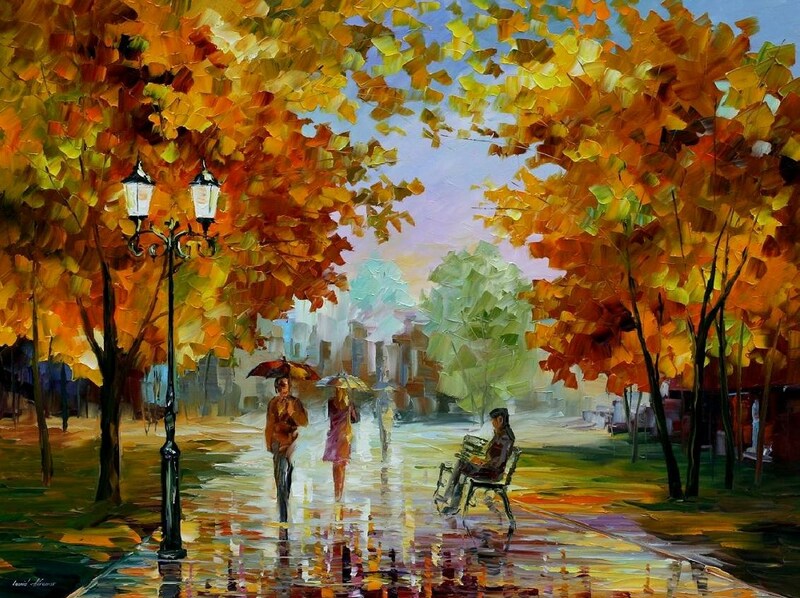 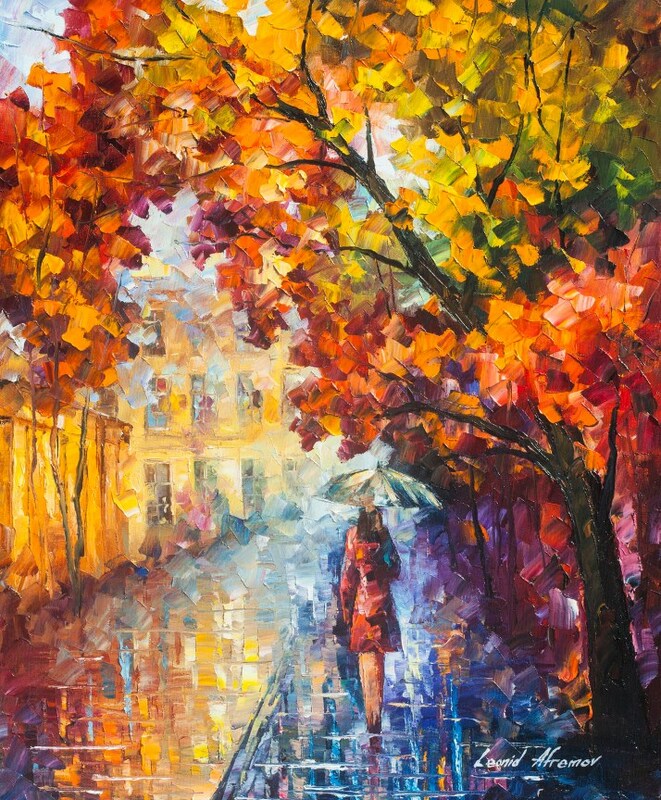 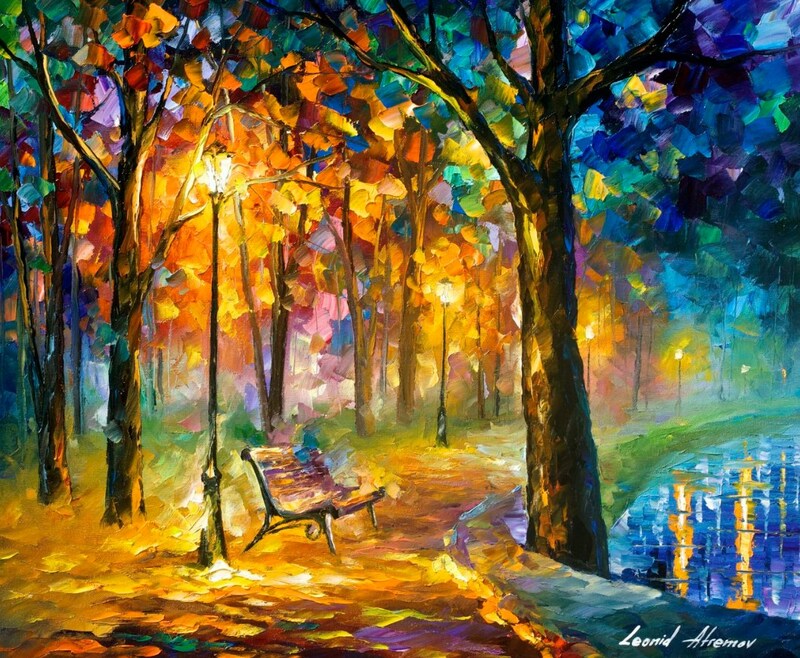 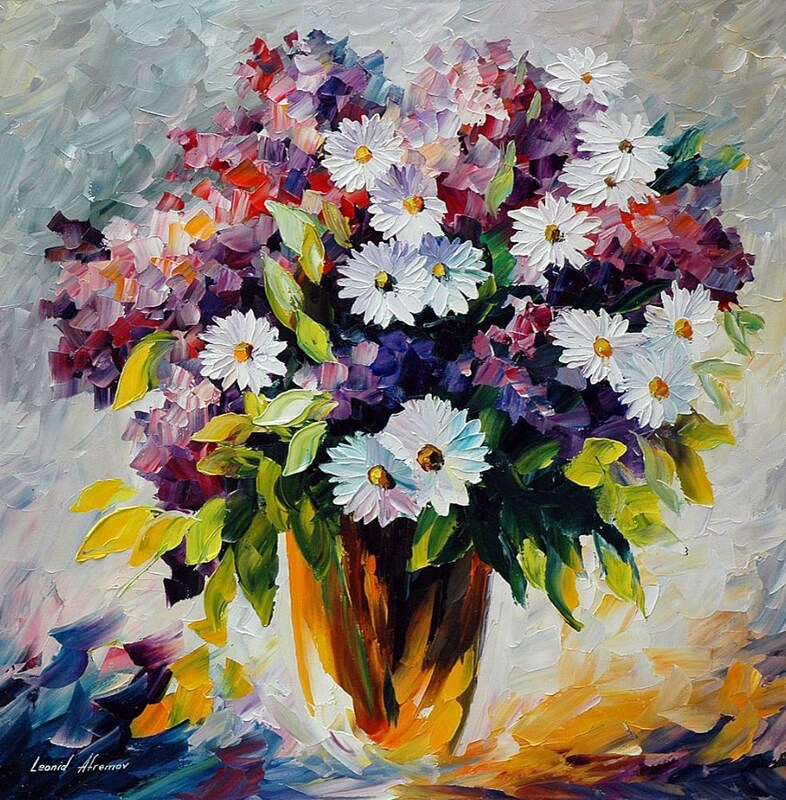 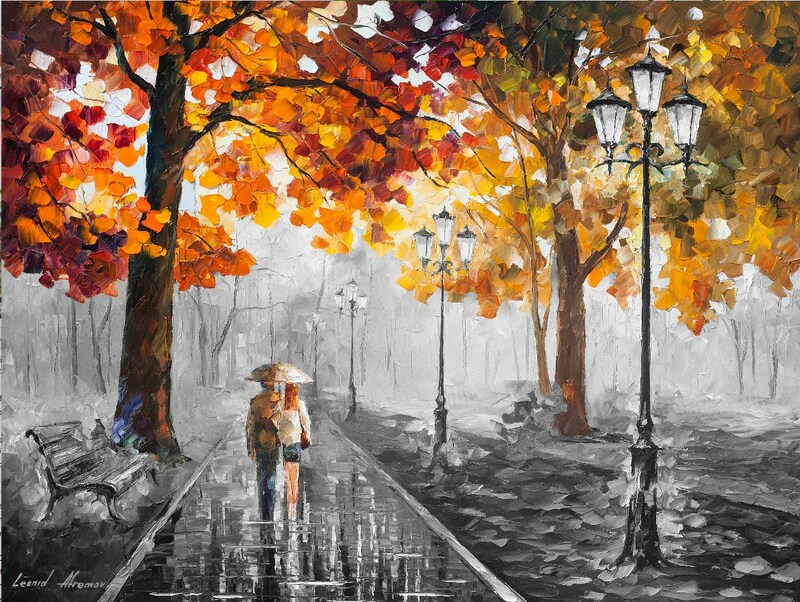 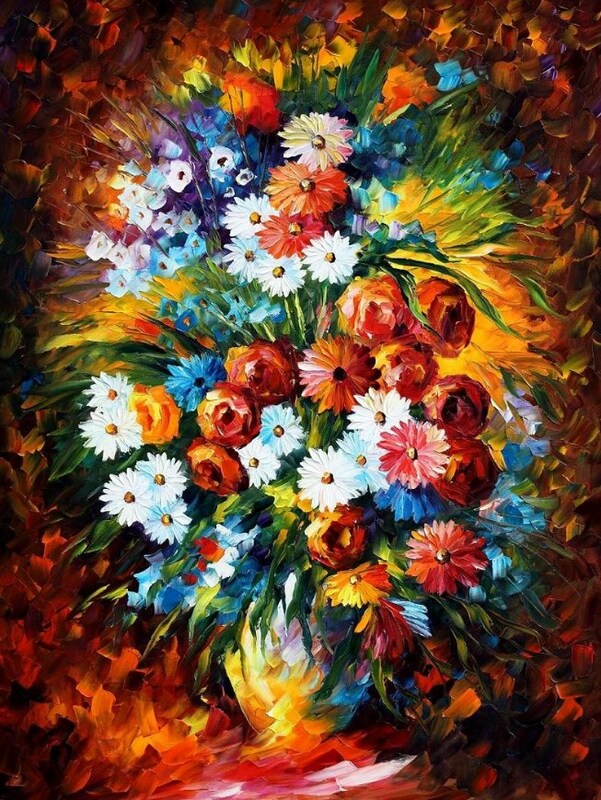 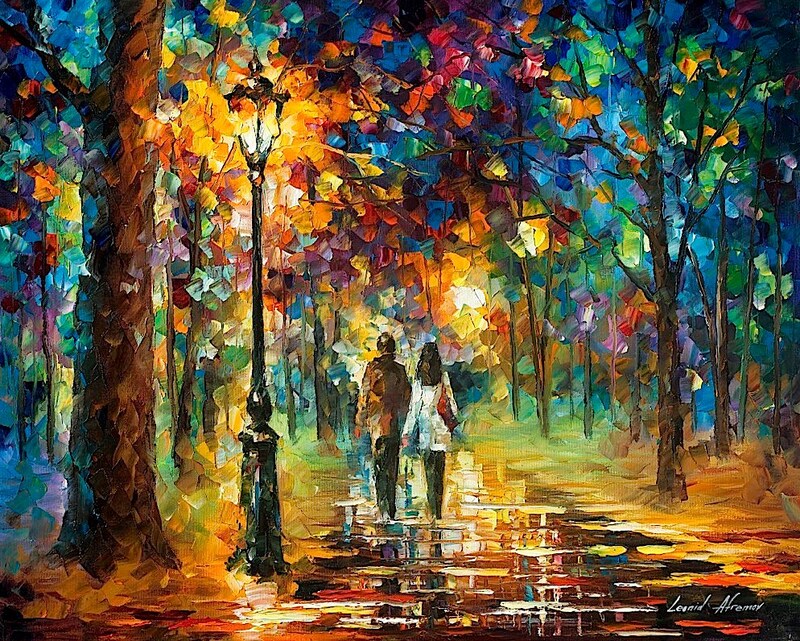 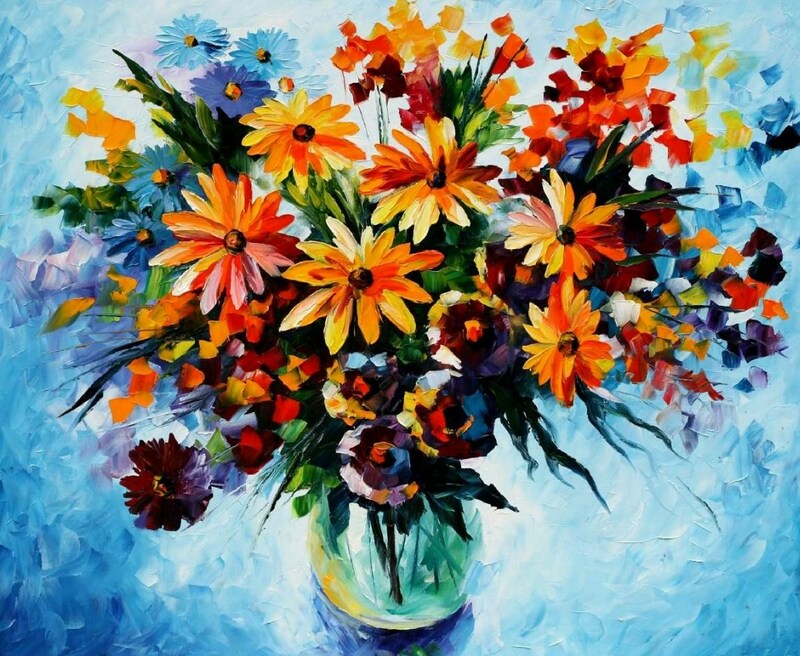 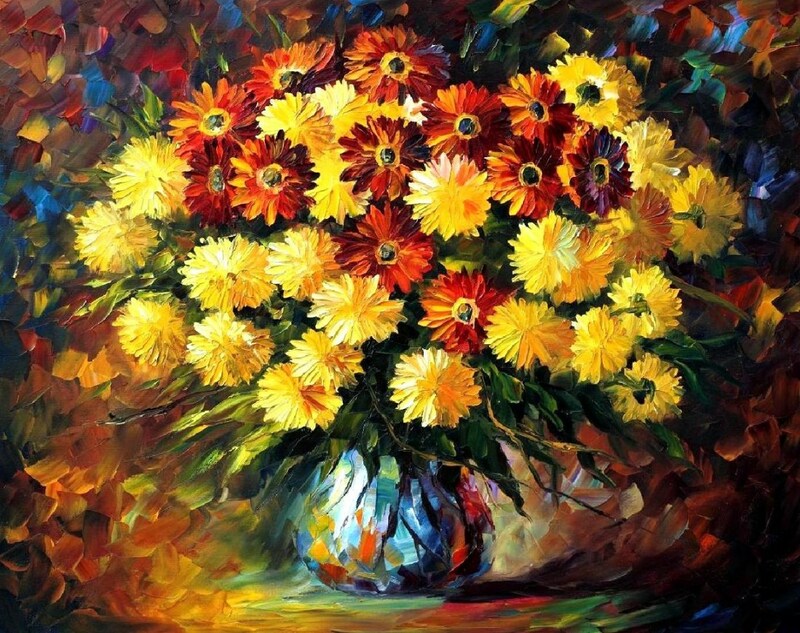 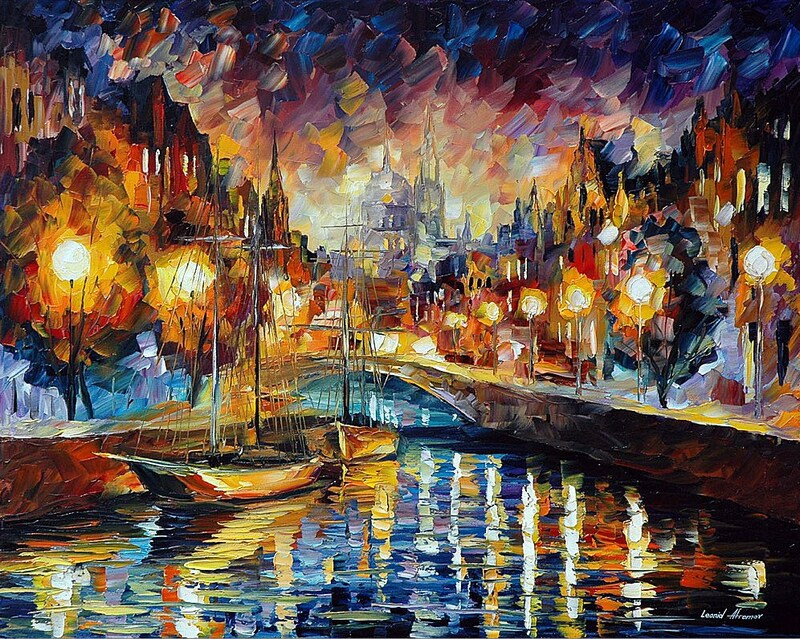 Afremov’s paintings were published not only in art magazines but also in various medical and health magazines as examples of stress reducing paintings. 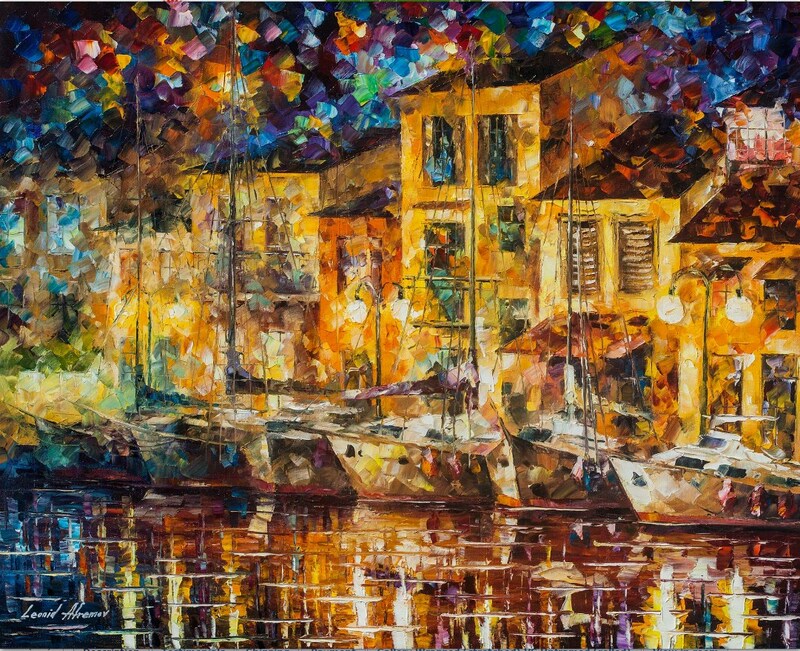 In 2005 following a successful year, the Afremov family moved to Boca Raton. 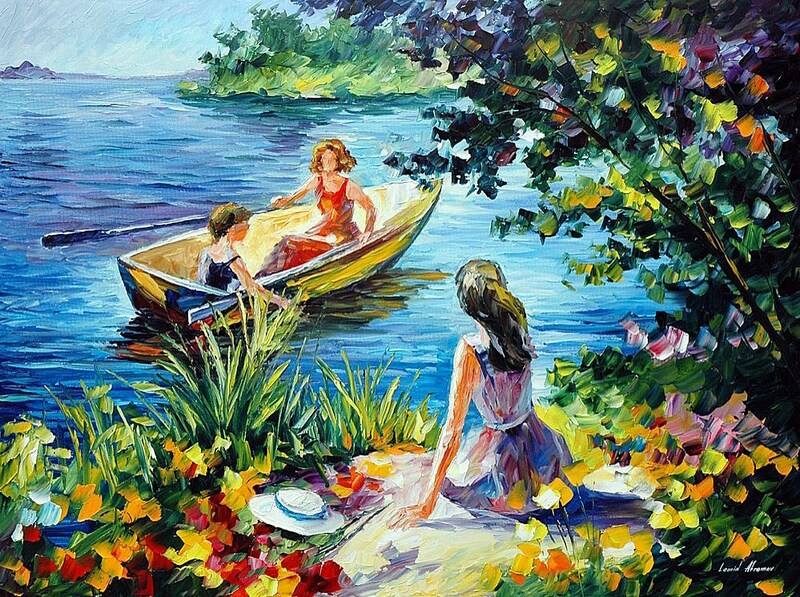 In the same year, they started taking their first family vacations in Cancun and Playa del Carmen.